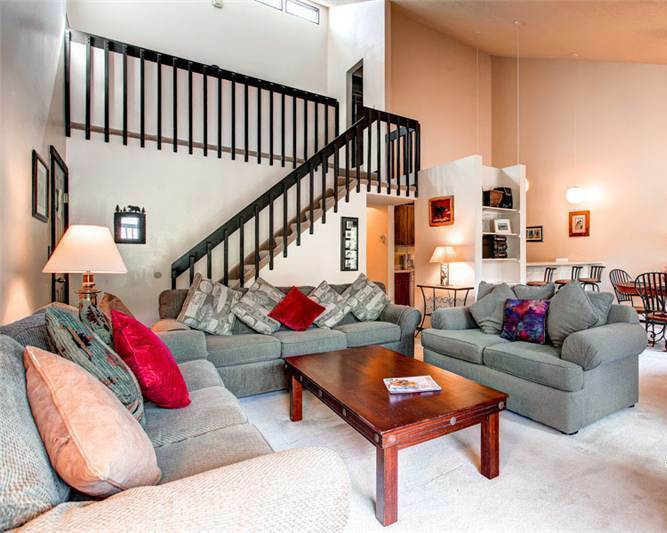 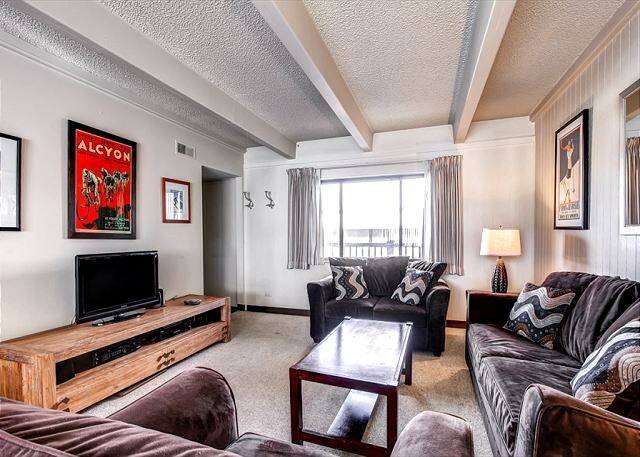 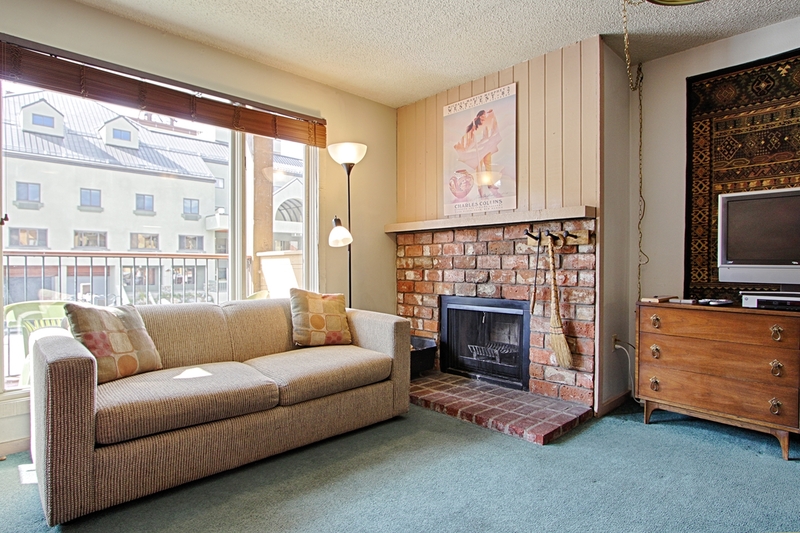 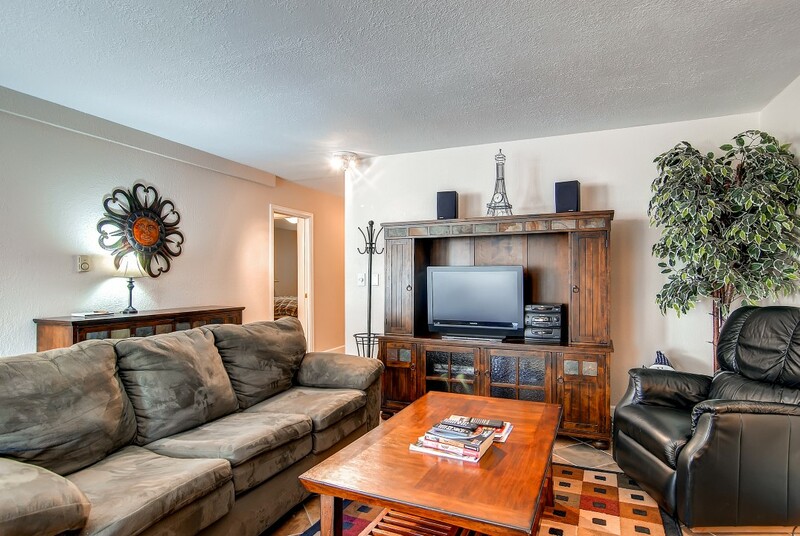 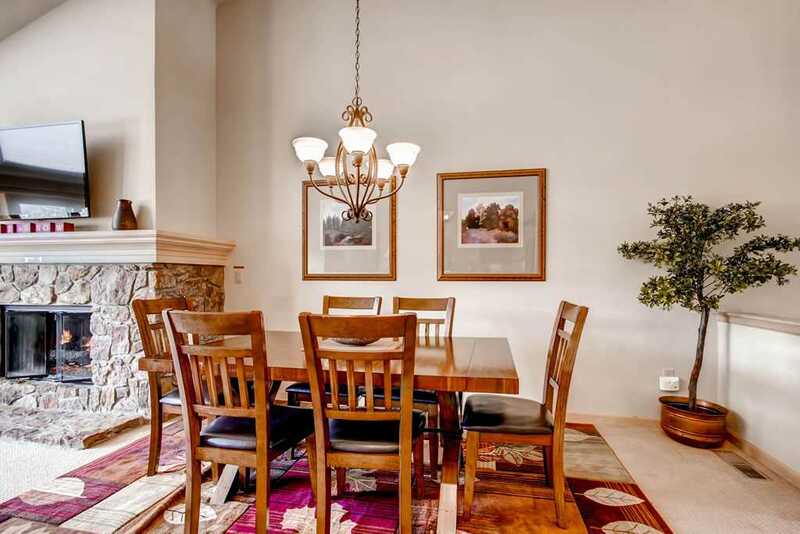 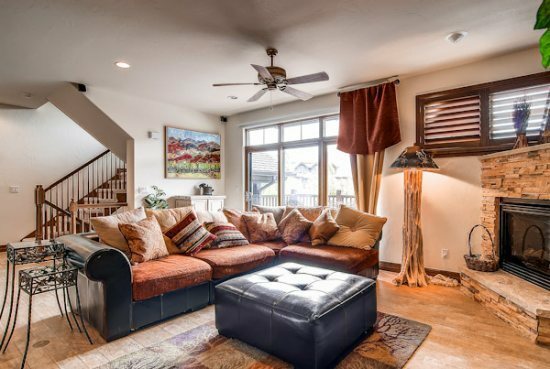 Set in Frisco’s quiet Creekside neighborhood, this multilevel condo is perfect for families and groups looking for space and a convenient location — four blocks from Main Street’s restaurants, shops and Summit Stage bus stops — all at a great price. 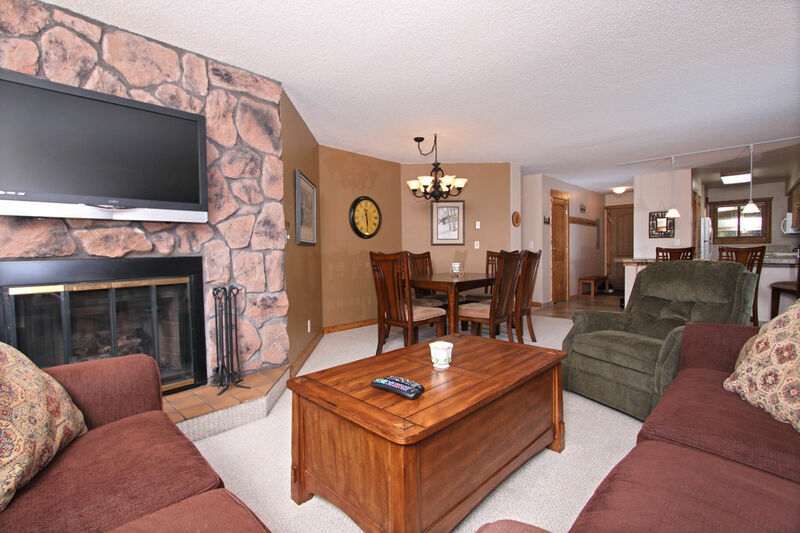 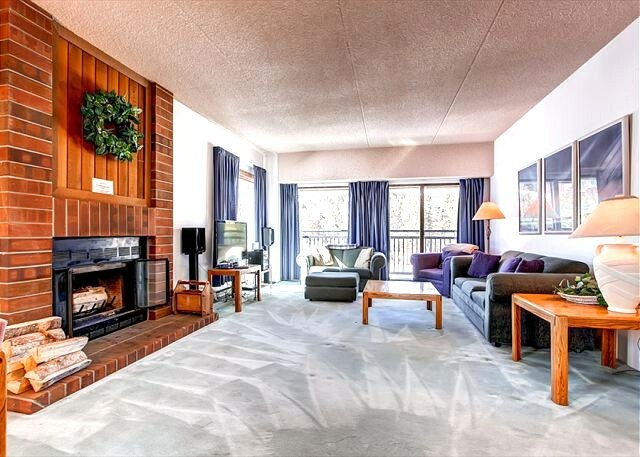 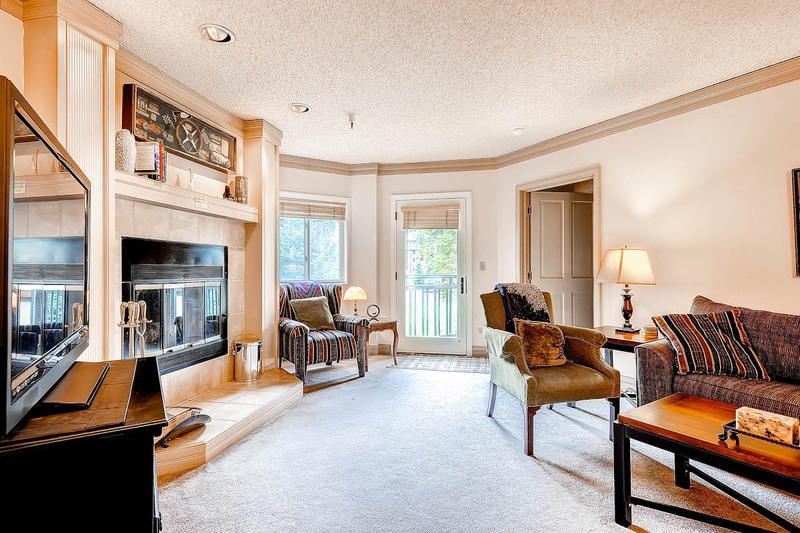 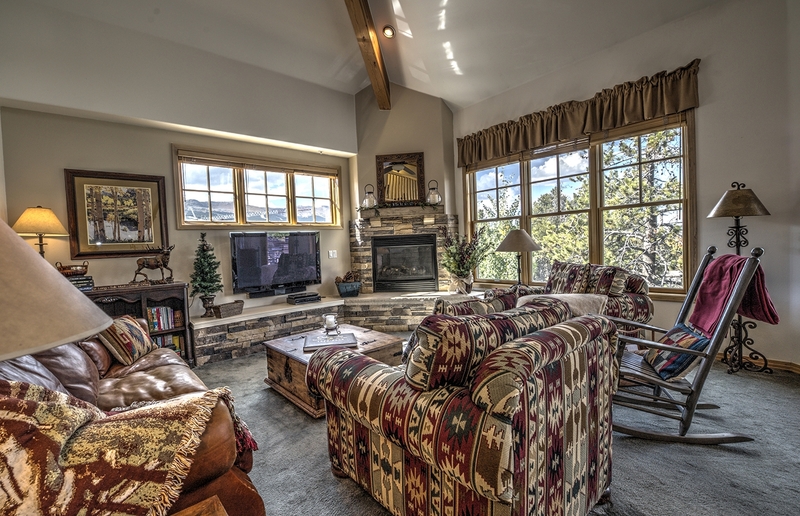 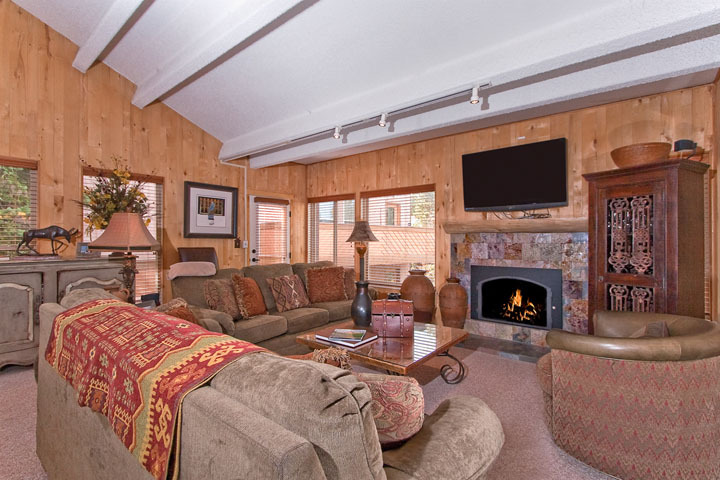 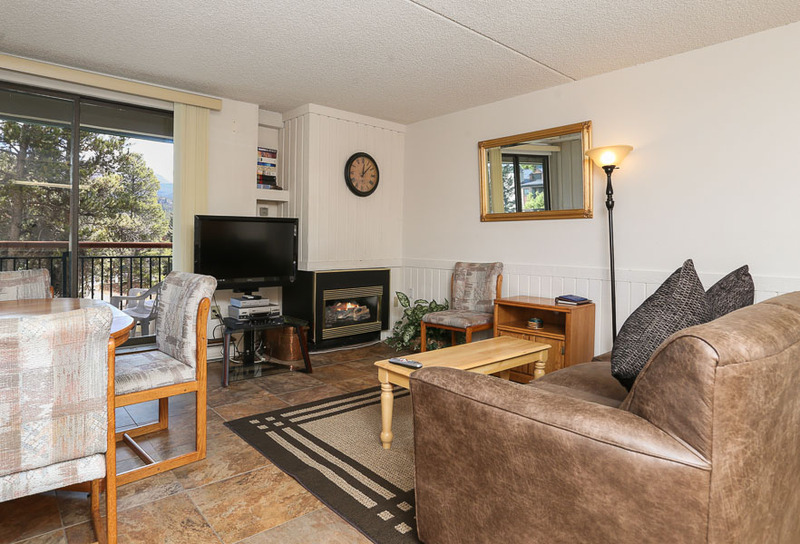 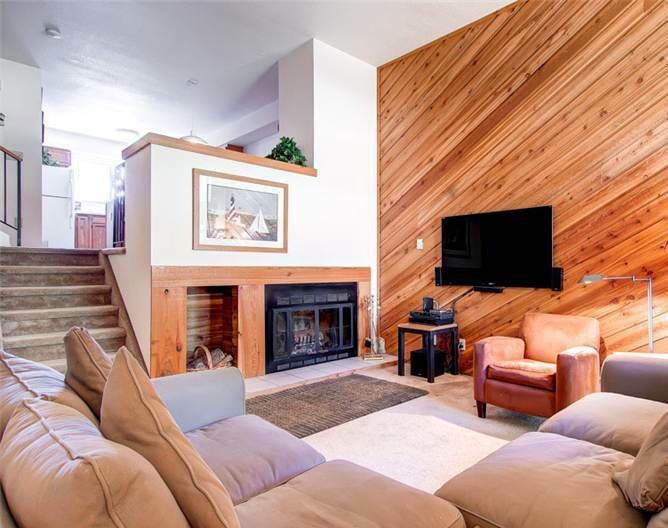 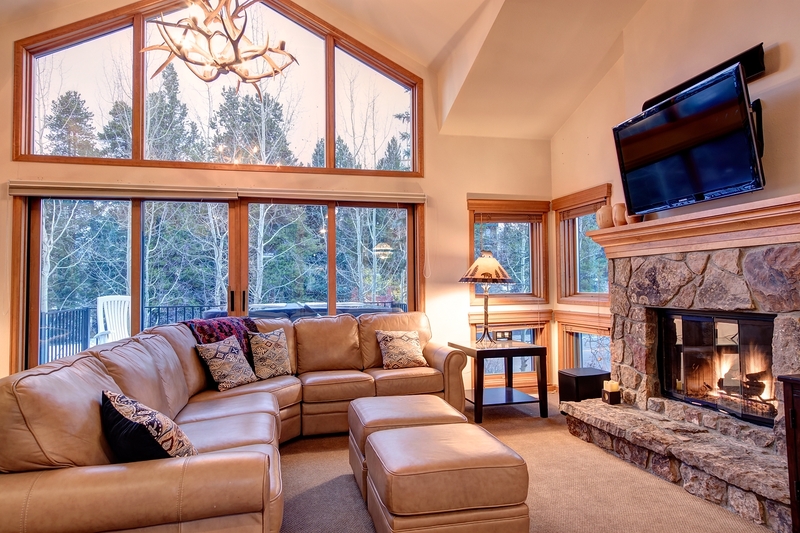 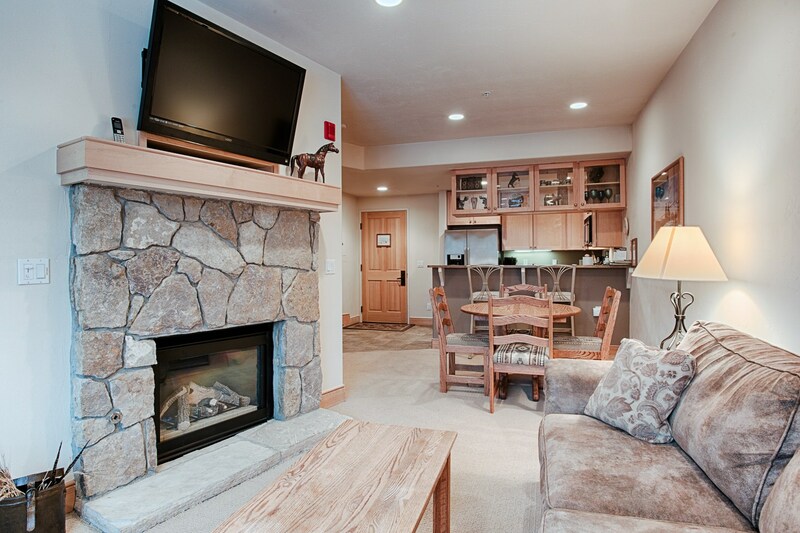 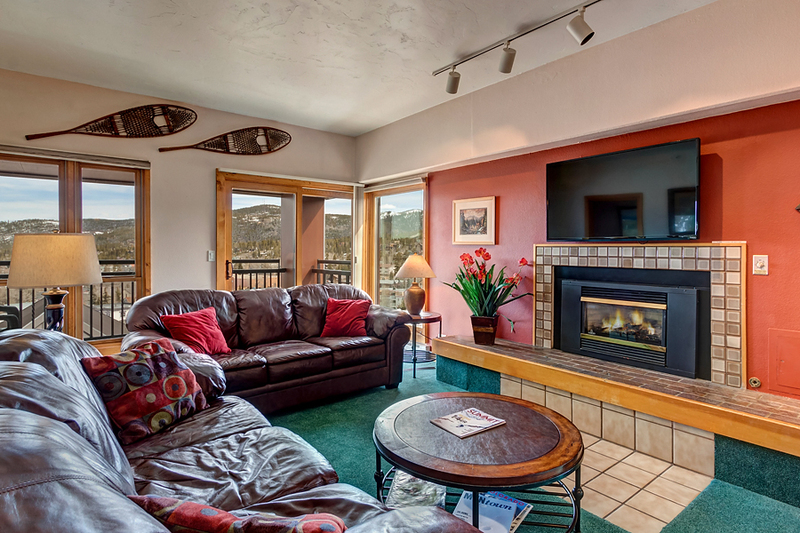 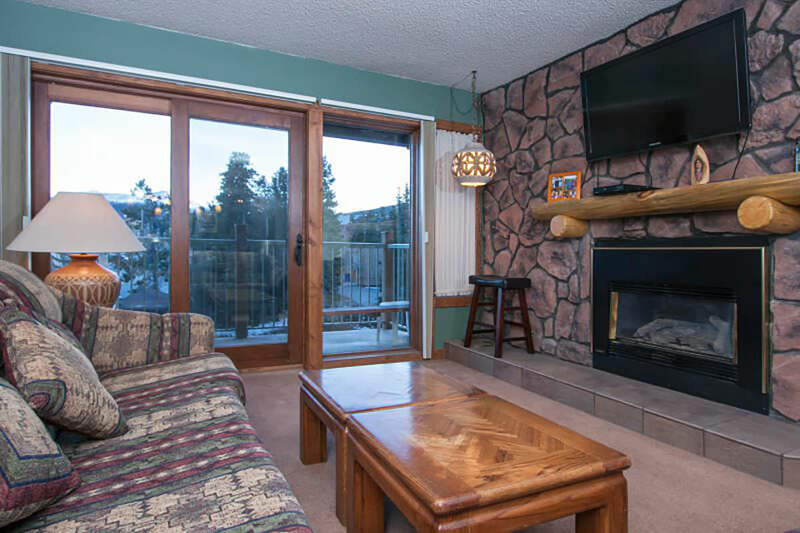 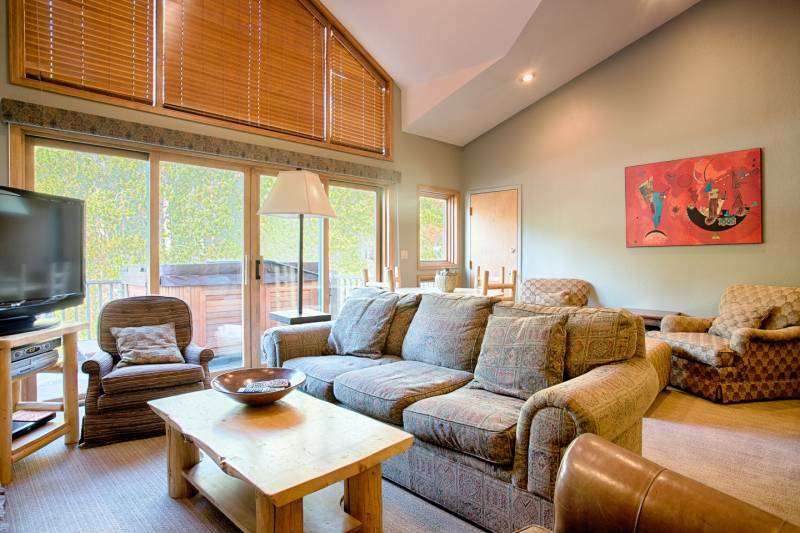 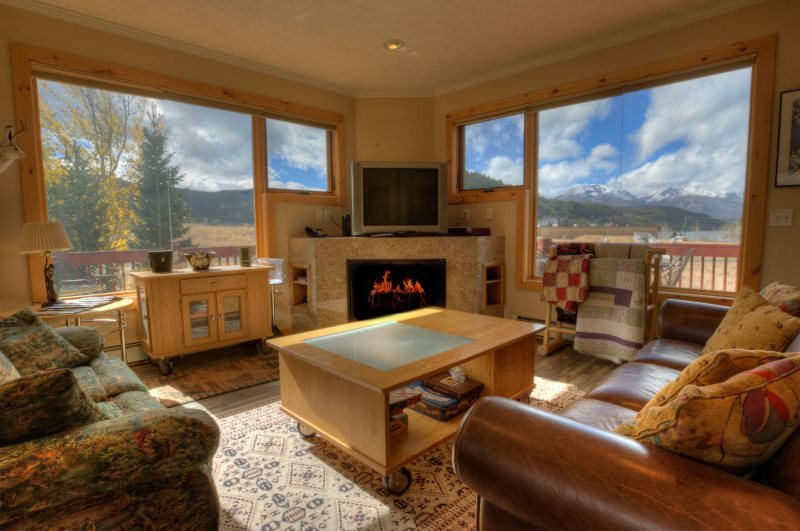 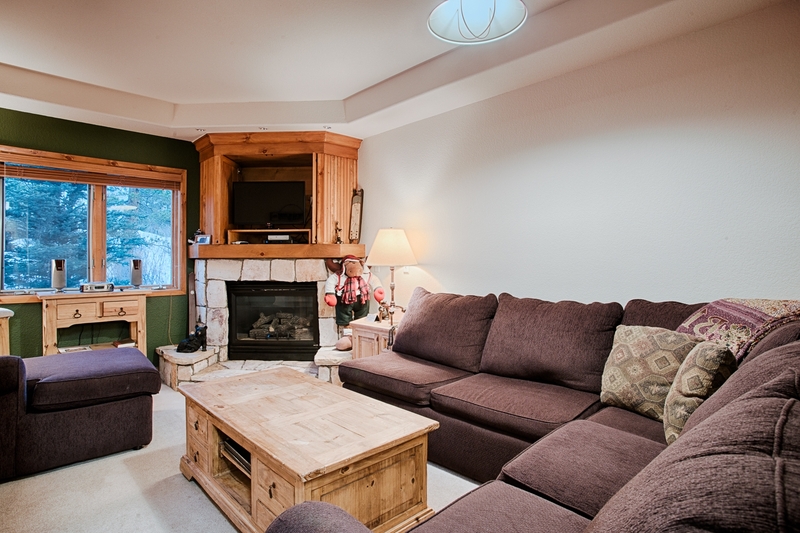 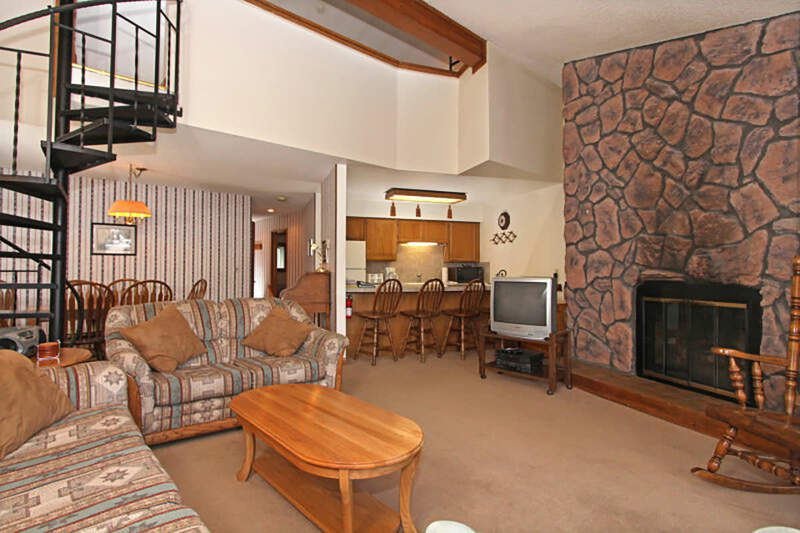 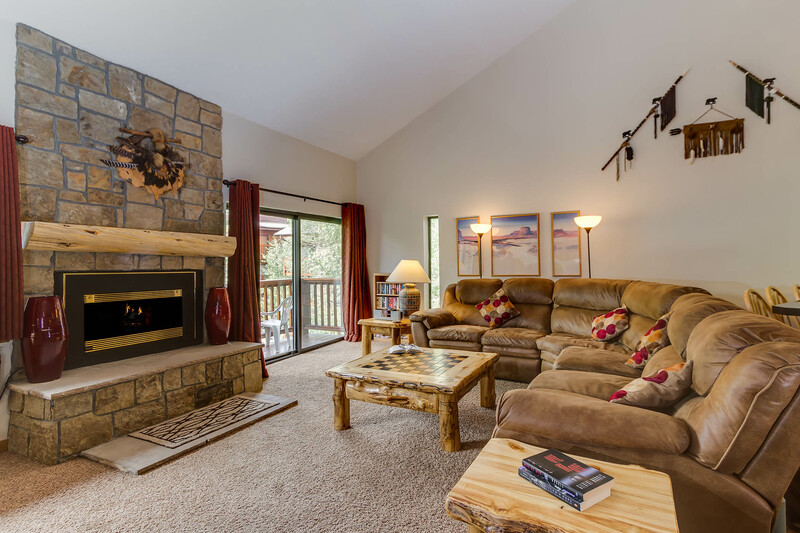 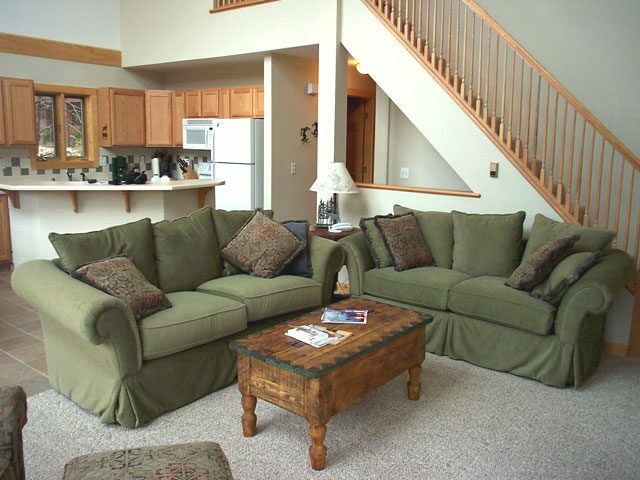 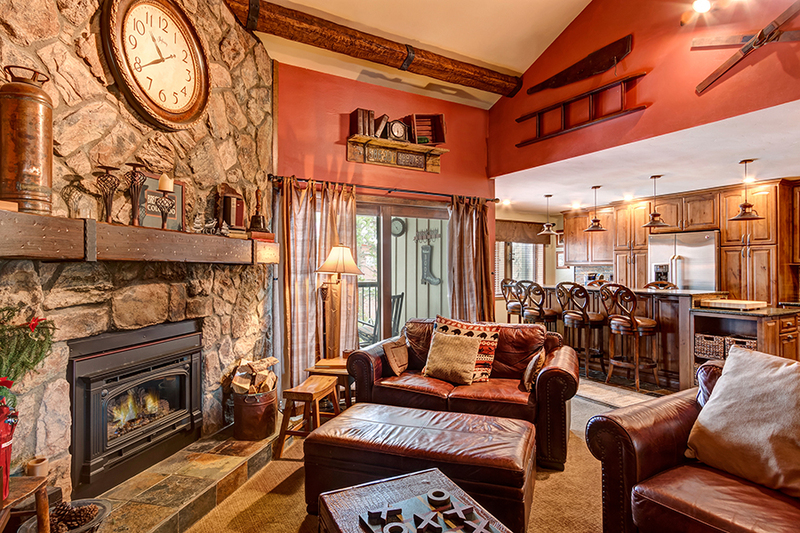 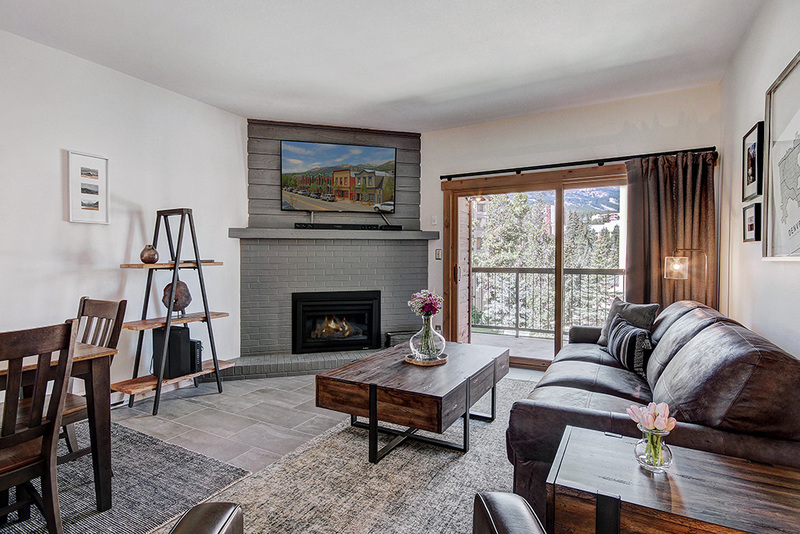 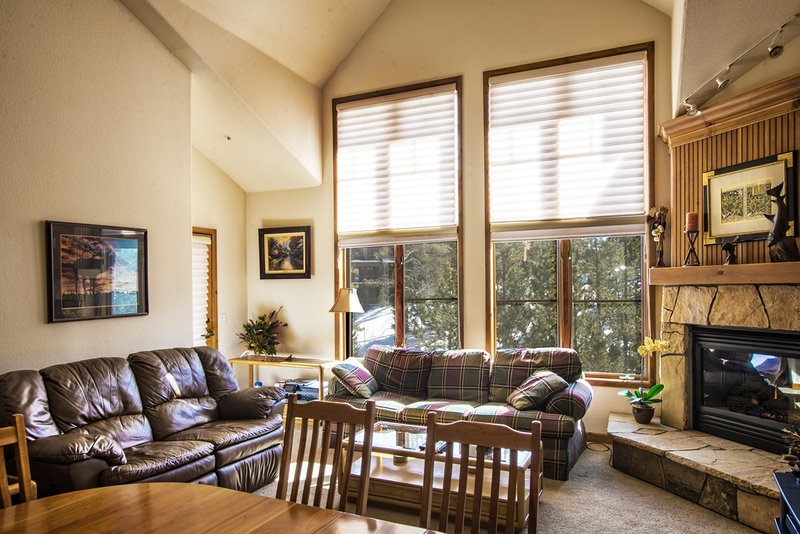 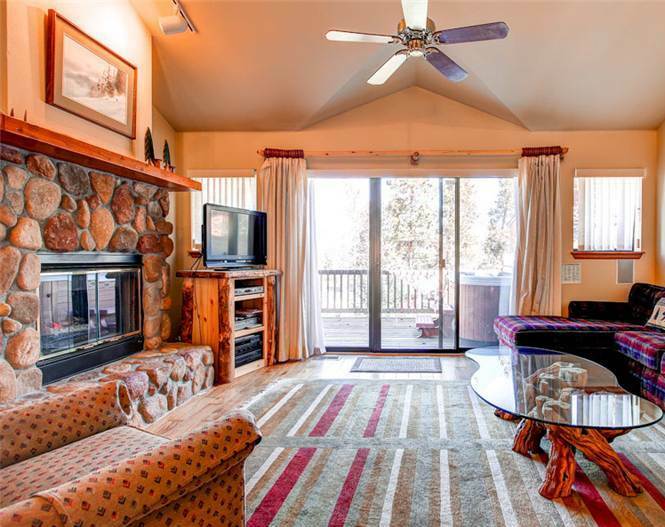 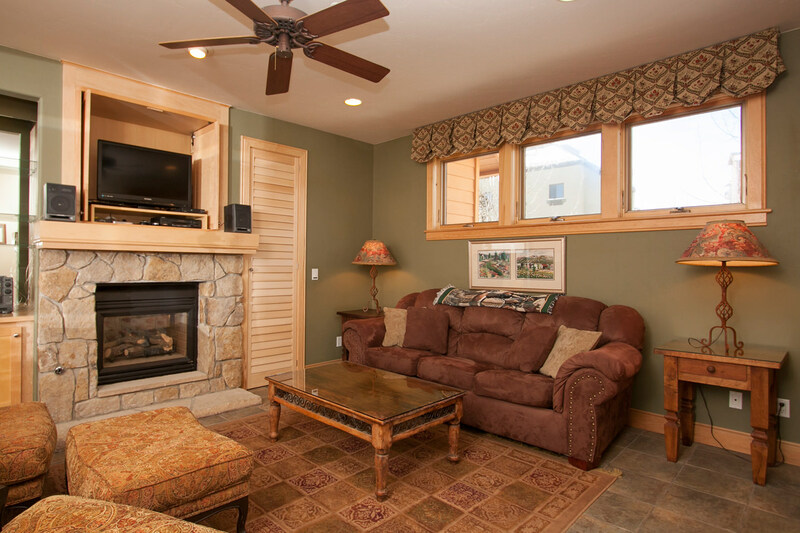 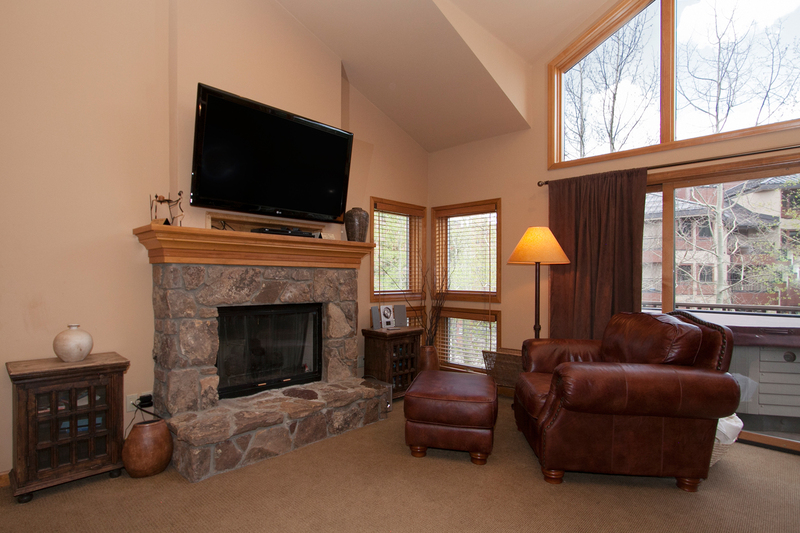 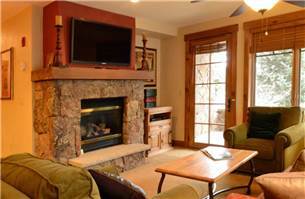 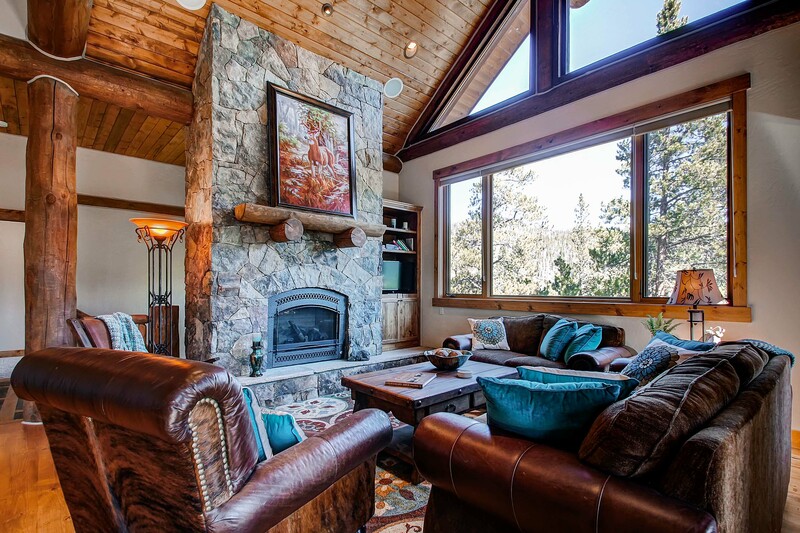 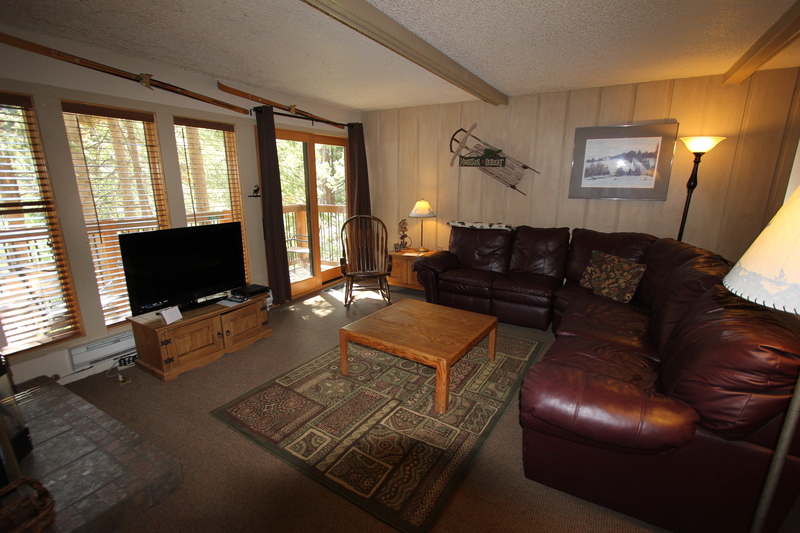 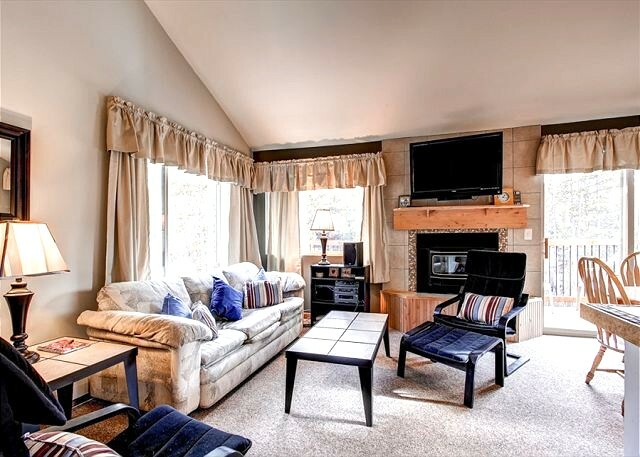 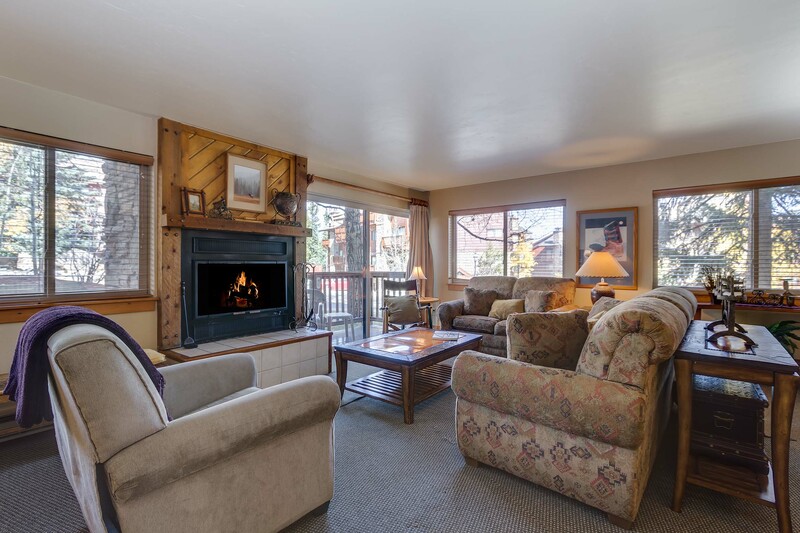 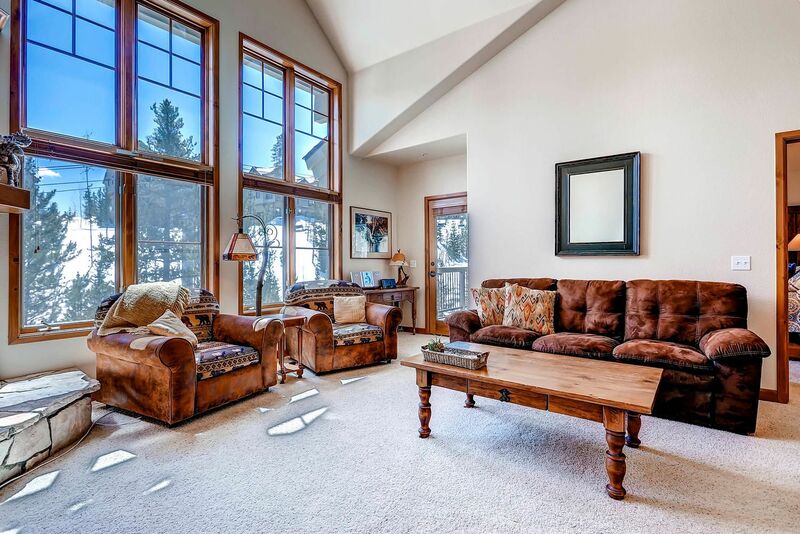 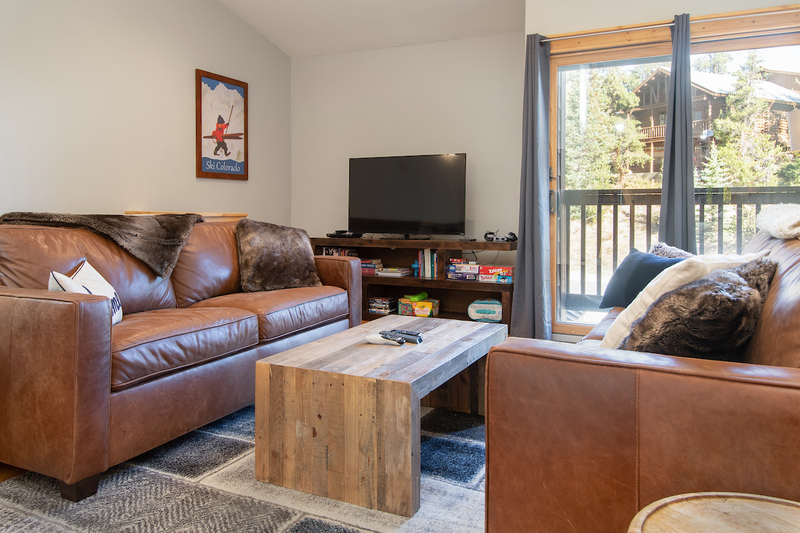 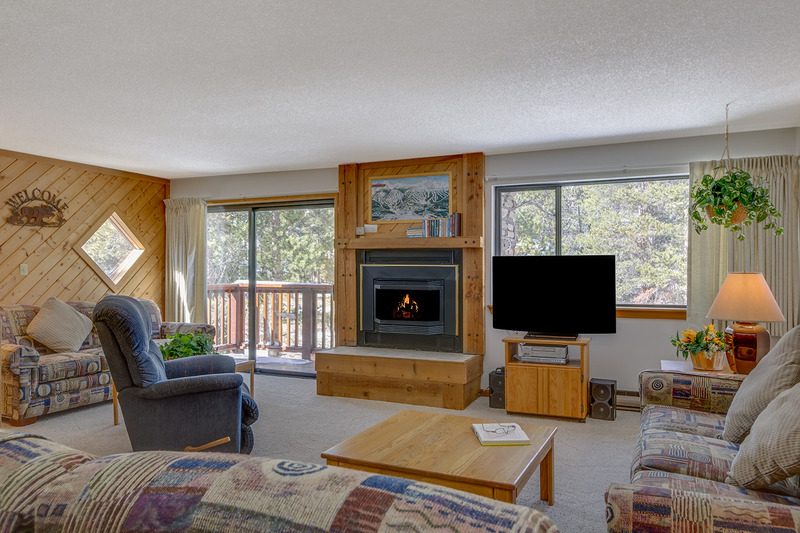 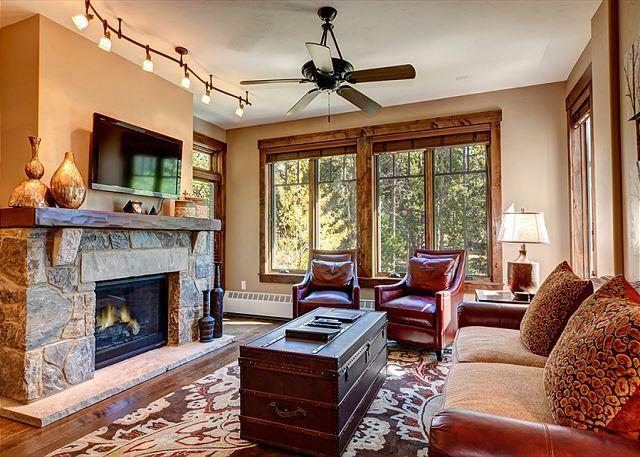 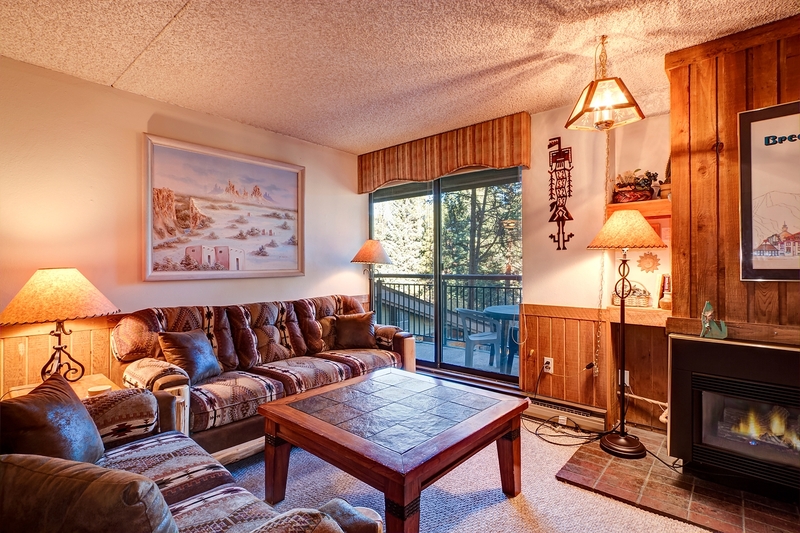 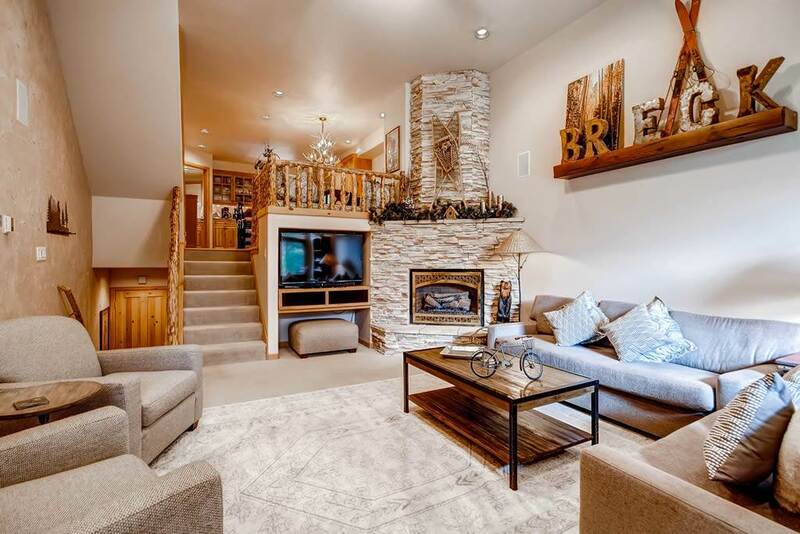 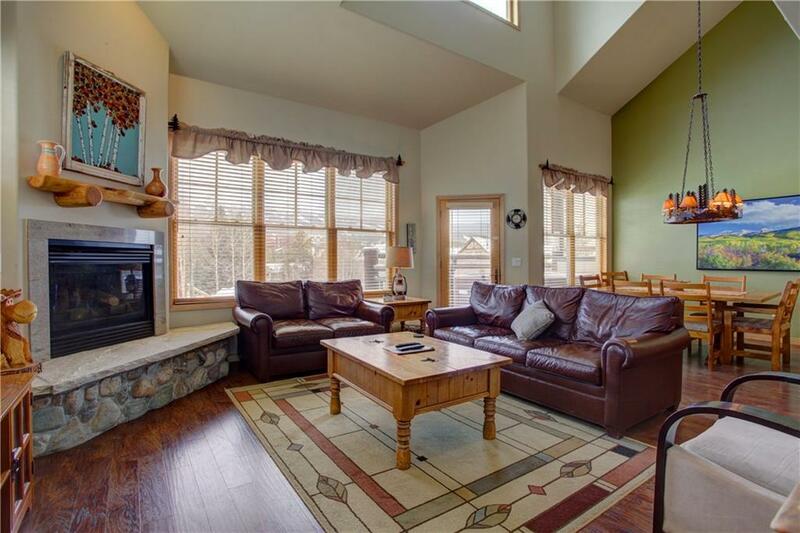 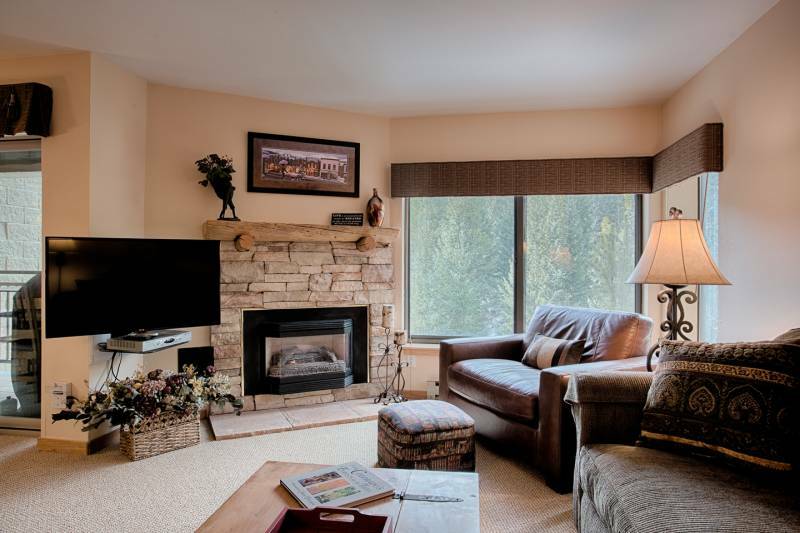 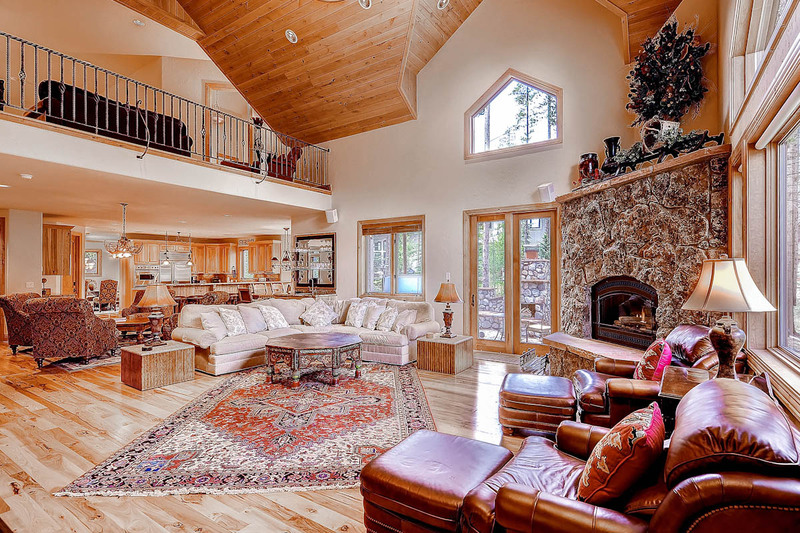 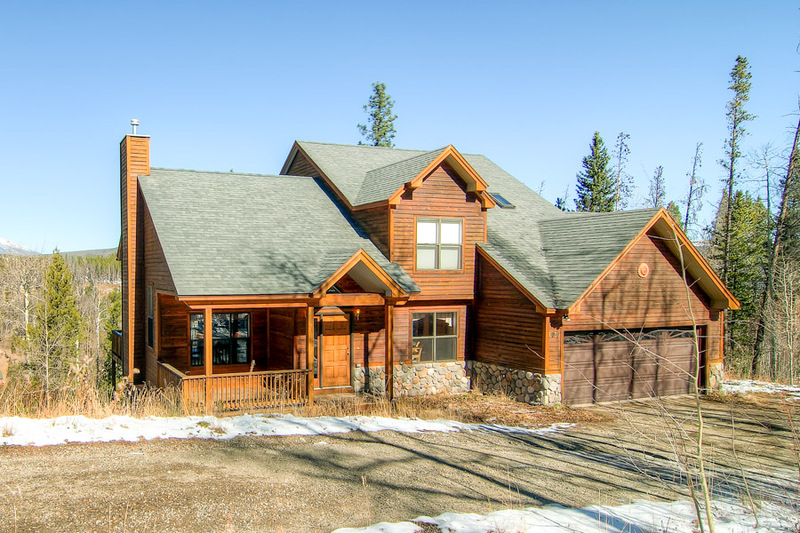 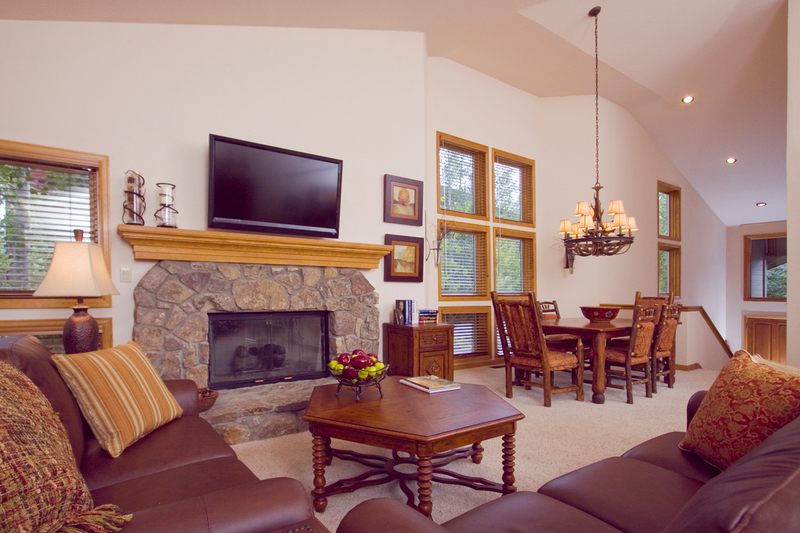 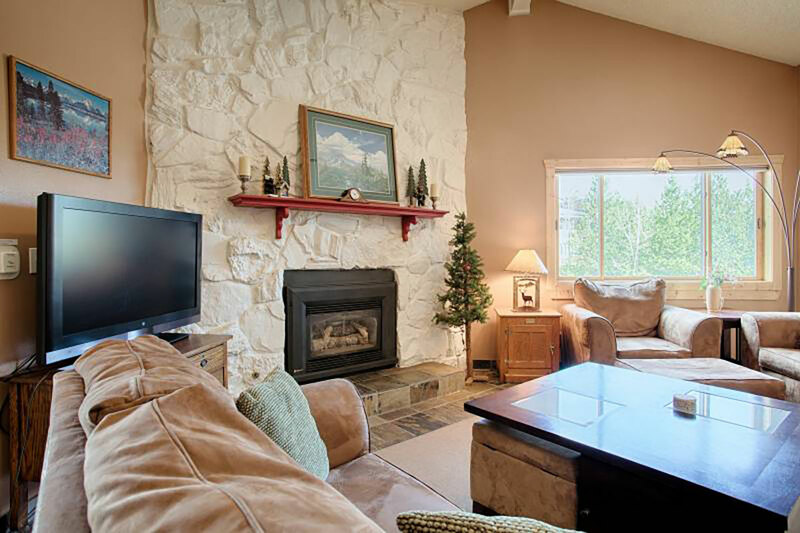 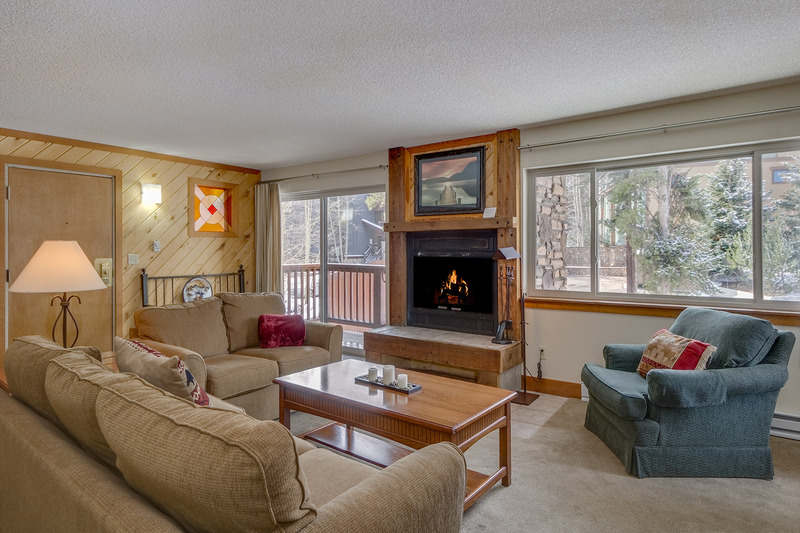 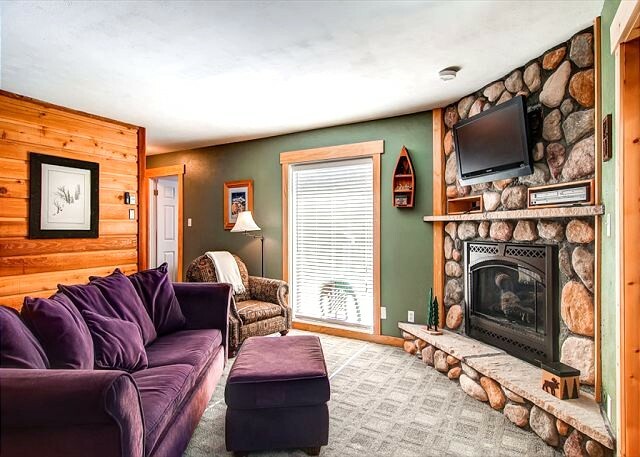 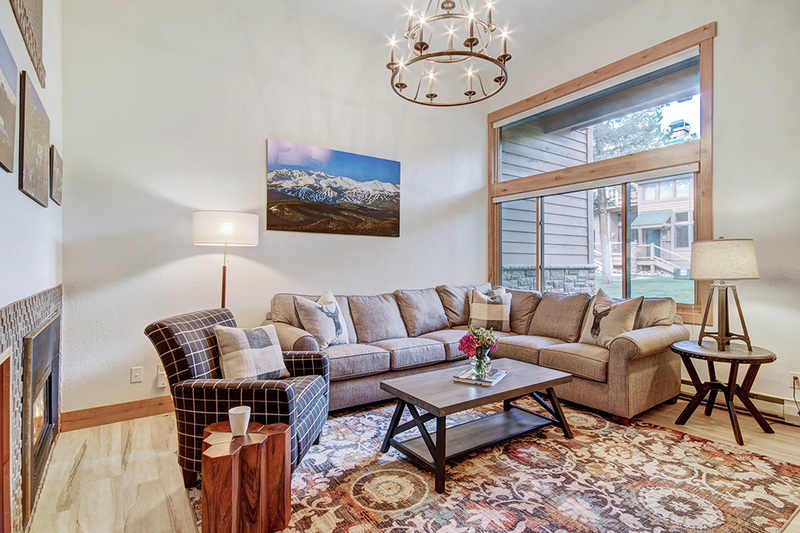 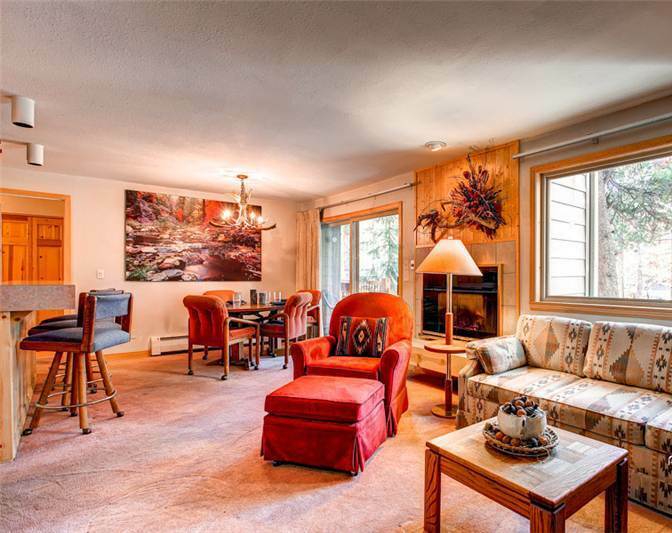 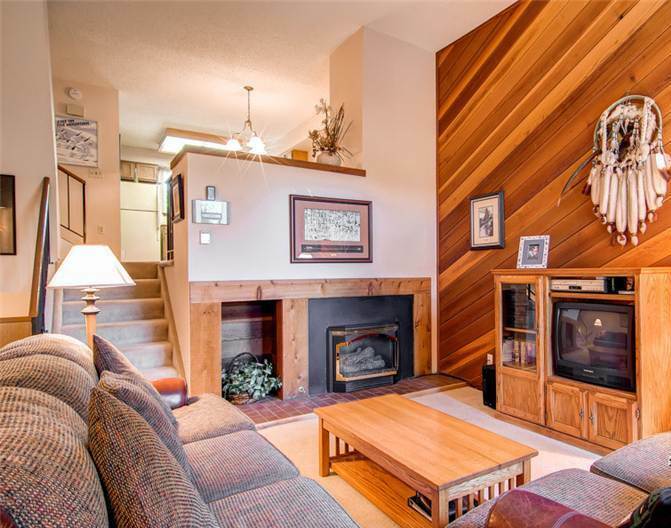 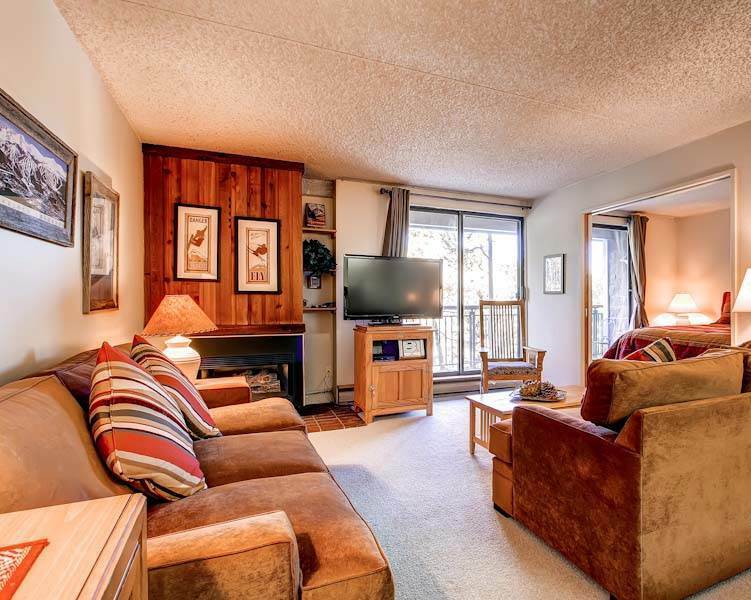 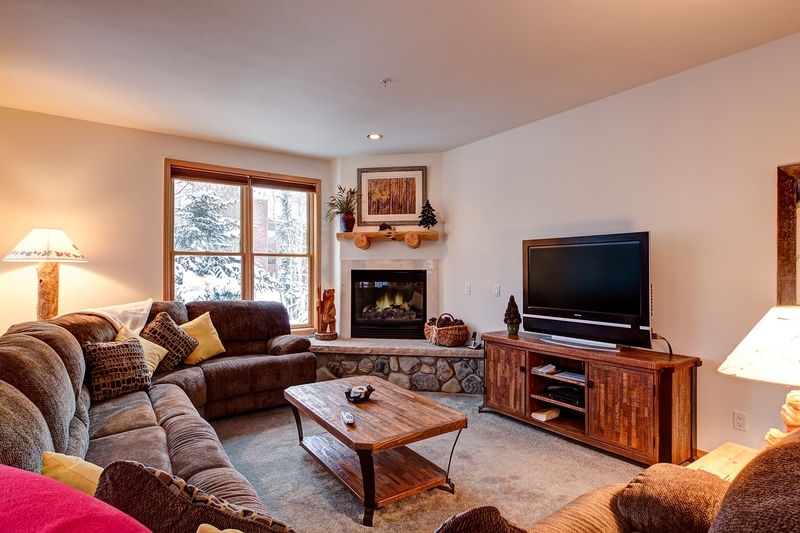 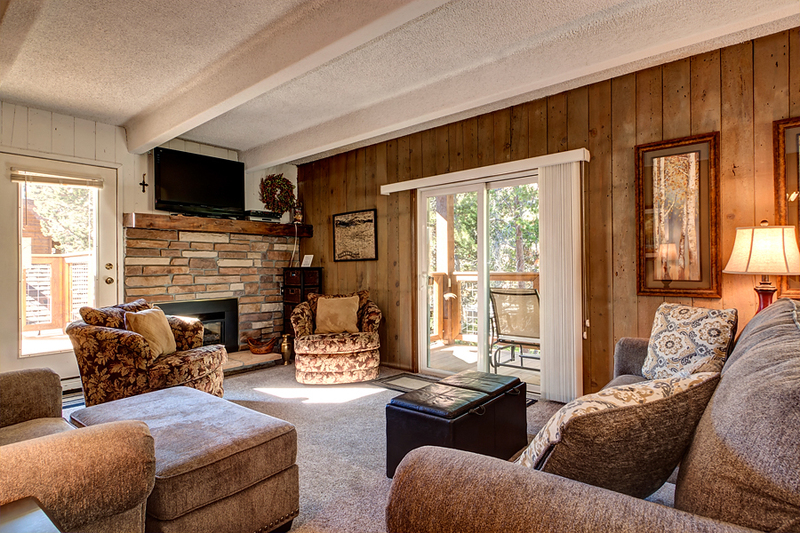 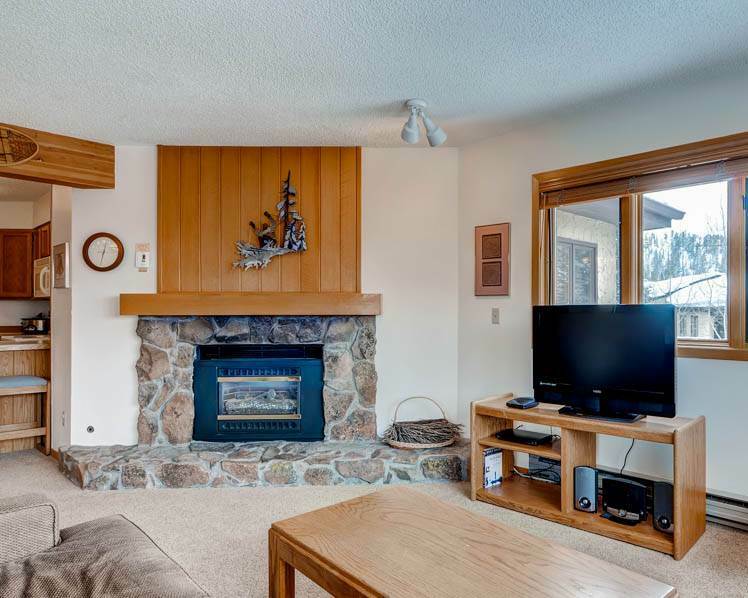 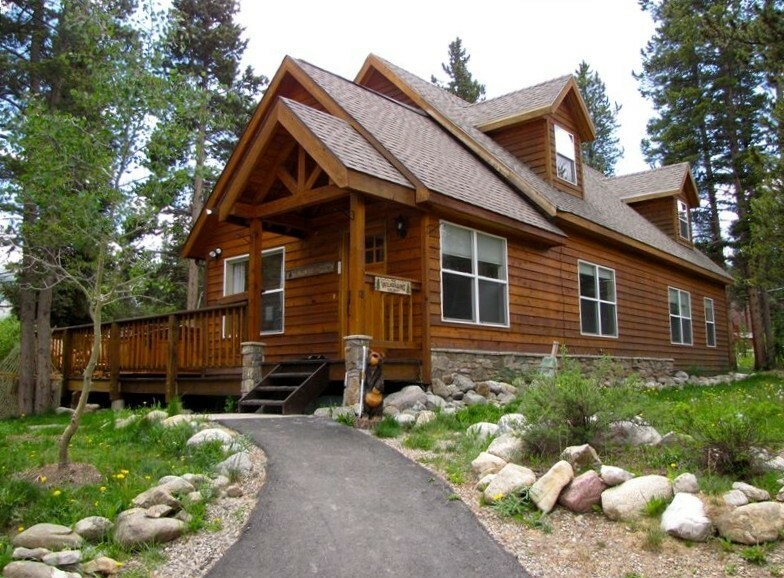 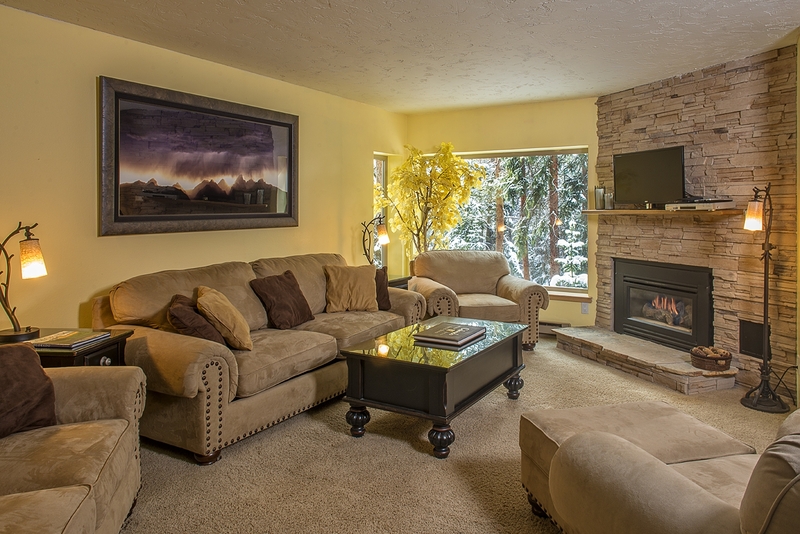 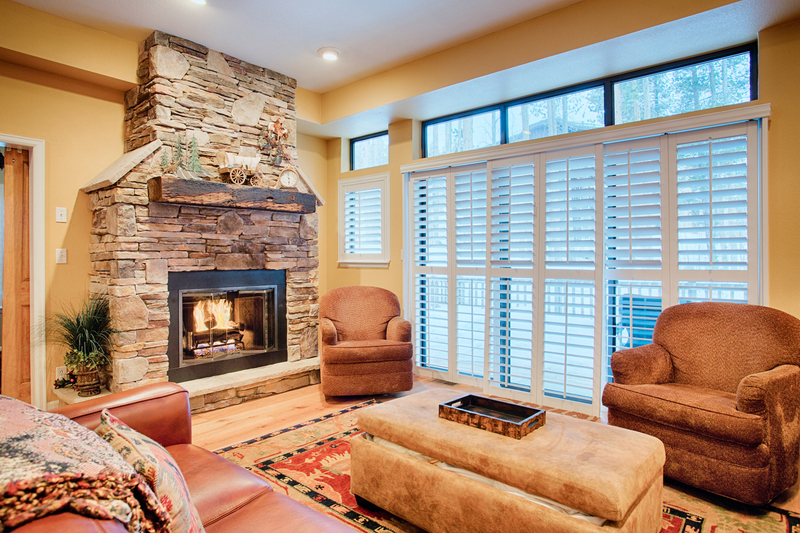 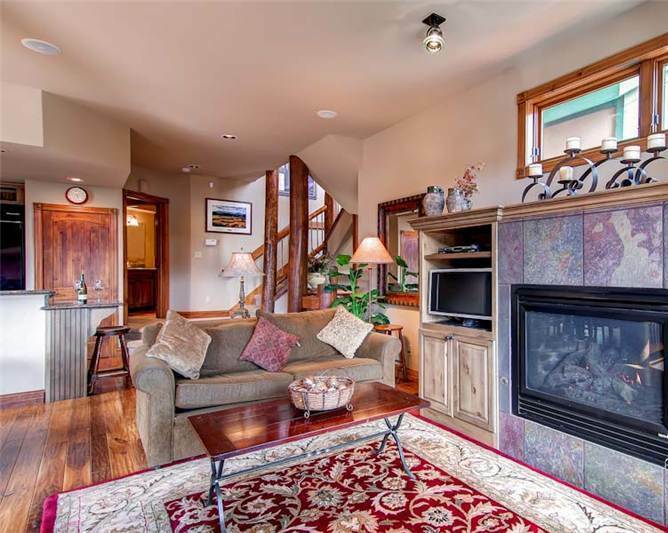 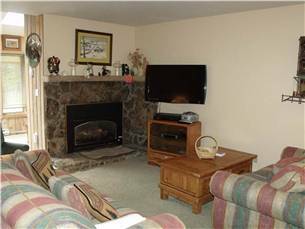 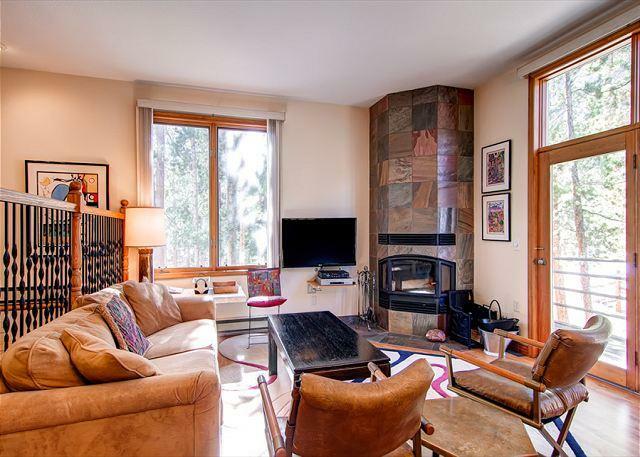 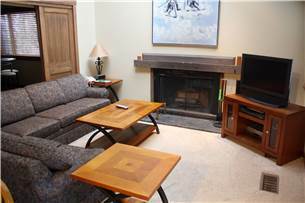 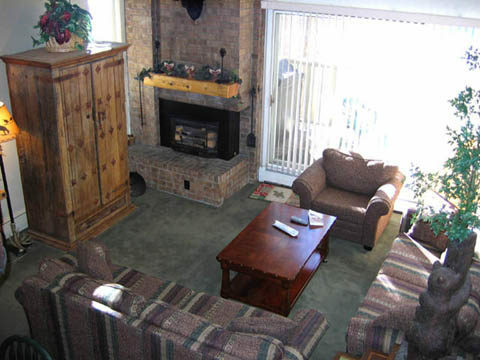 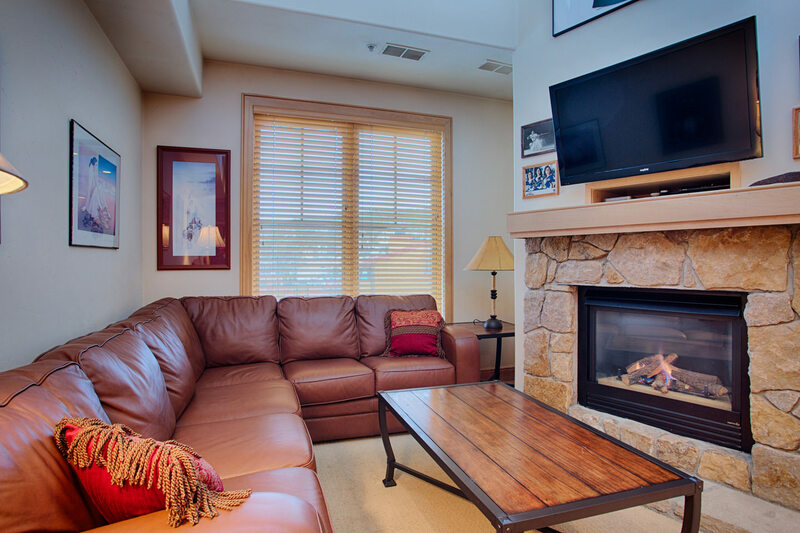 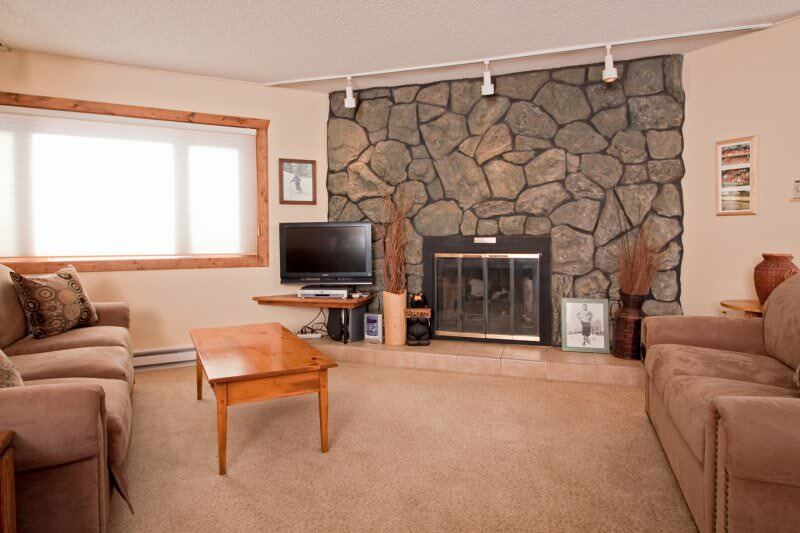 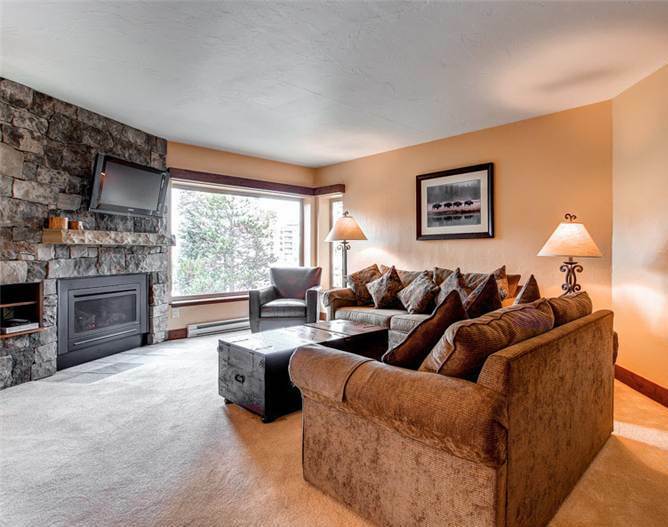 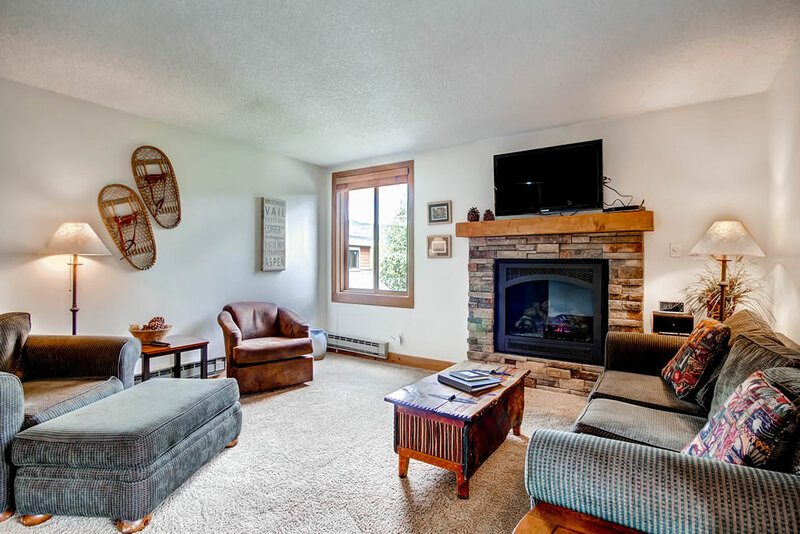 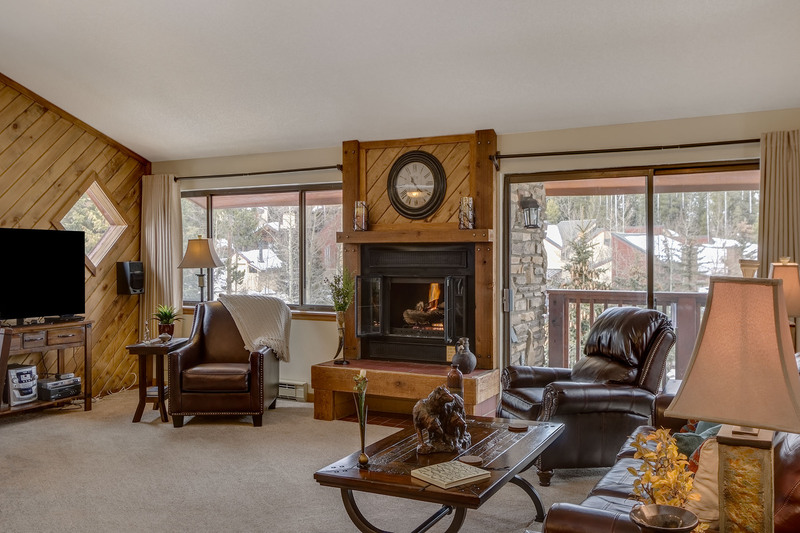 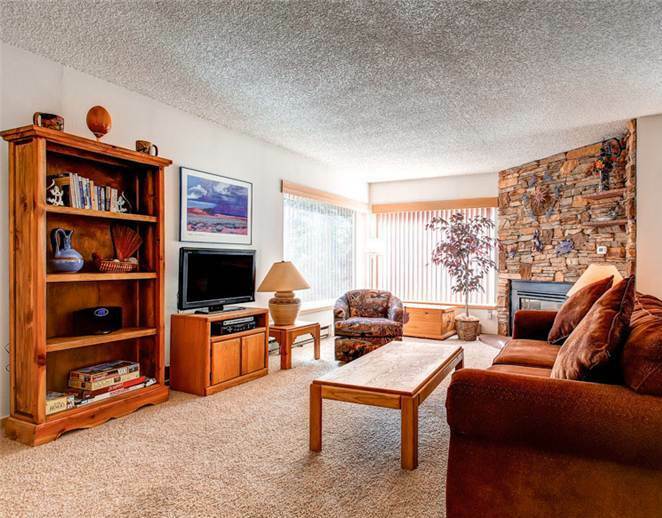 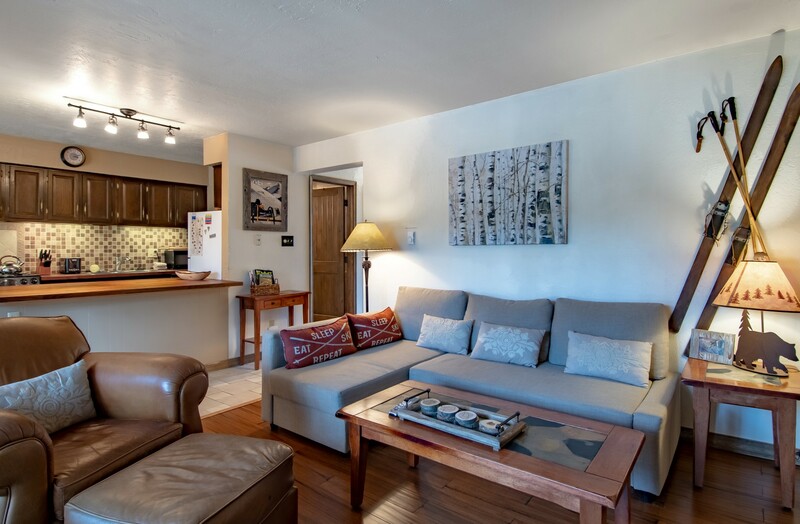 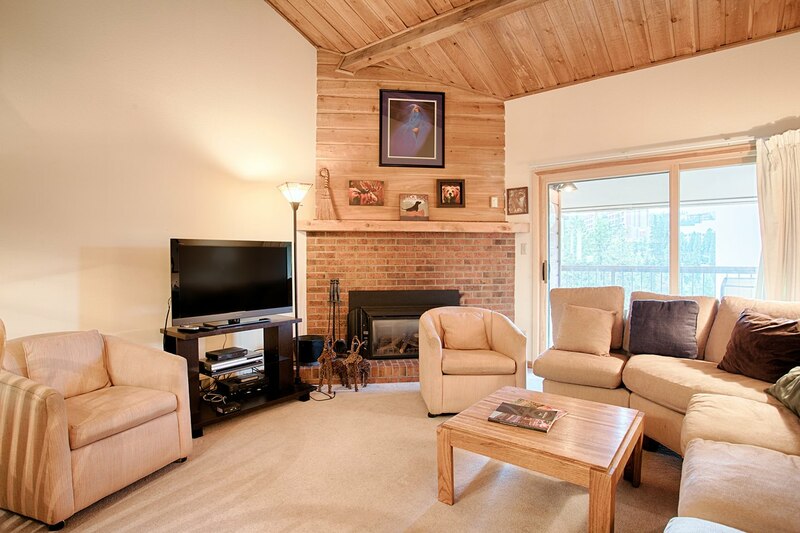 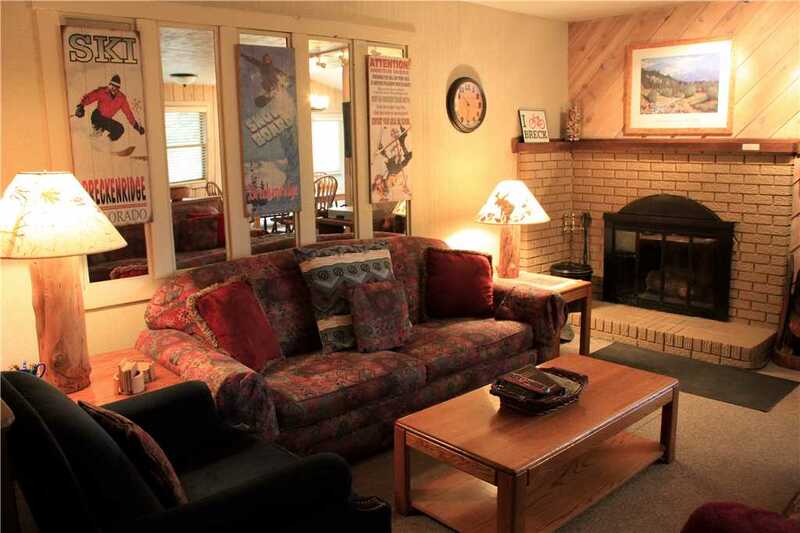 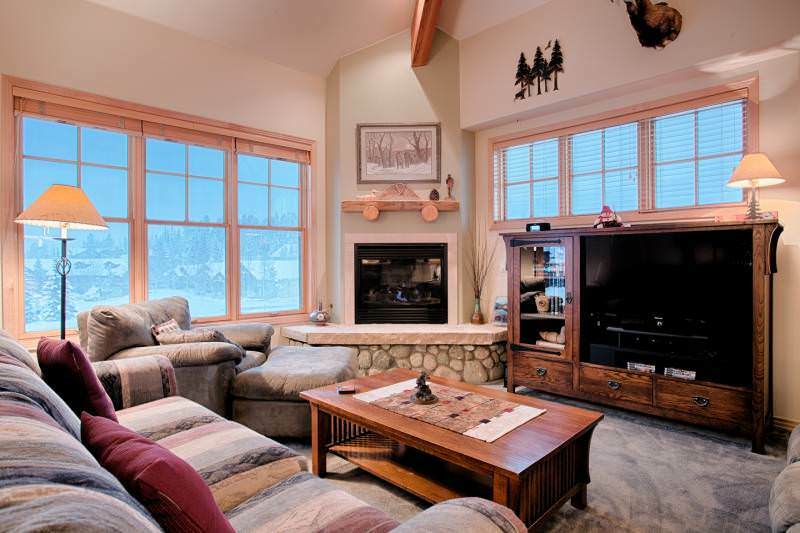 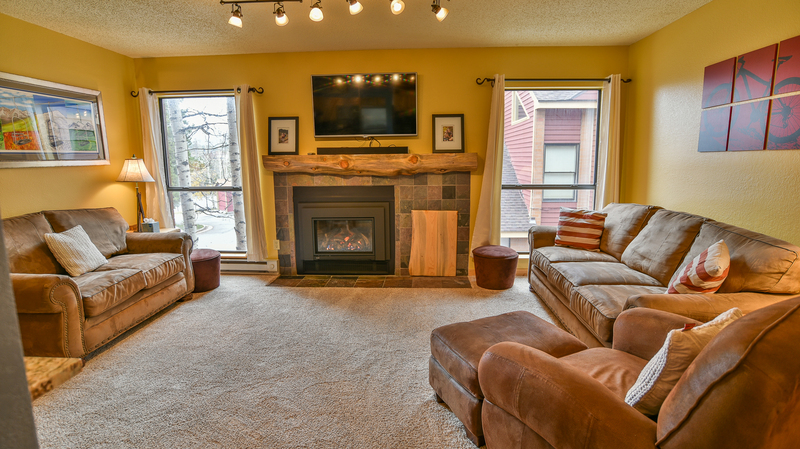 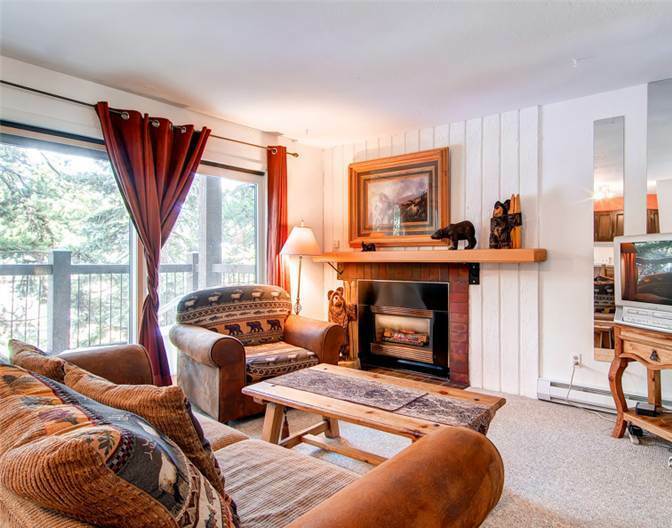 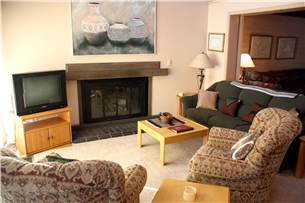 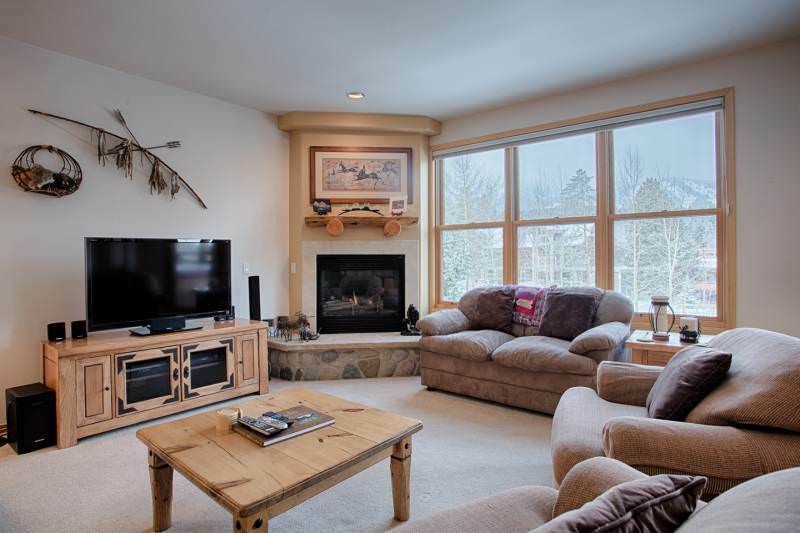 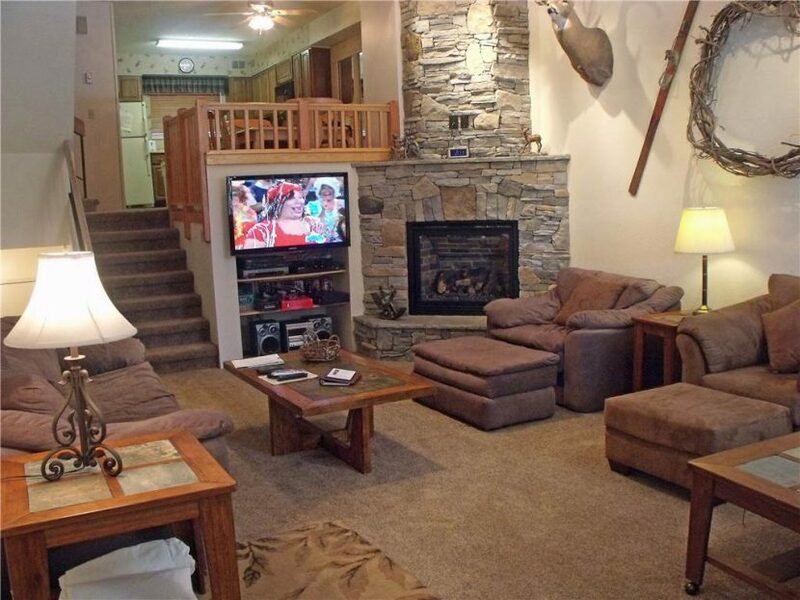 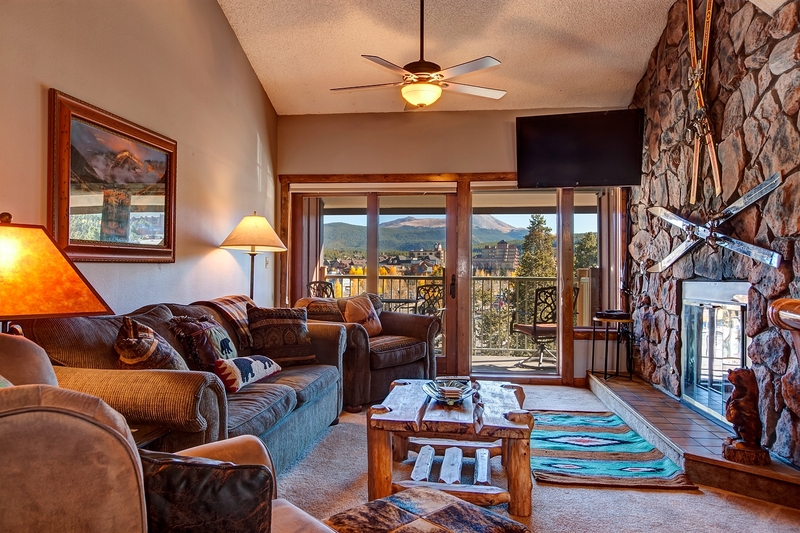 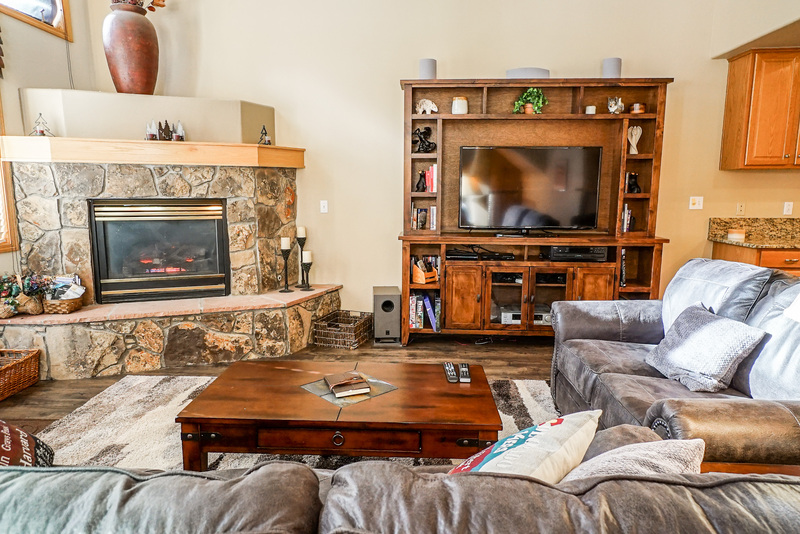 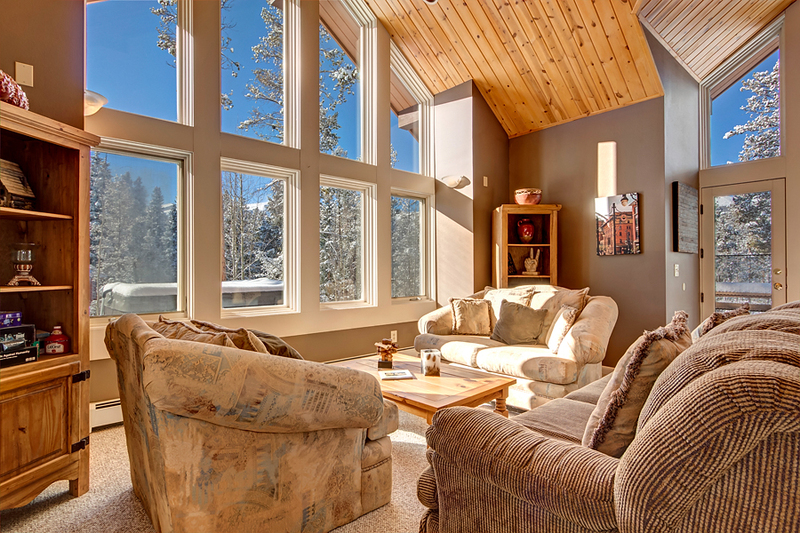 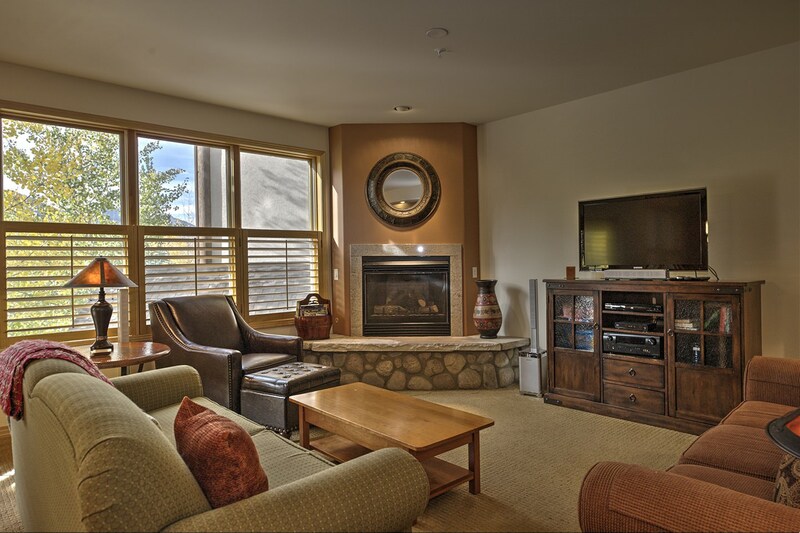 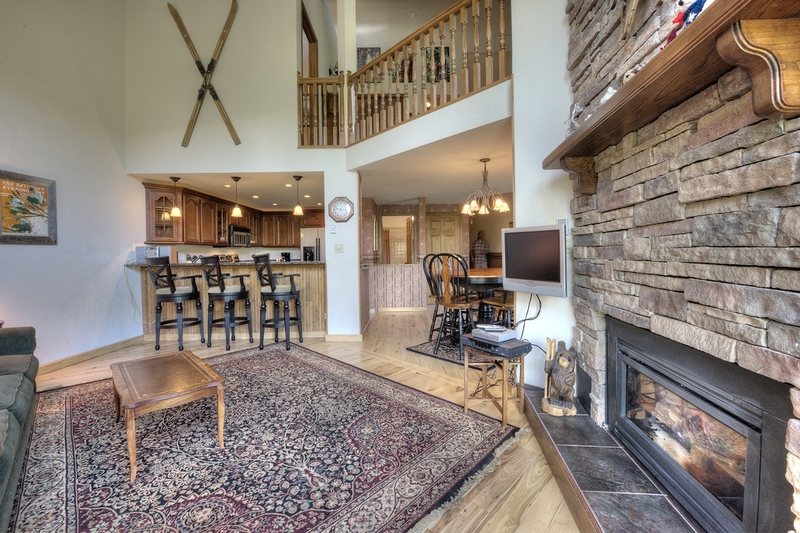 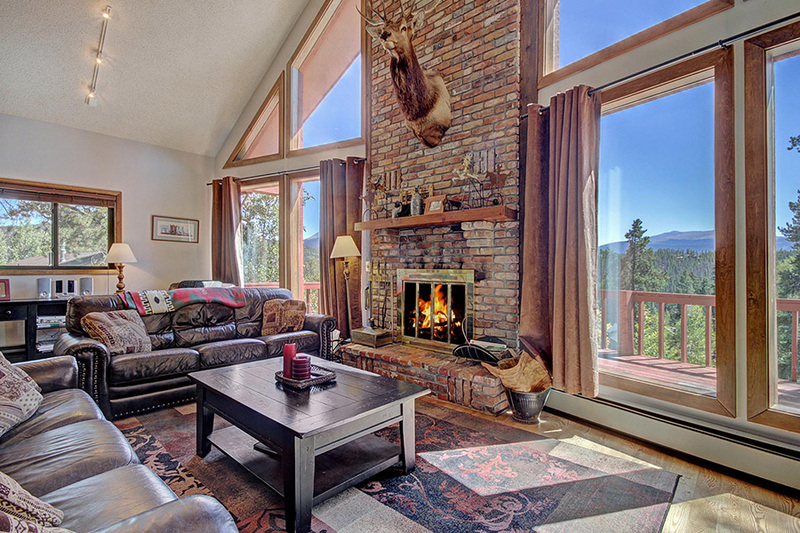 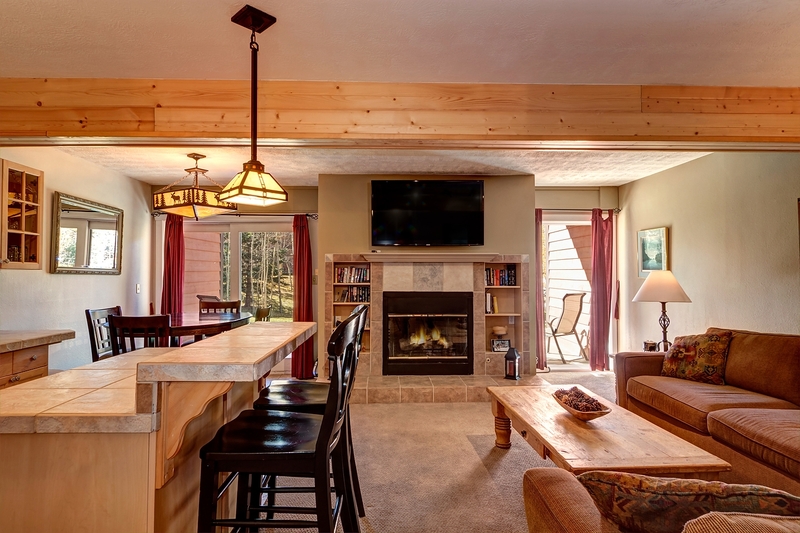 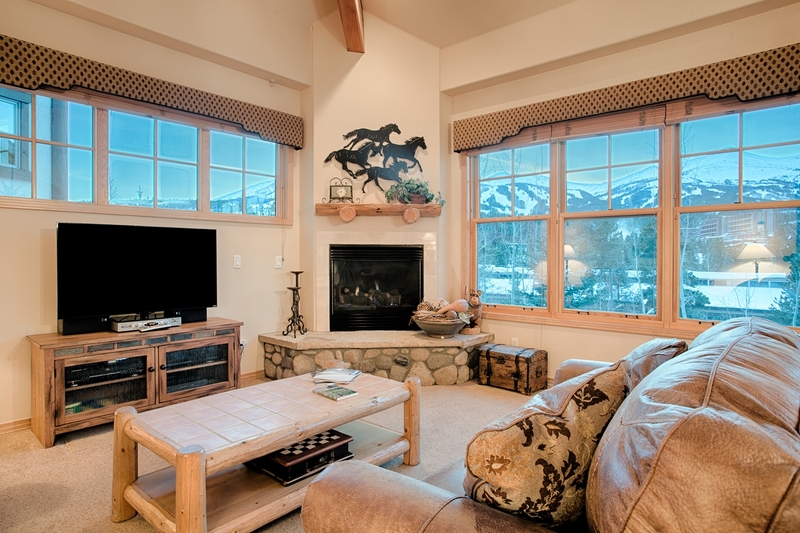 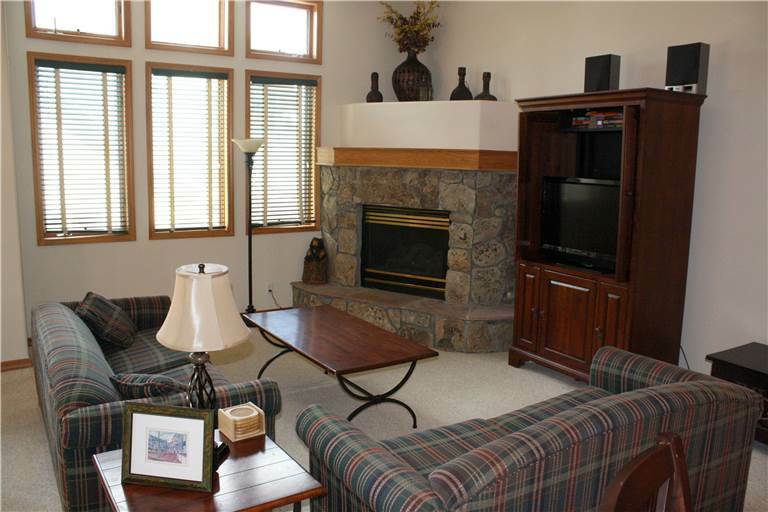 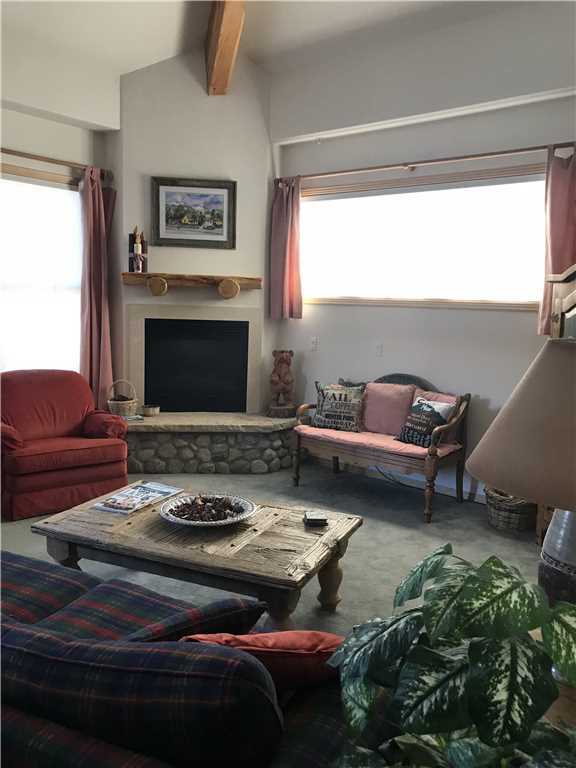 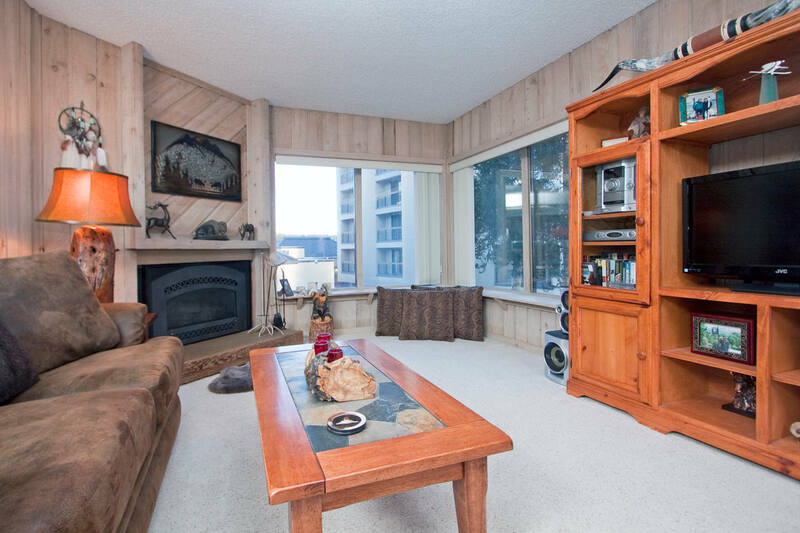 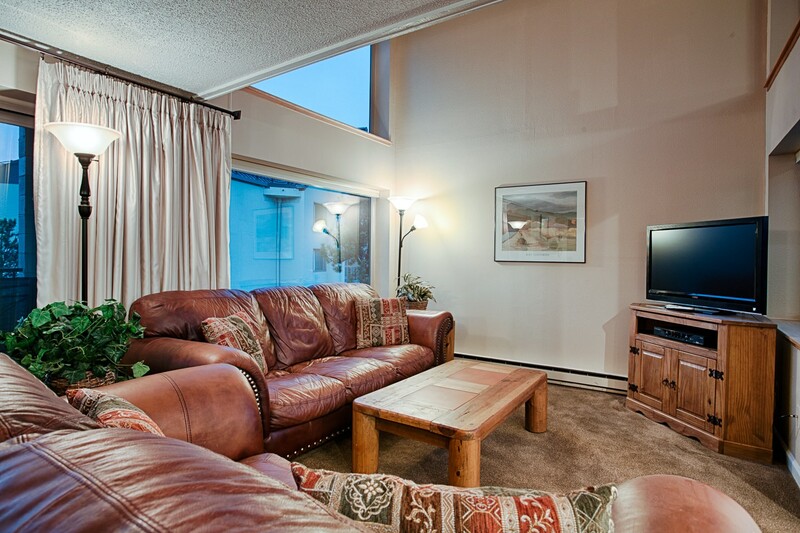 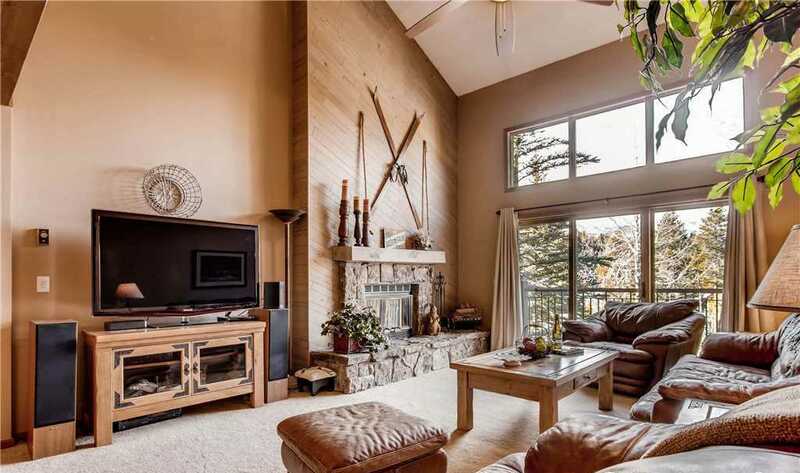 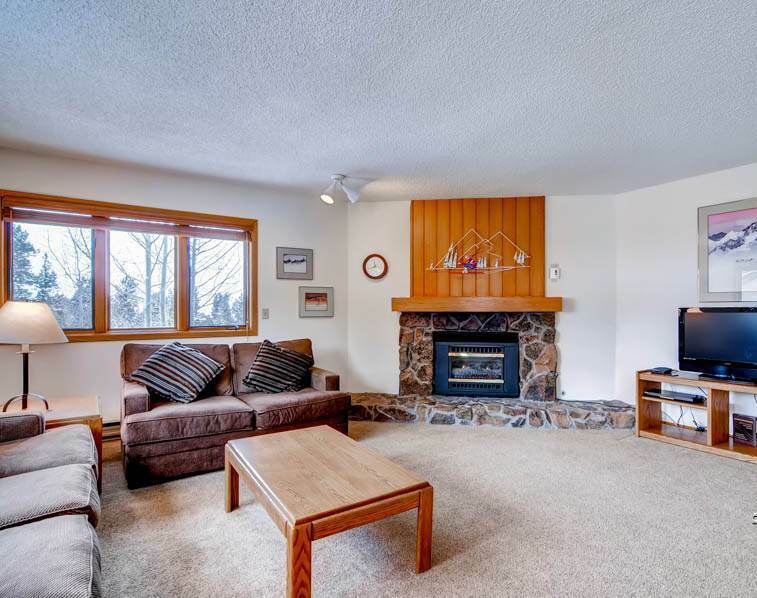 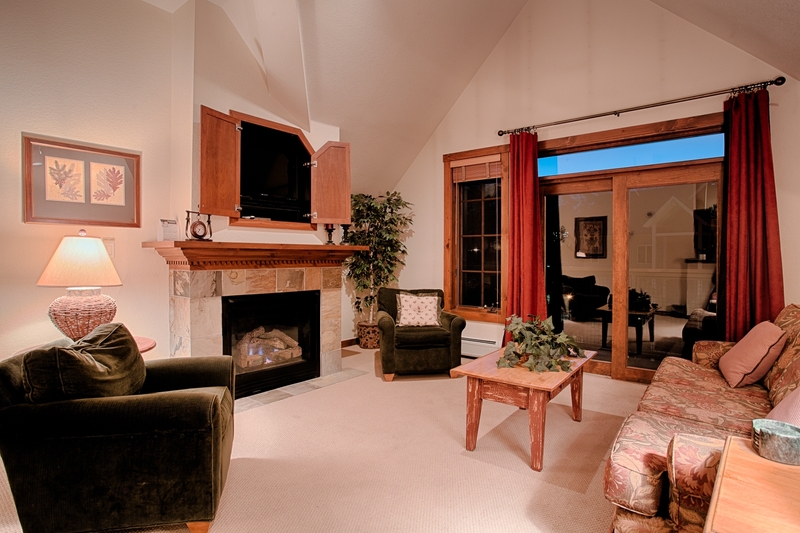 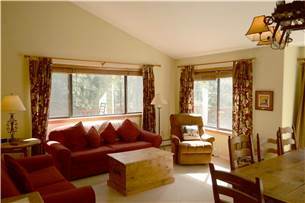 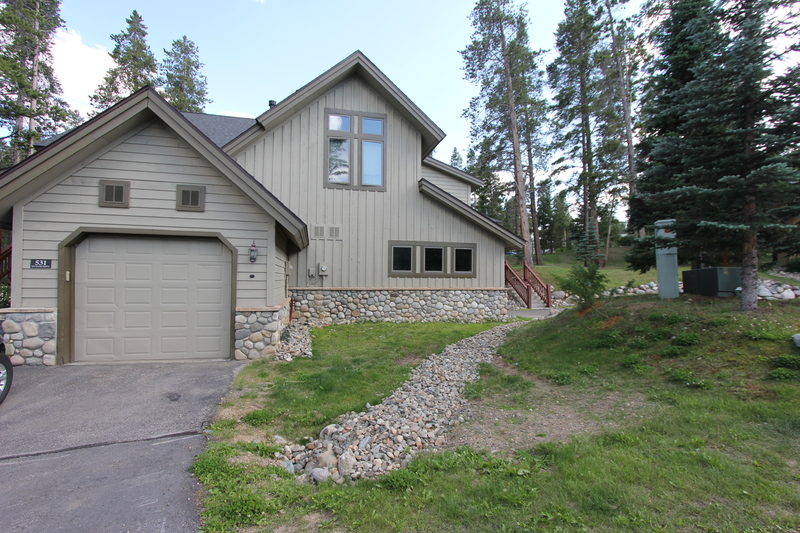 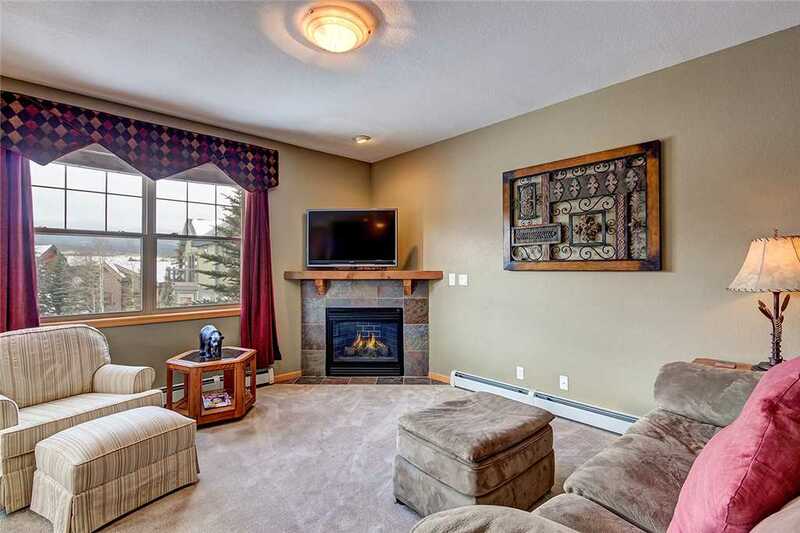 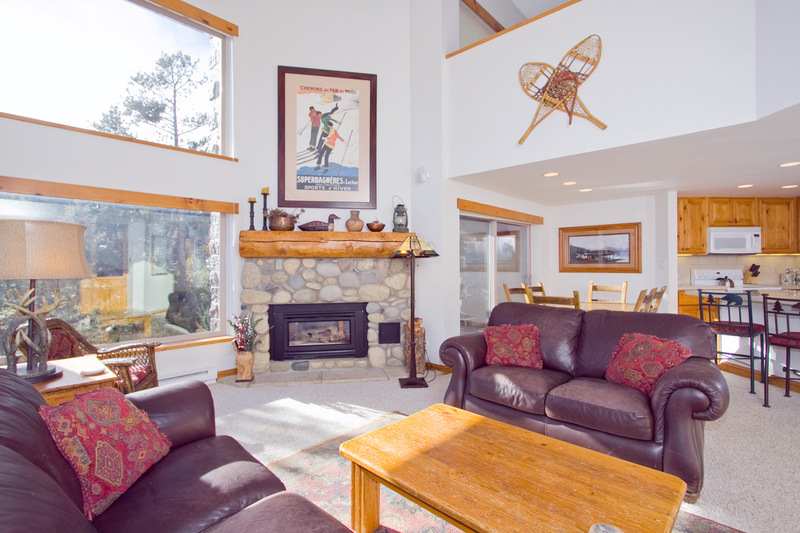 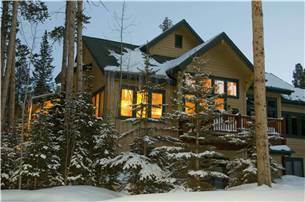 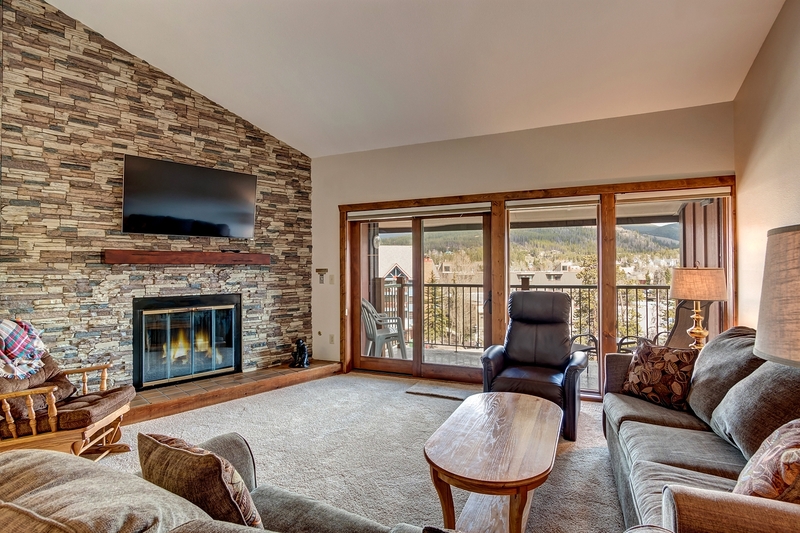 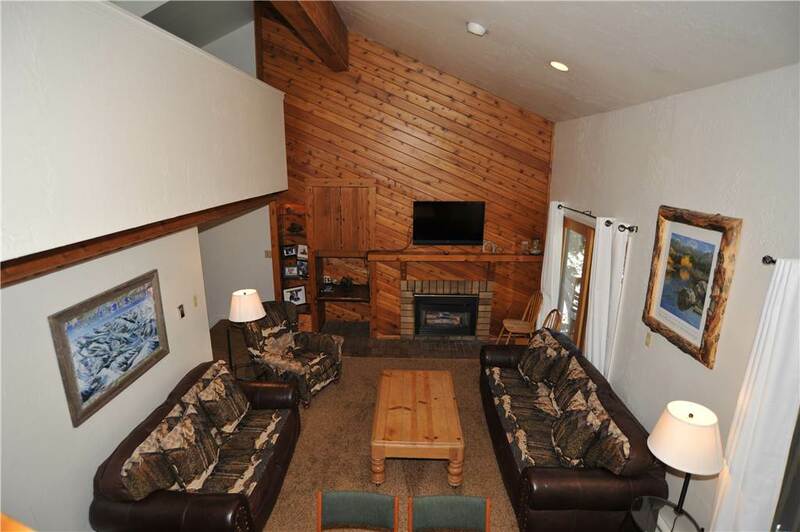 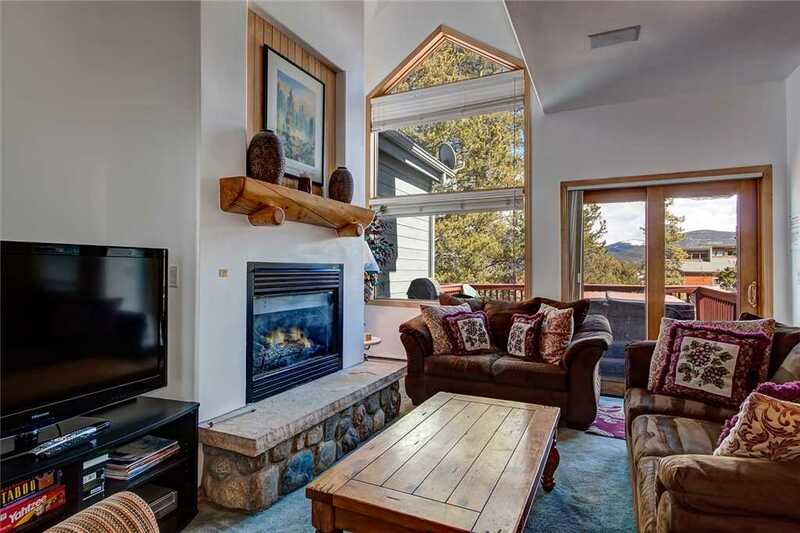 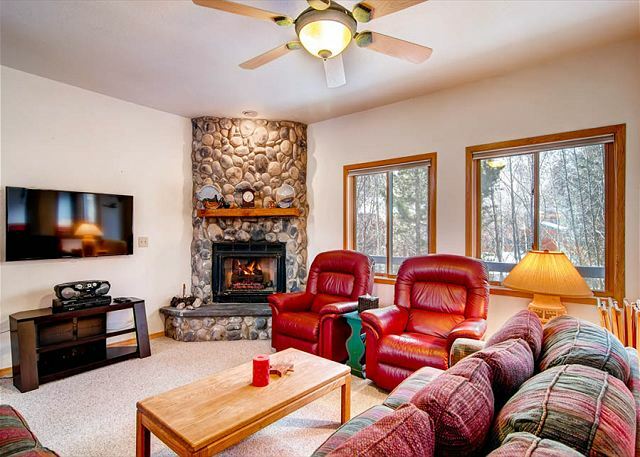 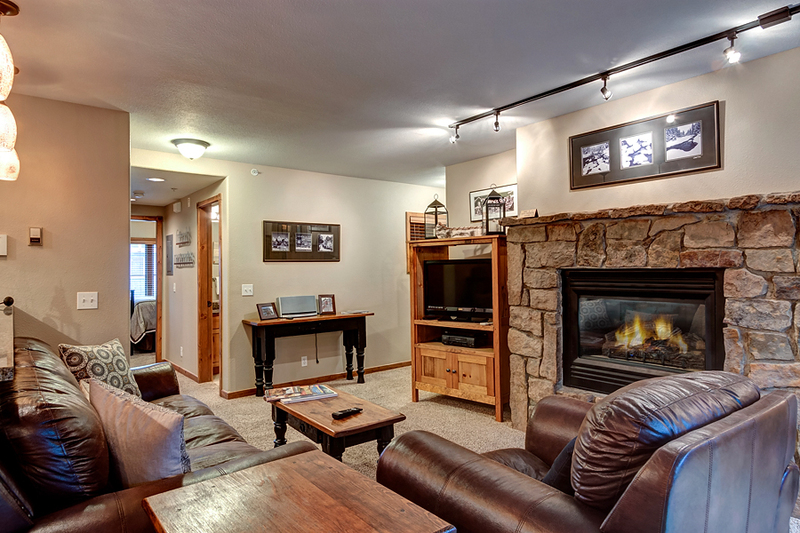 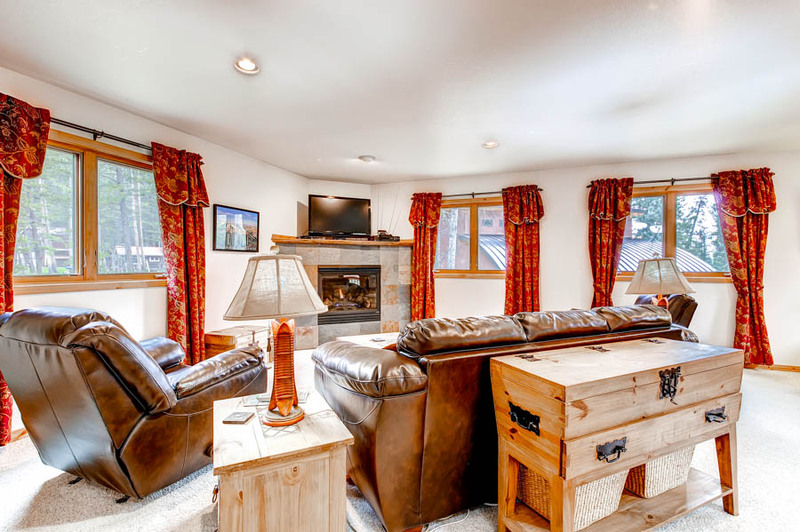 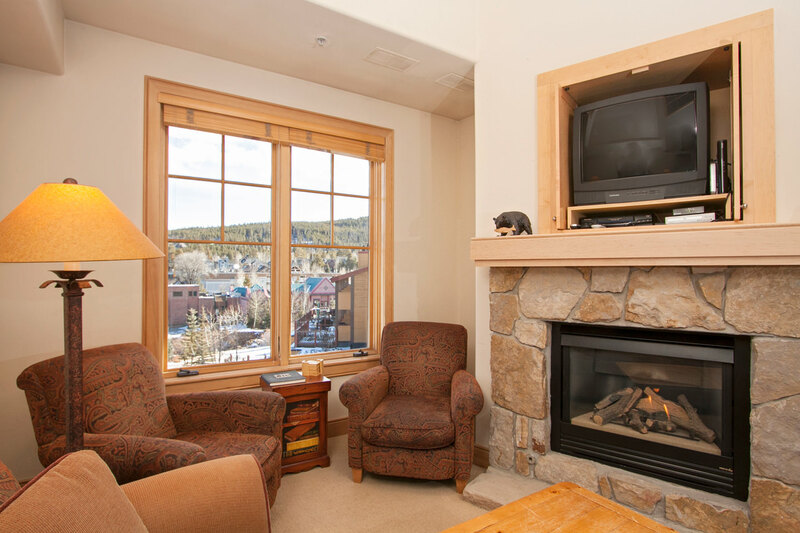 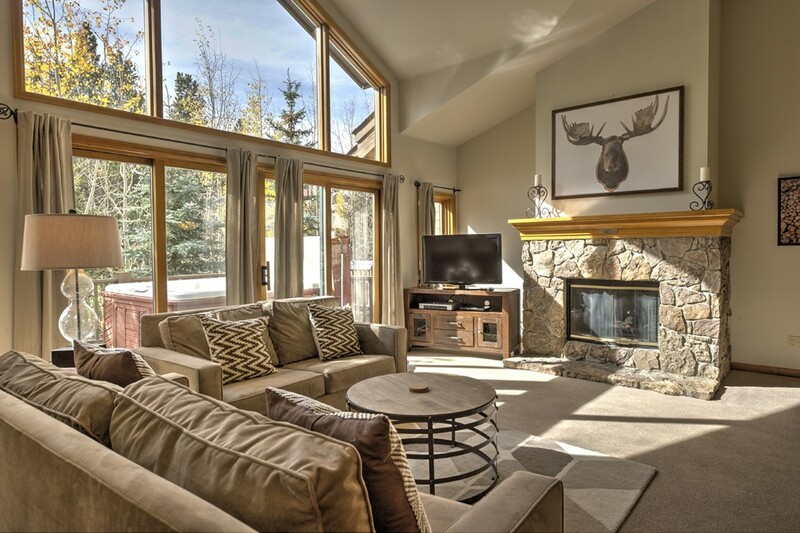 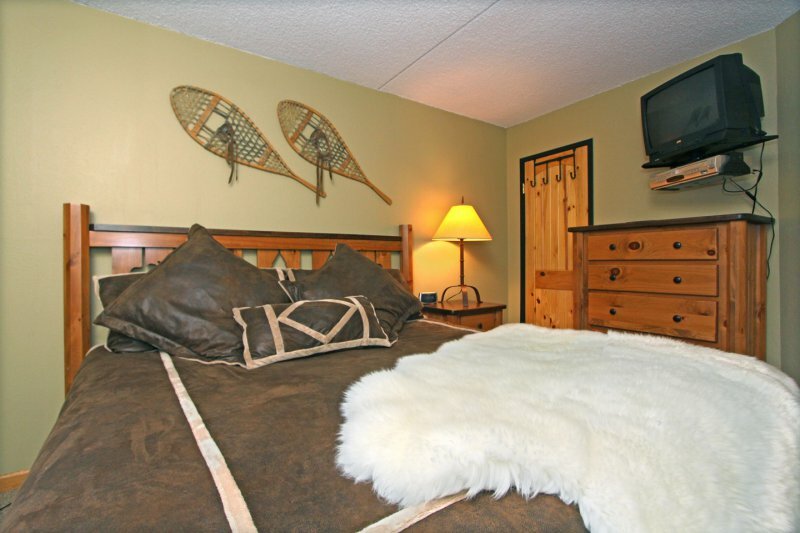 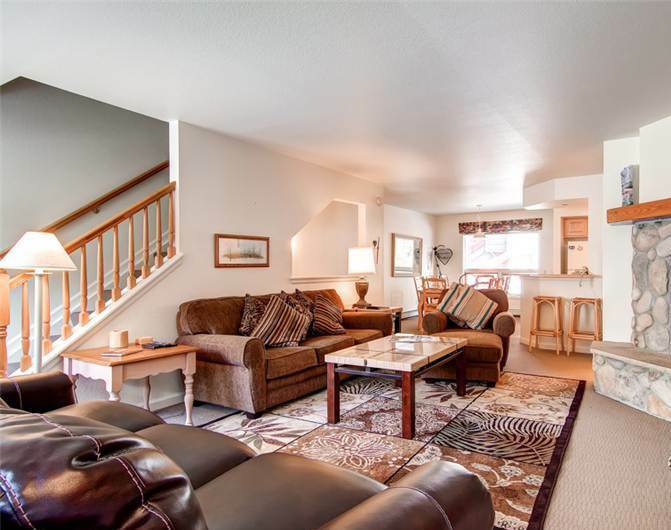 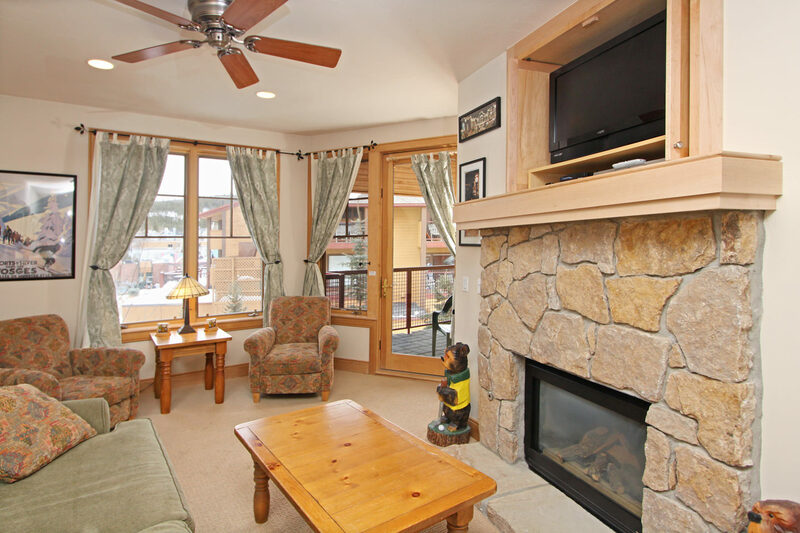 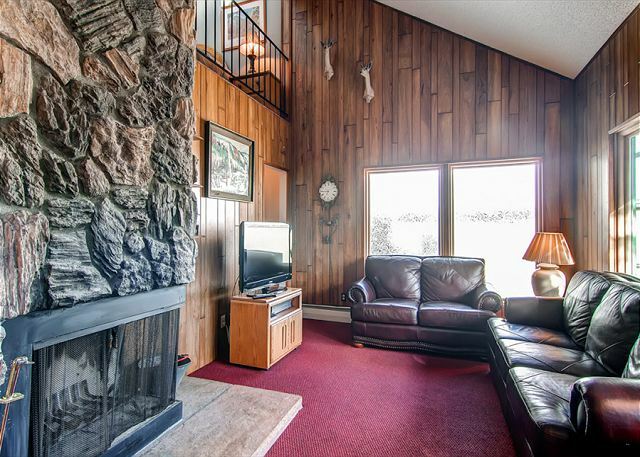 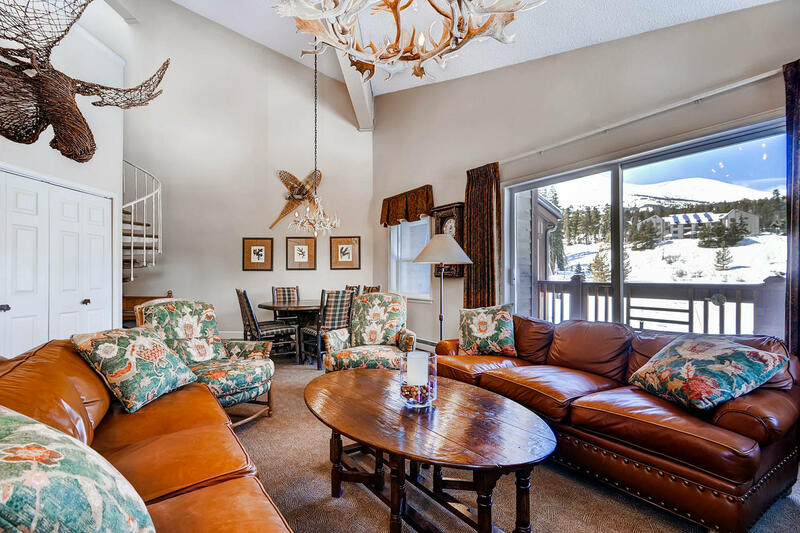 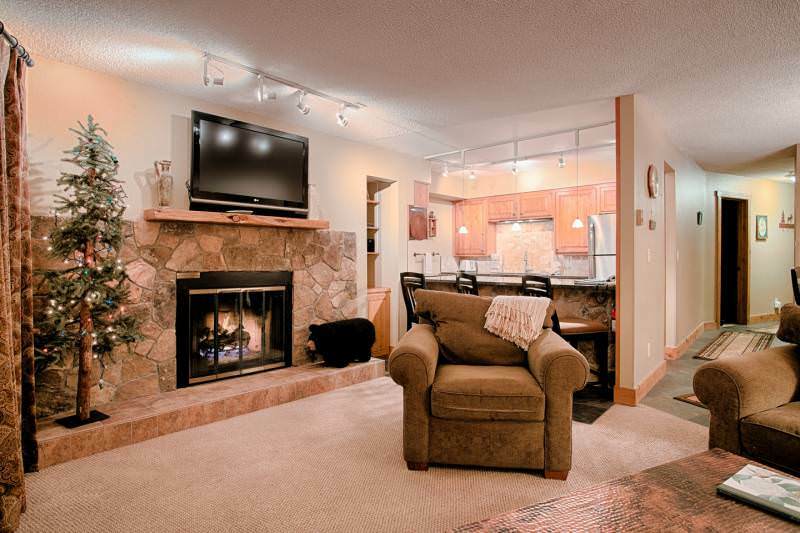 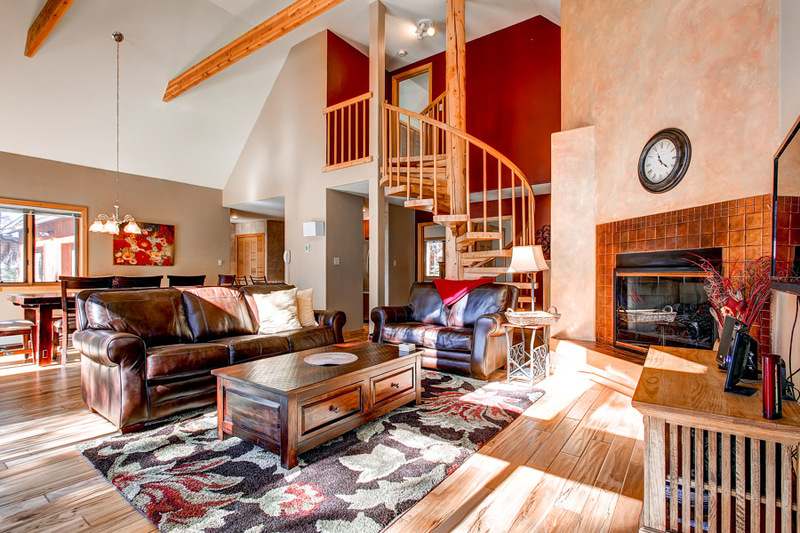 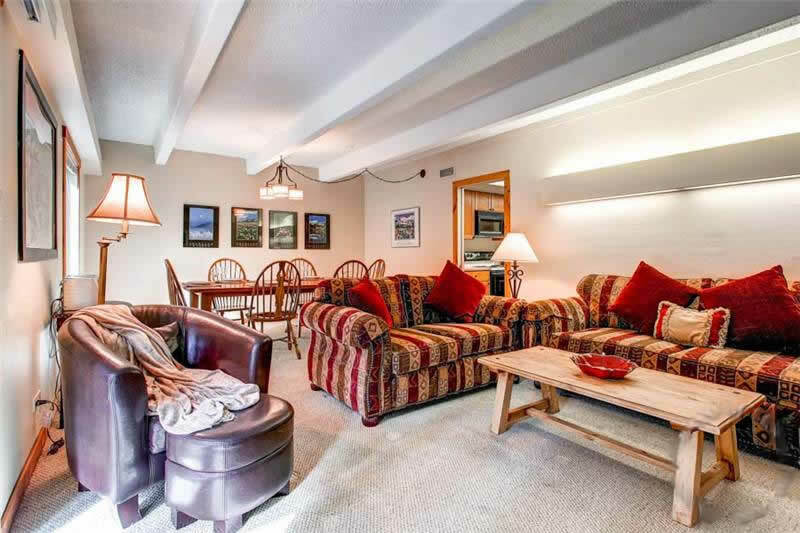 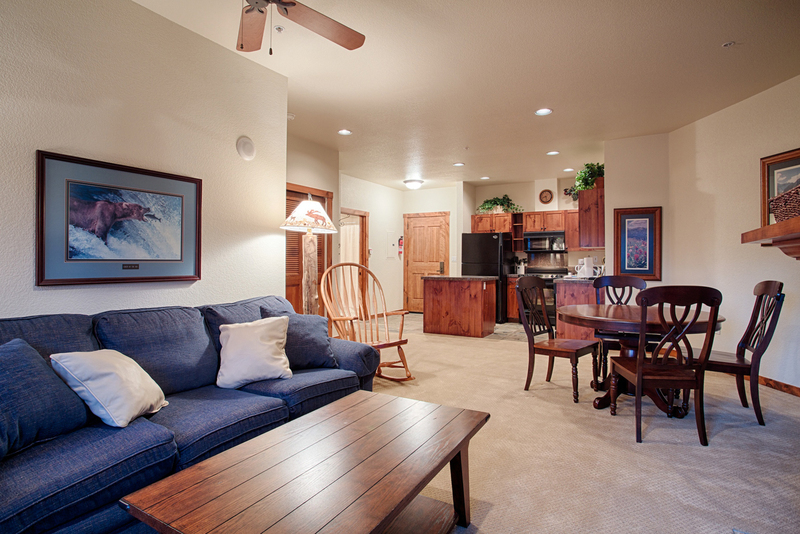 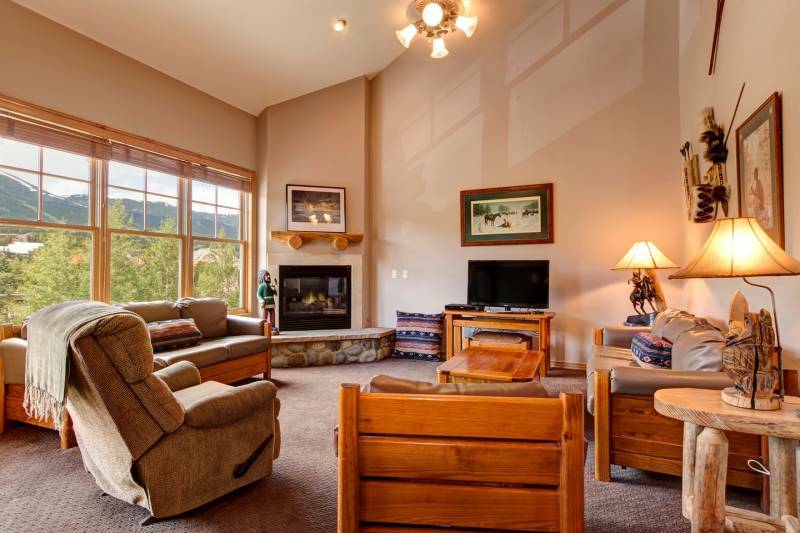 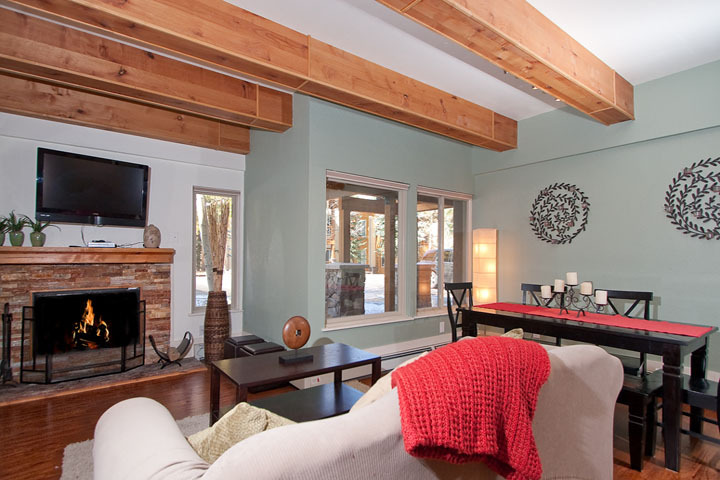 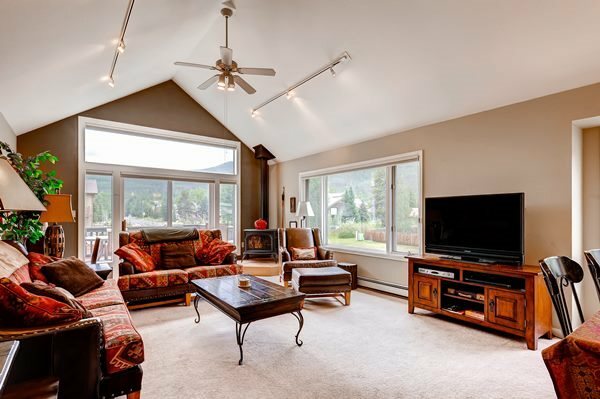 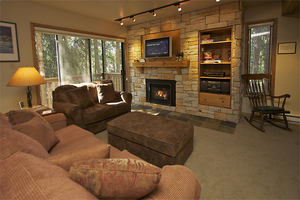 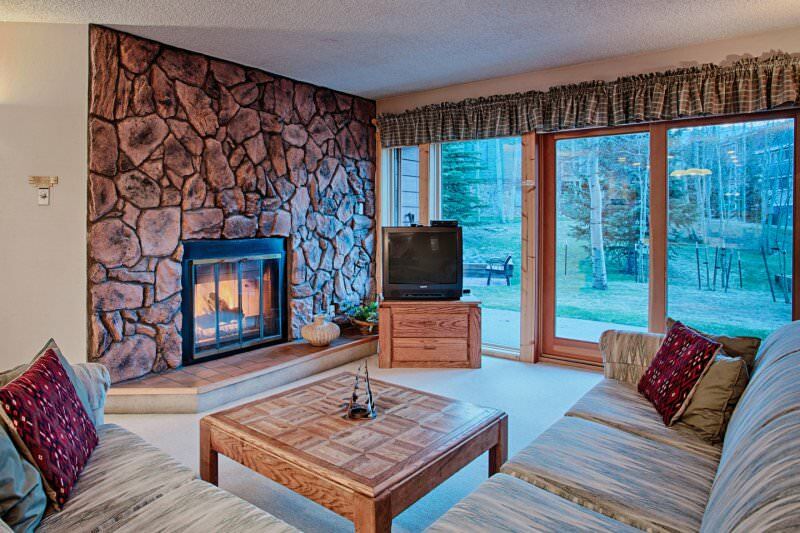 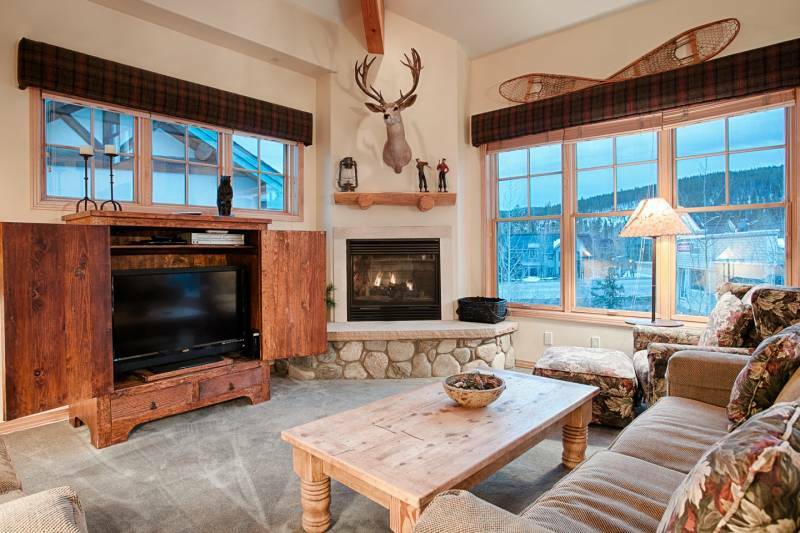 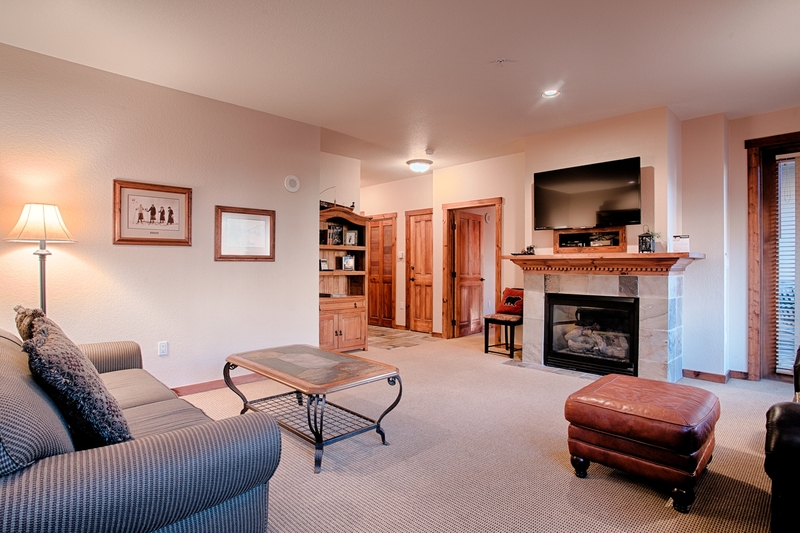 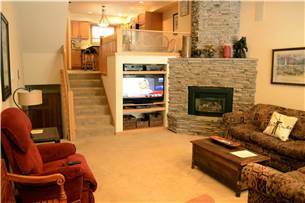 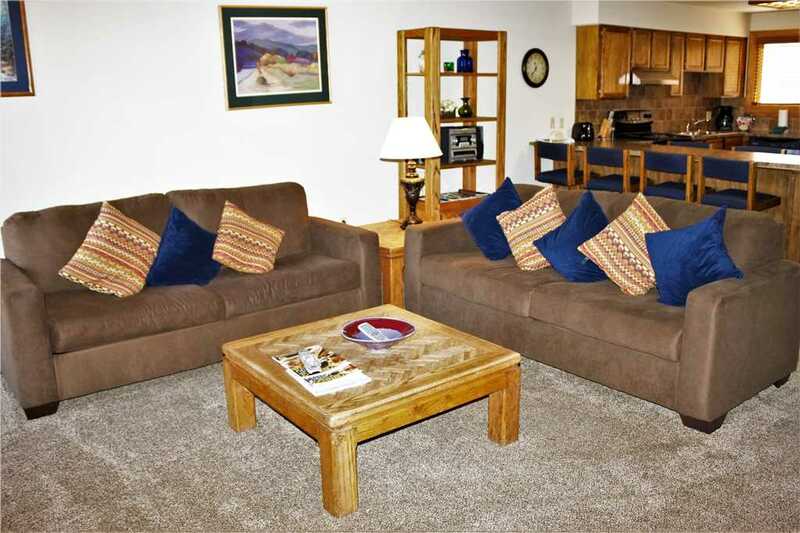 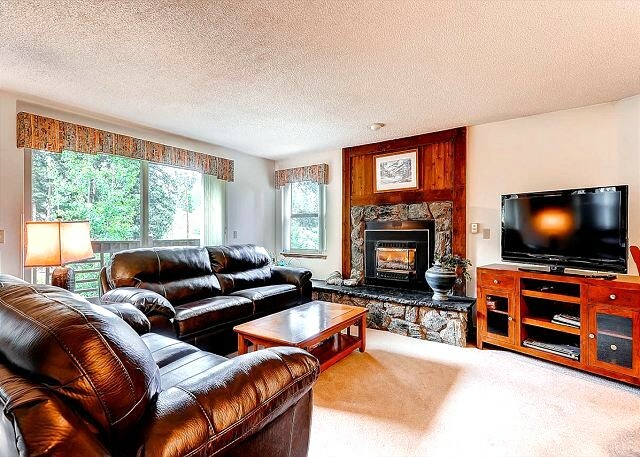 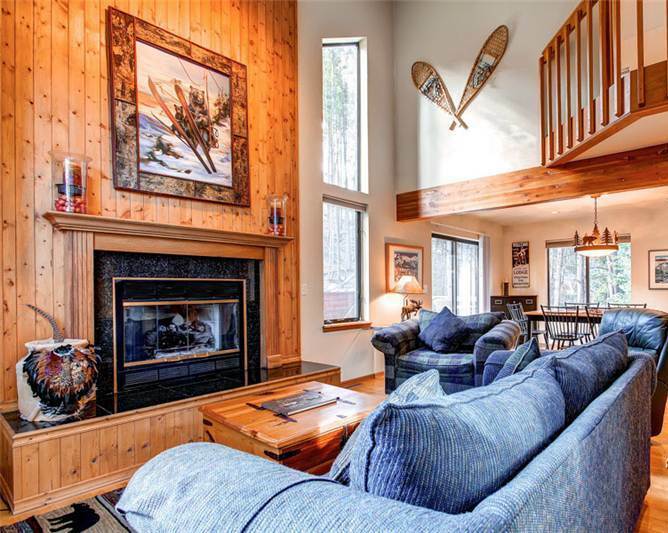 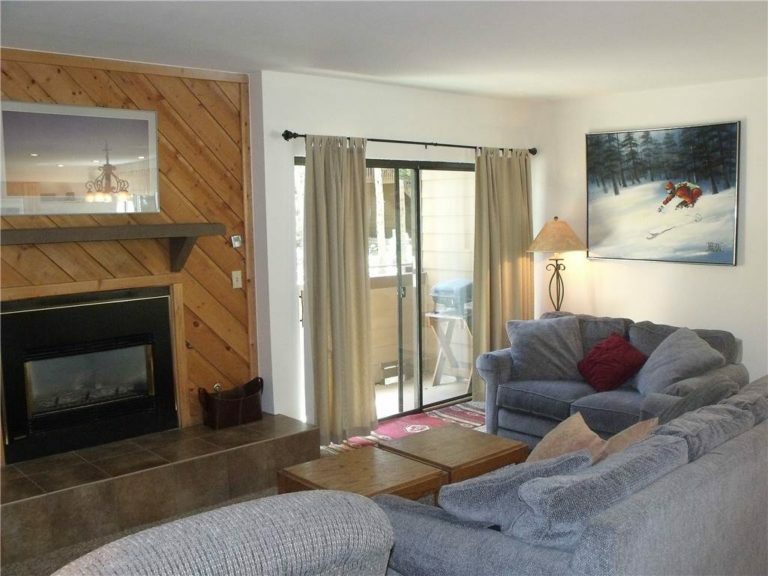 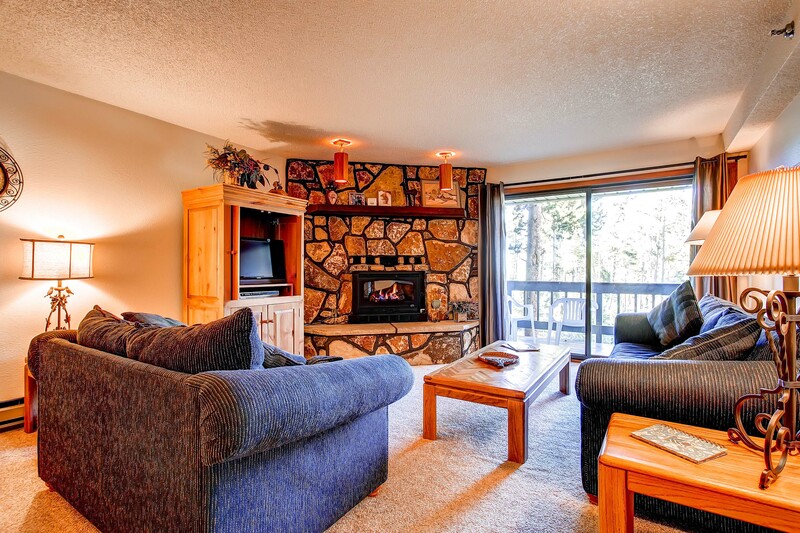 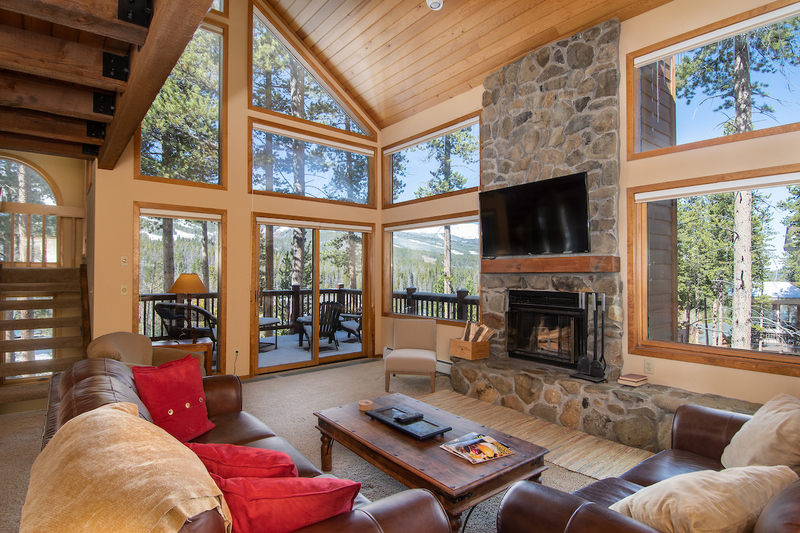 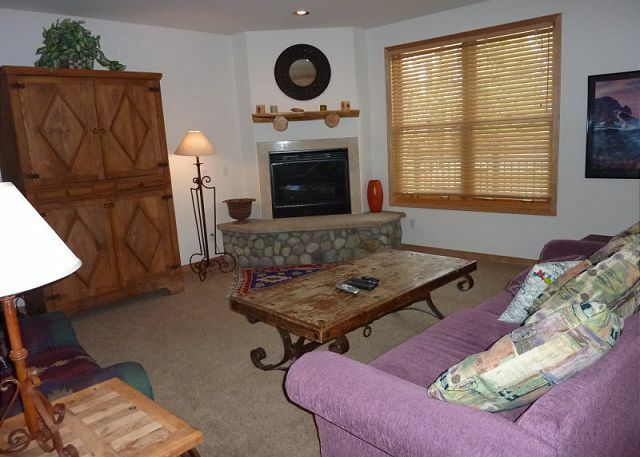 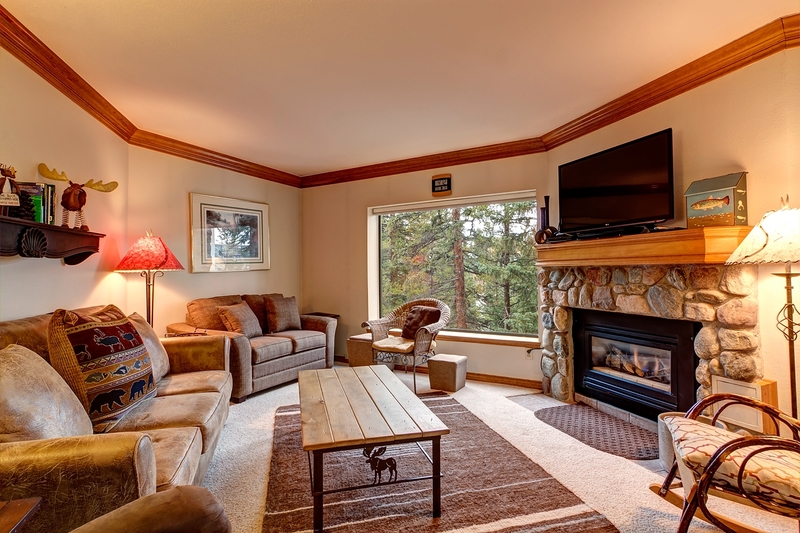 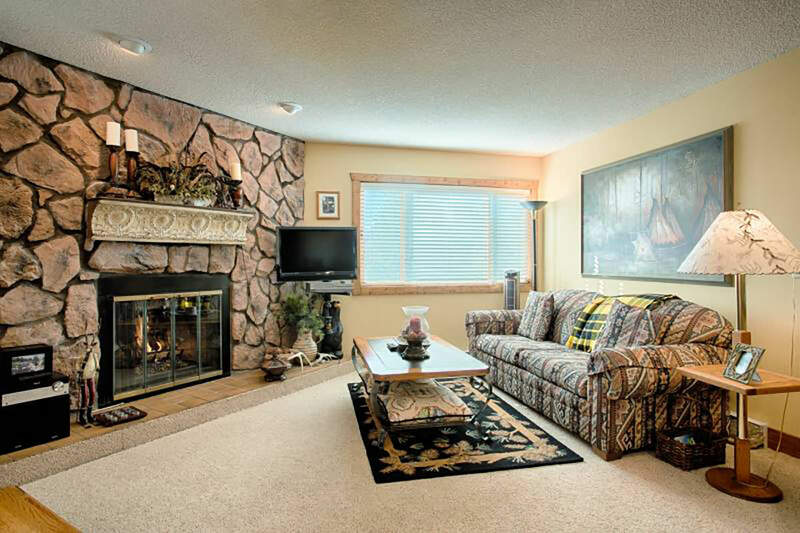 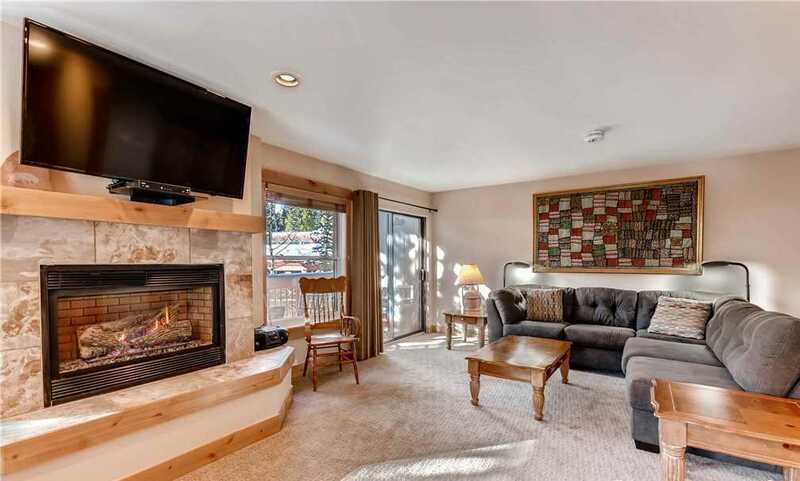 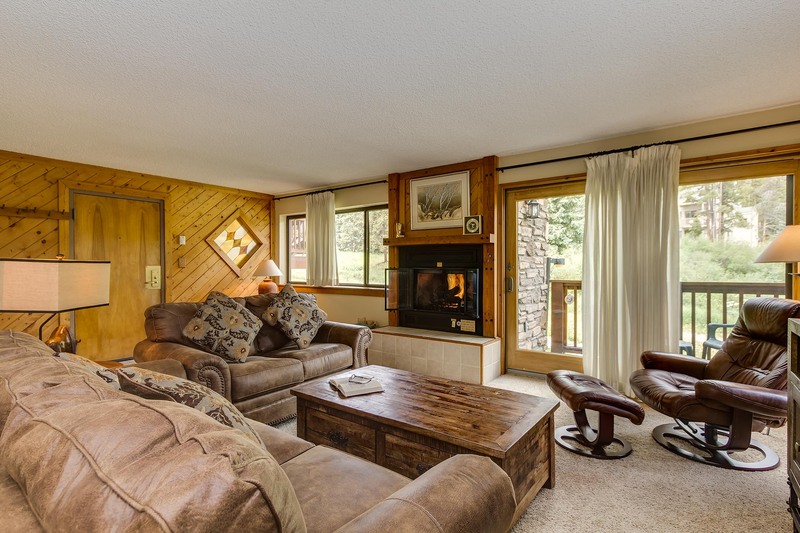 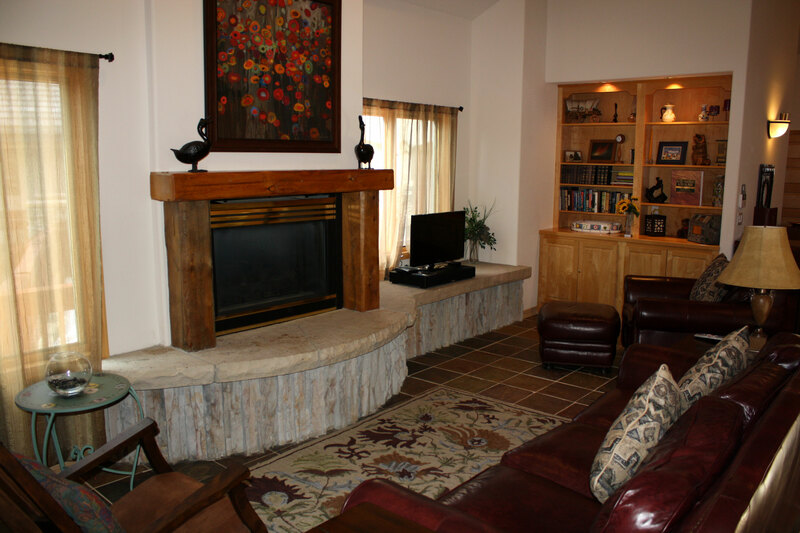 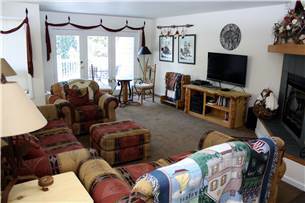 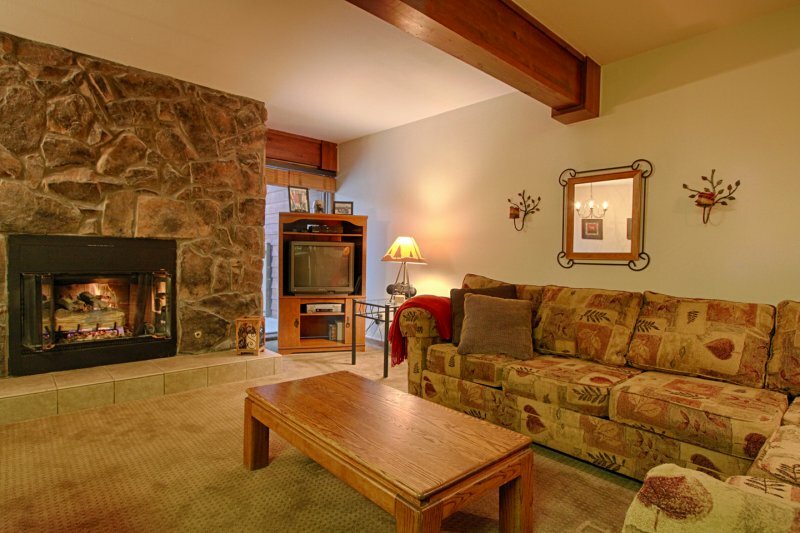 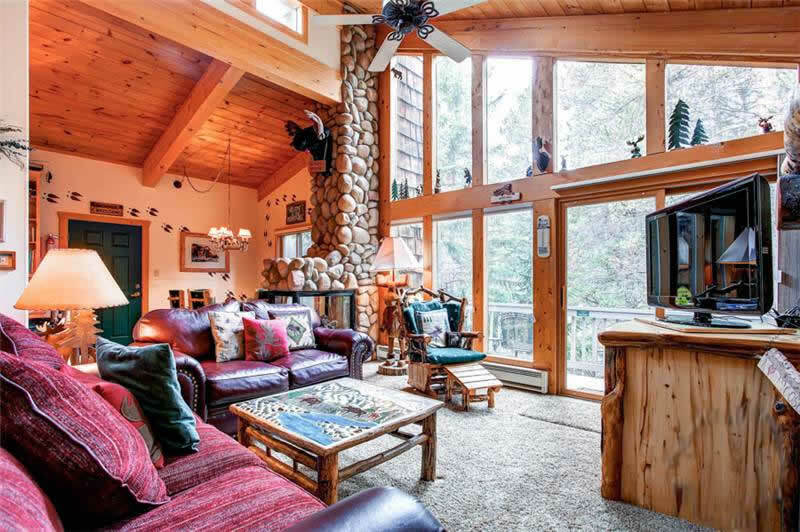 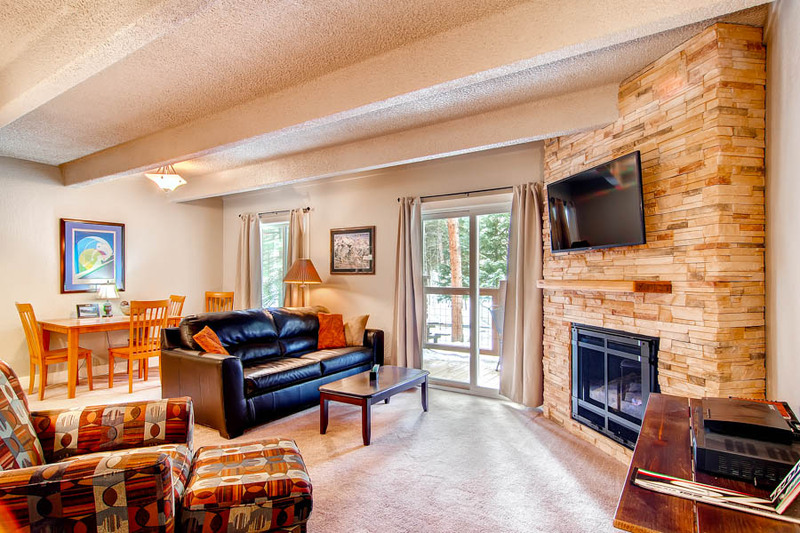 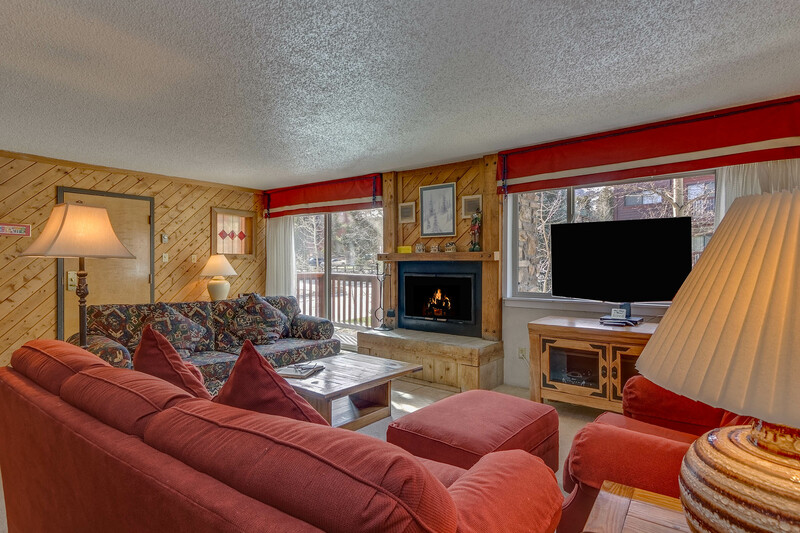 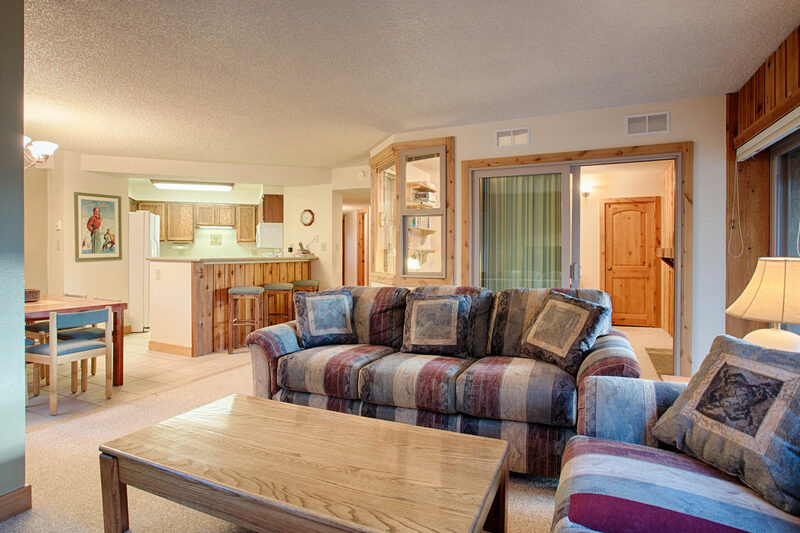 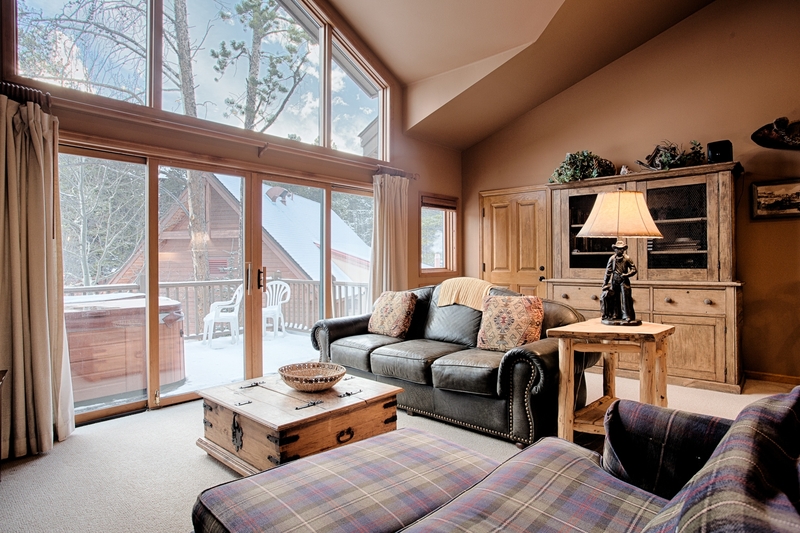 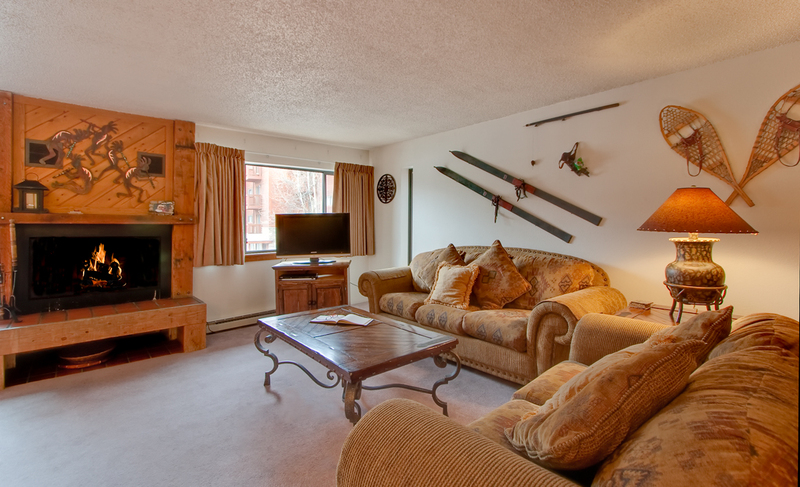 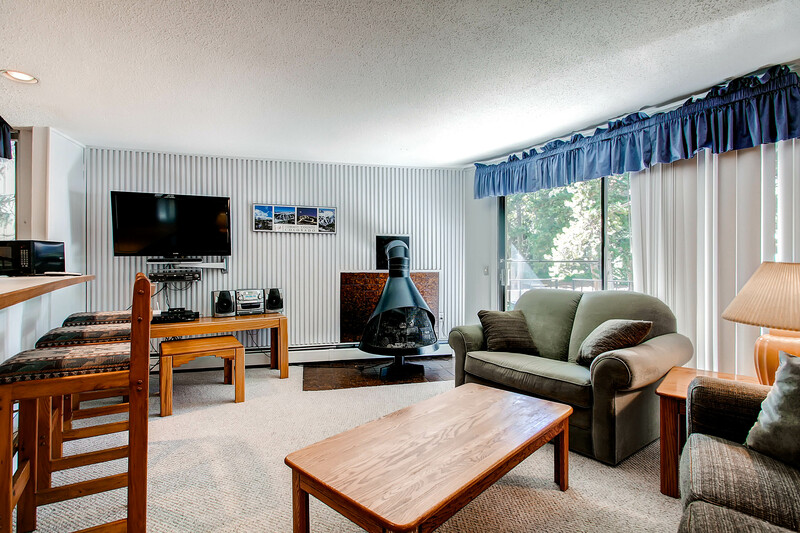 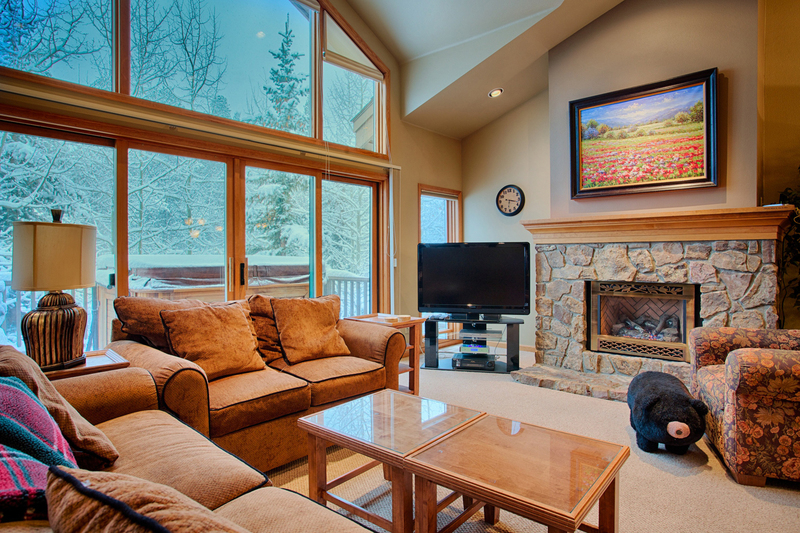 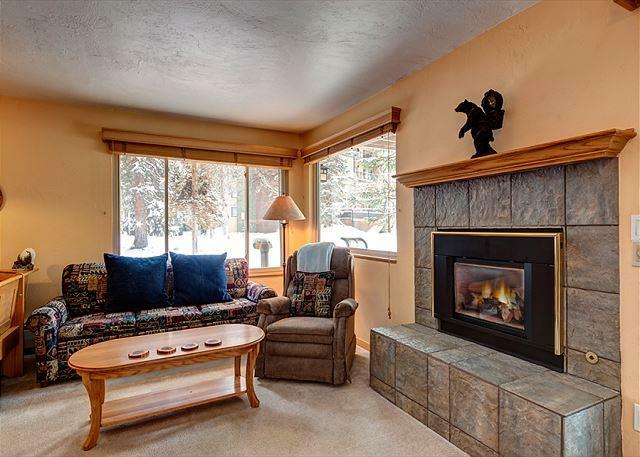 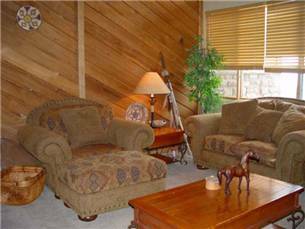 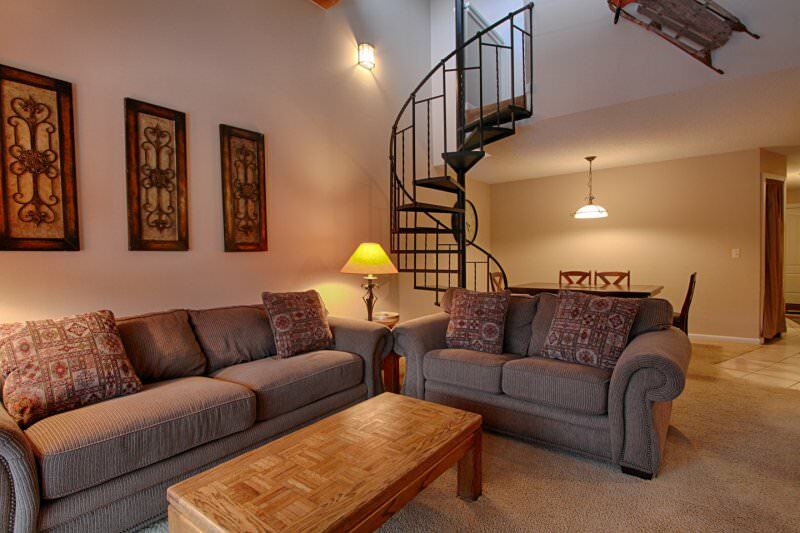 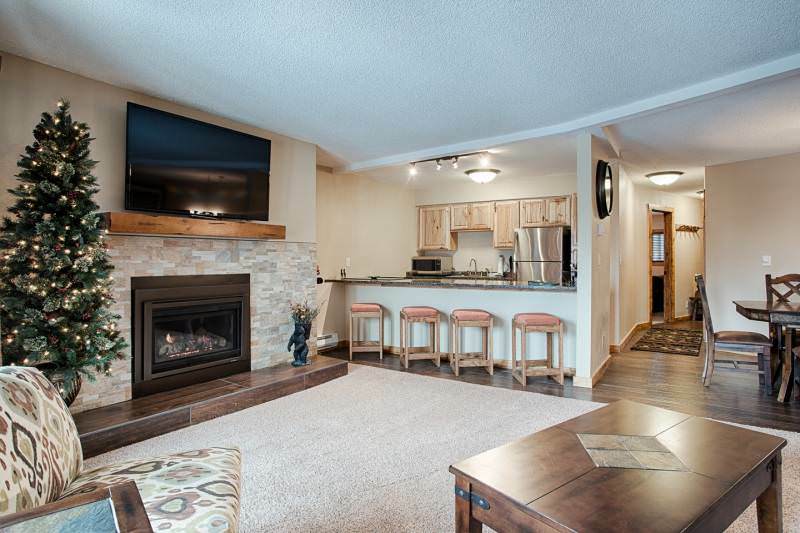 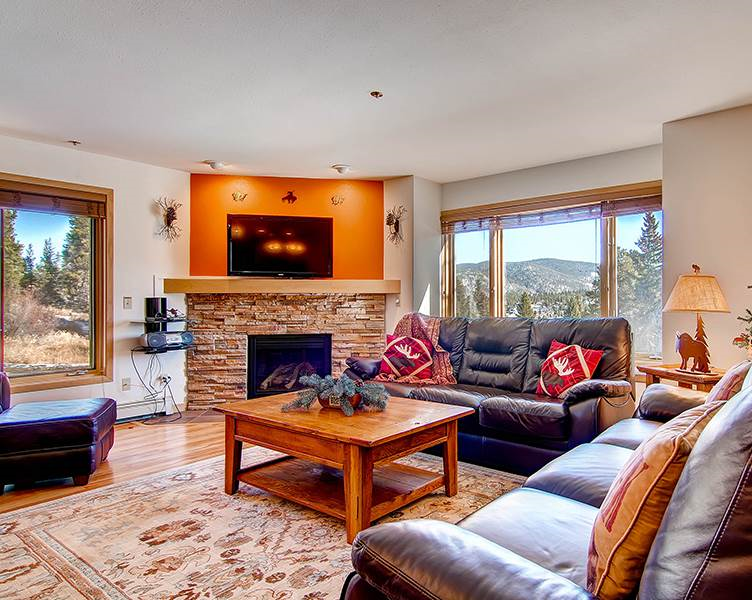 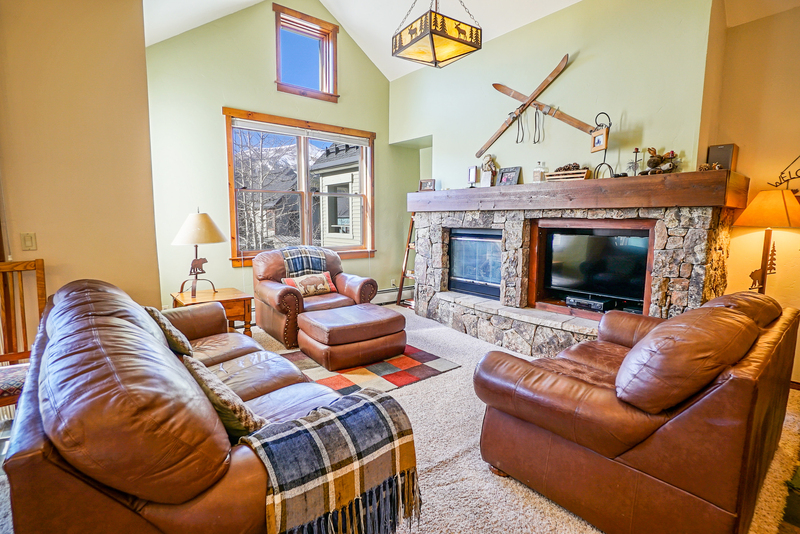 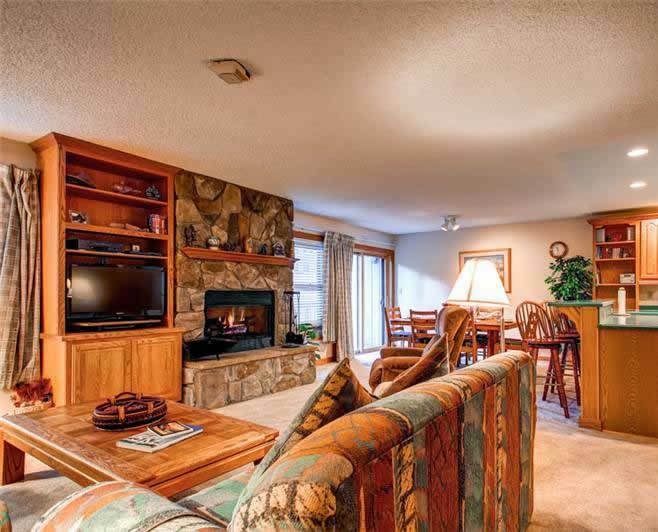 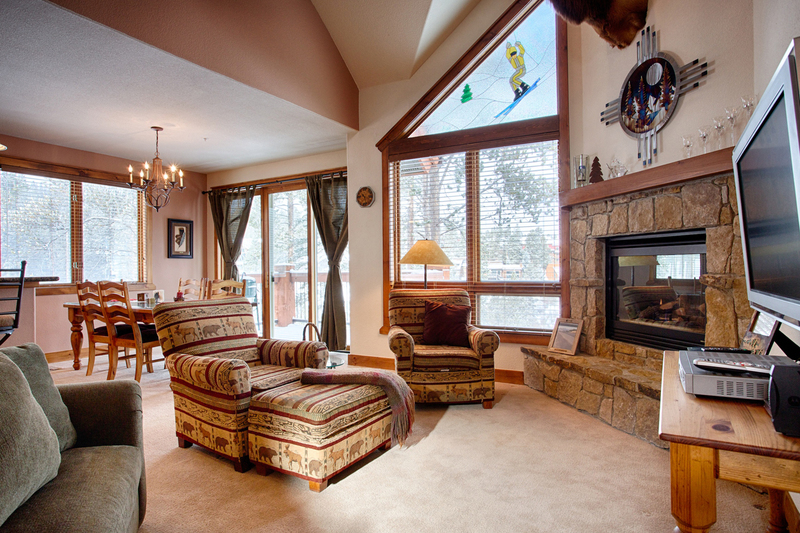 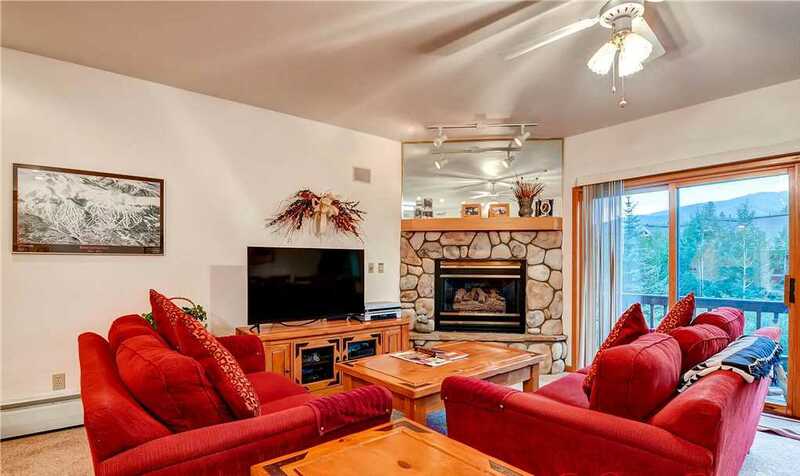 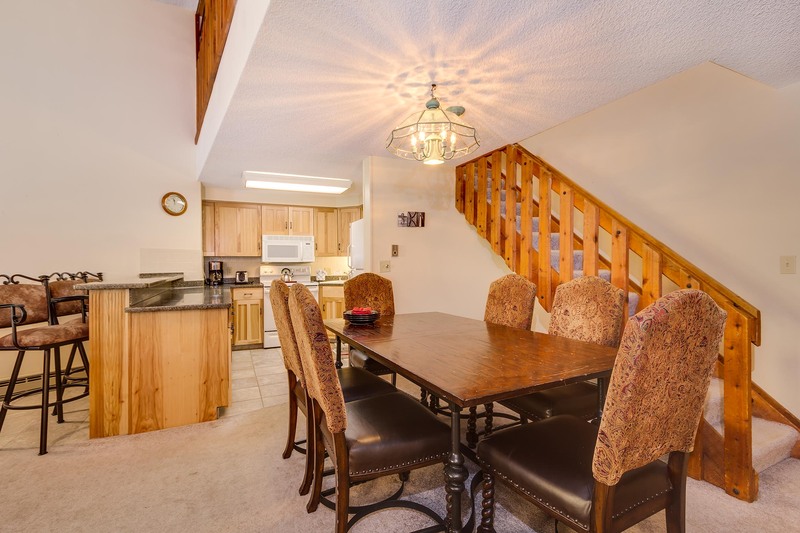 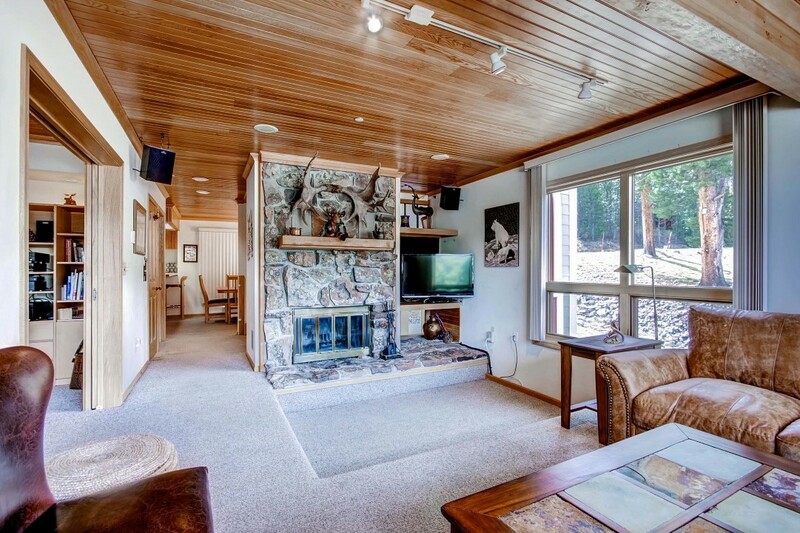 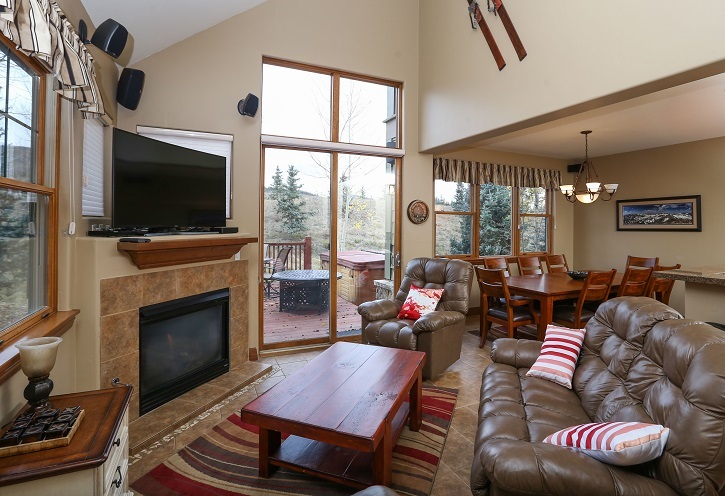 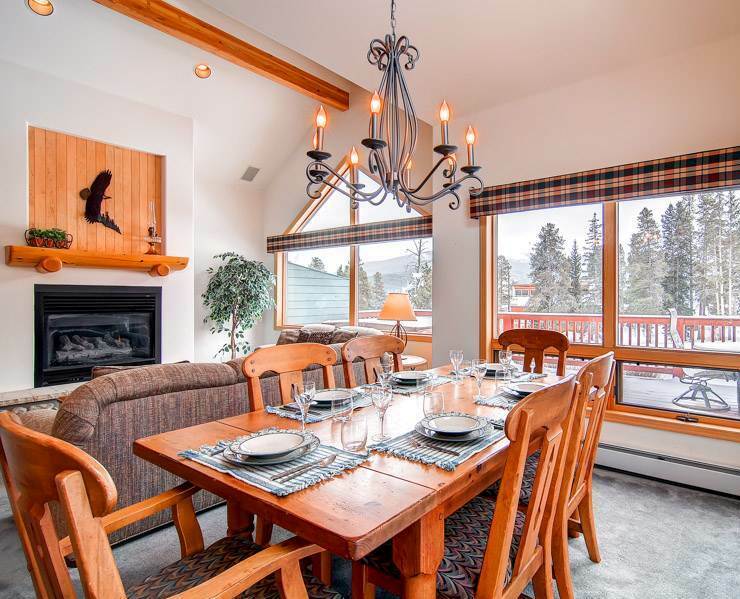 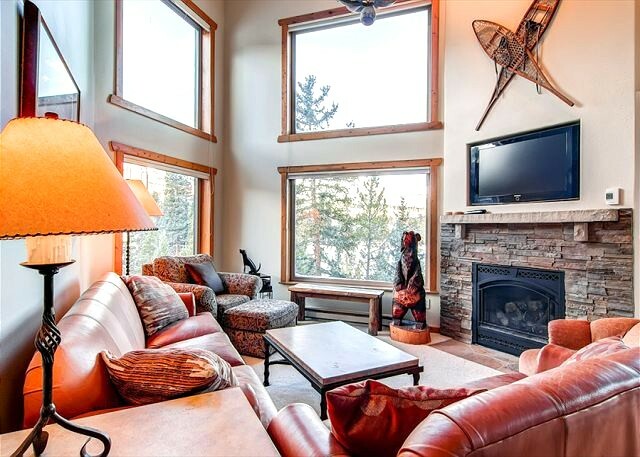 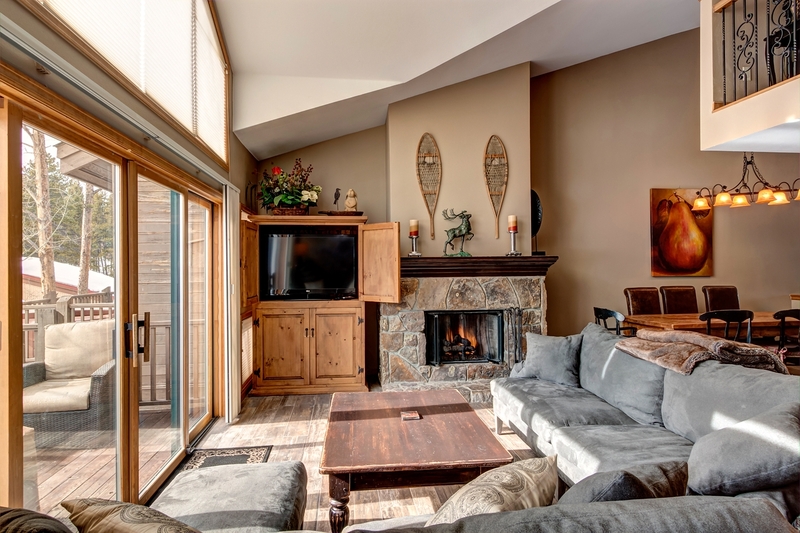 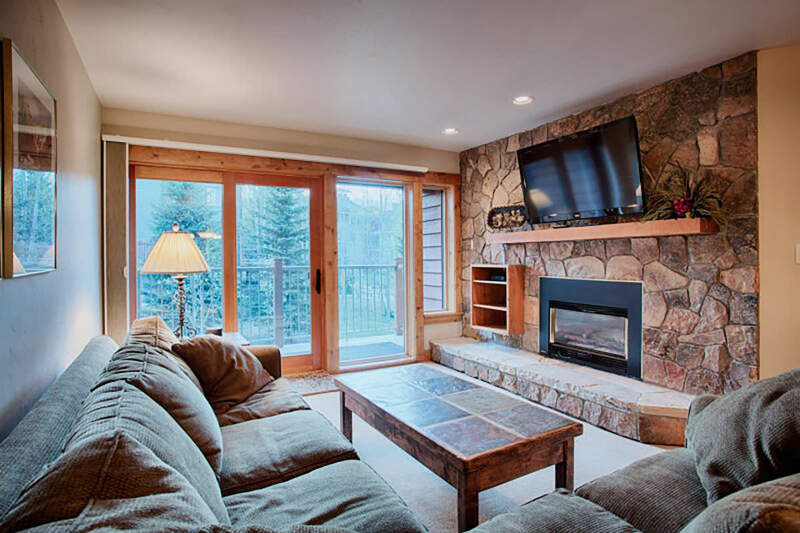 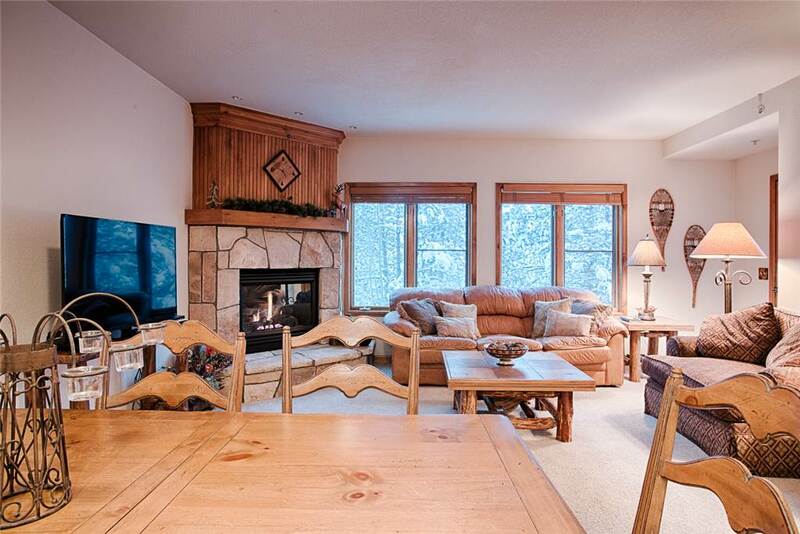 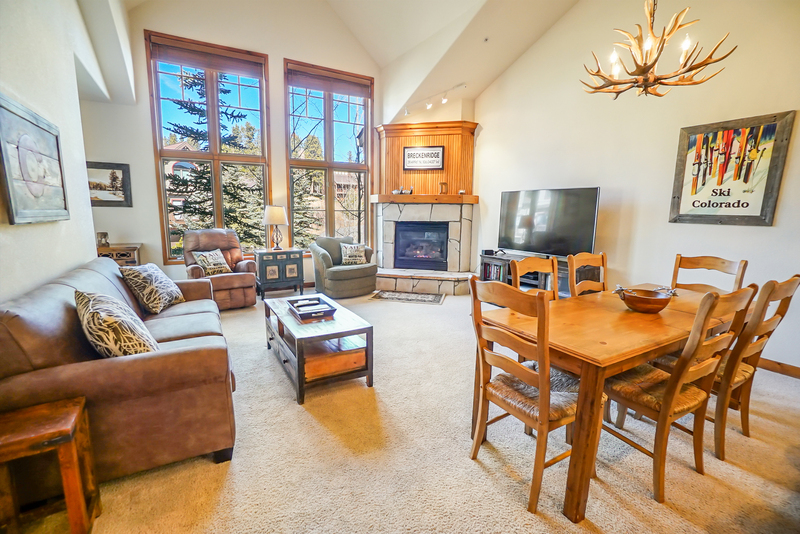 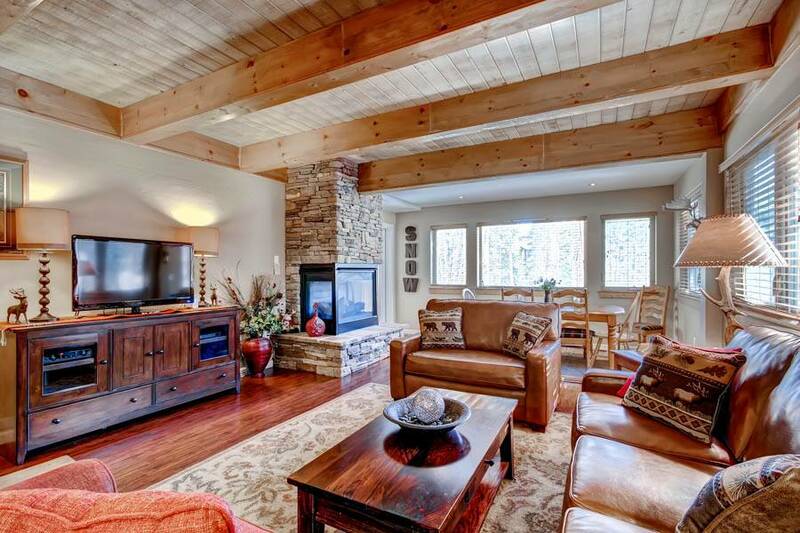 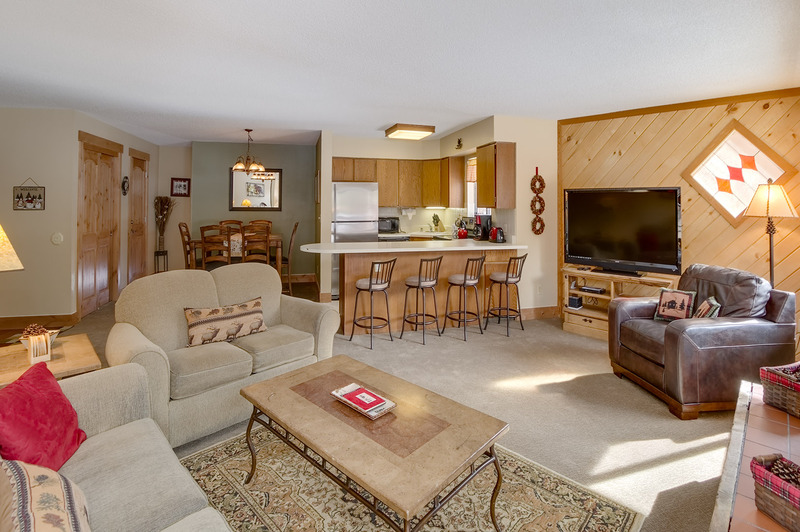 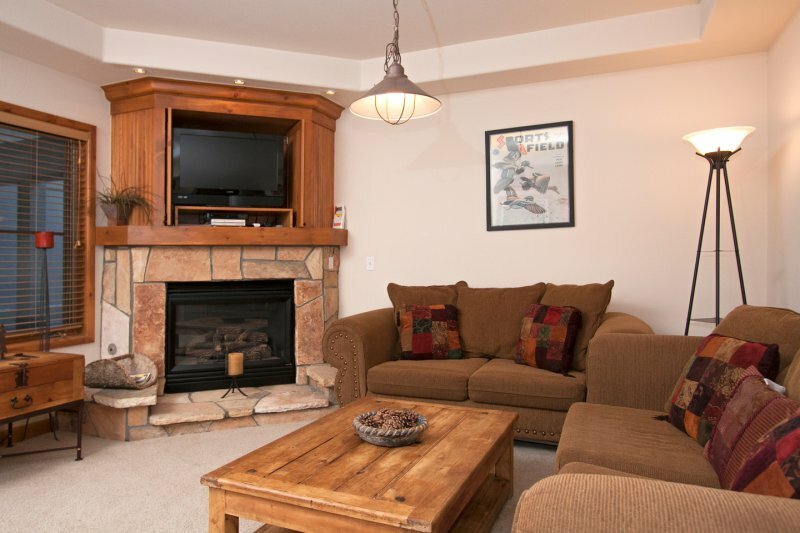 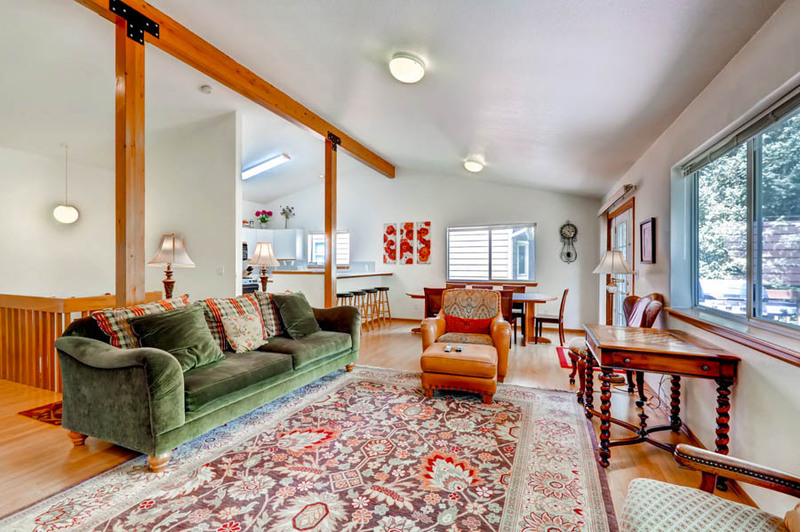 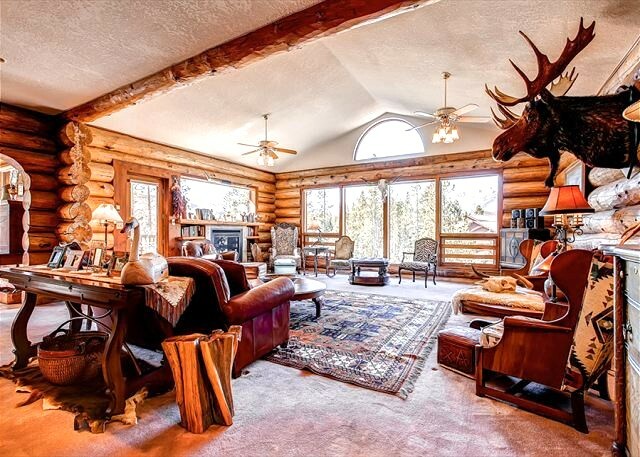 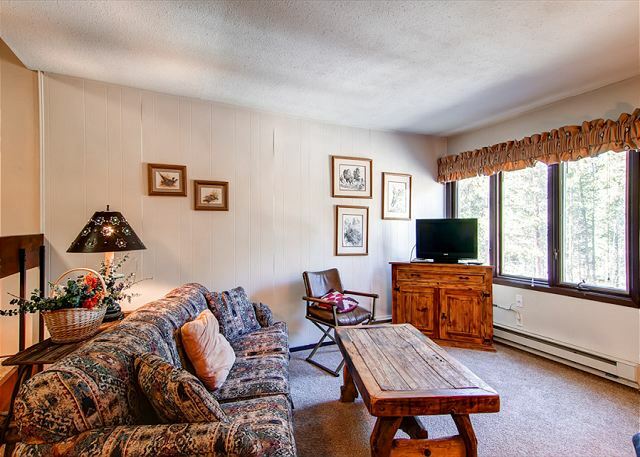 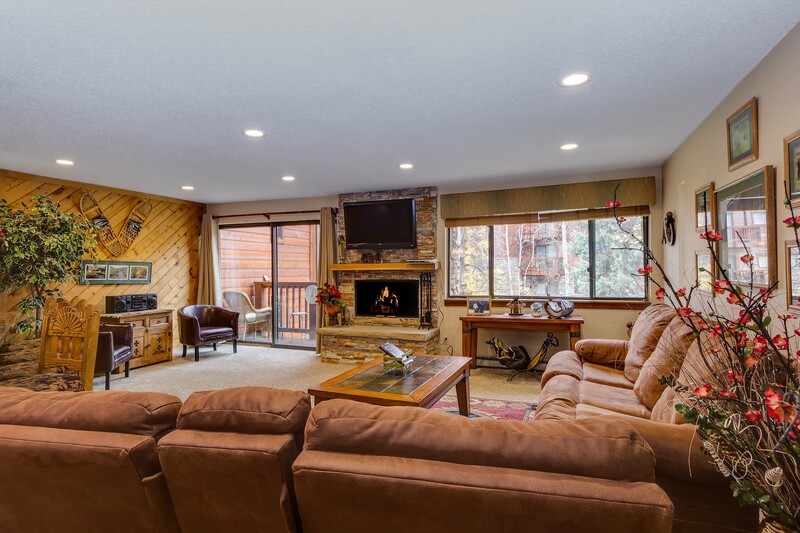 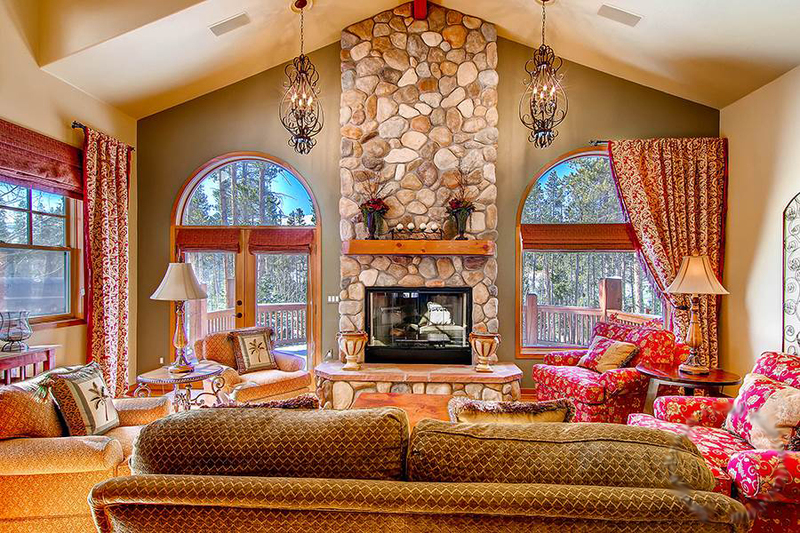 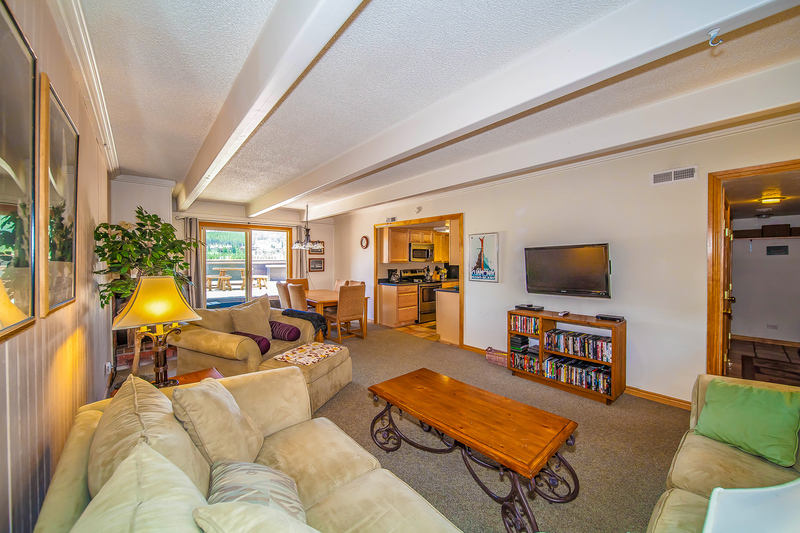 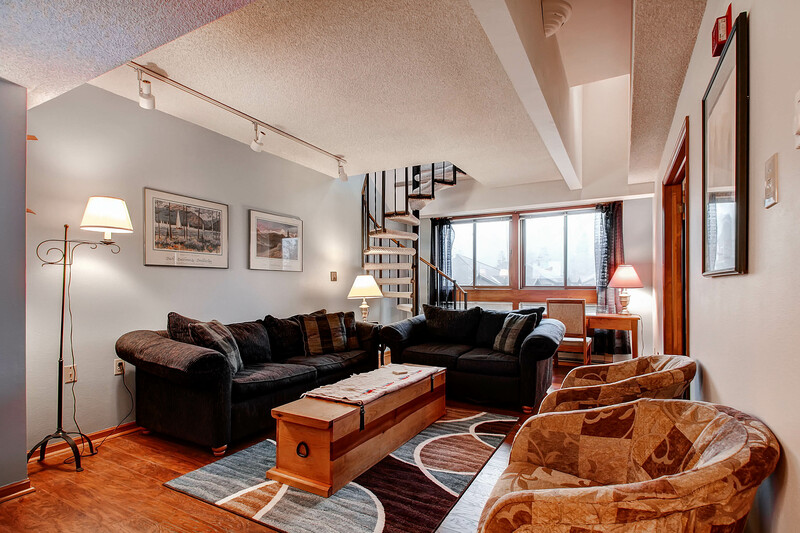 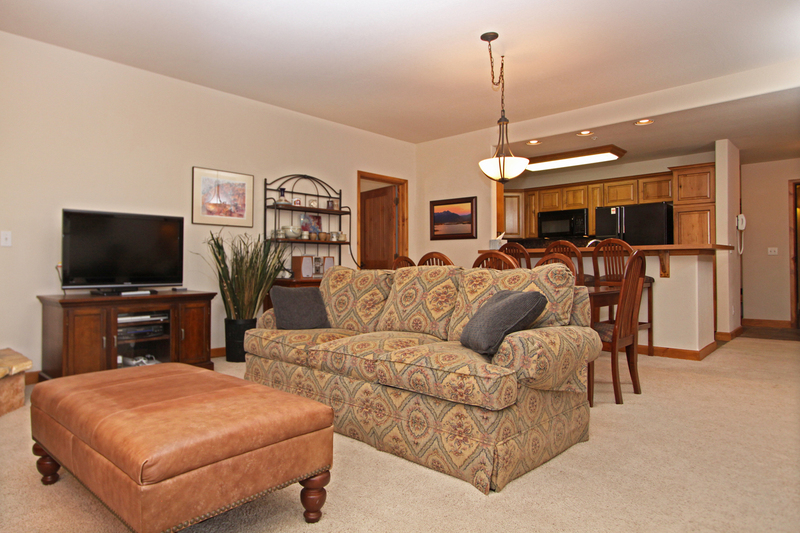 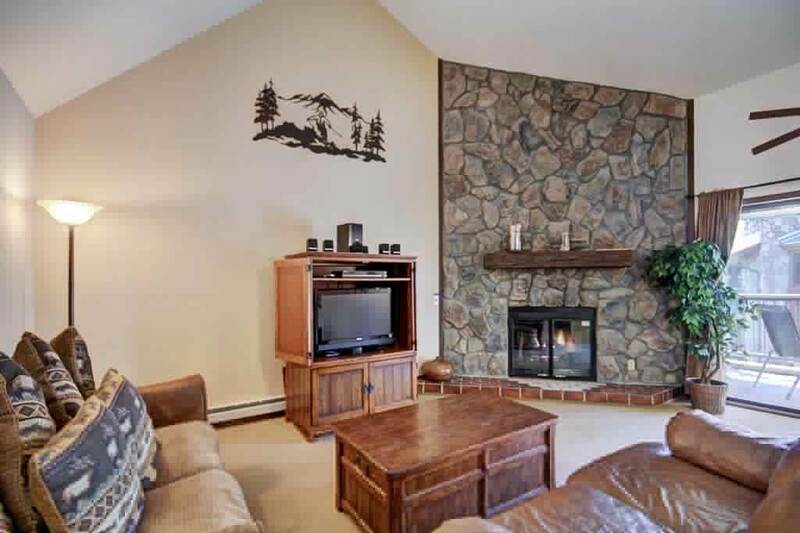 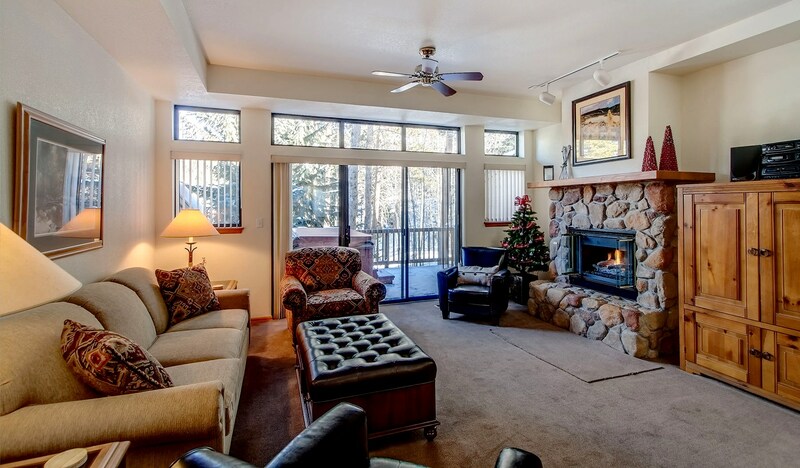 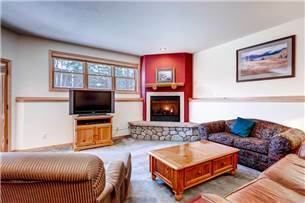 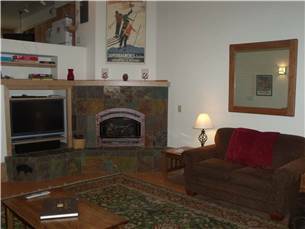 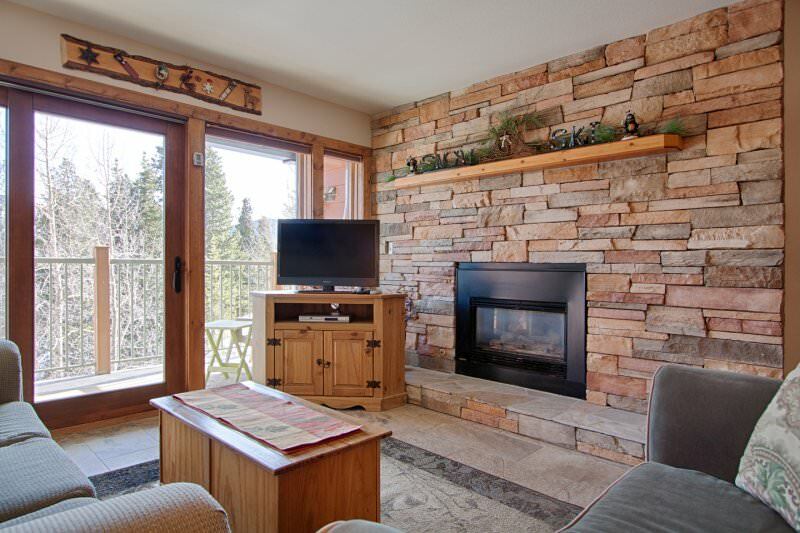 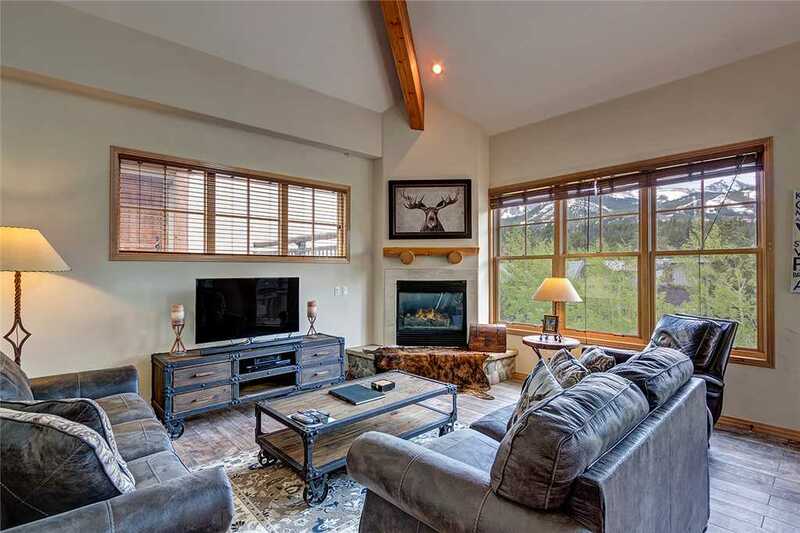 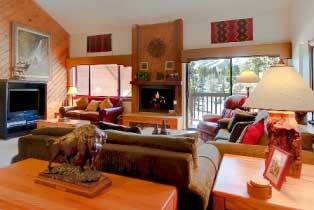 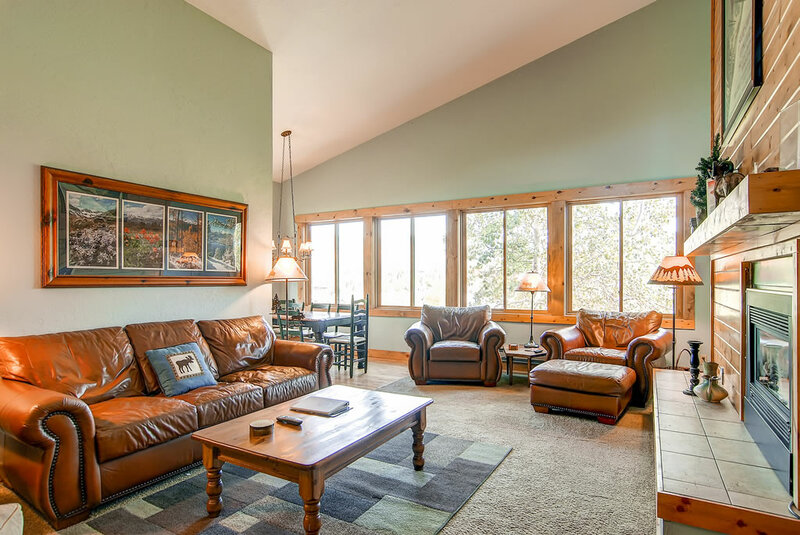 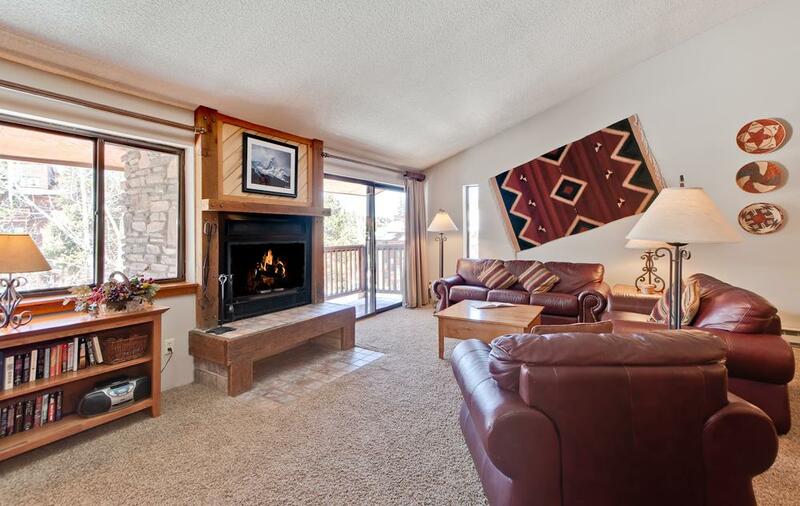 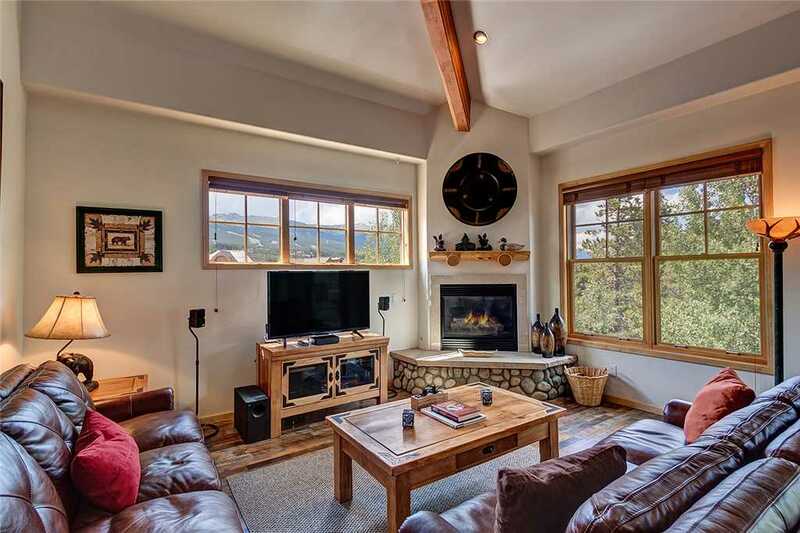 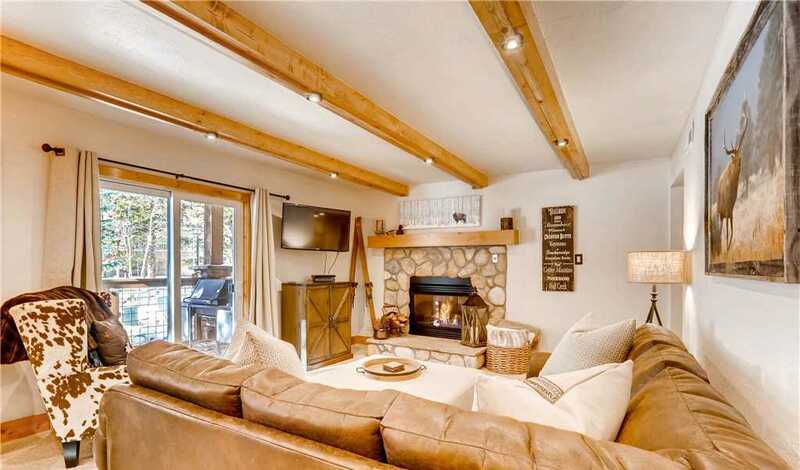 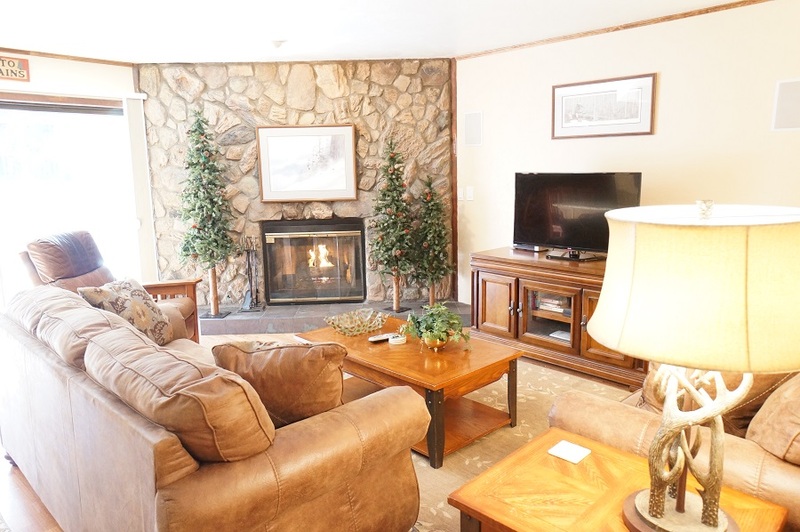 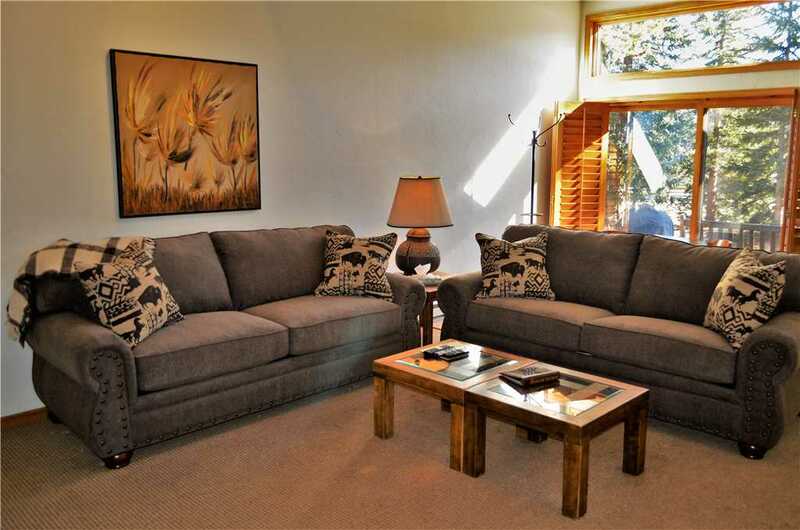 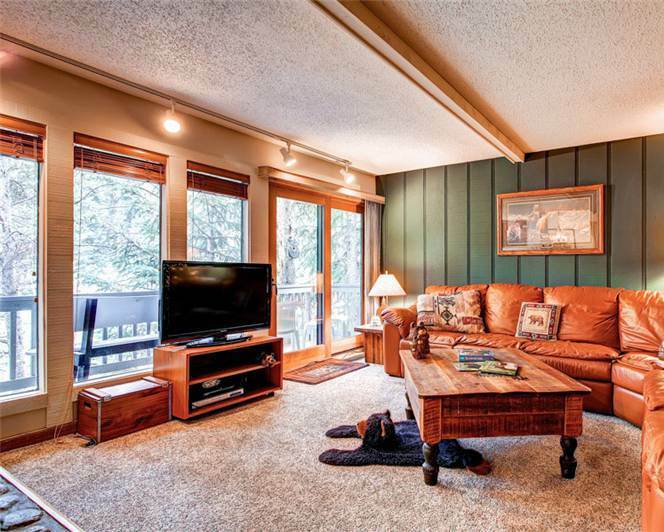 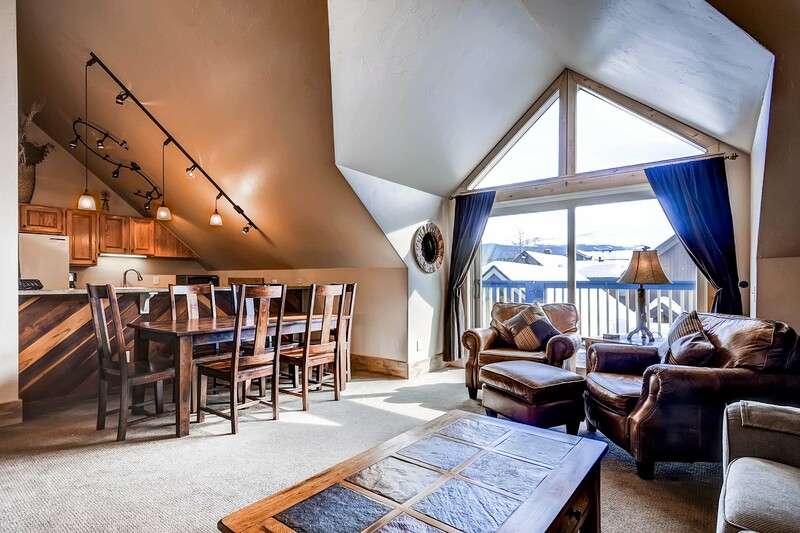 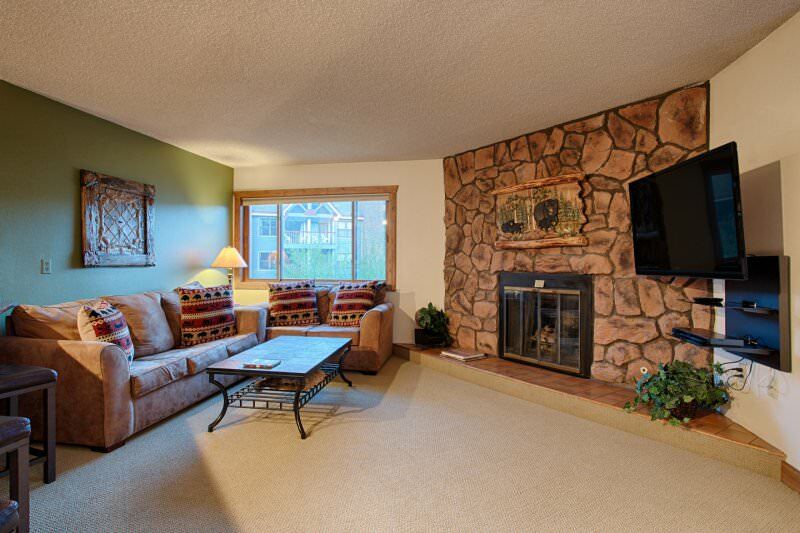 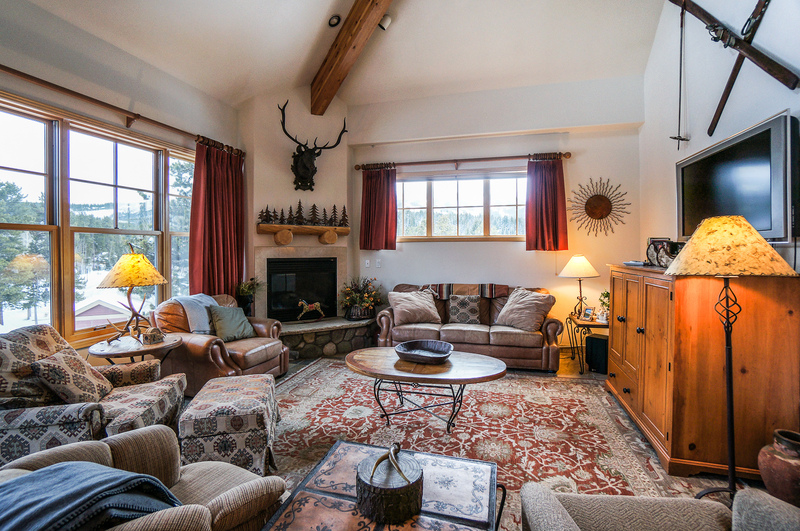 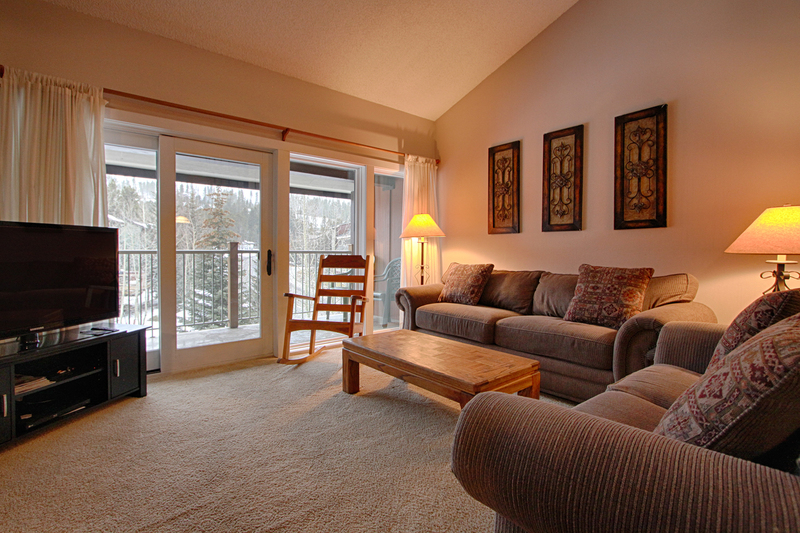 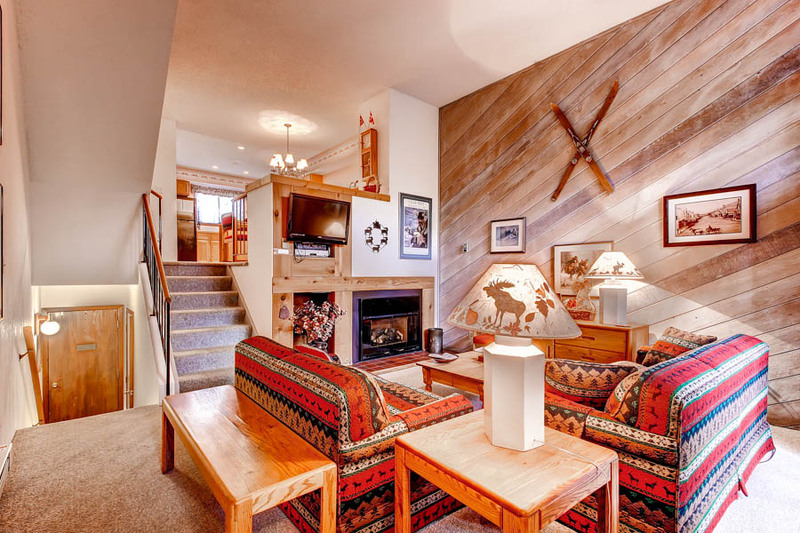 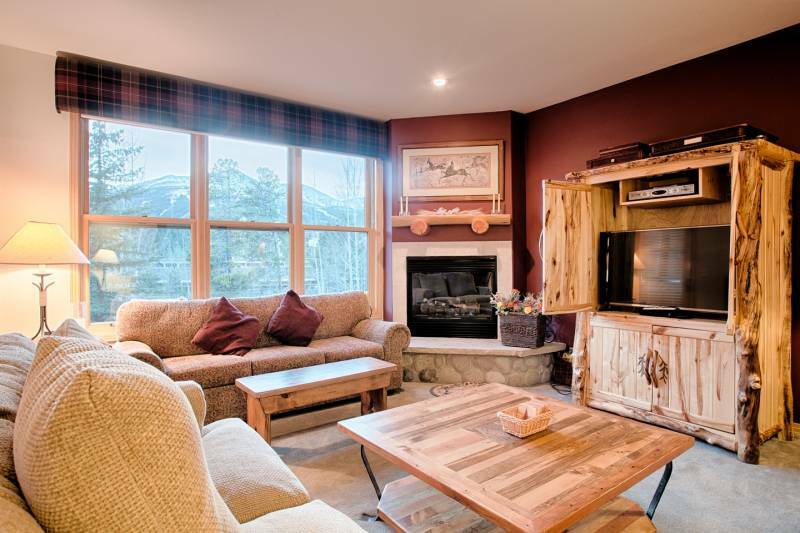 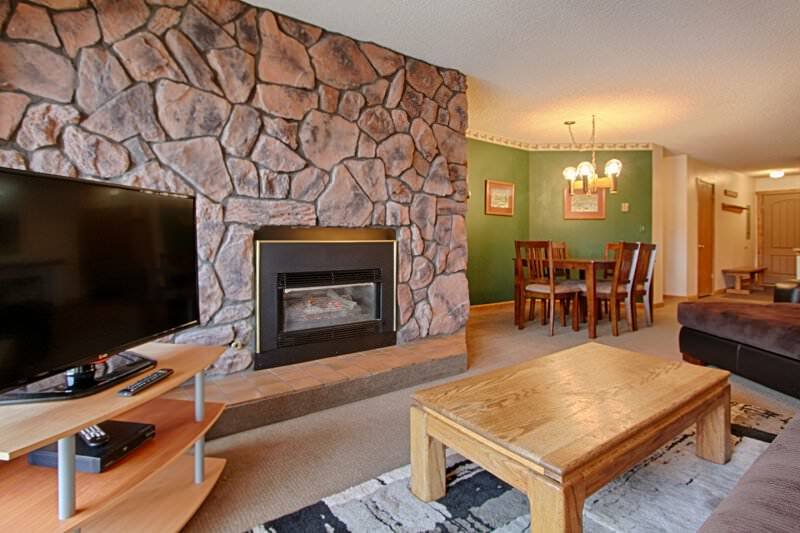 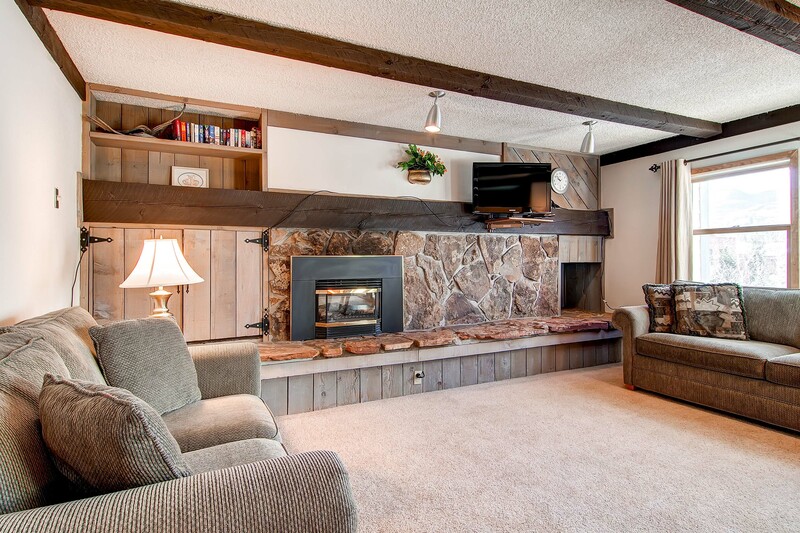 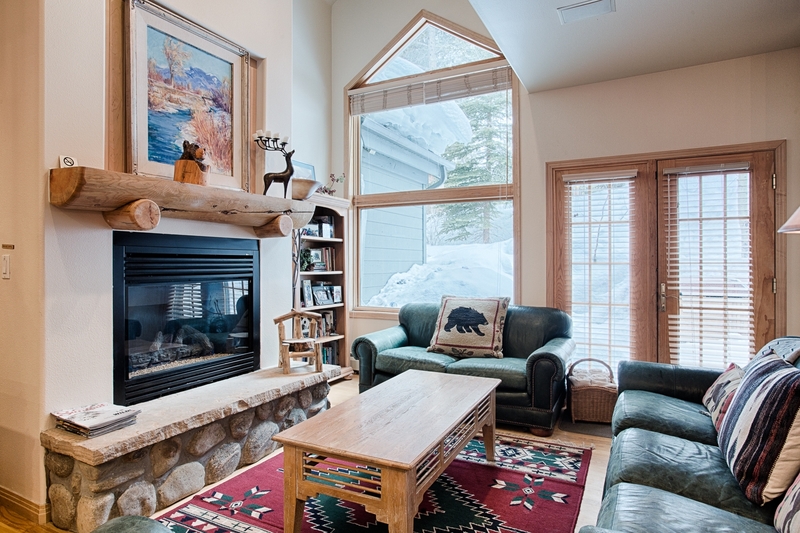 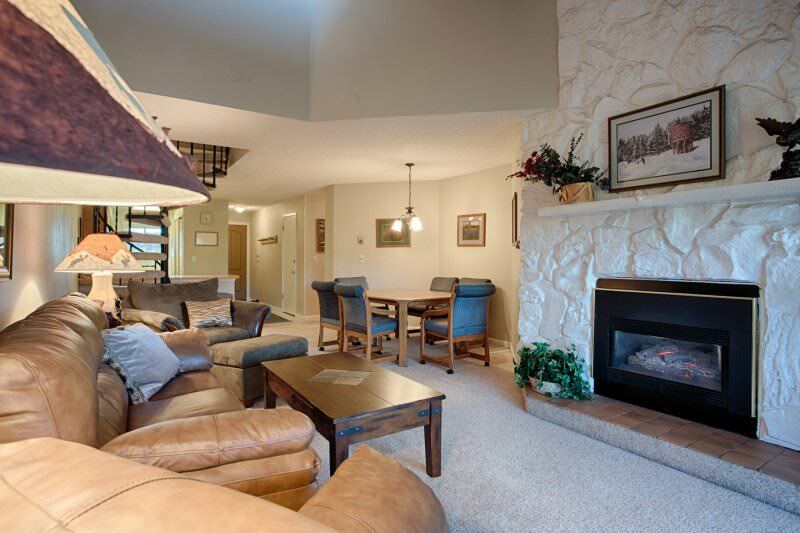 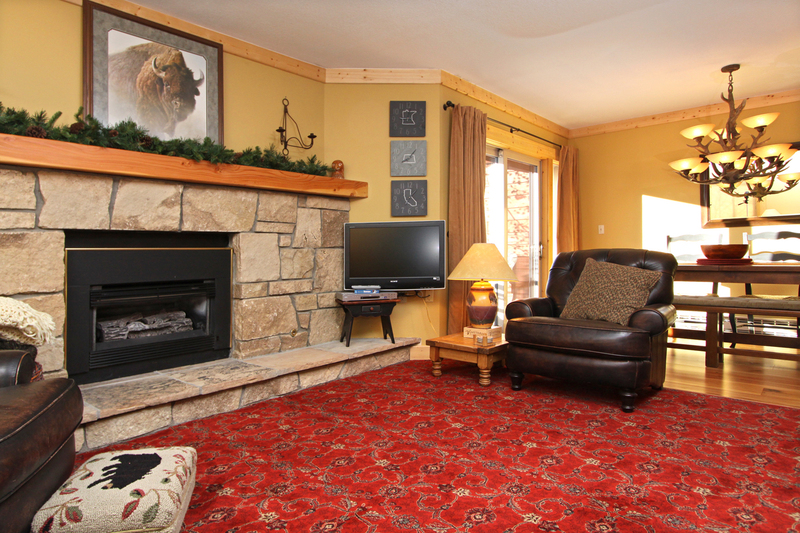 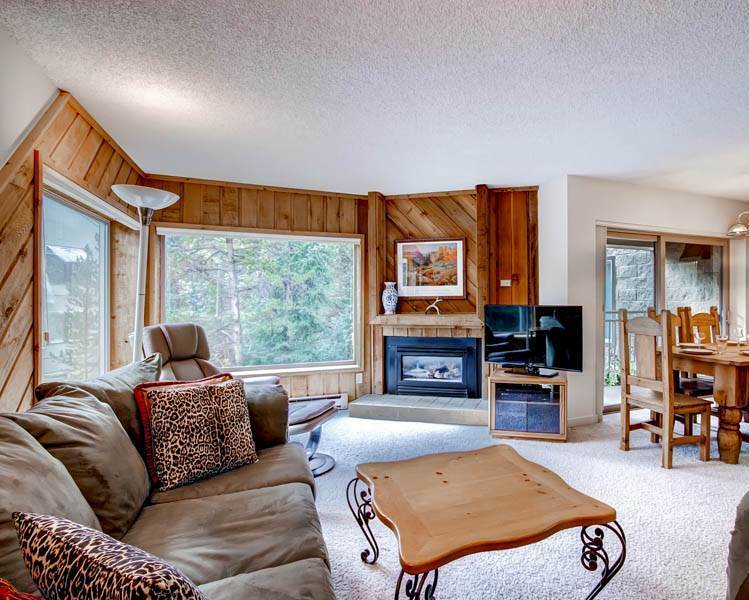 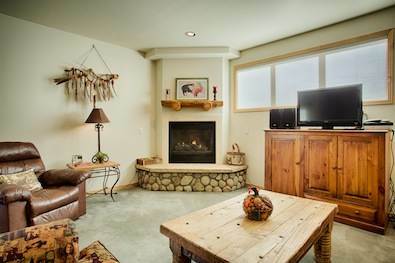 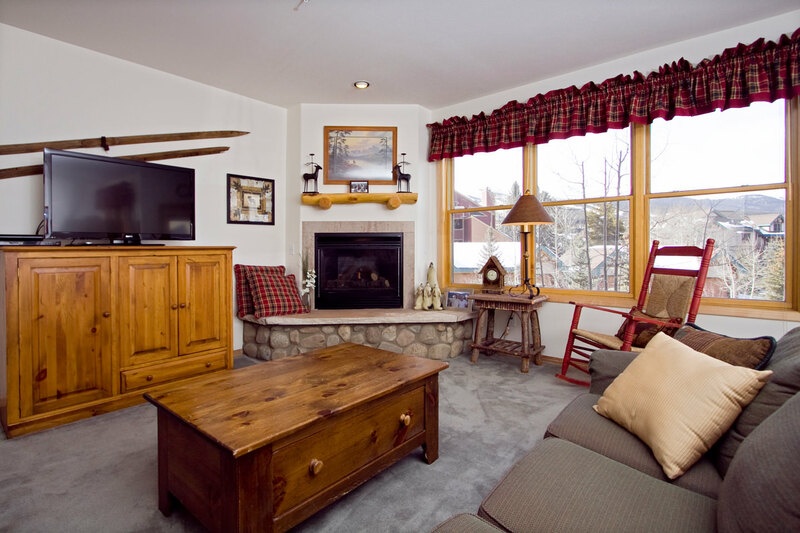 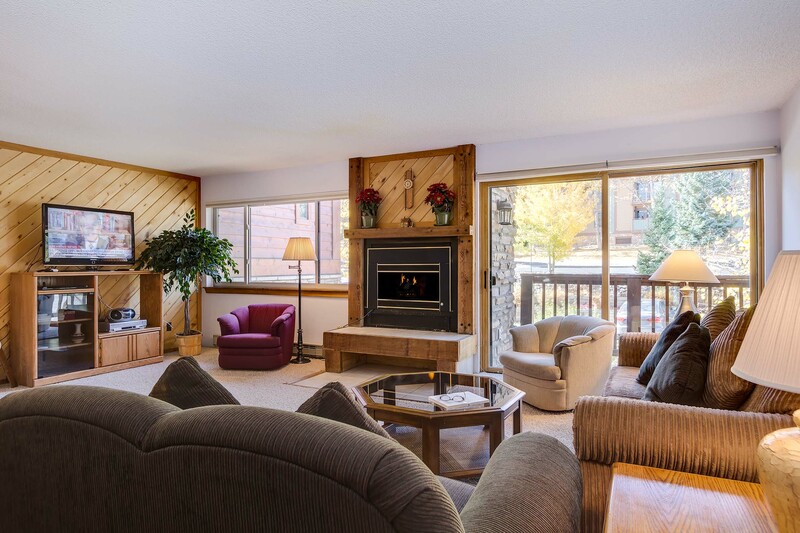 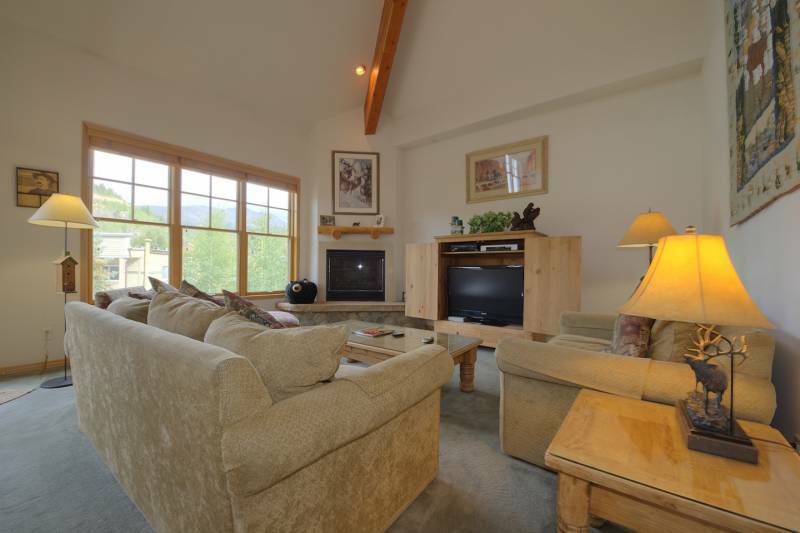 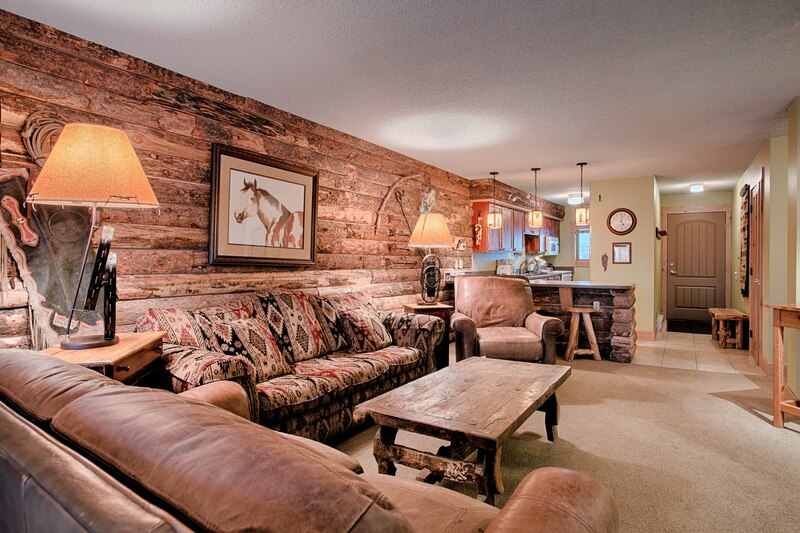 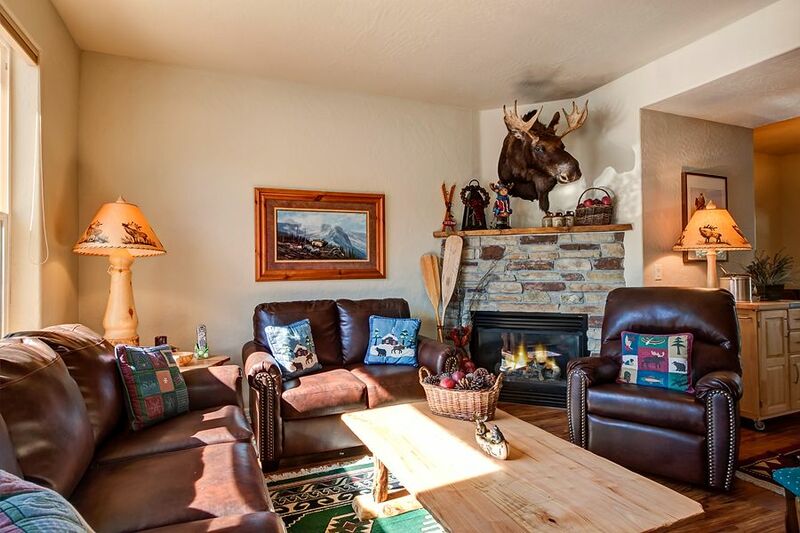 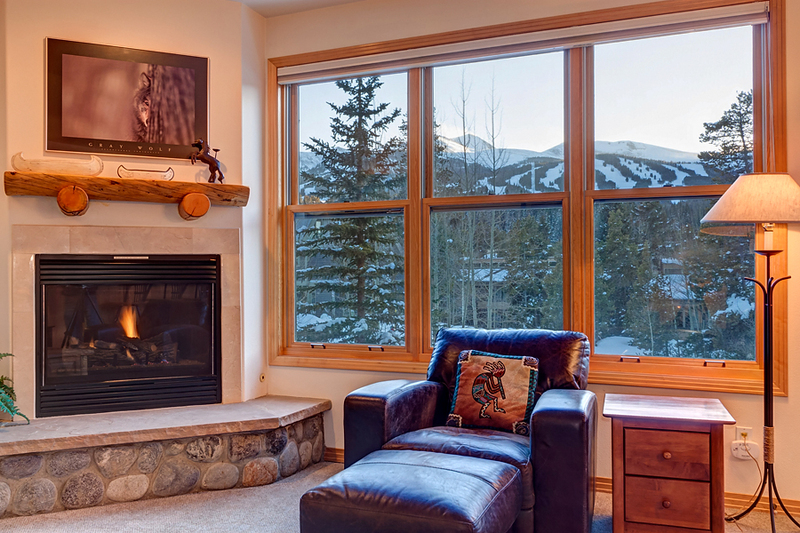 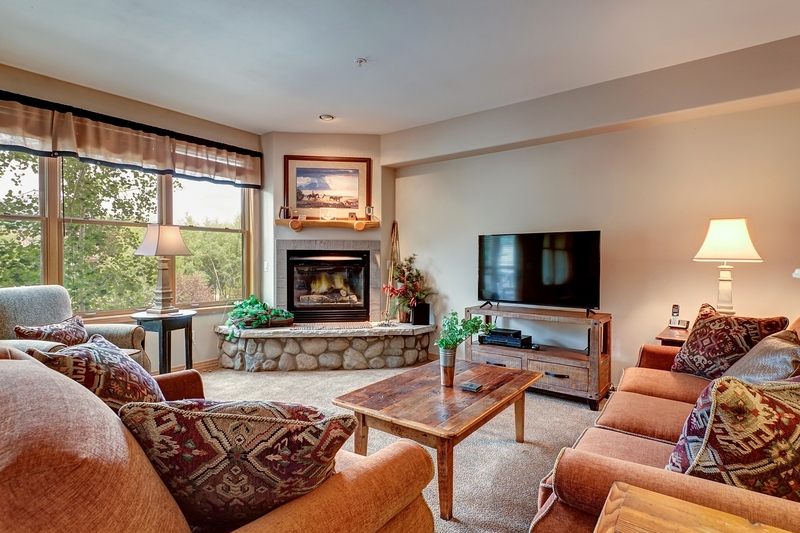 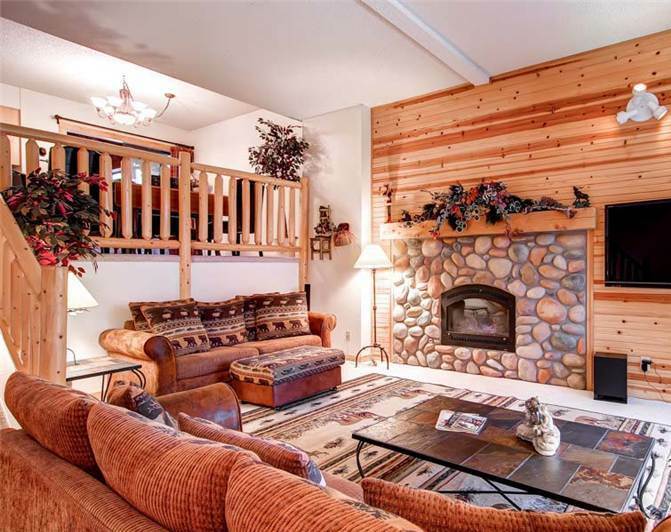 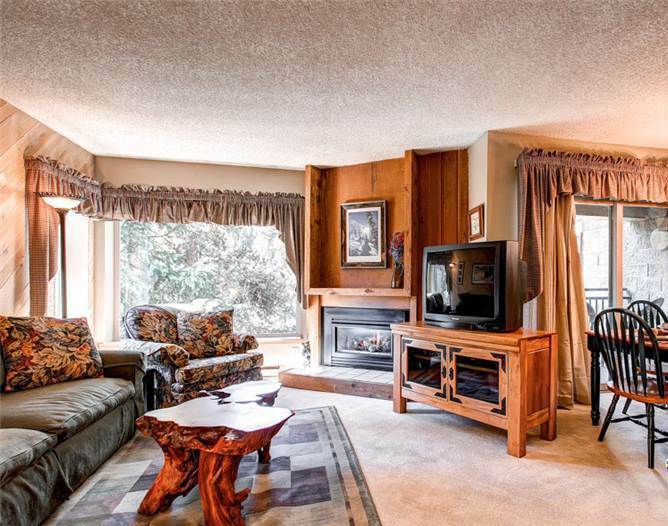 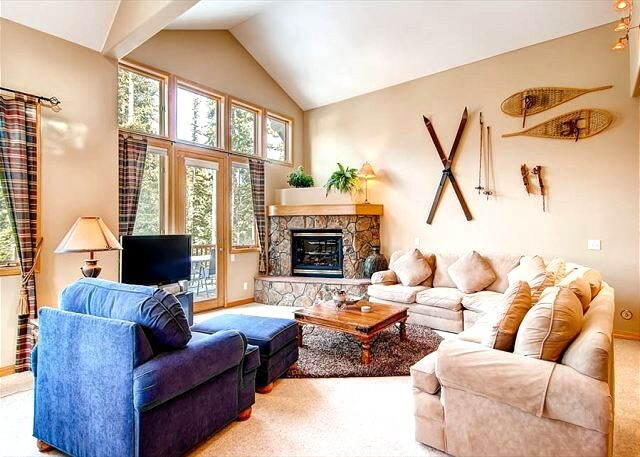 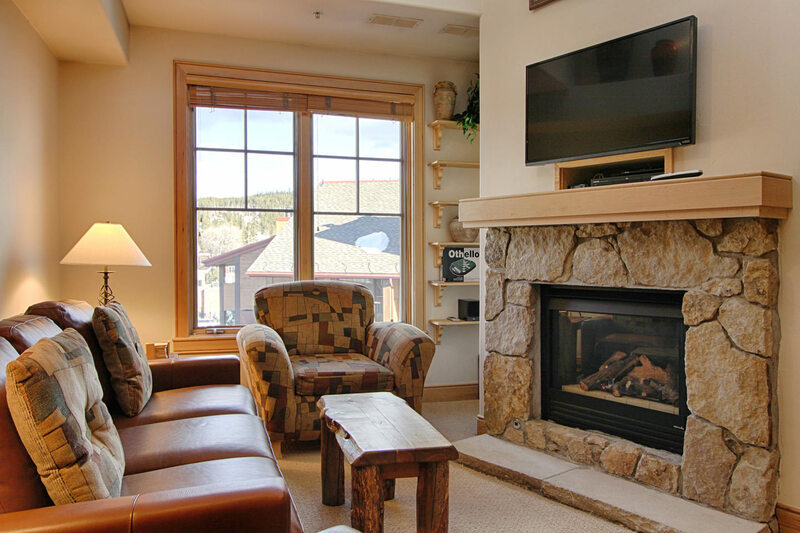 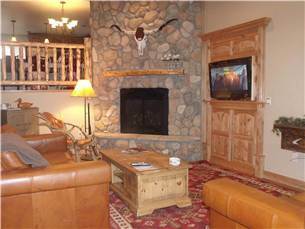 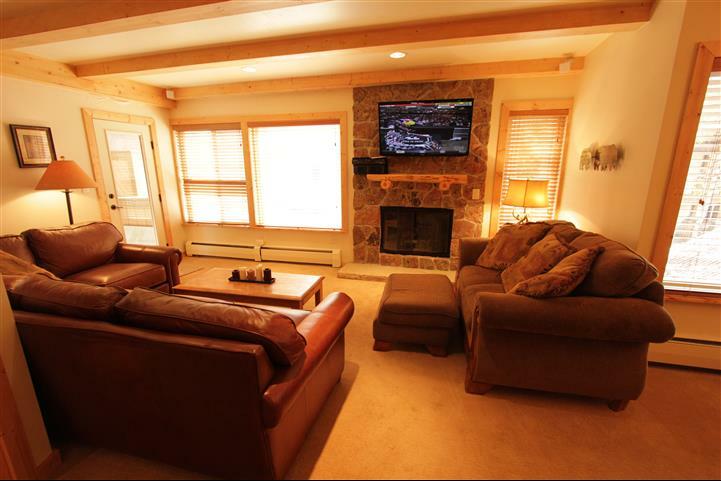 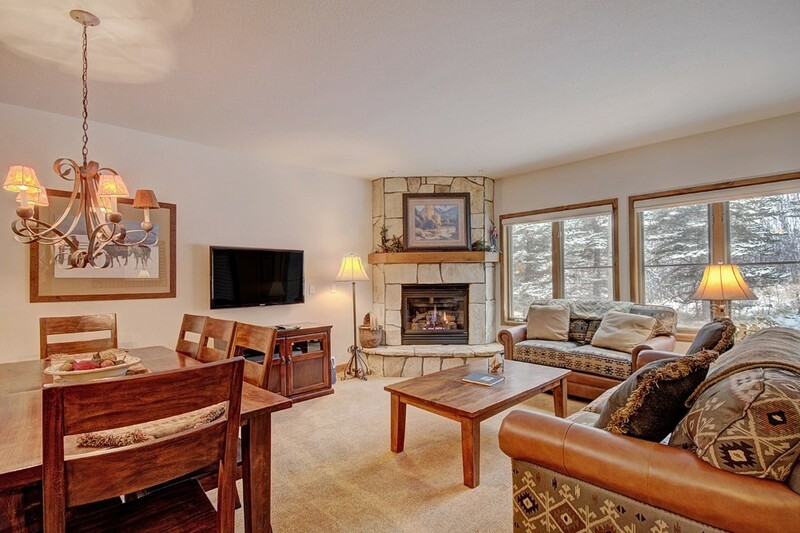 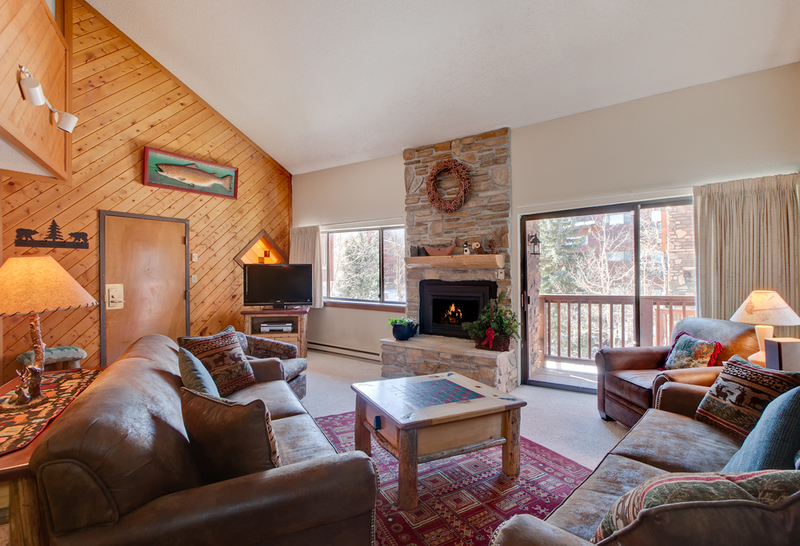 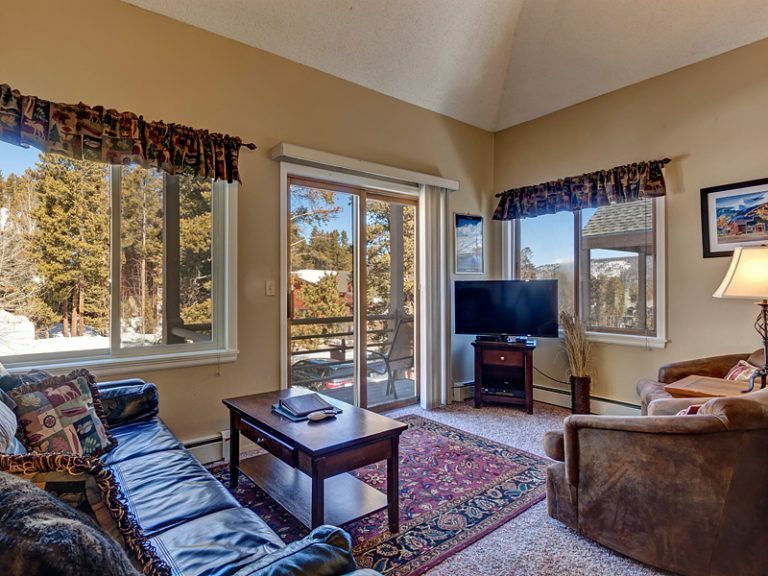 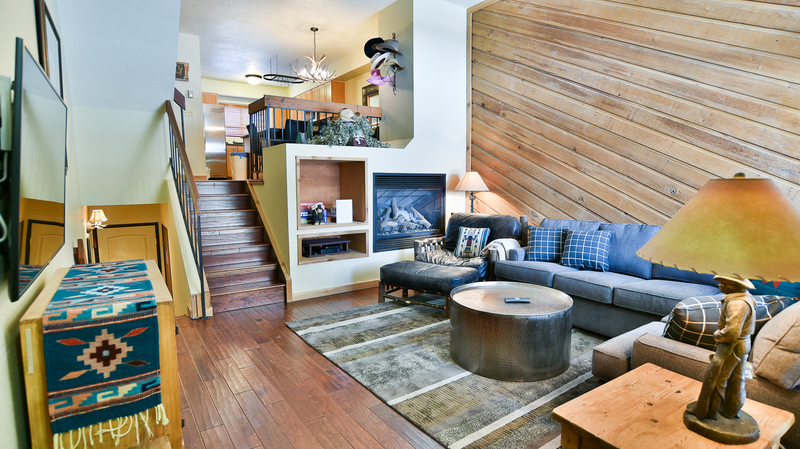 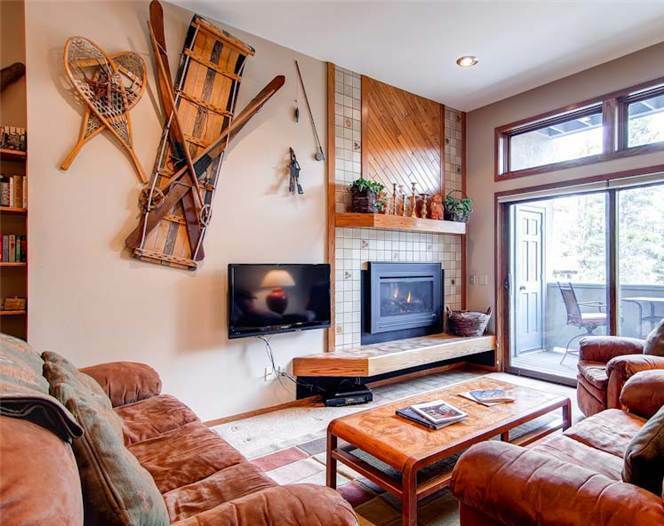 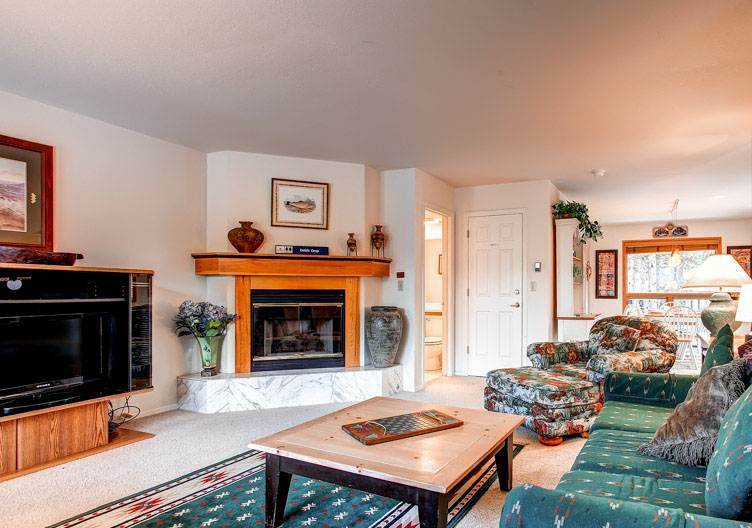 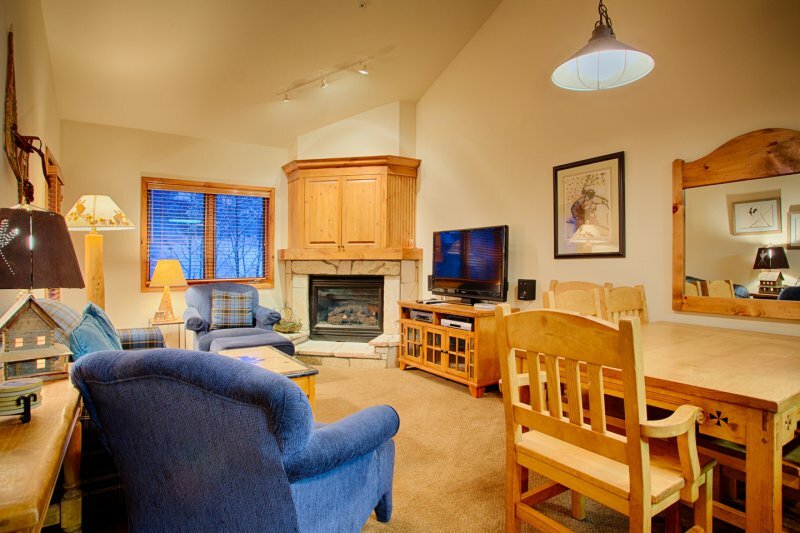 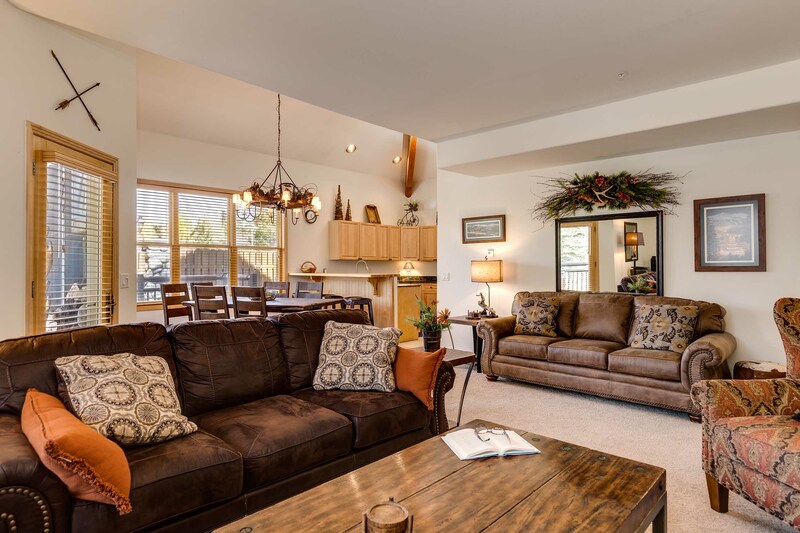 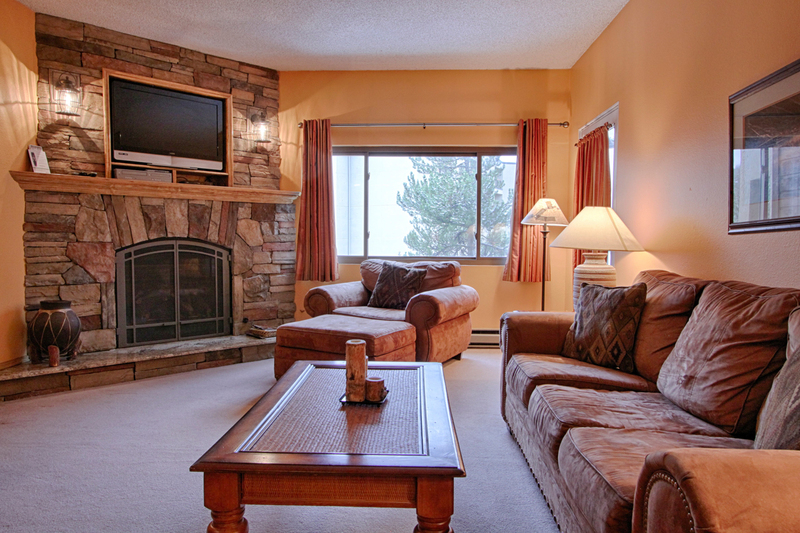 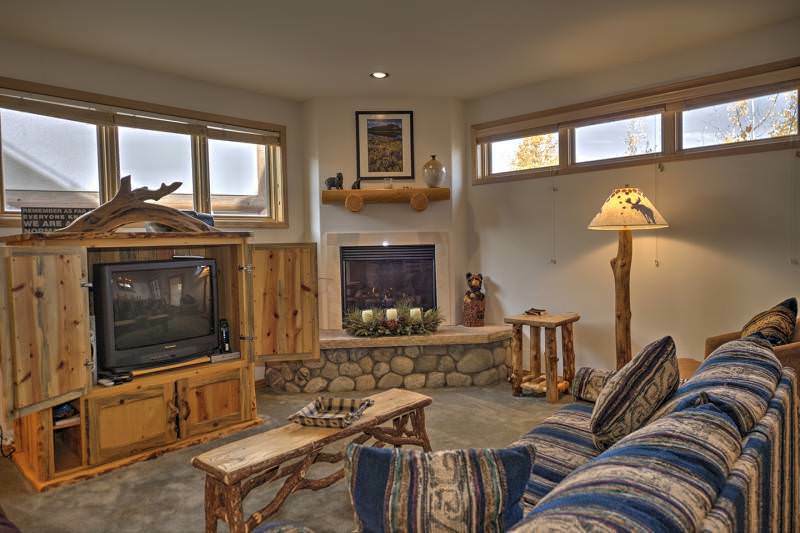 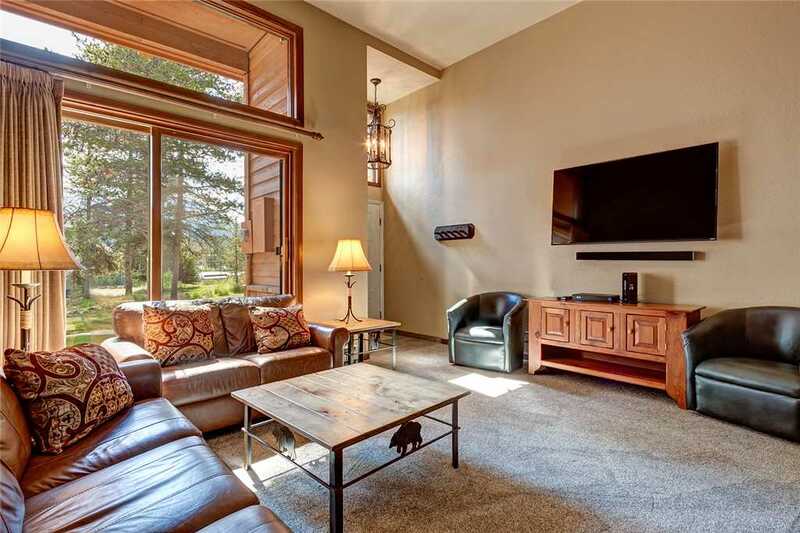 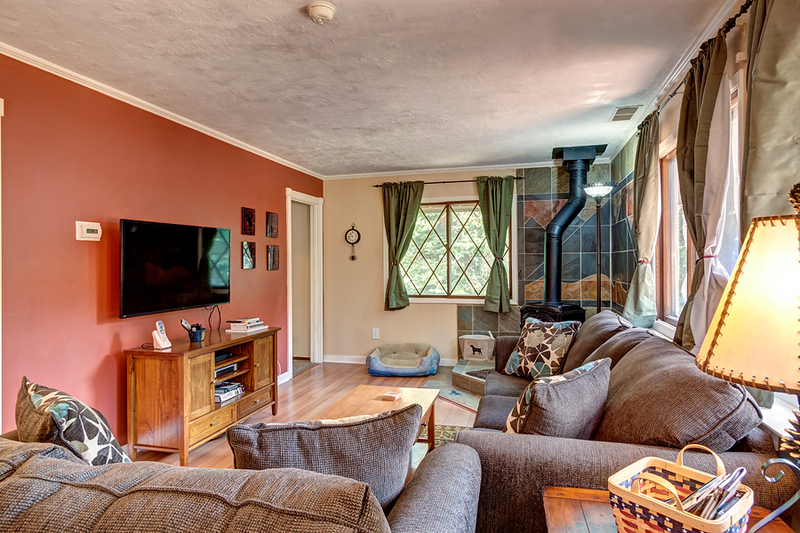 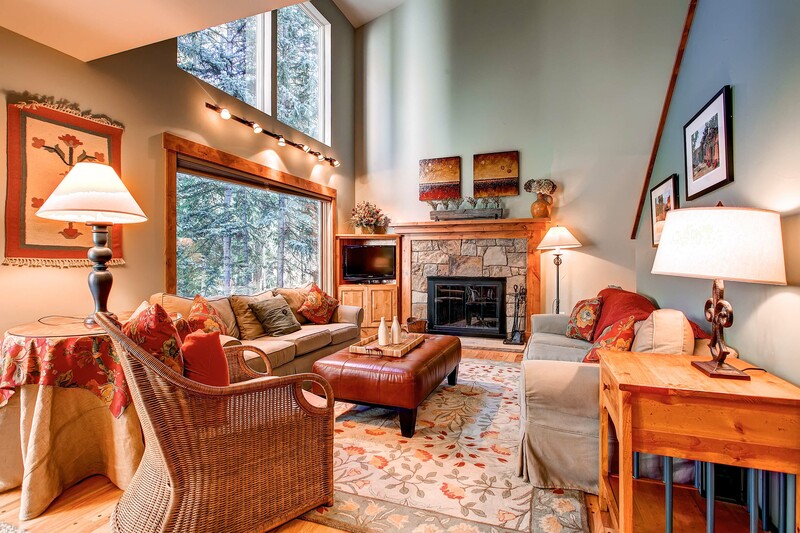 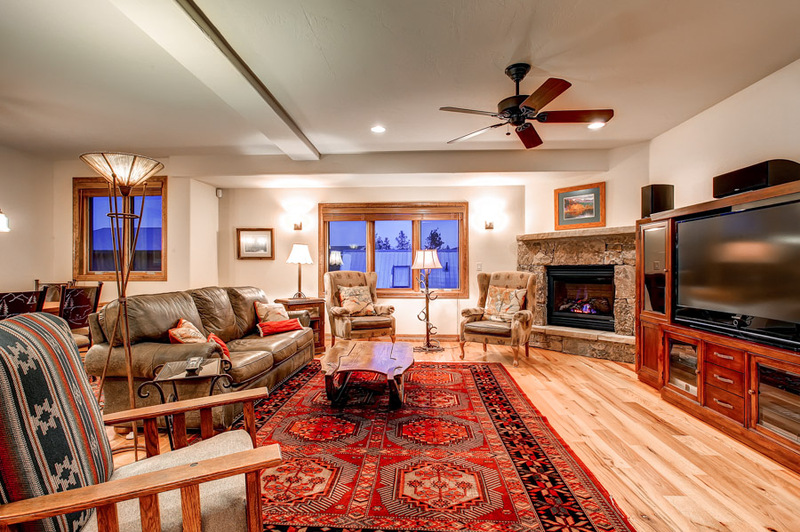 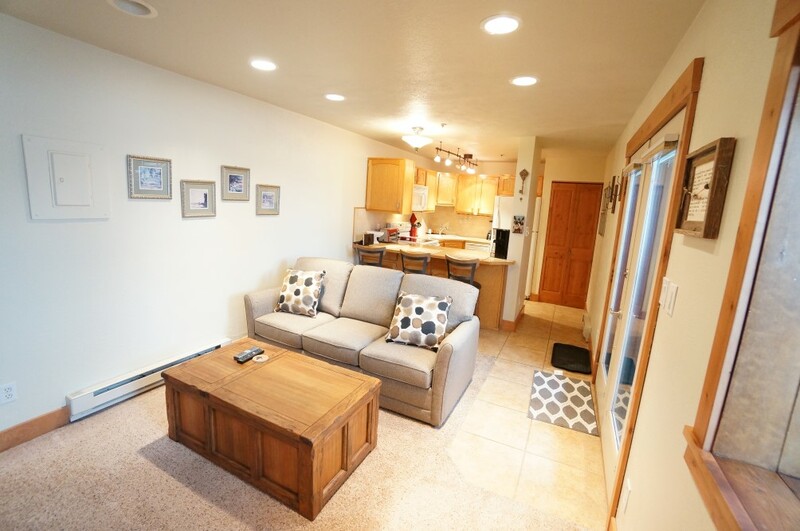 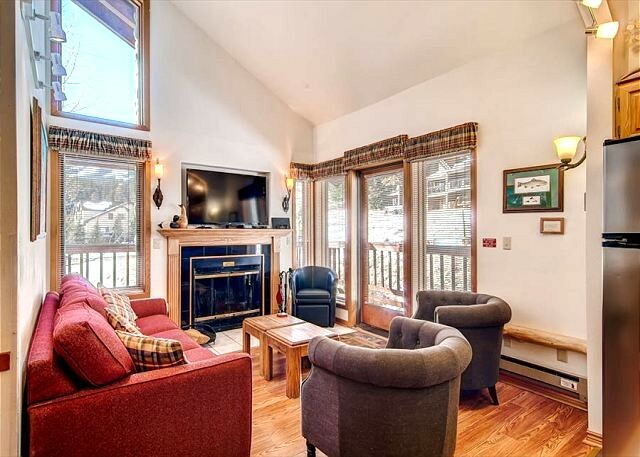 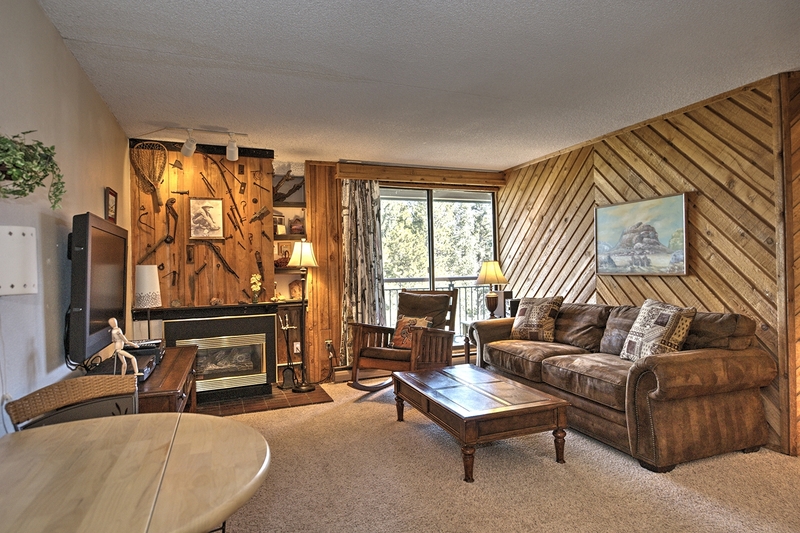 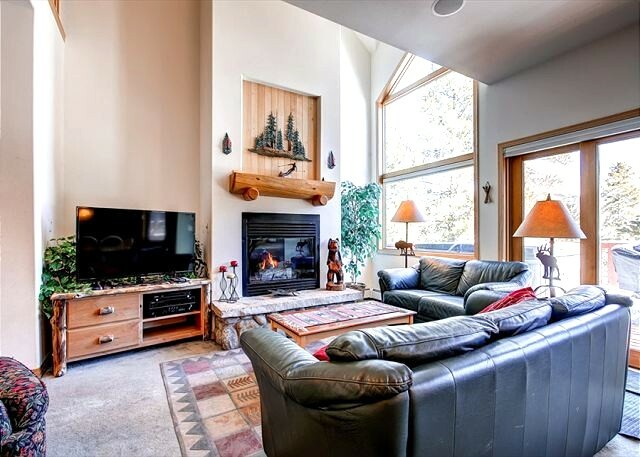 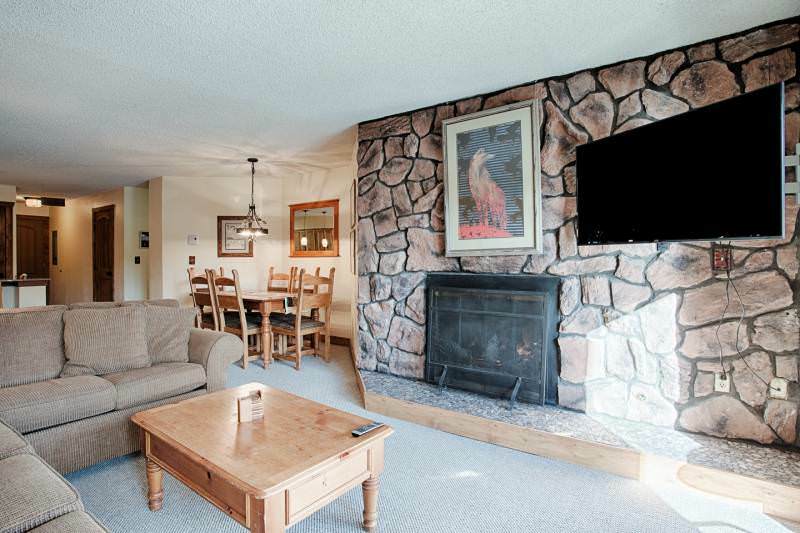 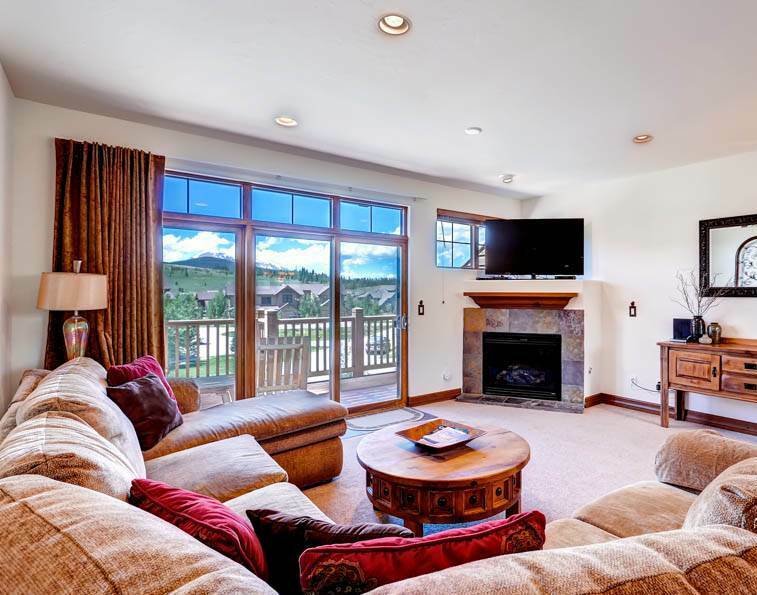 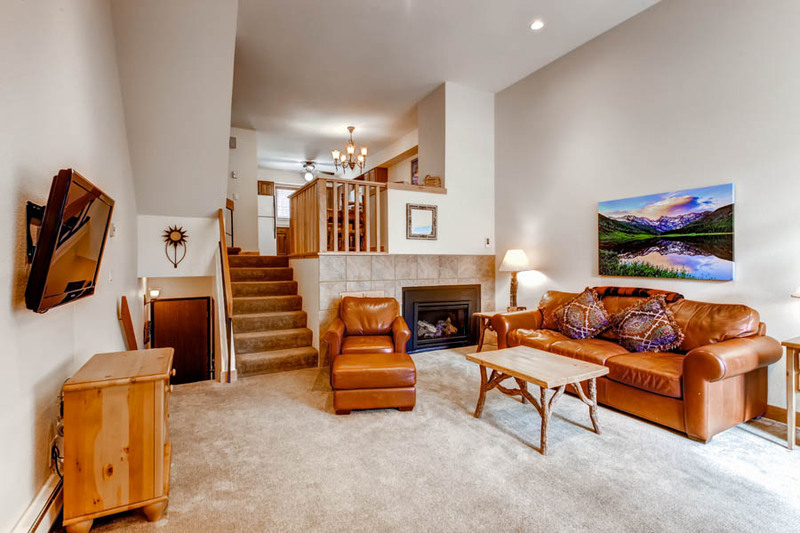 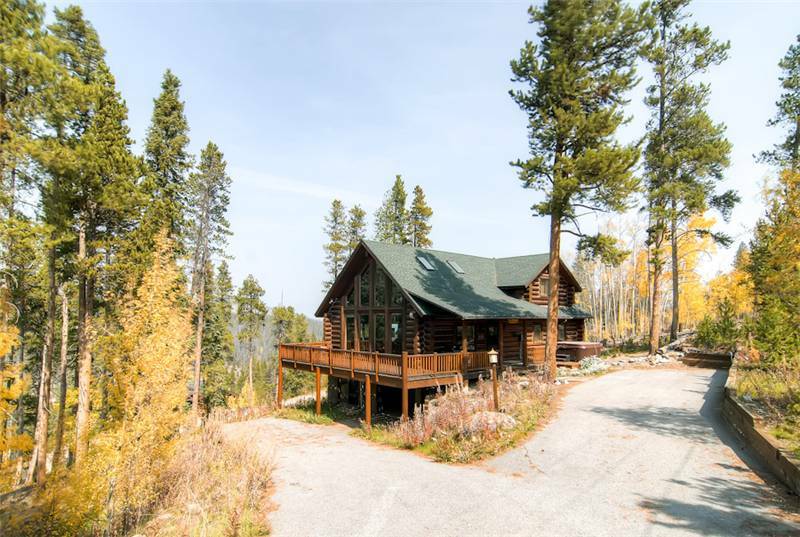 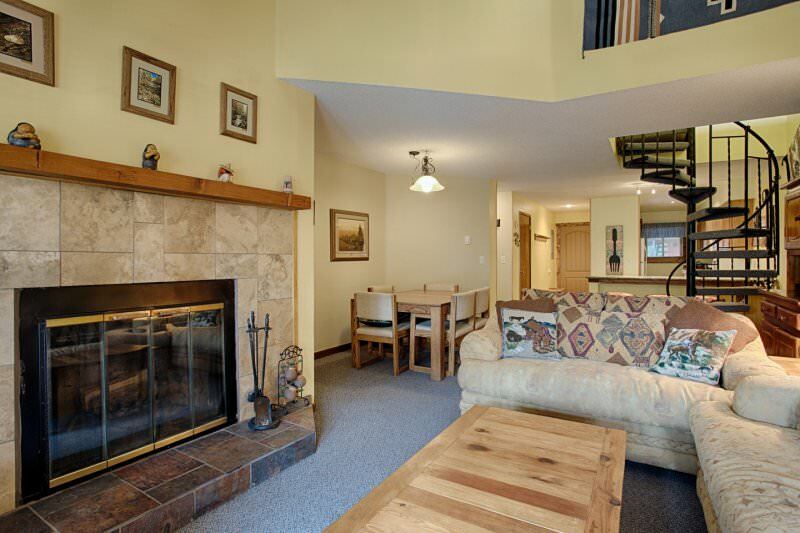 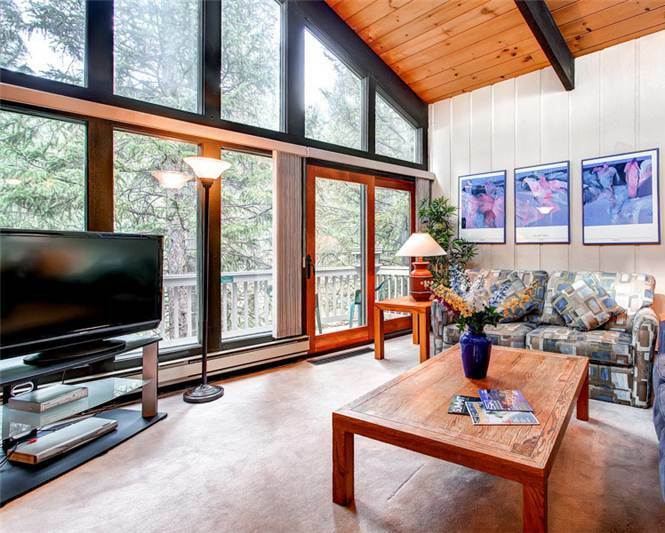 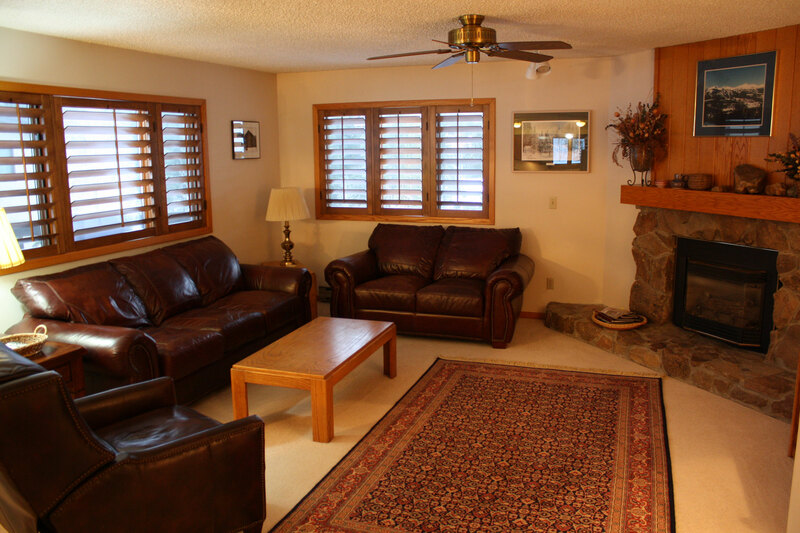 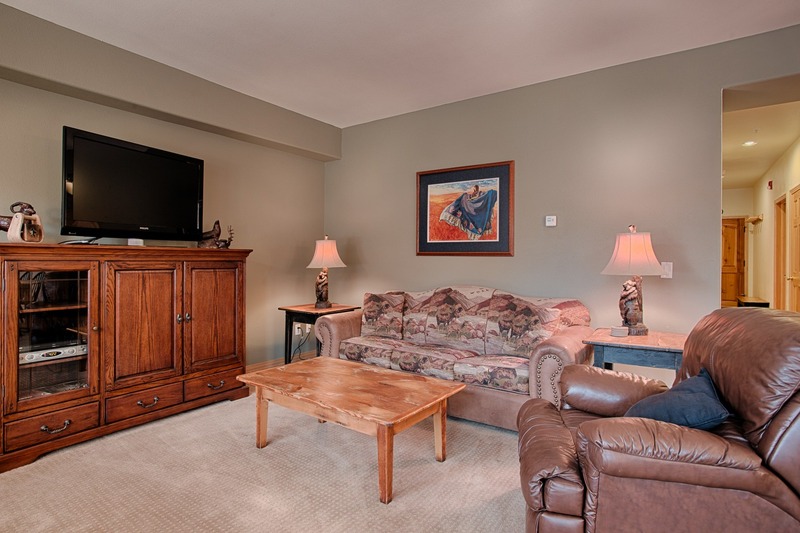 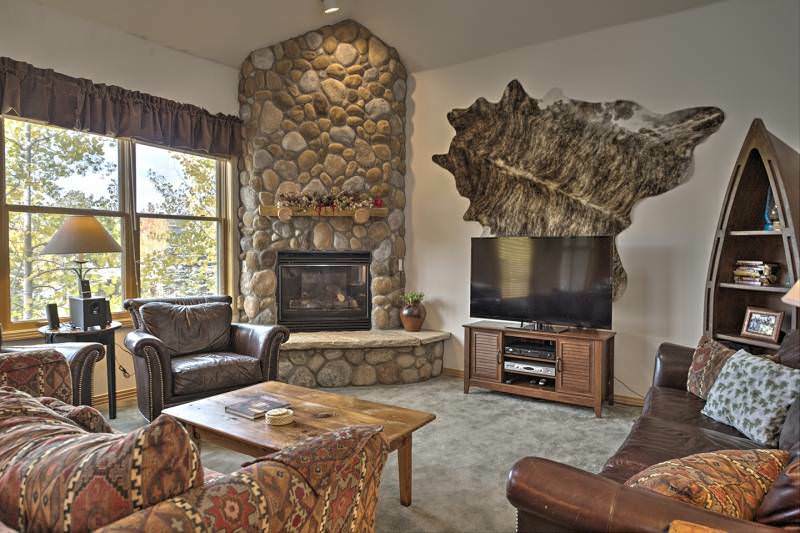 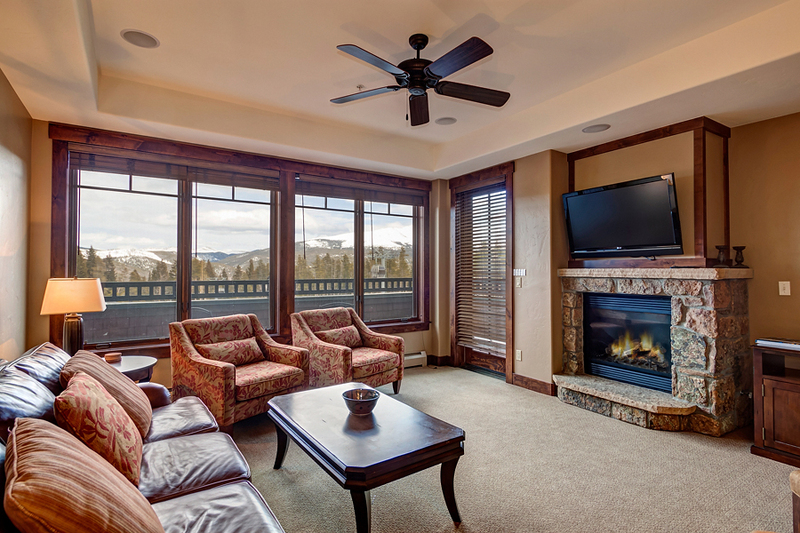 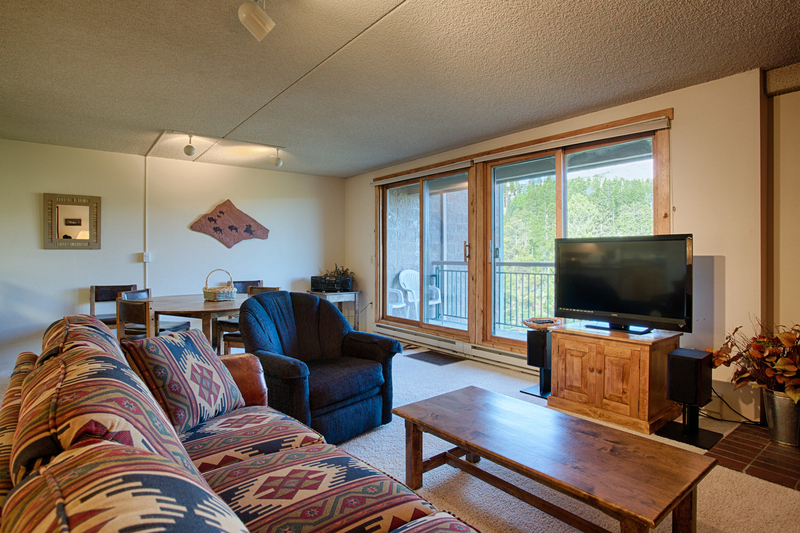 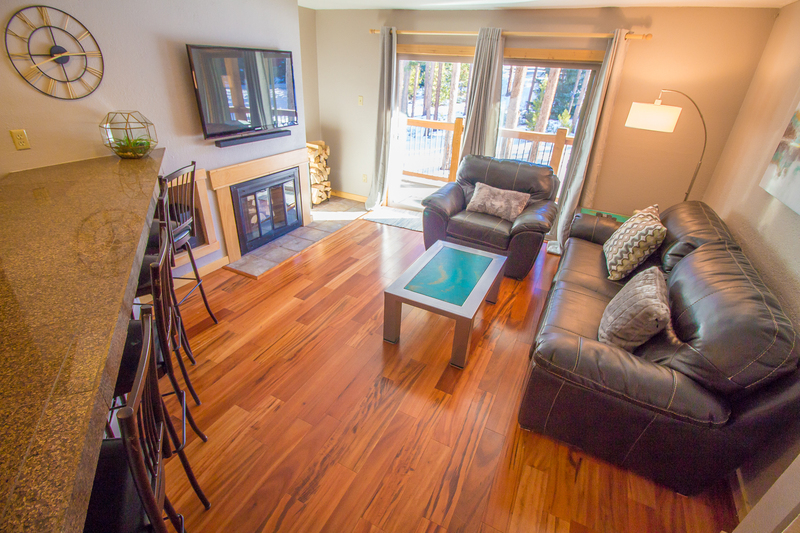 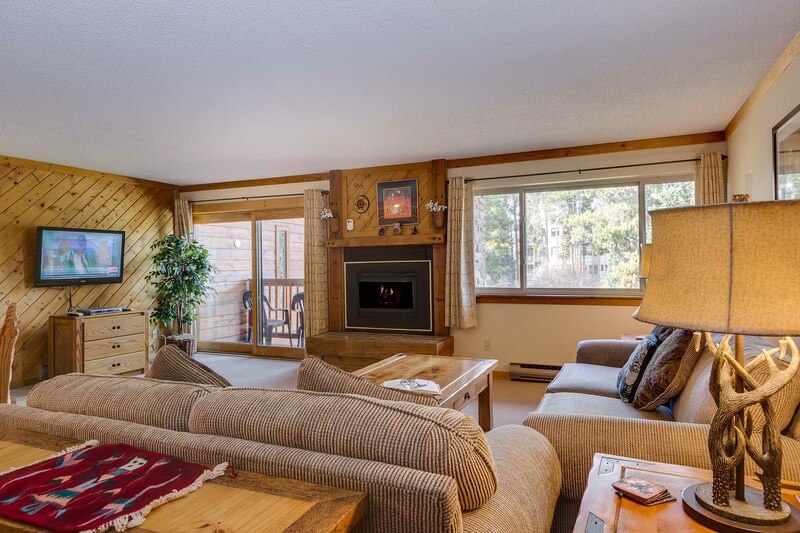 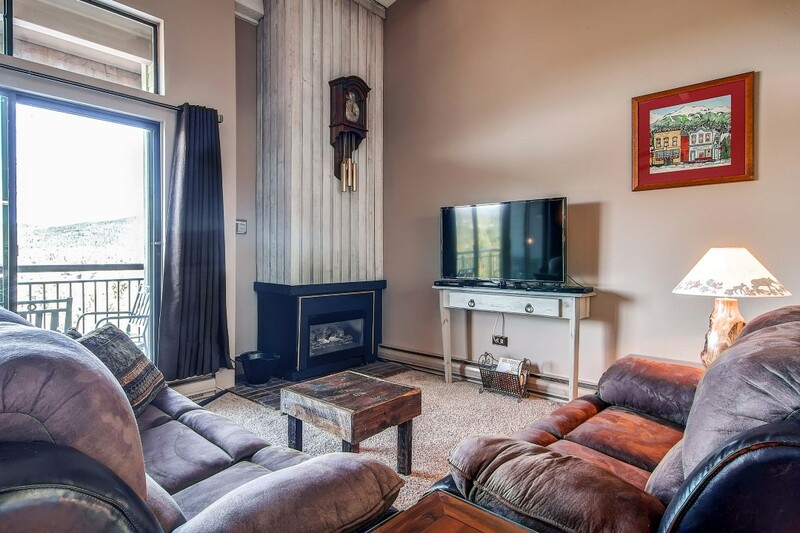 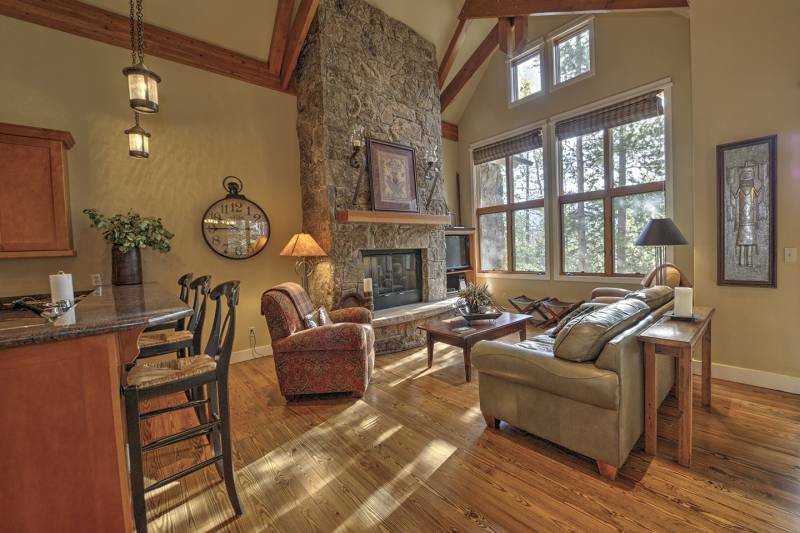 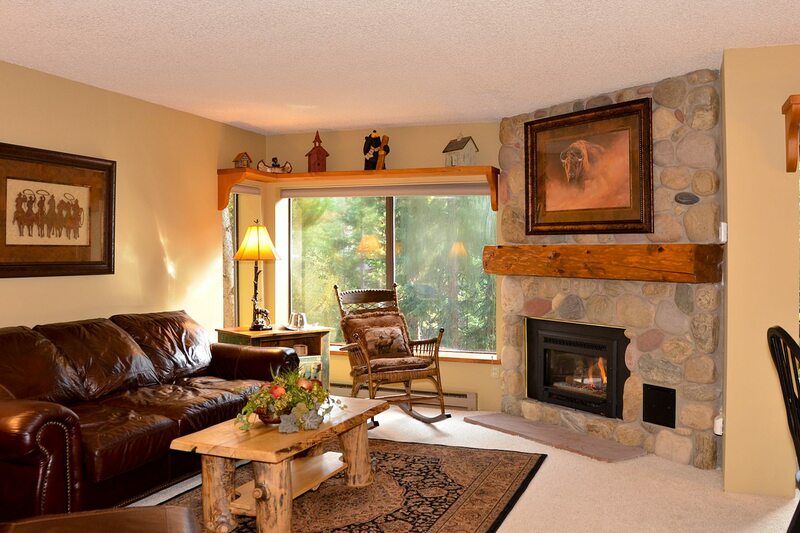 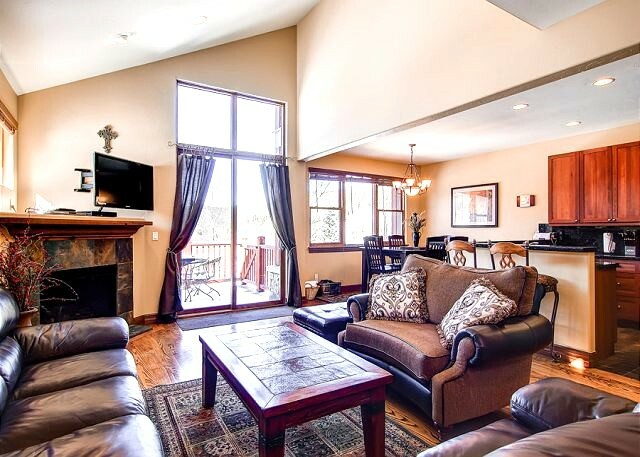 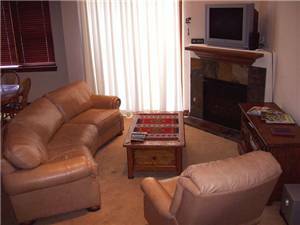 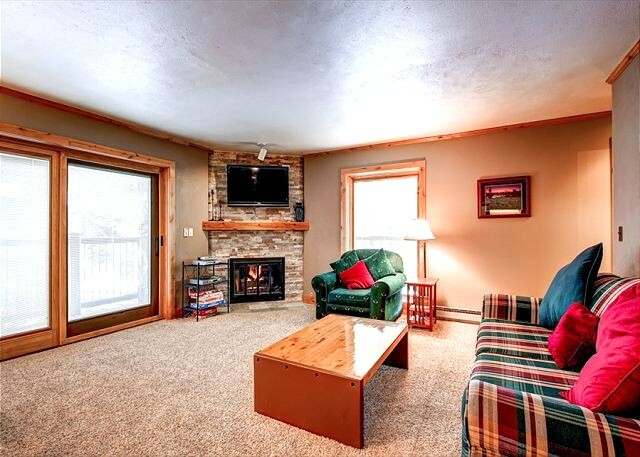 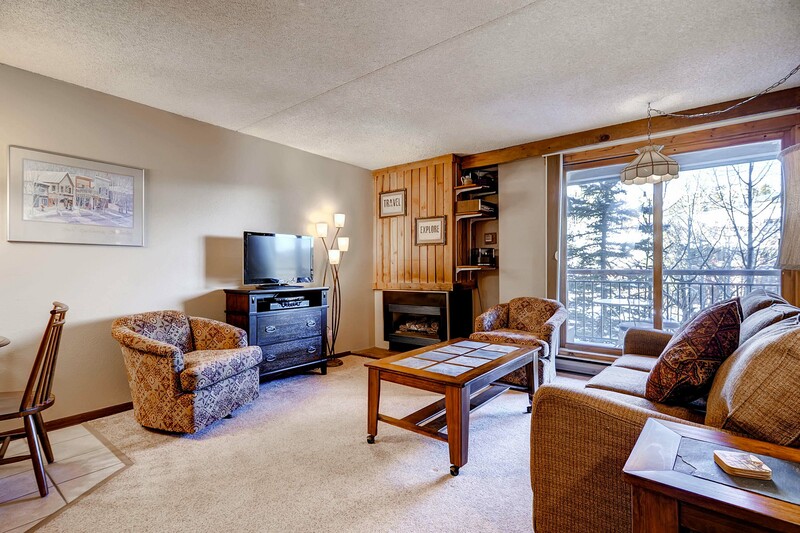 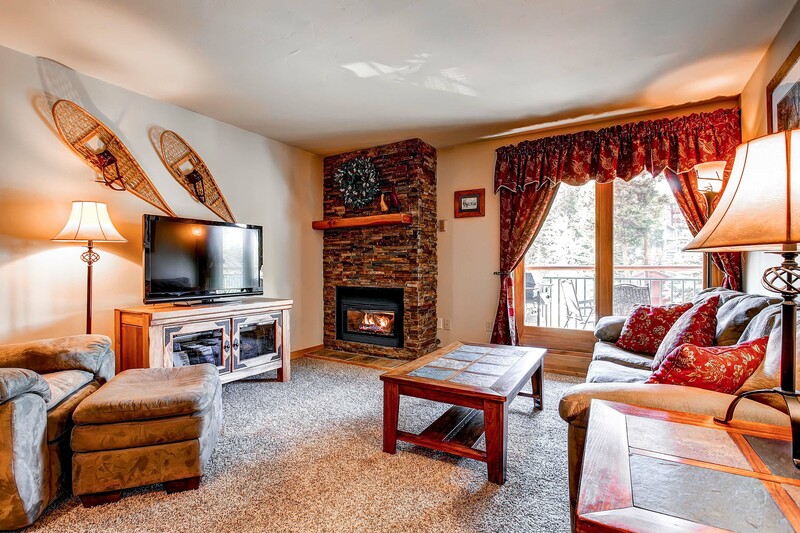 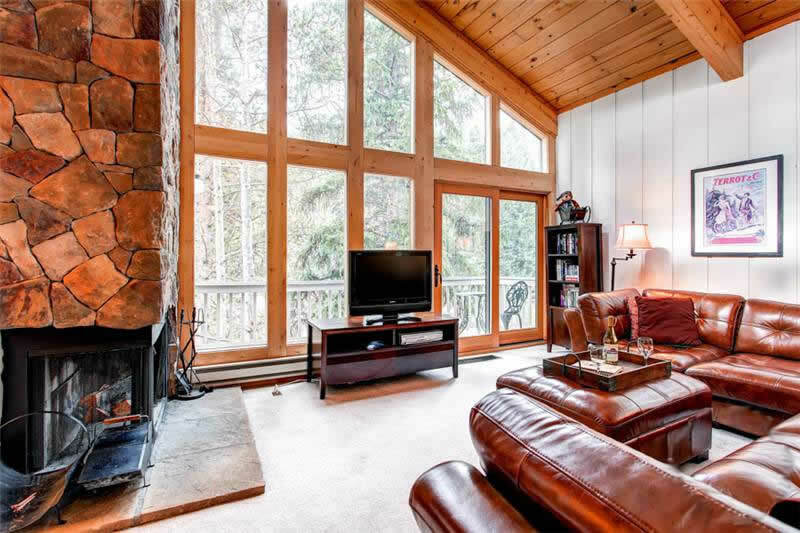 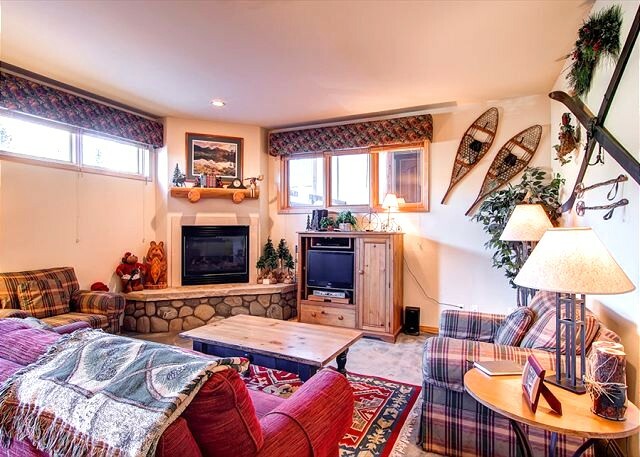 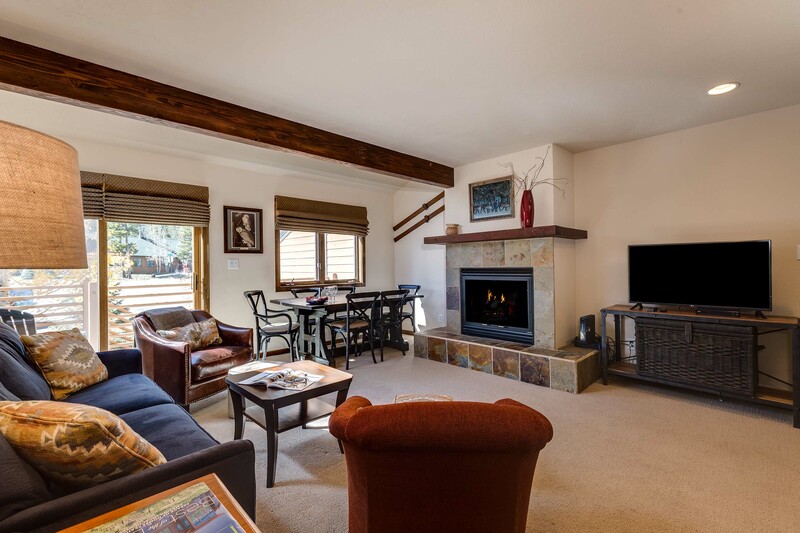 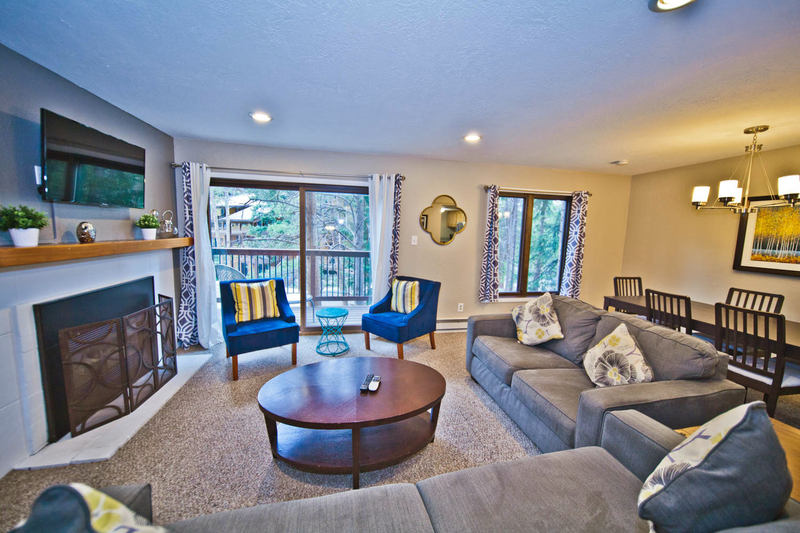 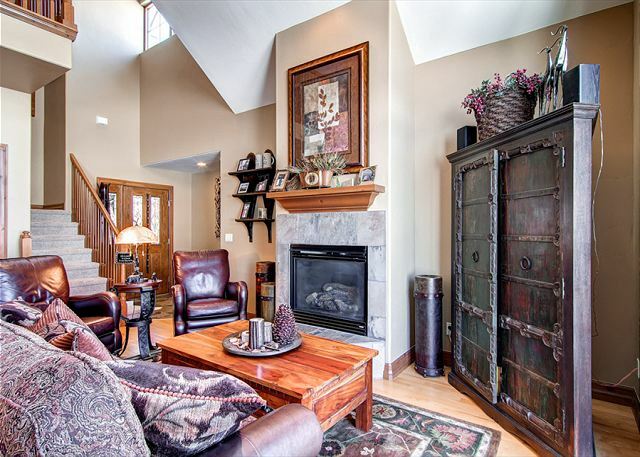 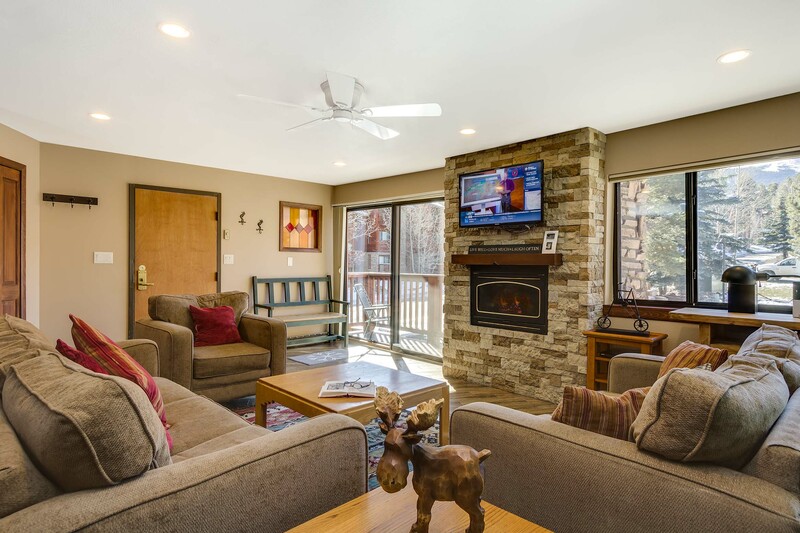 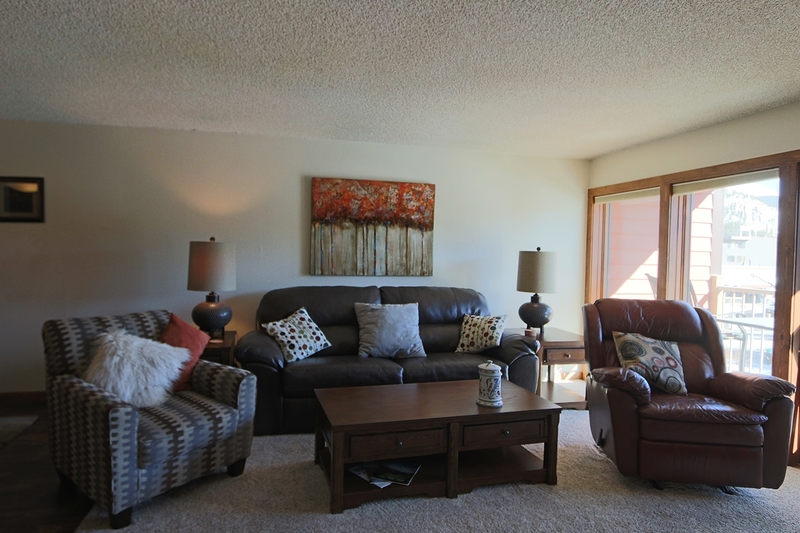 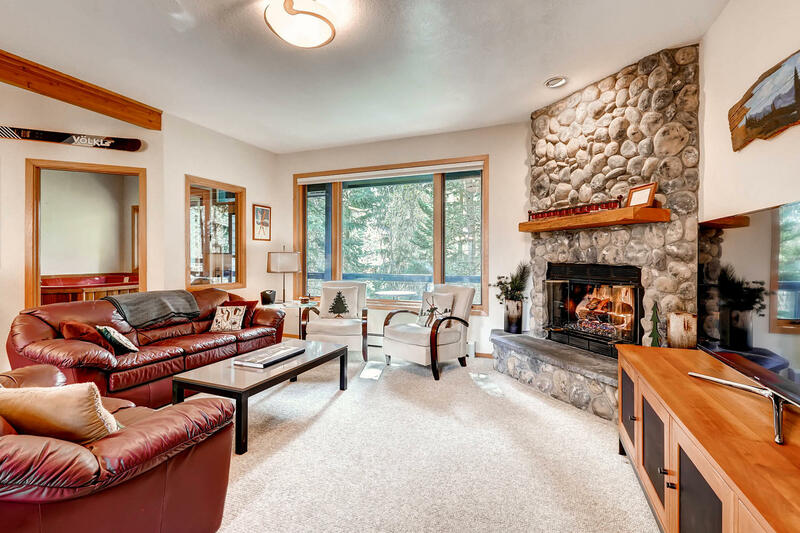 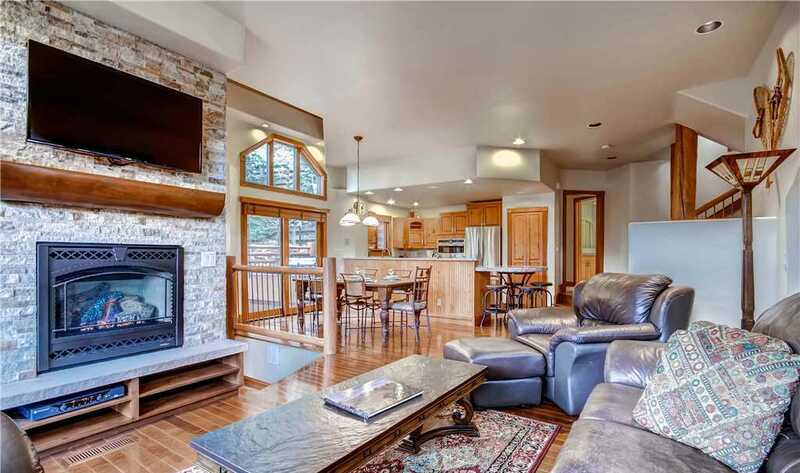 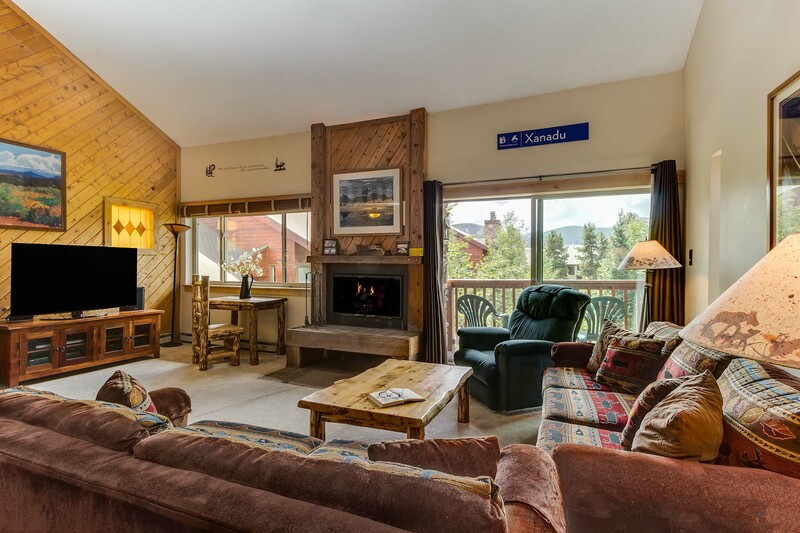 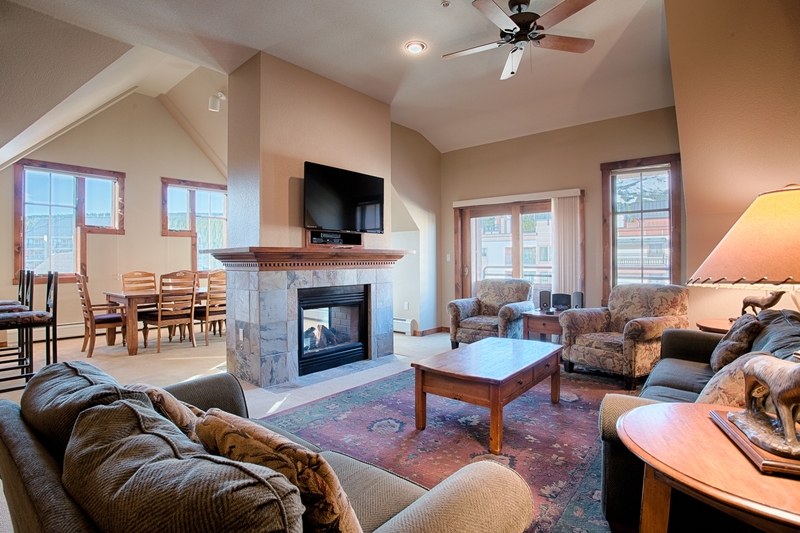 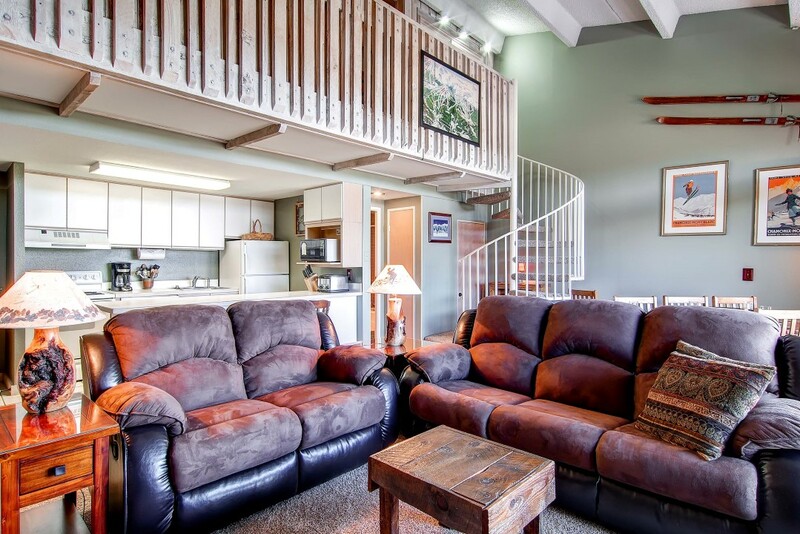 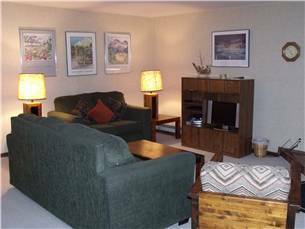 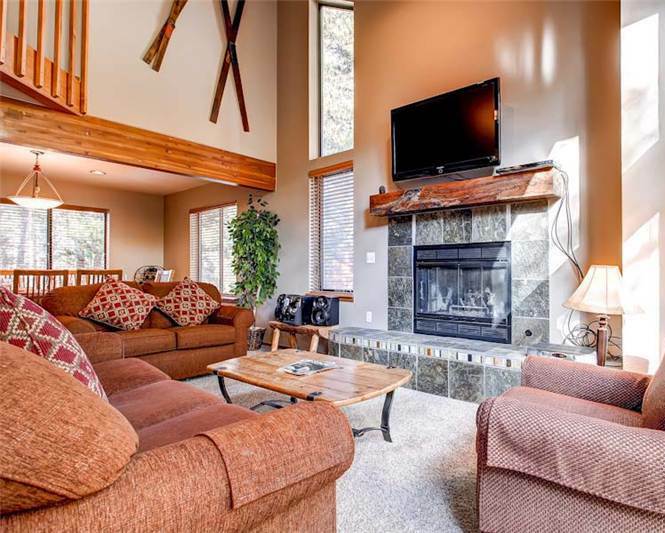 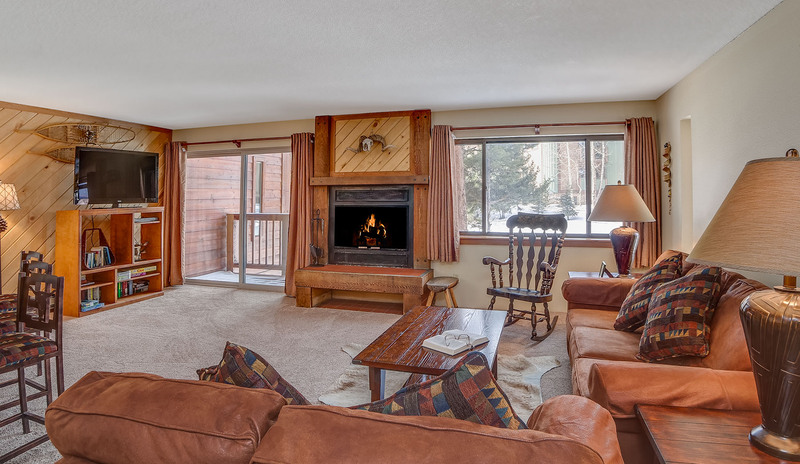 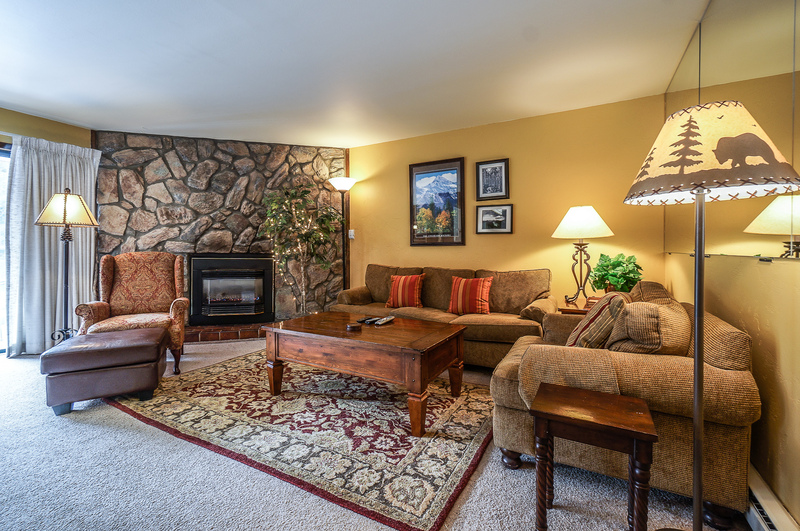 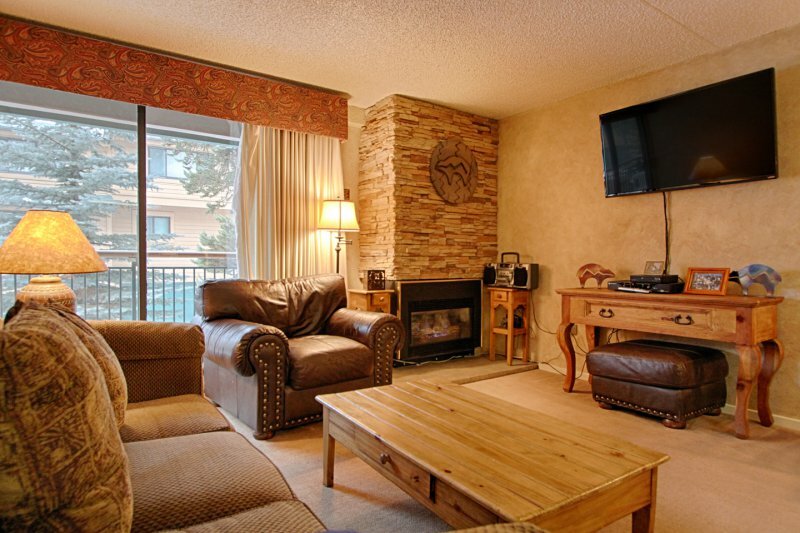 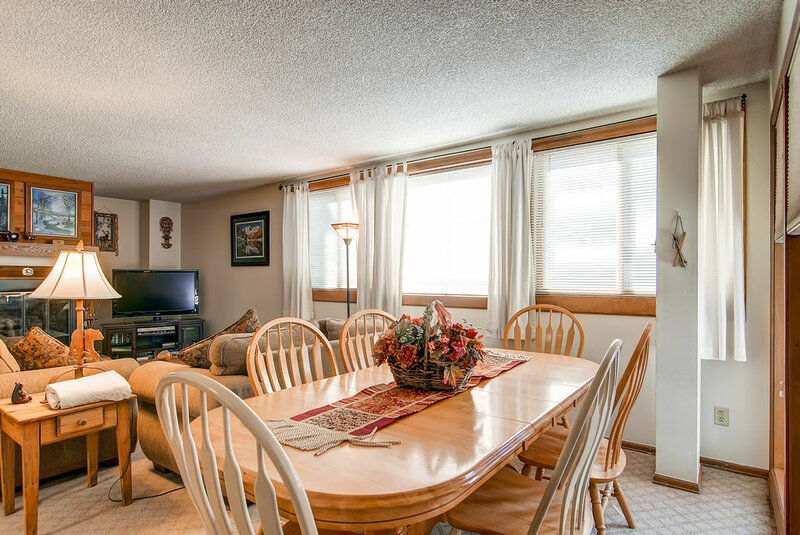 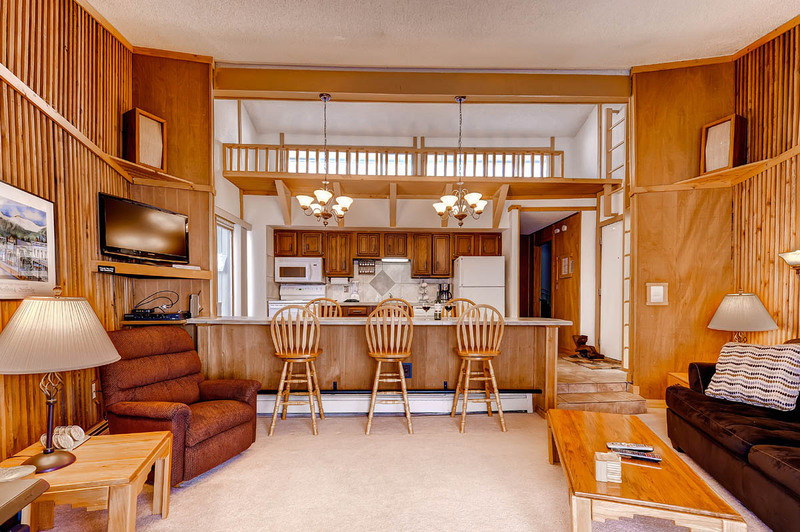 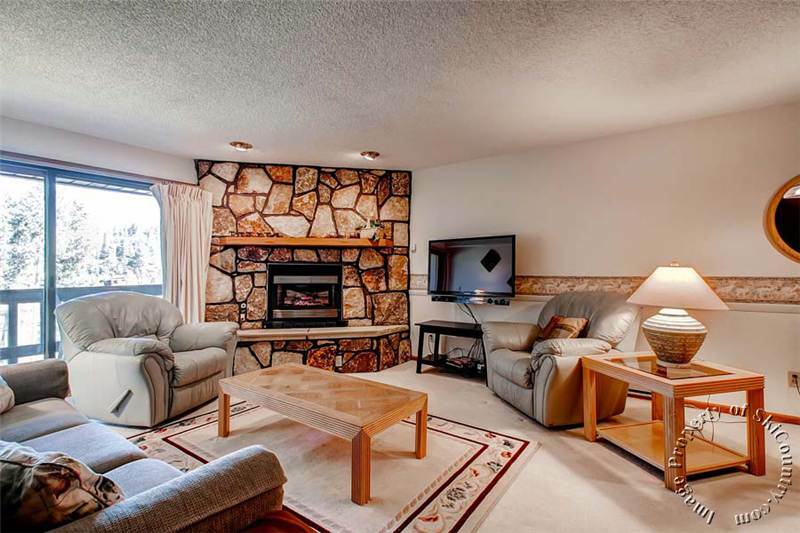 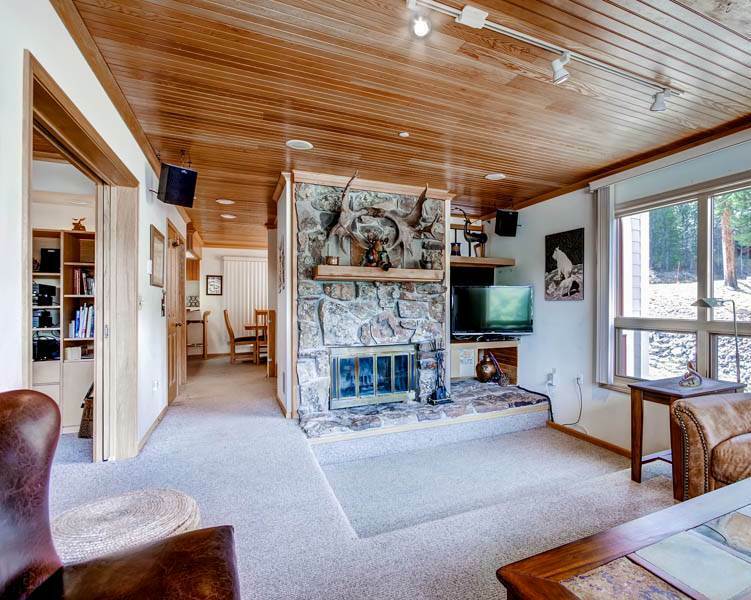 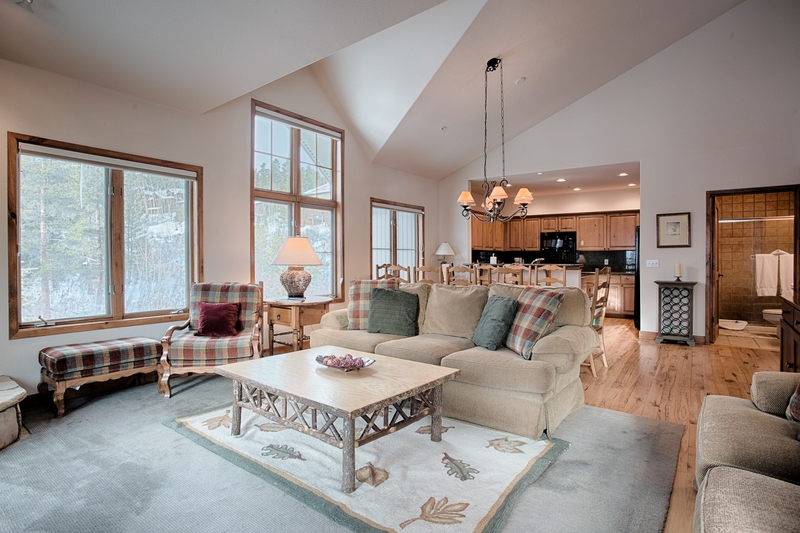 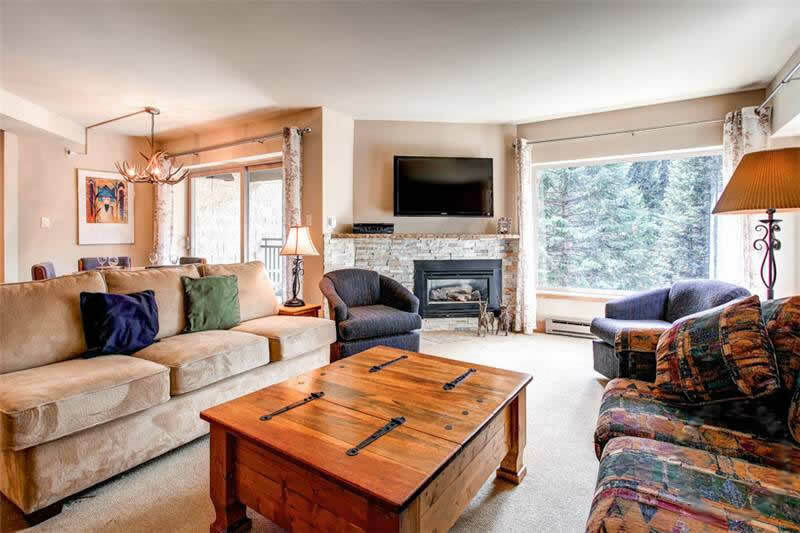 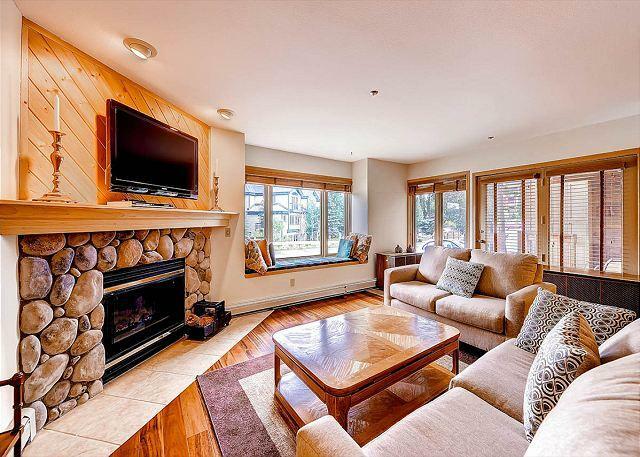 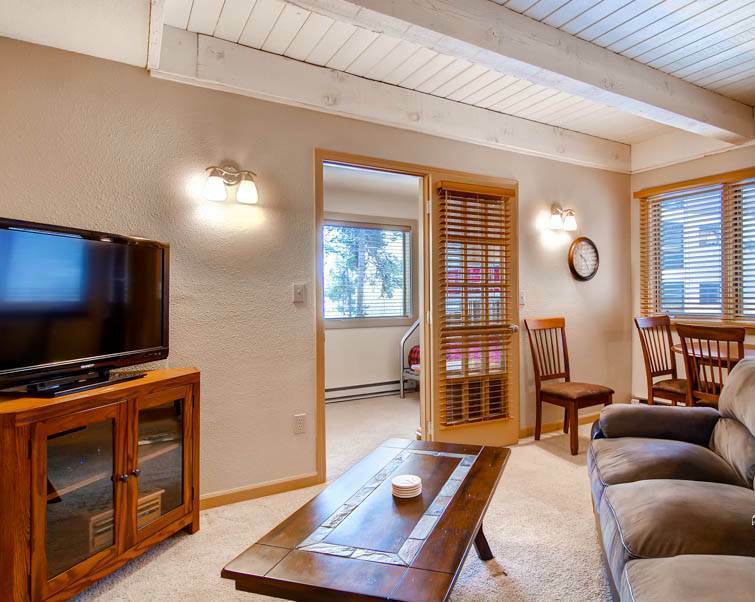 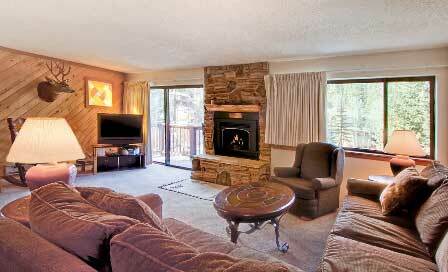 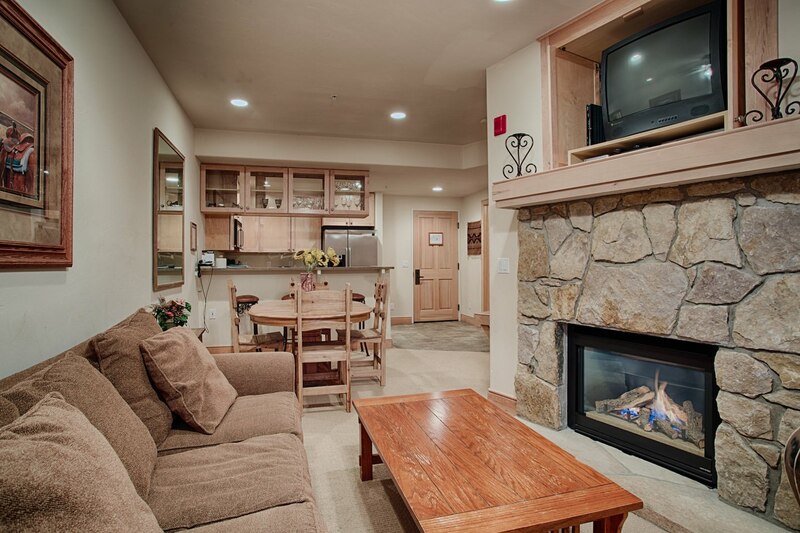 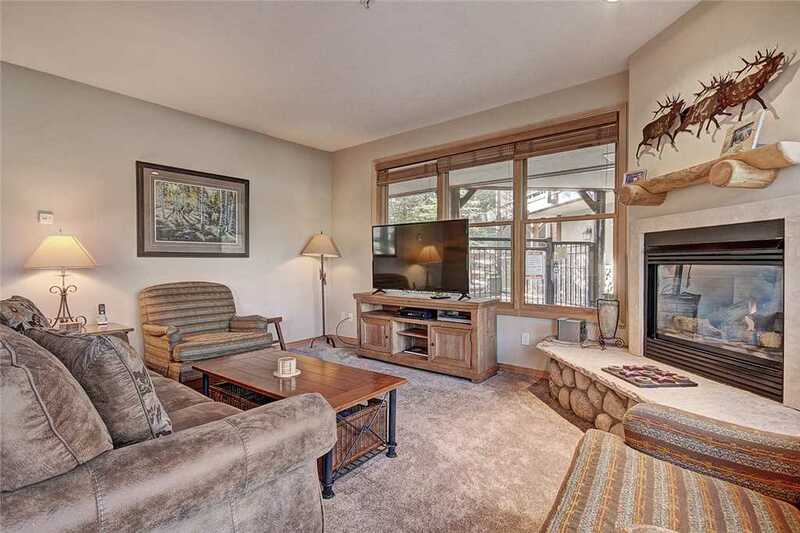 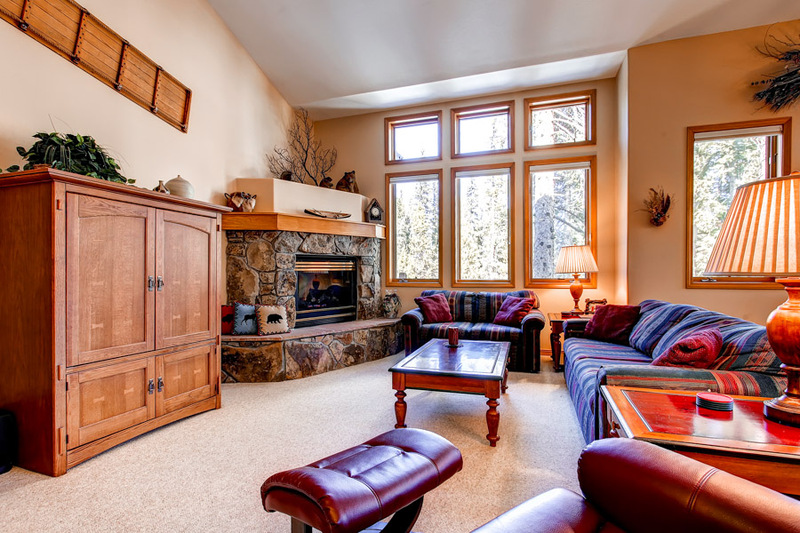 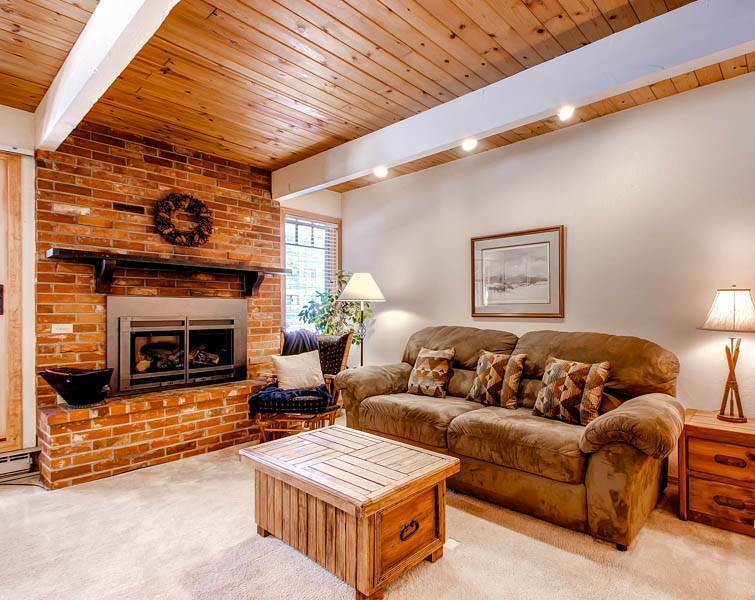 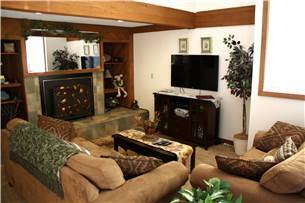 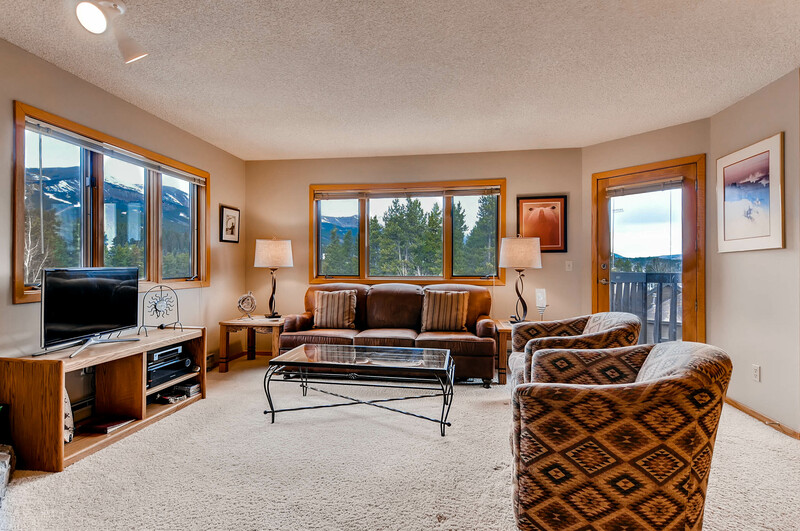 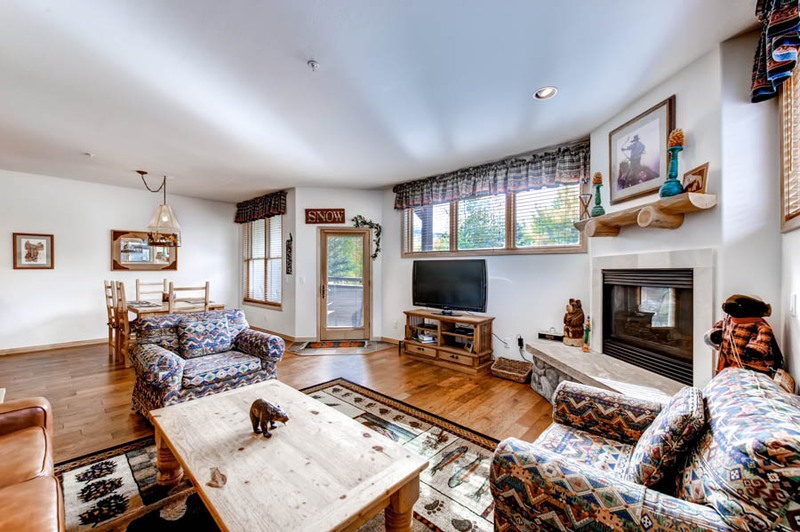 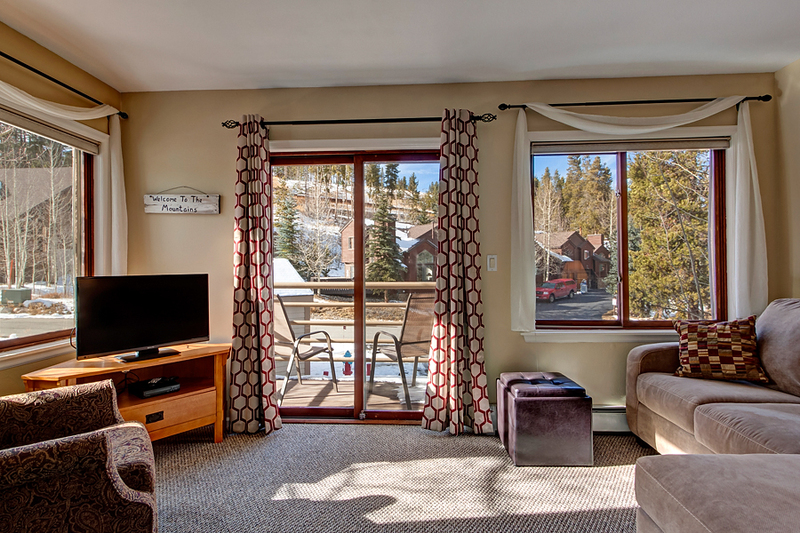 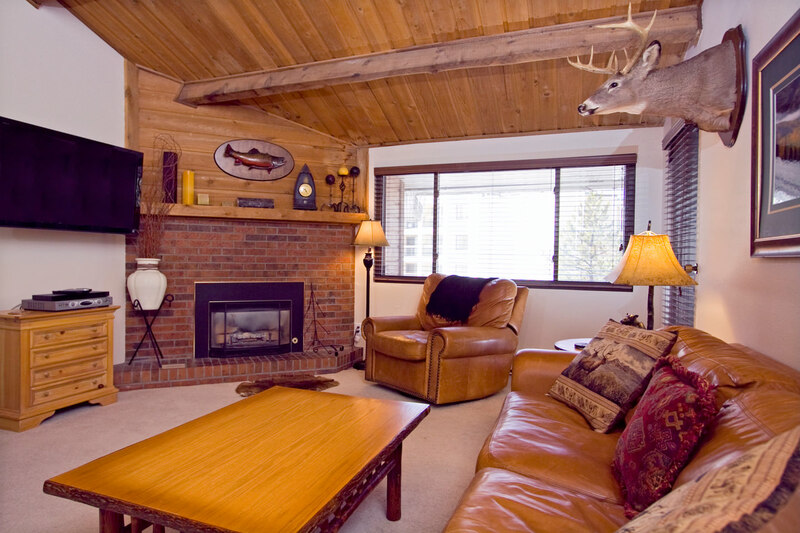 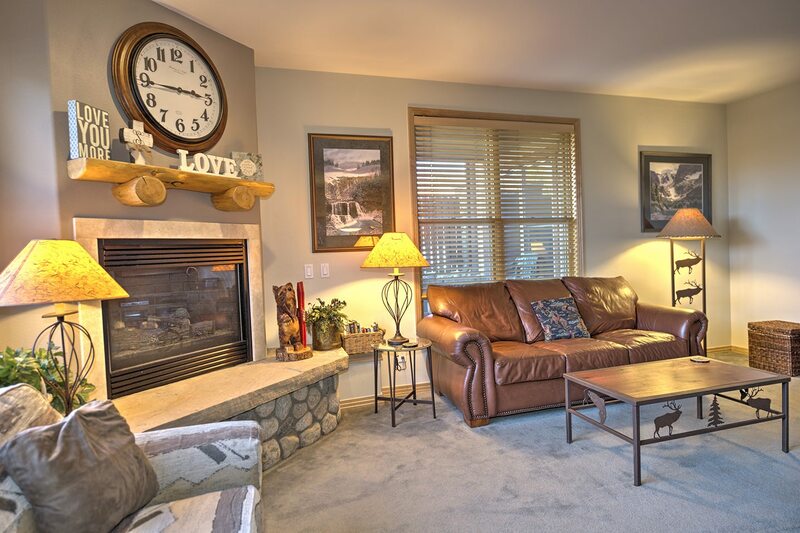 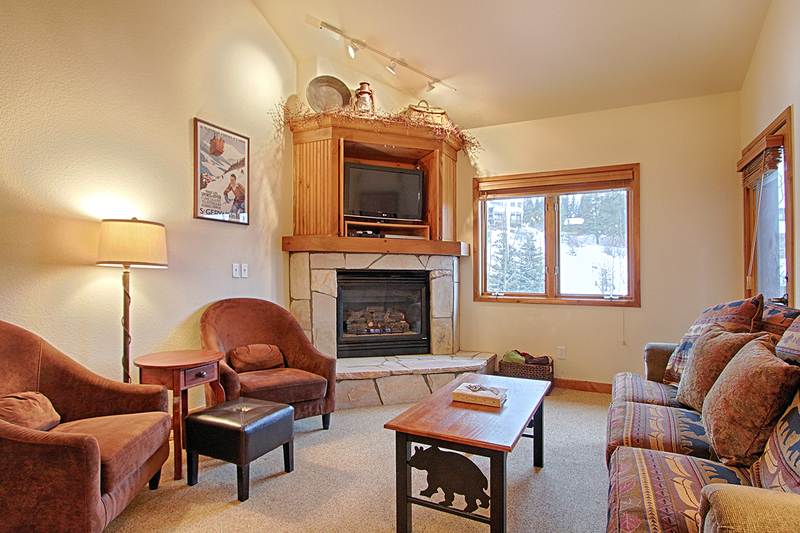 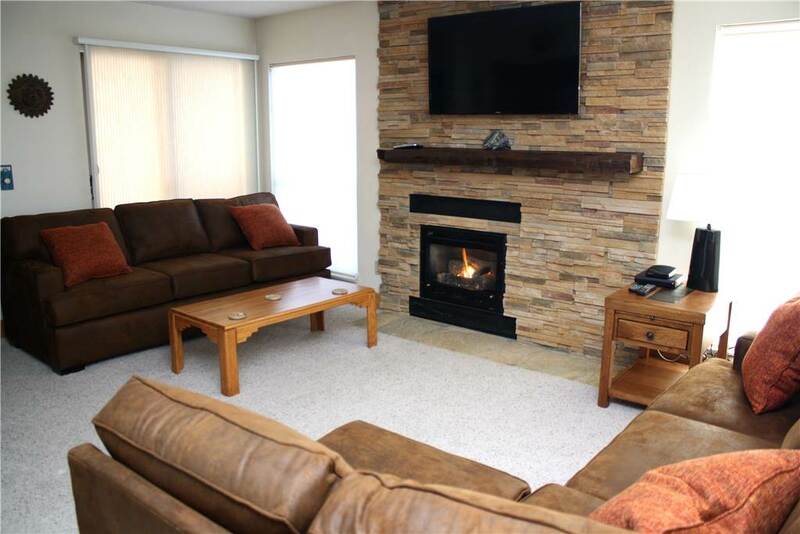 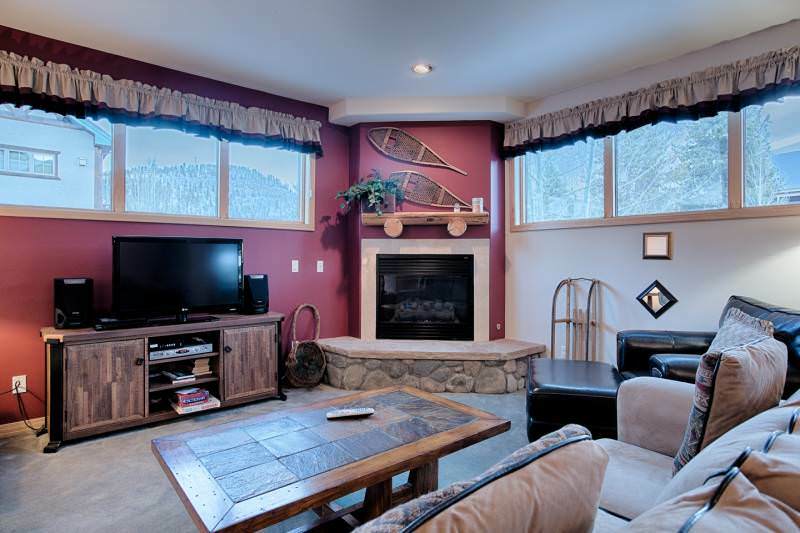 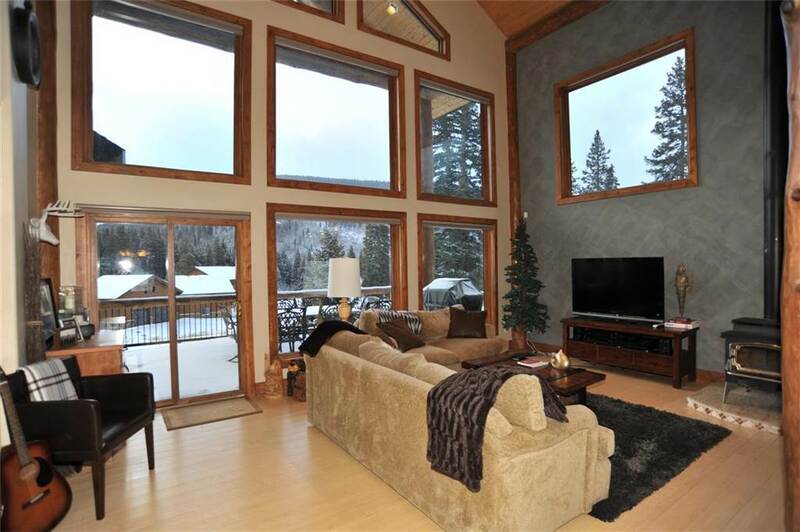 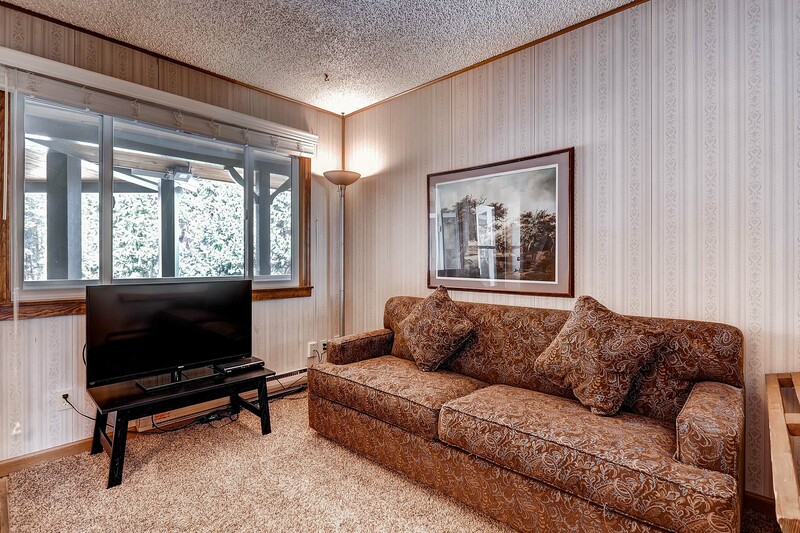 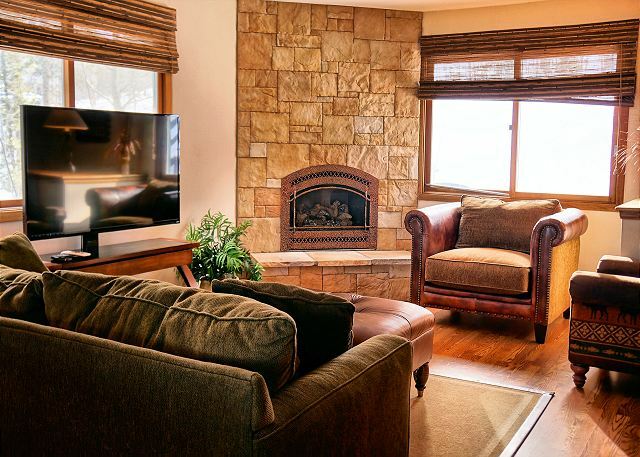 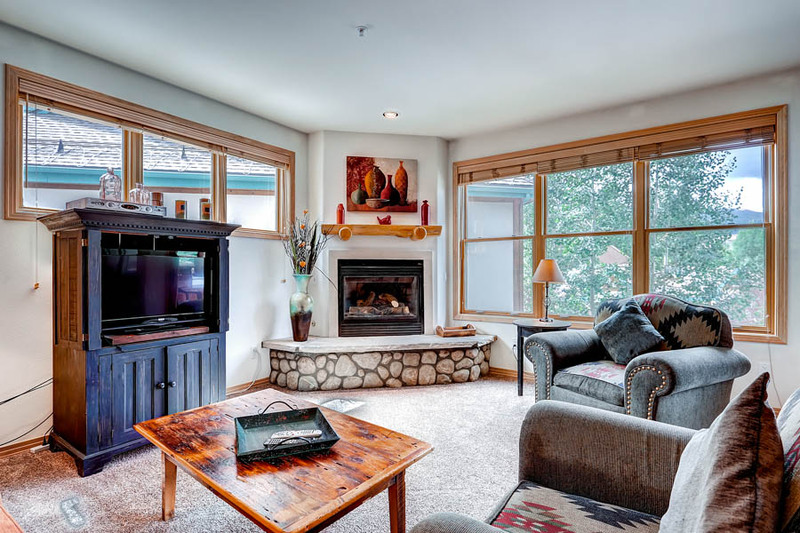 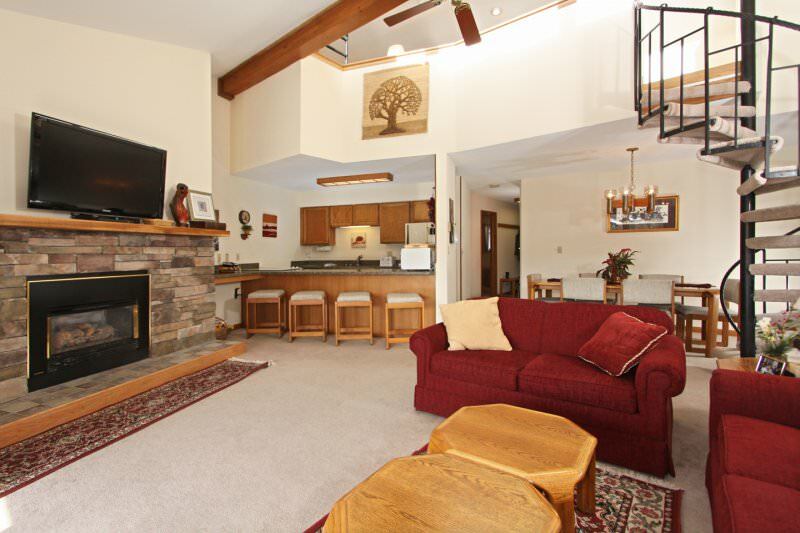 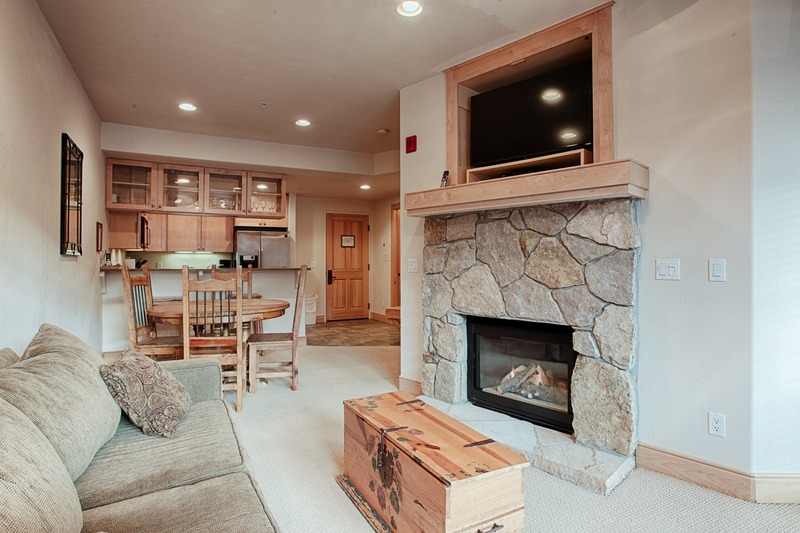 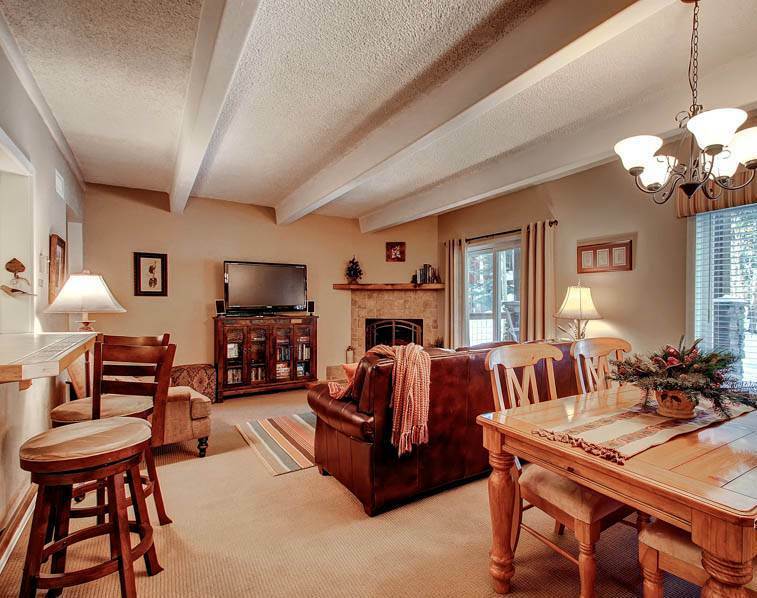 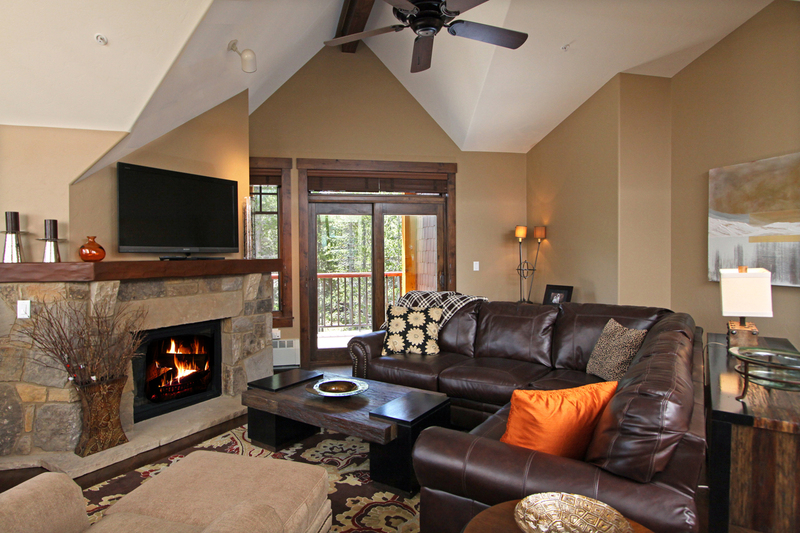 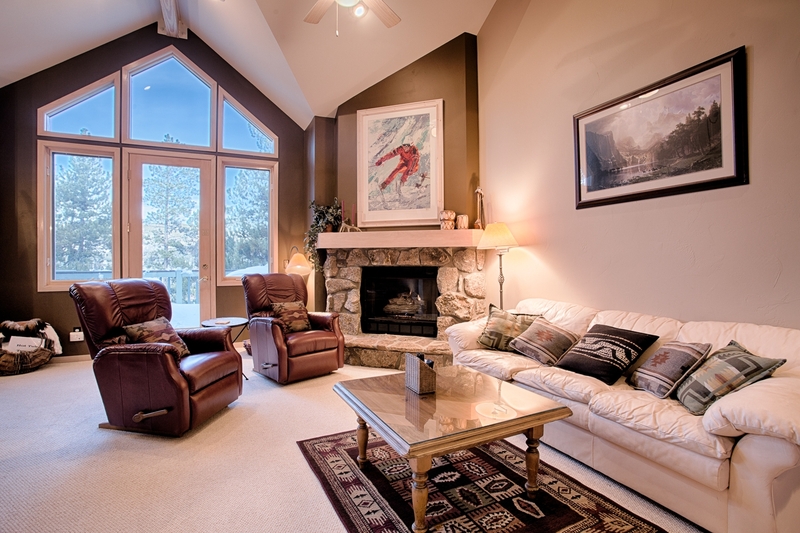 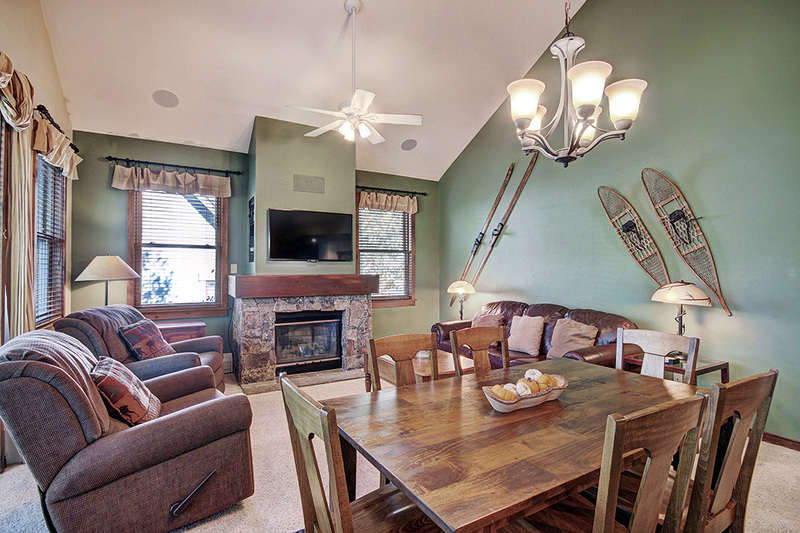 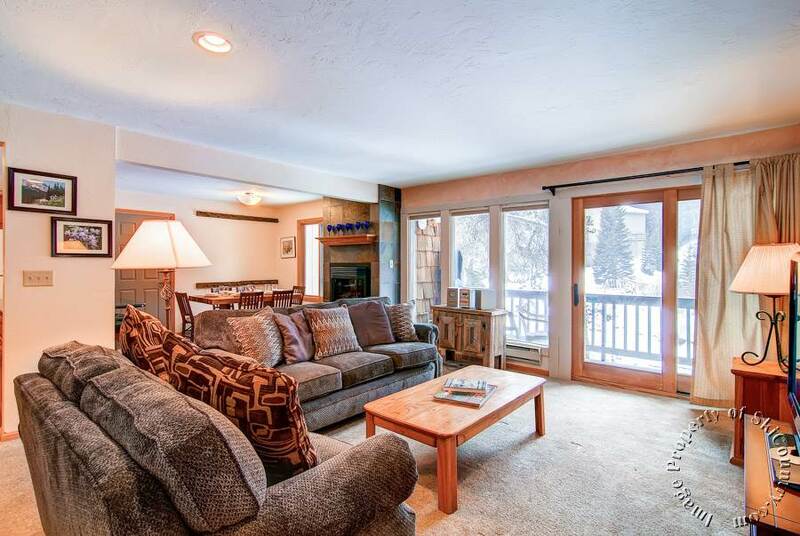 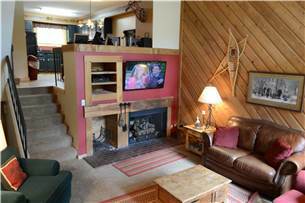 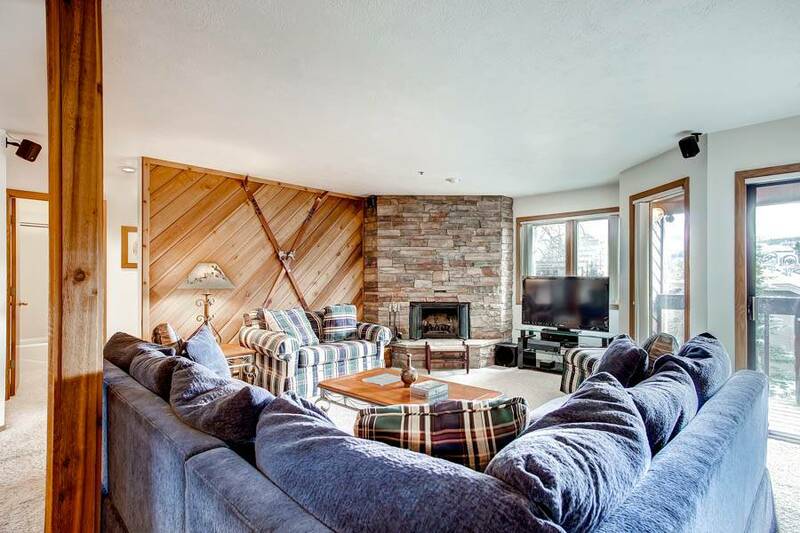 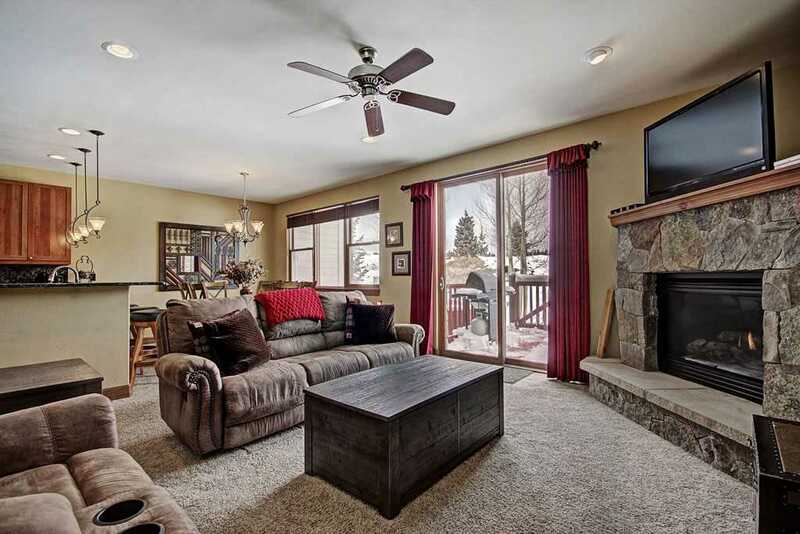 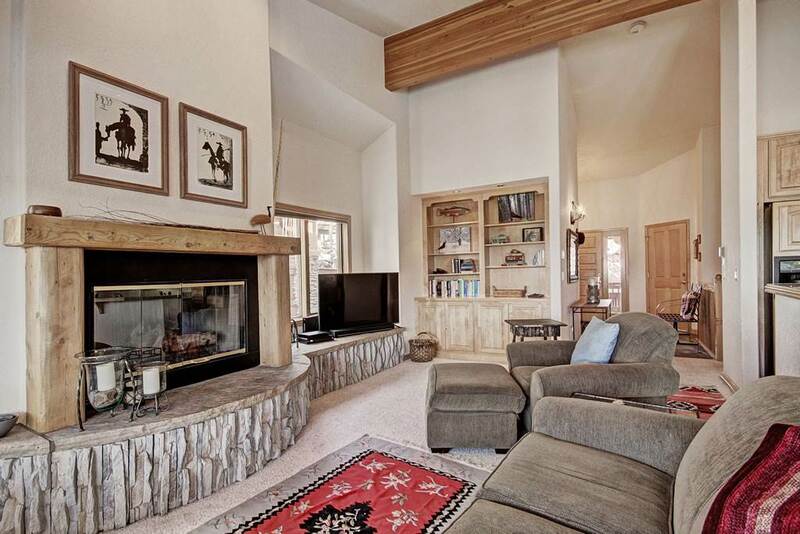 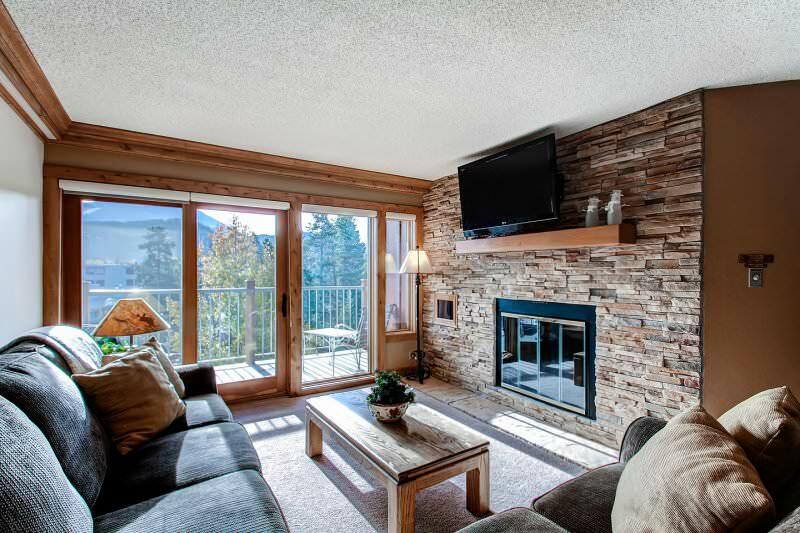 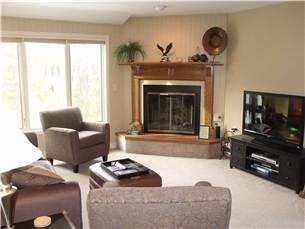 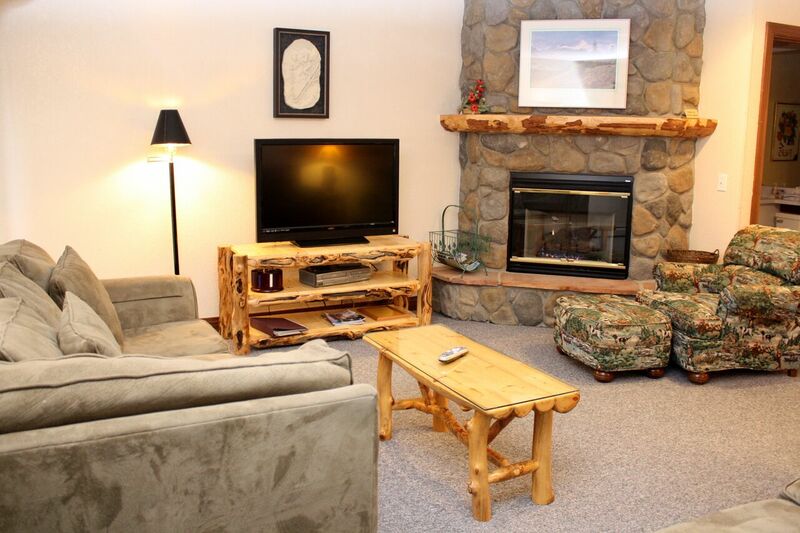 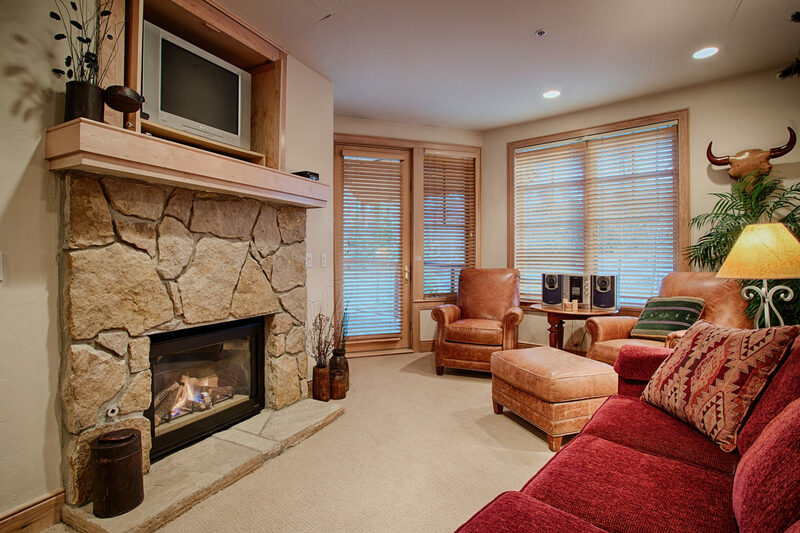 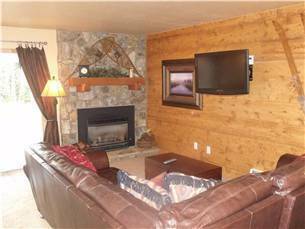 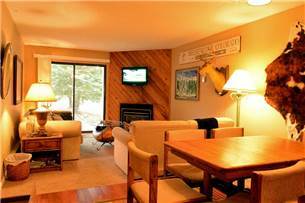 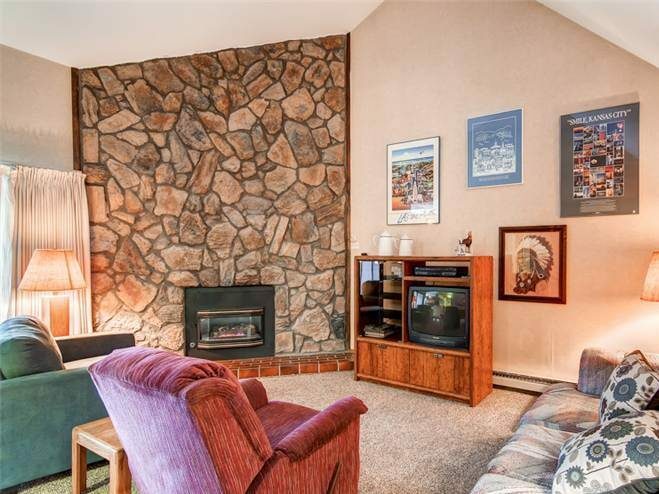 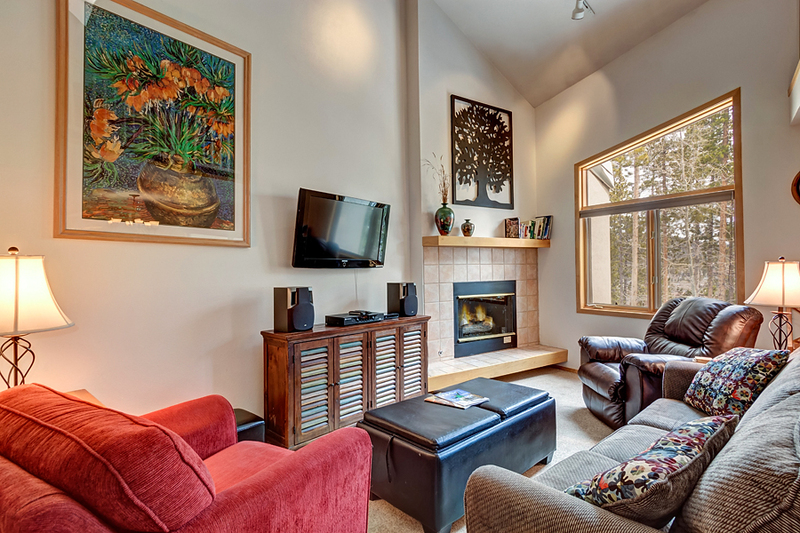 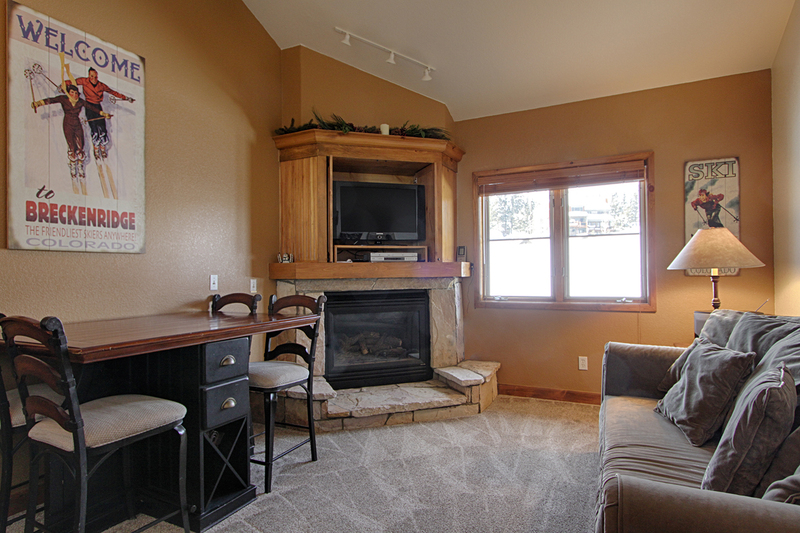 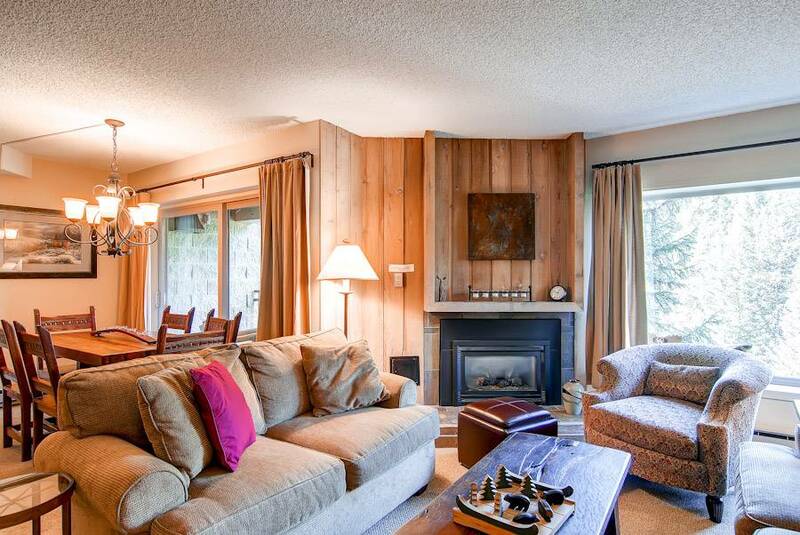 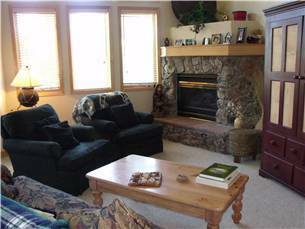 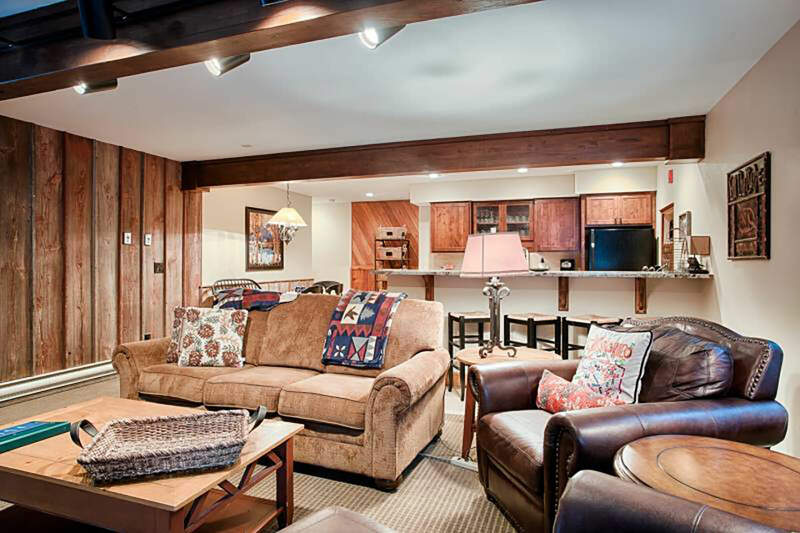 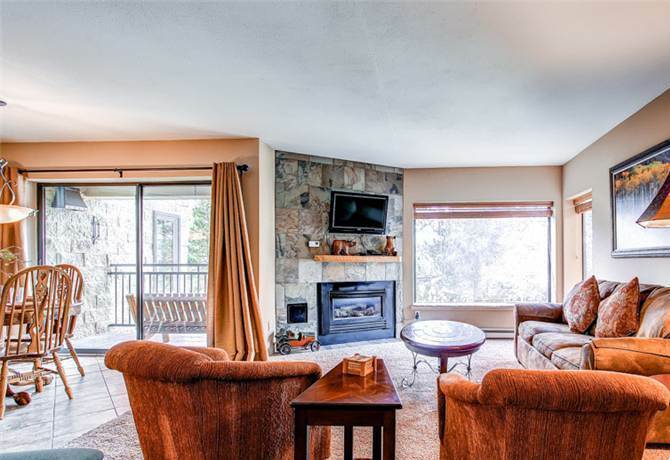 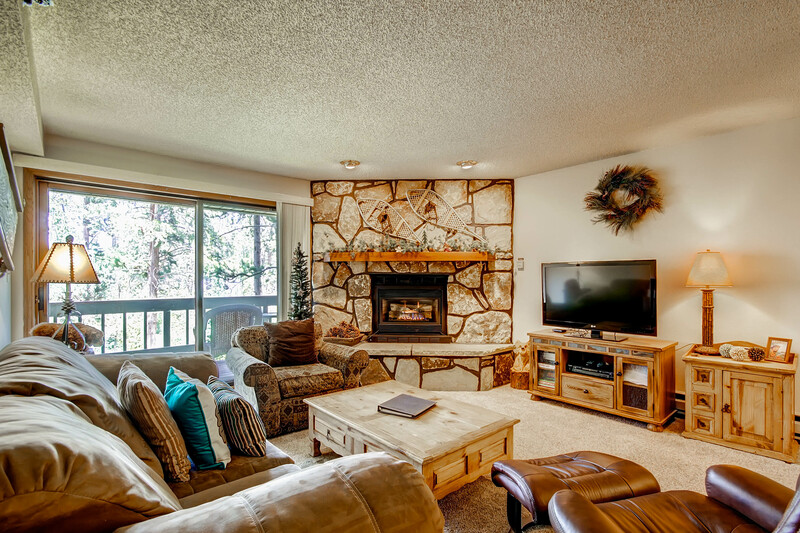 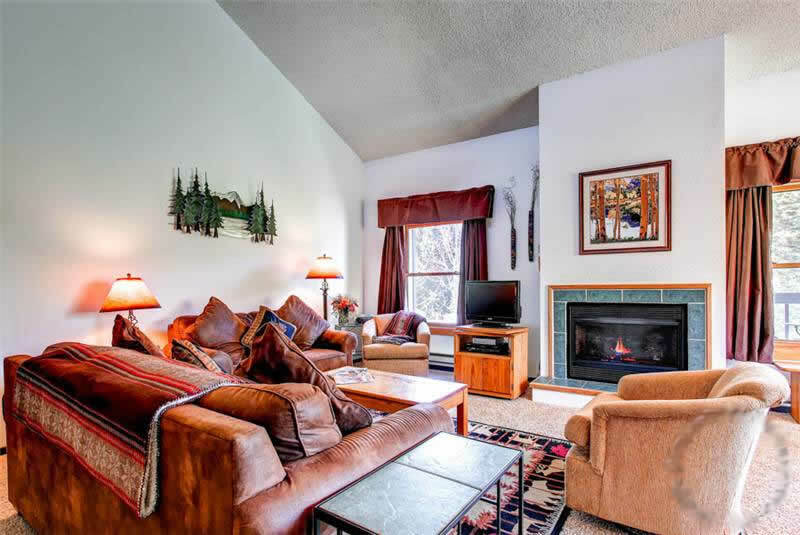 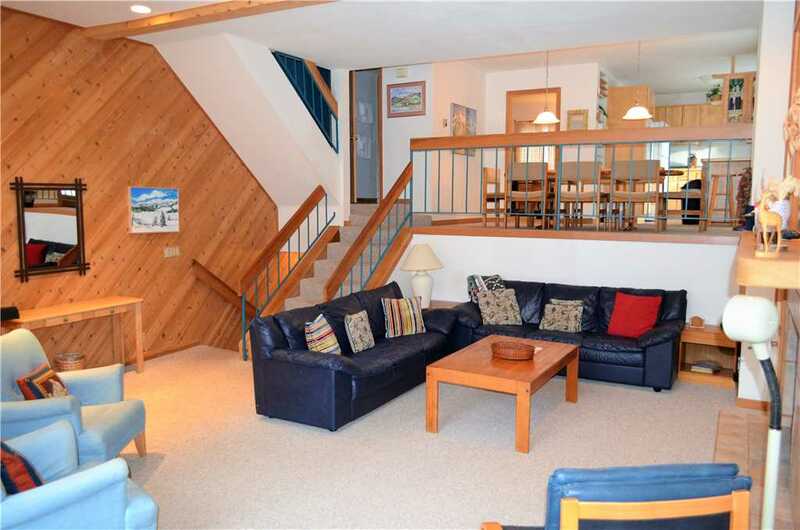 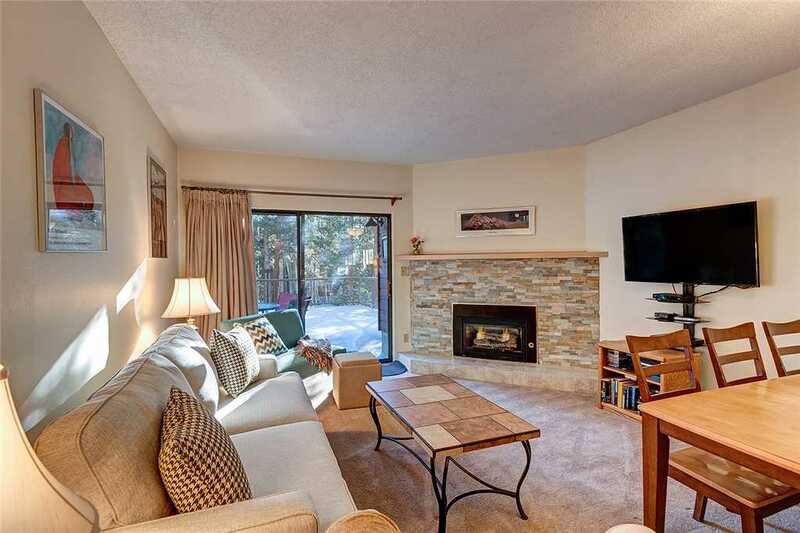 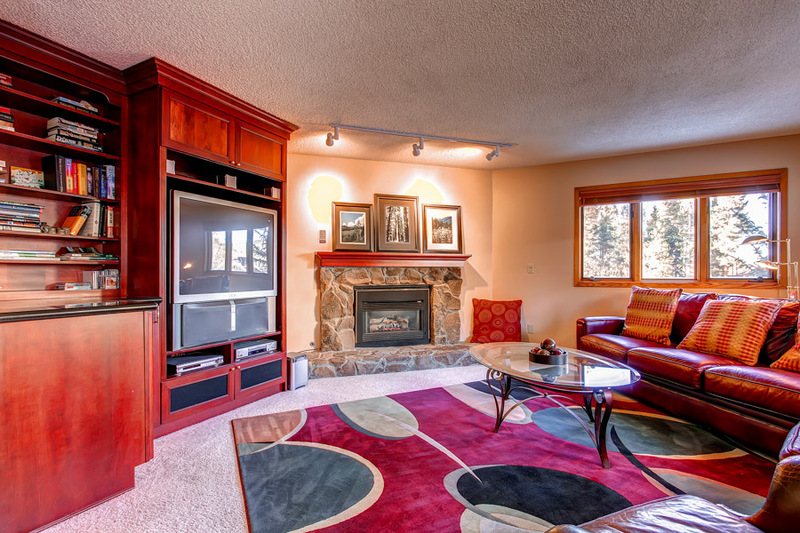 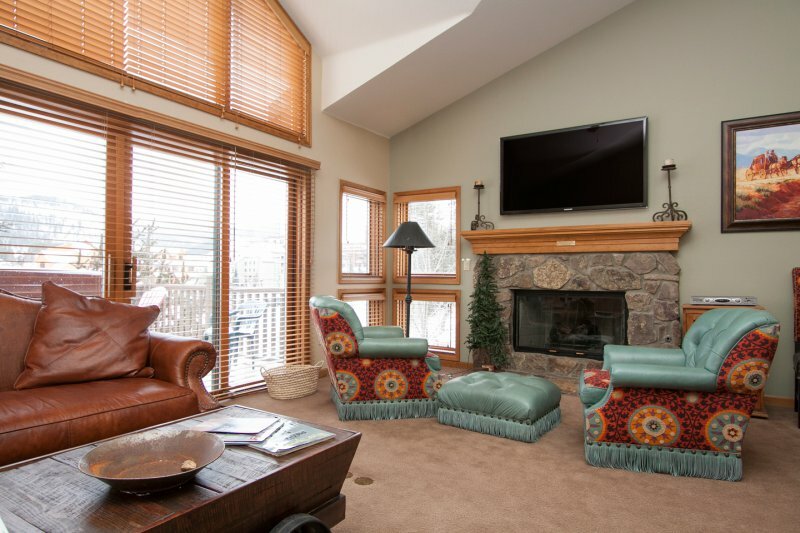 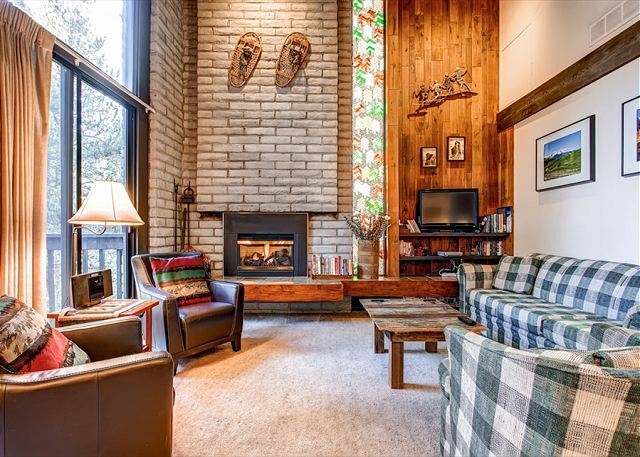 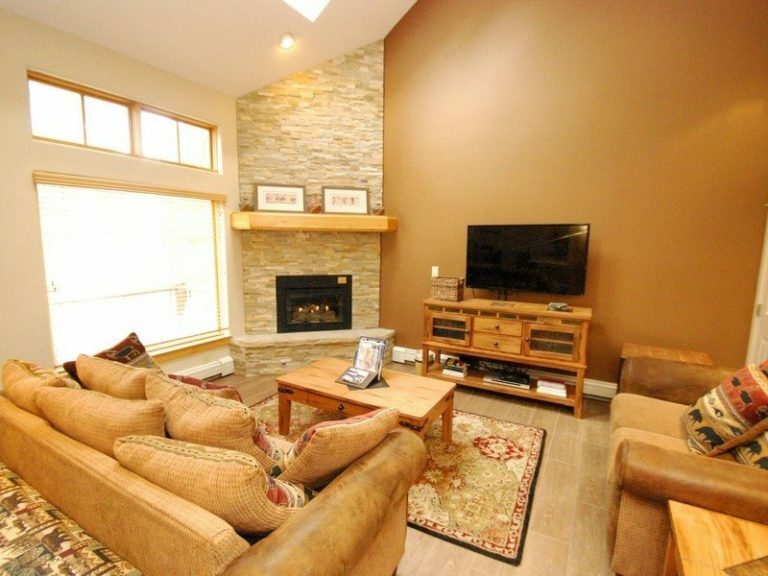 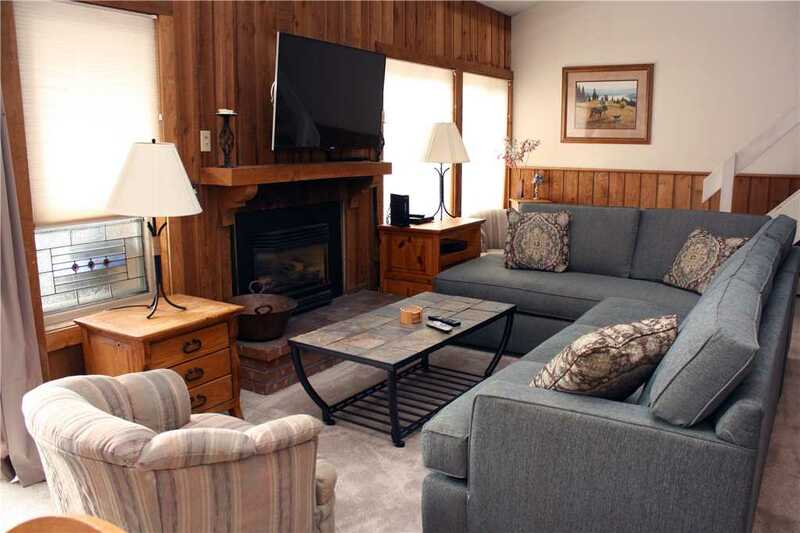 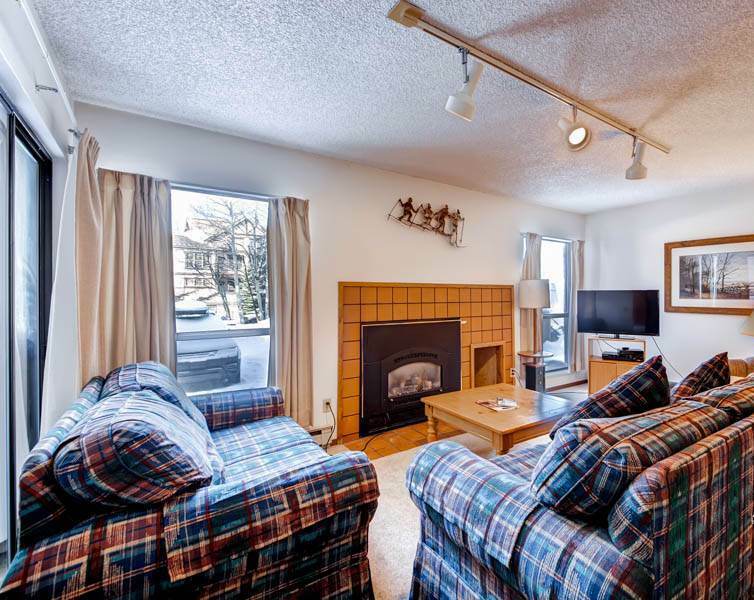 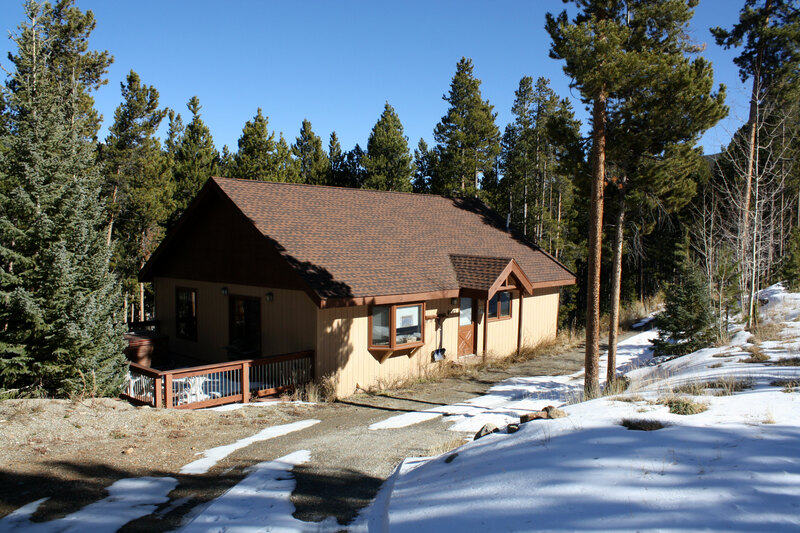 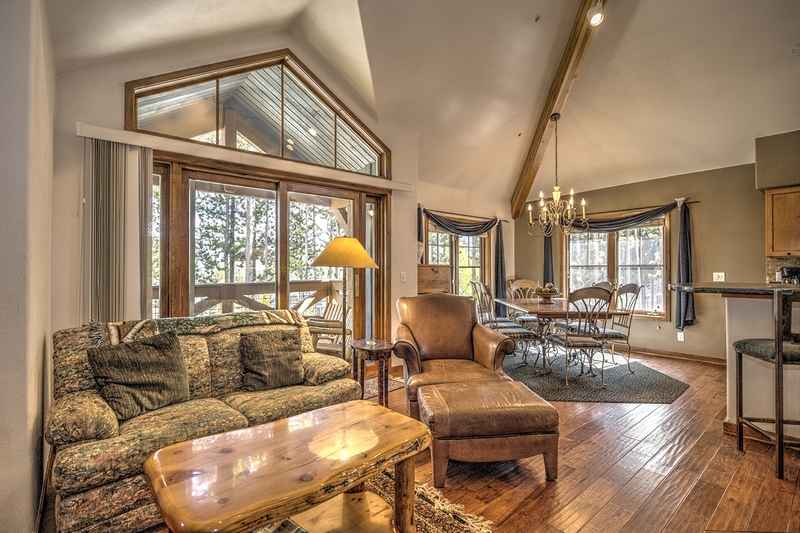 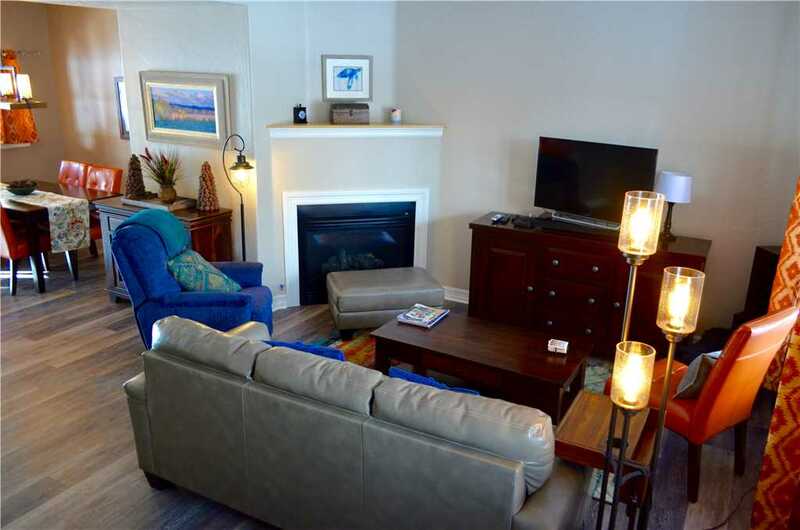 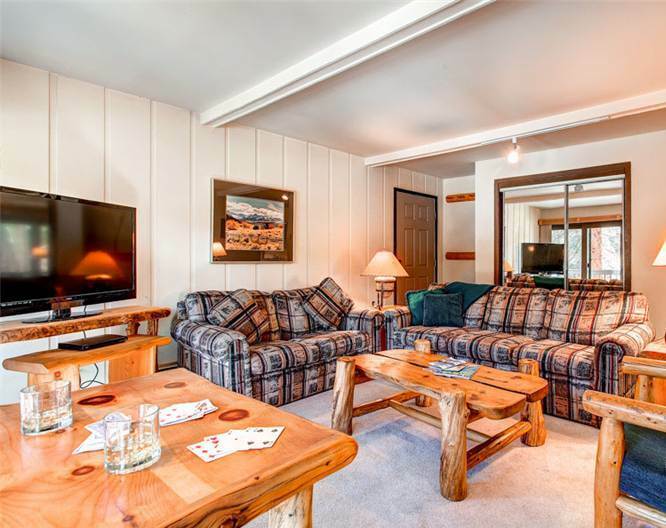 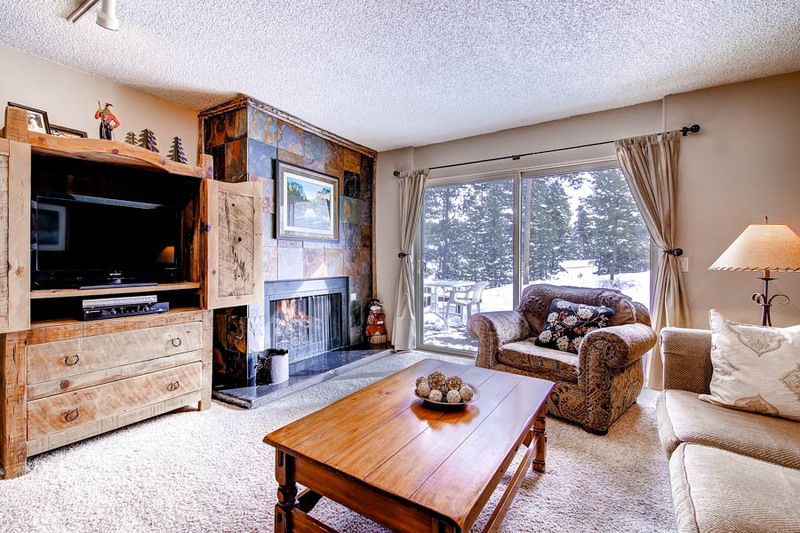 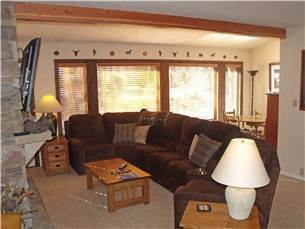 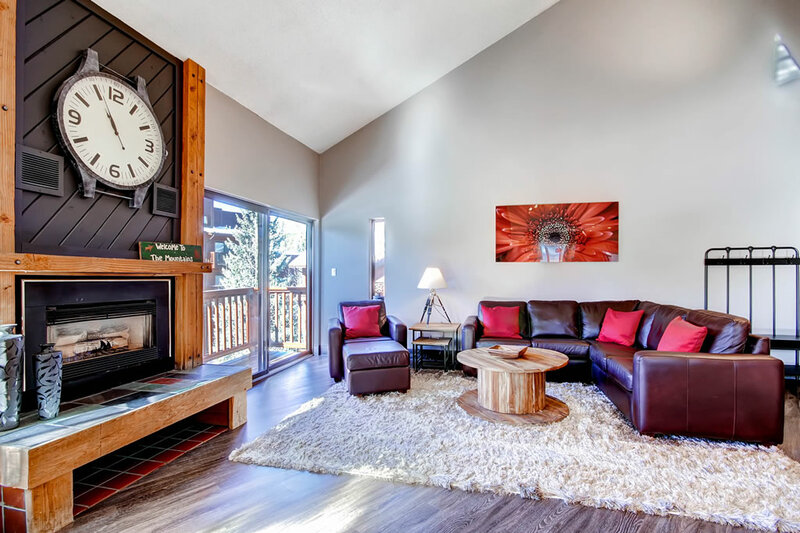 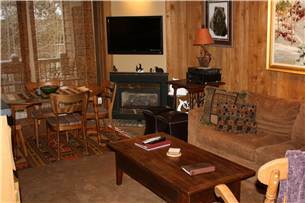 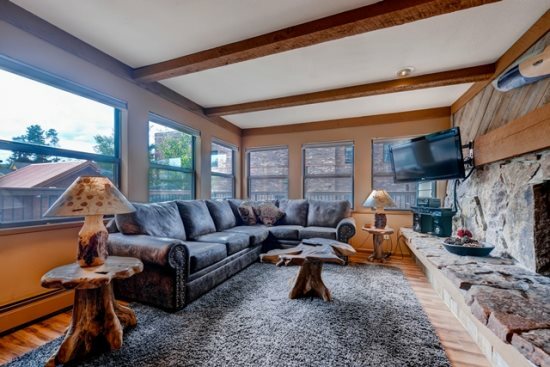 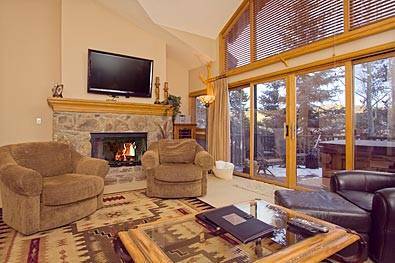 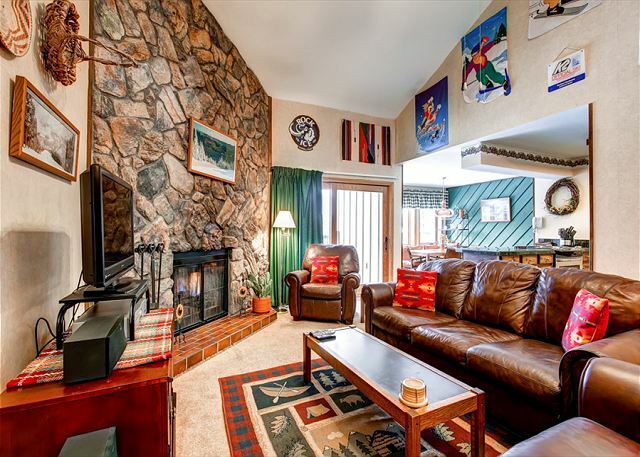 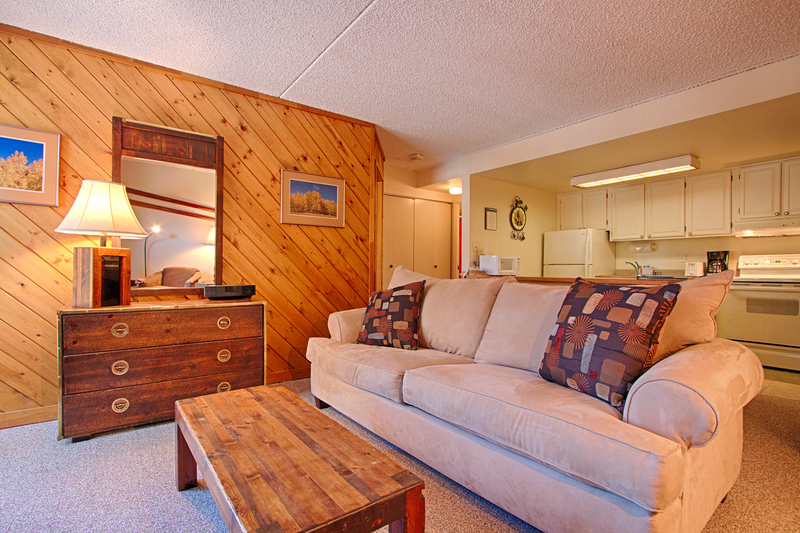 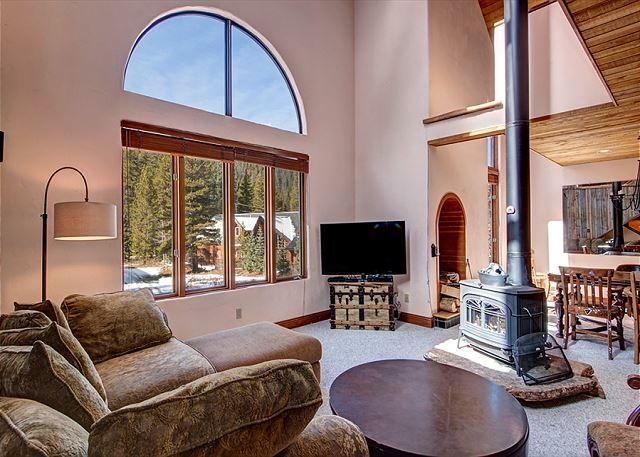 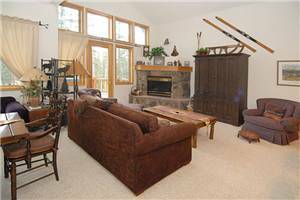 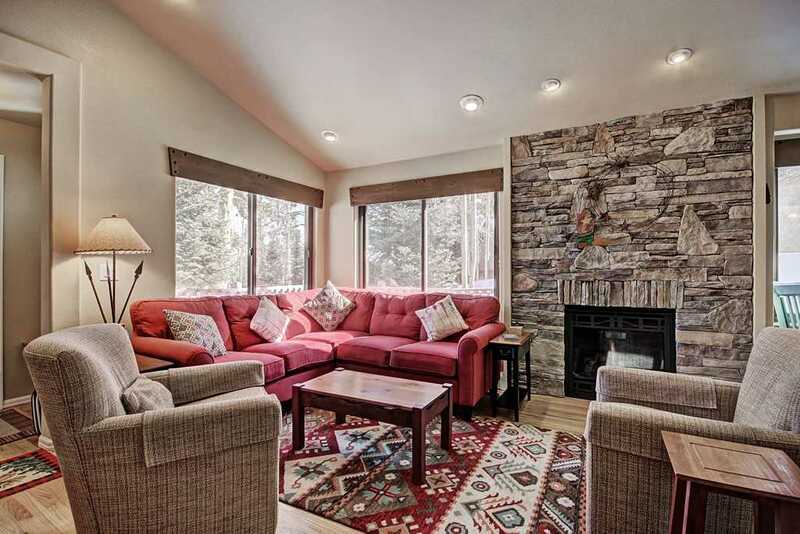 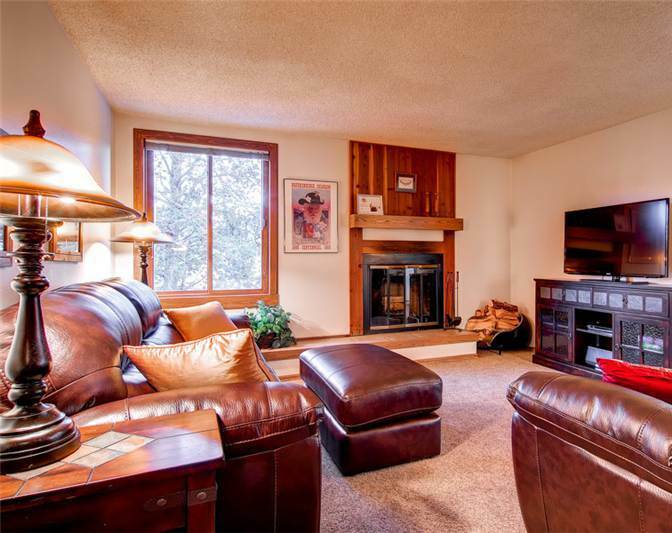 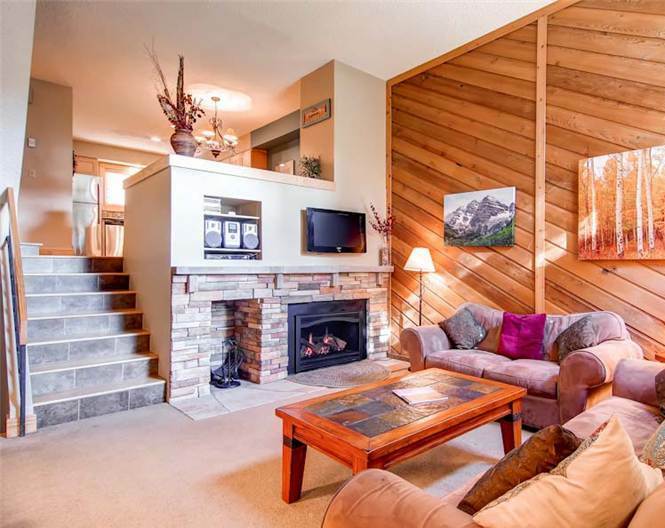 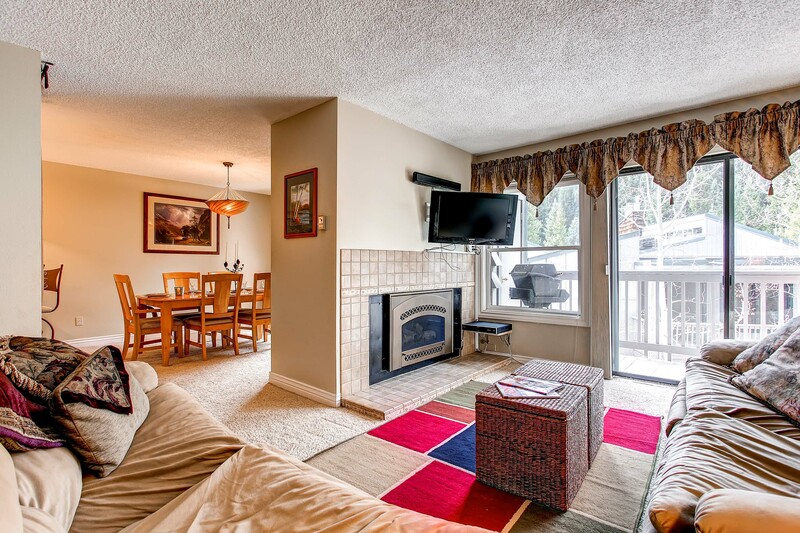 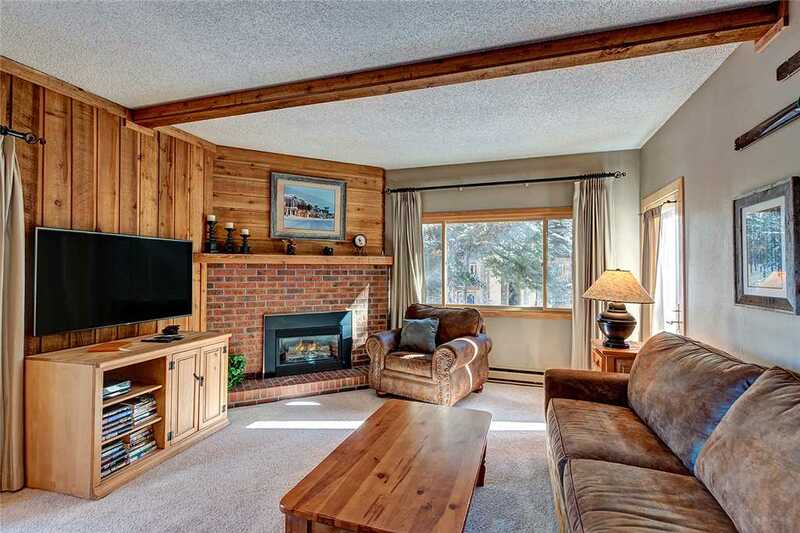 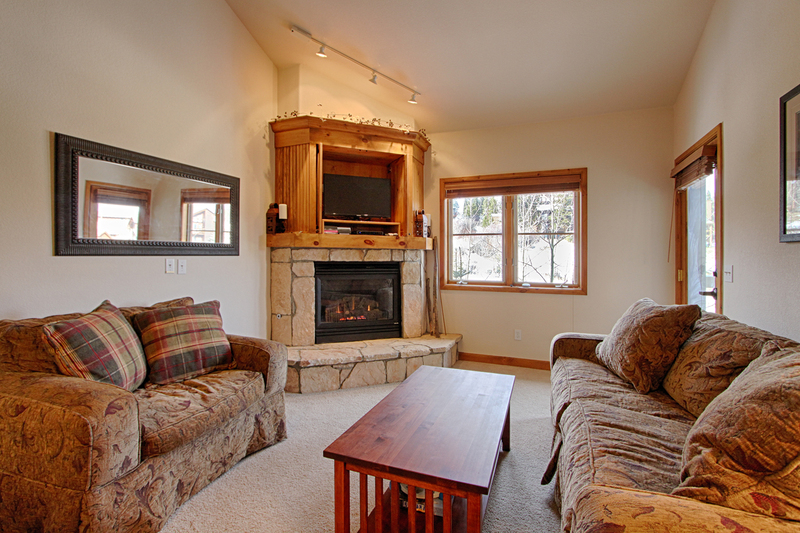 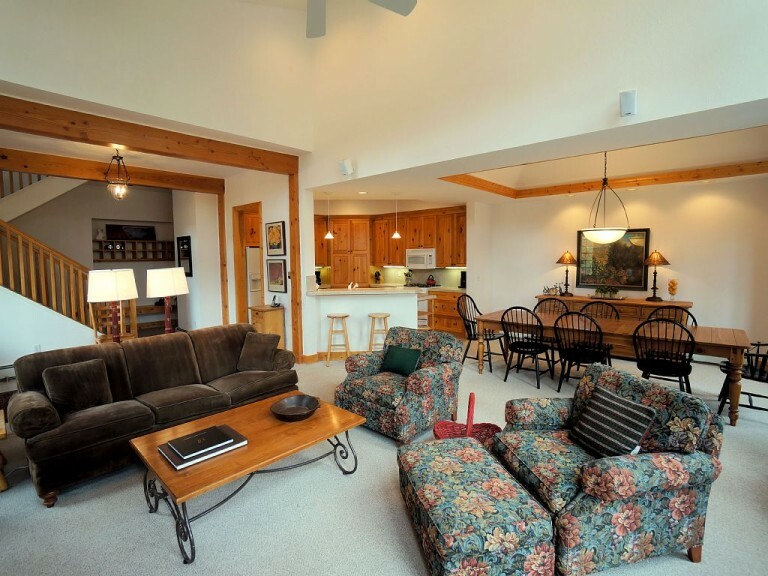 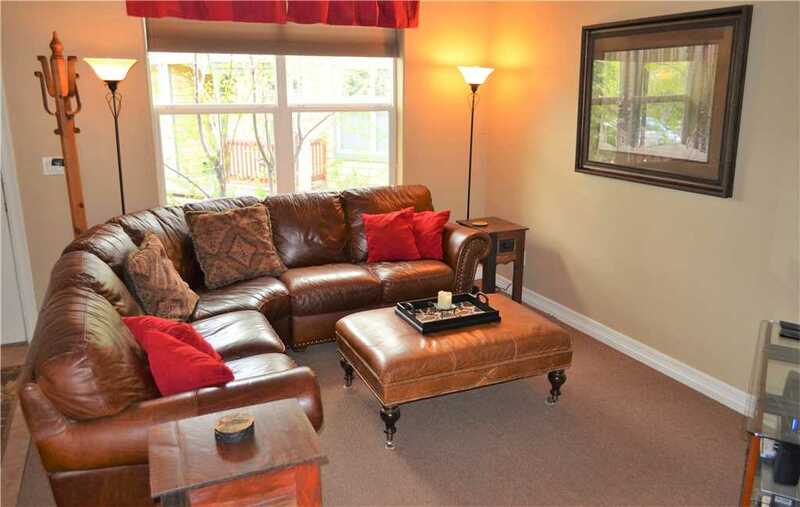 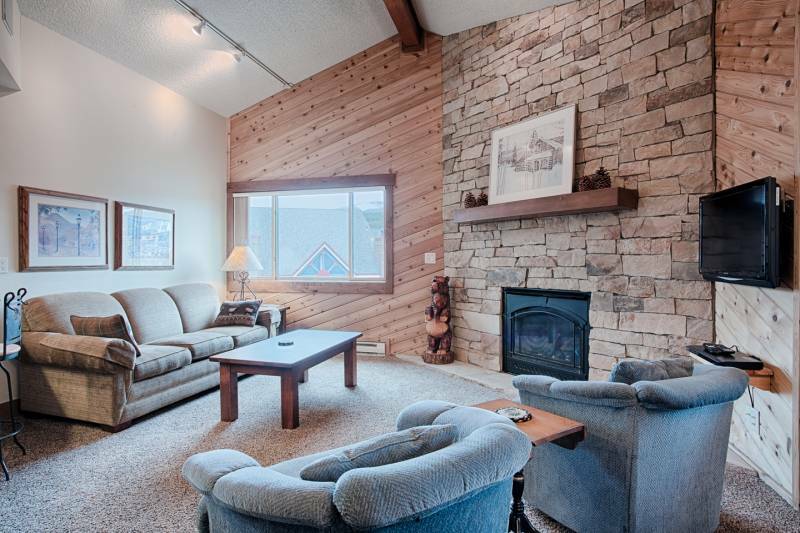 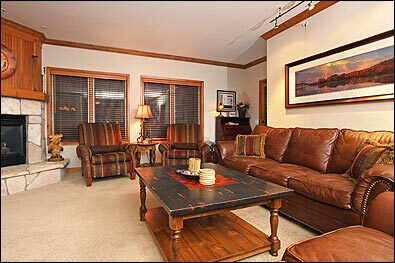 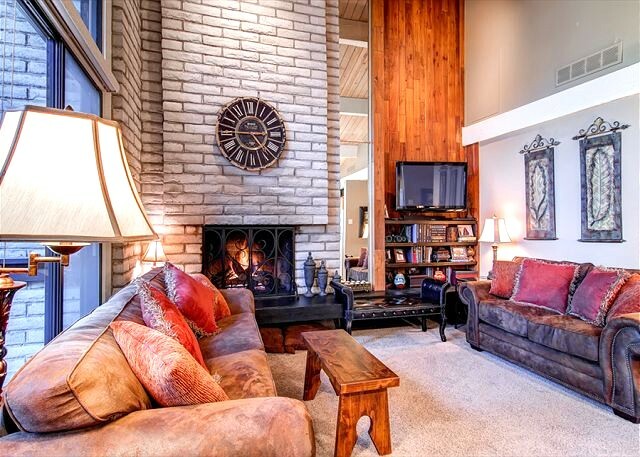 The living area is open and comfy, with a large river-rock gas fireplace, LCD-TV and plenty of seating for kicking back after a day of skiing or in the summer, biking, hiking, boating on Lake Dillon and more. 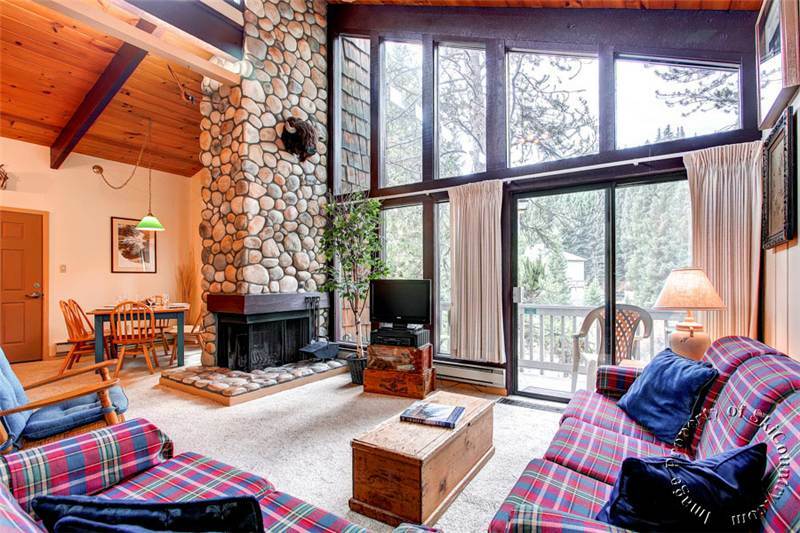 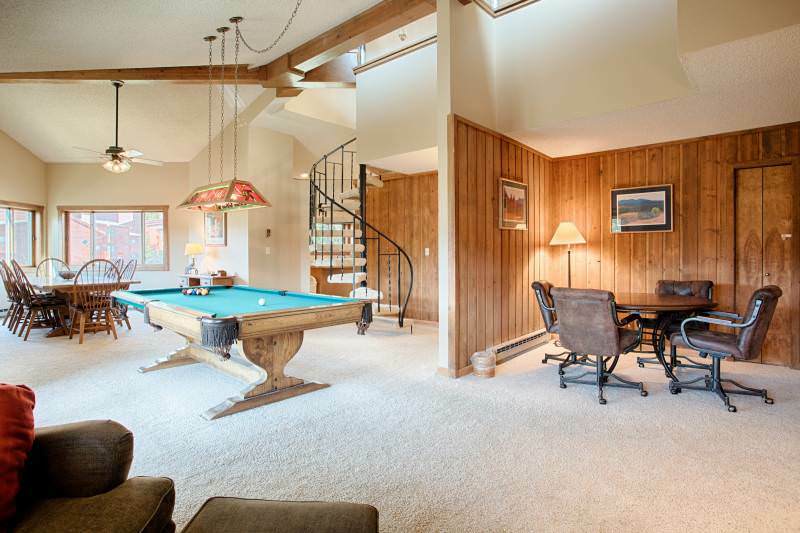 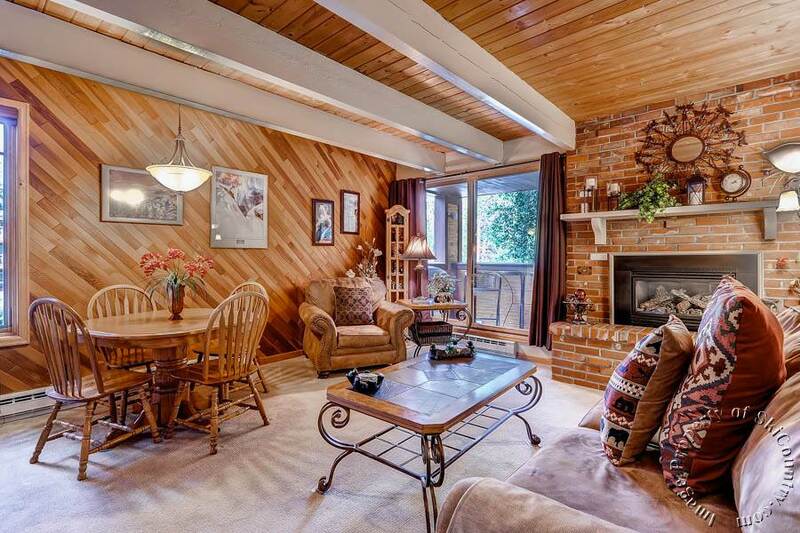 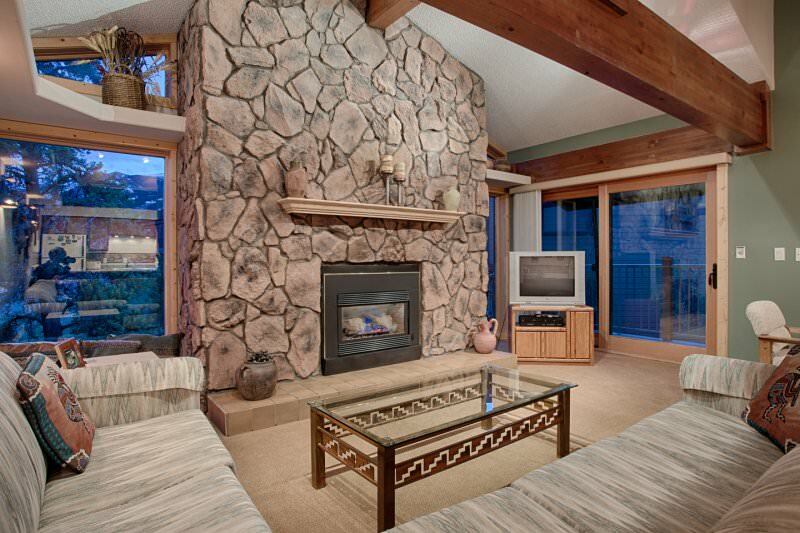 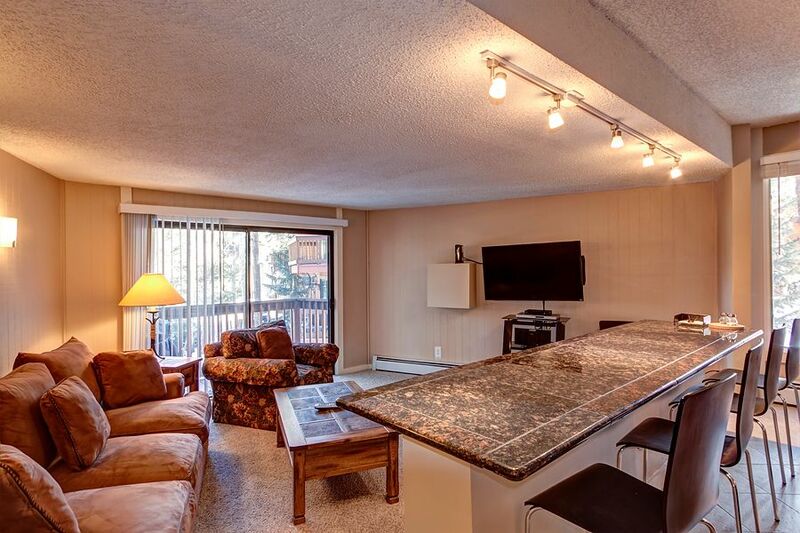 Next to the living area is this condo’s most unique feature: a large indoor hot tub. 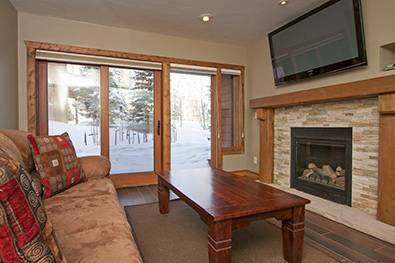 No cold walks across a snowy patio here: Just slip in and enjoy! 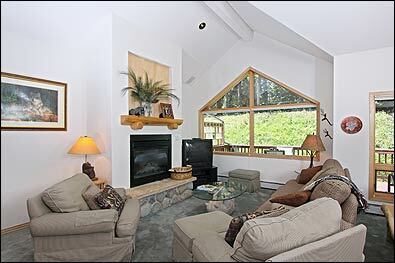 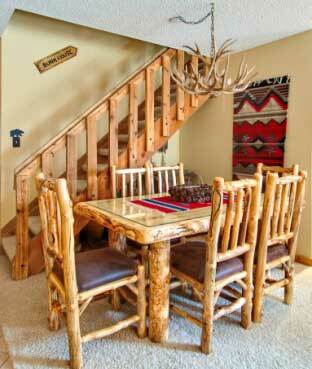 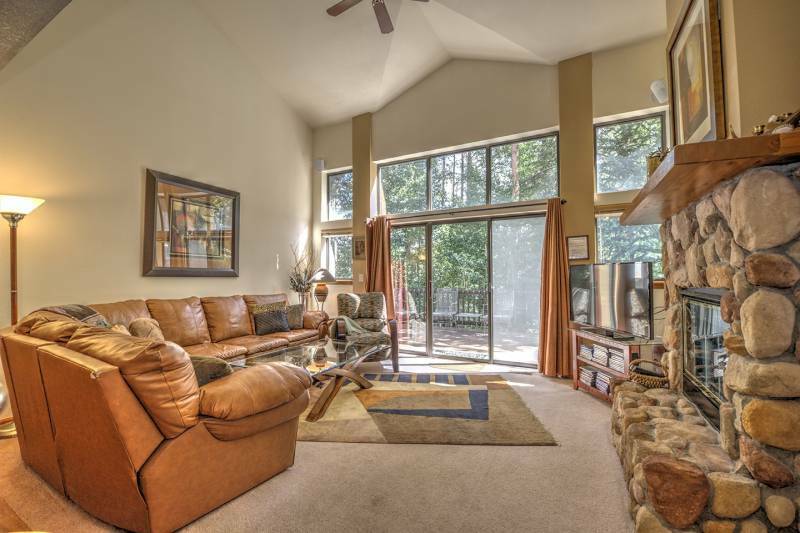 From here, the back patio backs up to the woods and the soothing sounds of the nearby creek in summer. 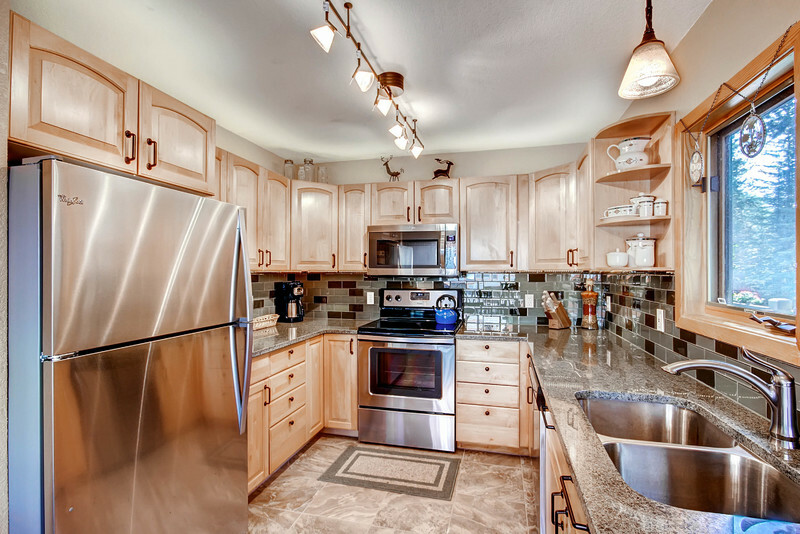 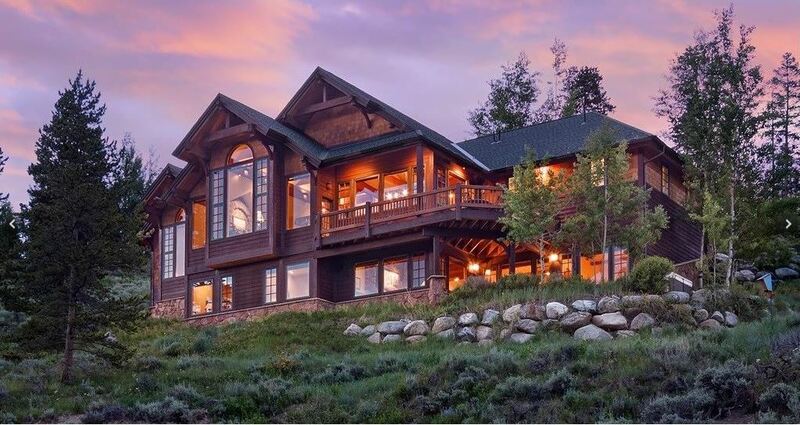 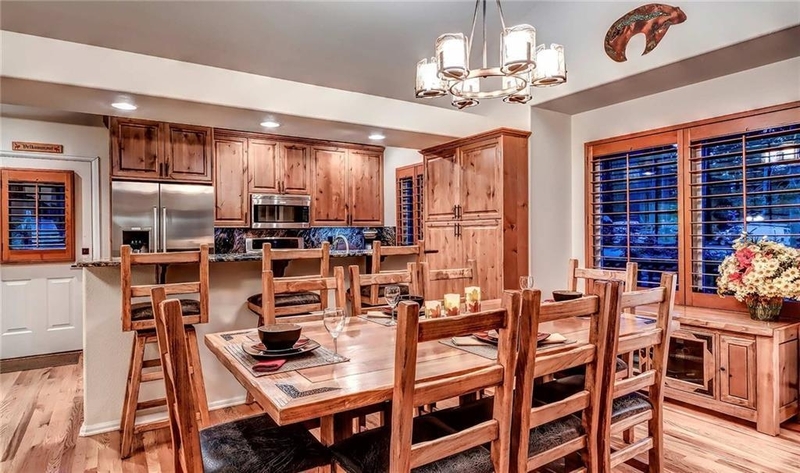 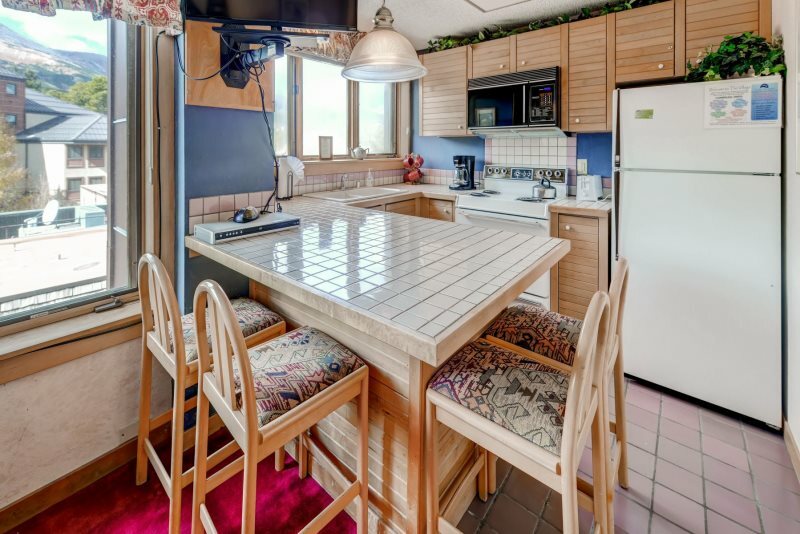 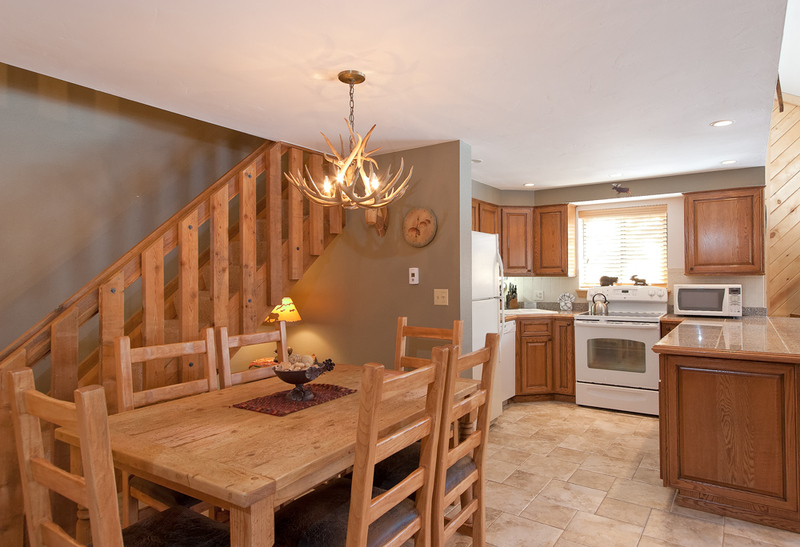 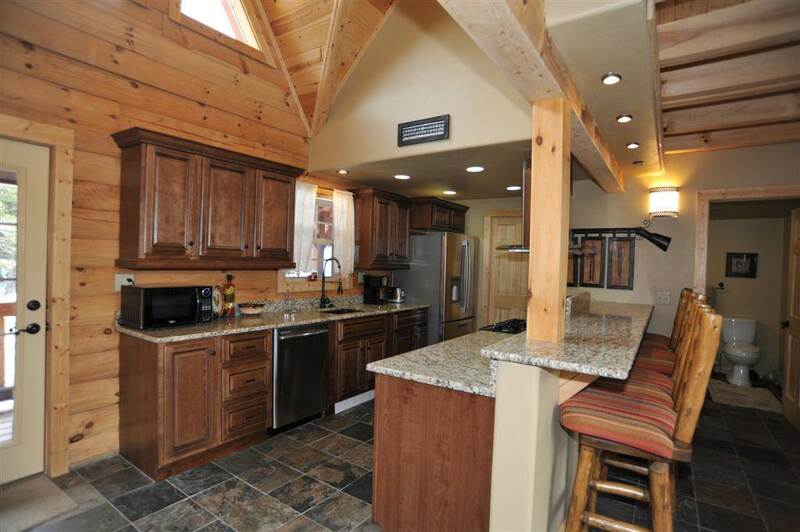 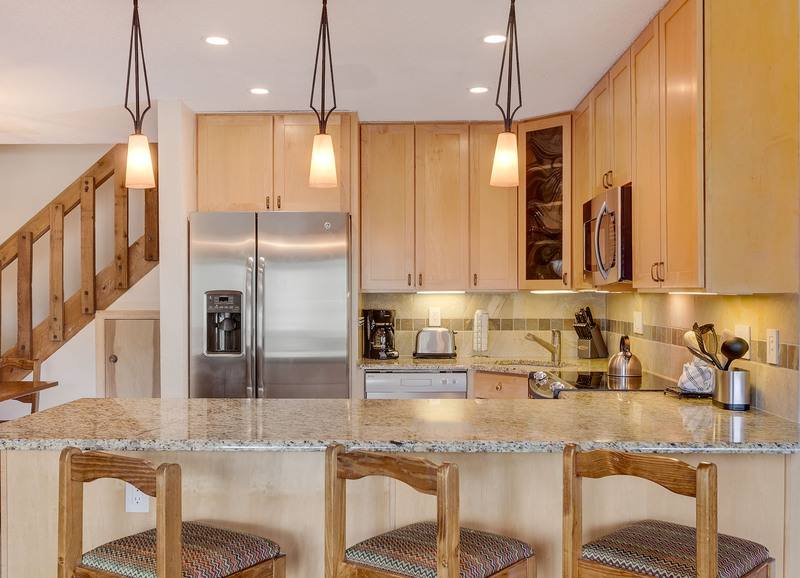 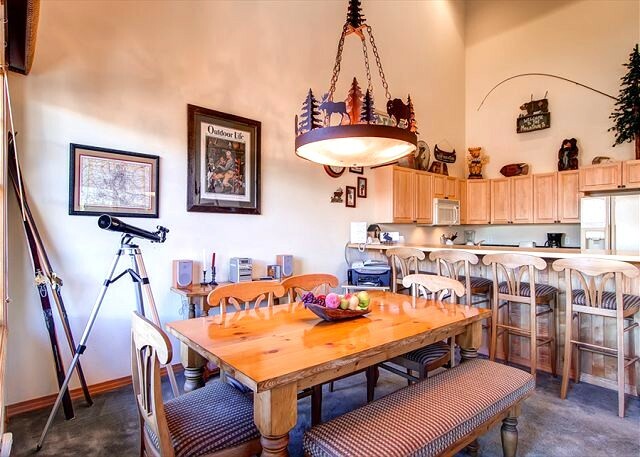 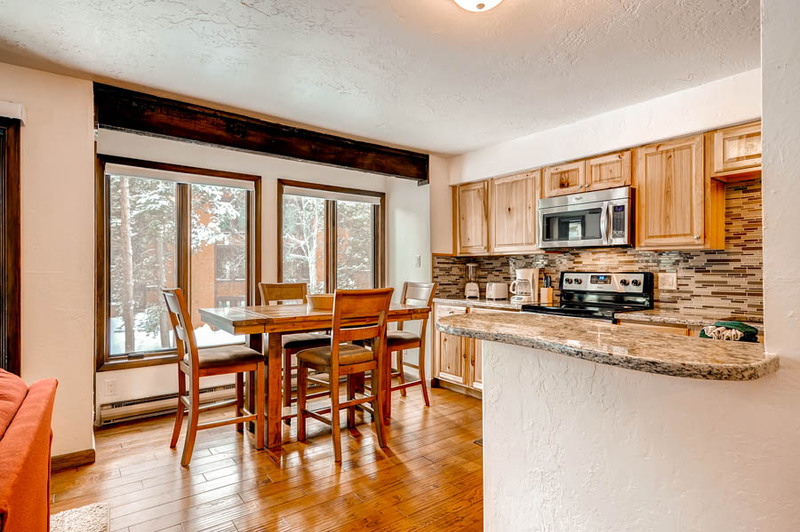 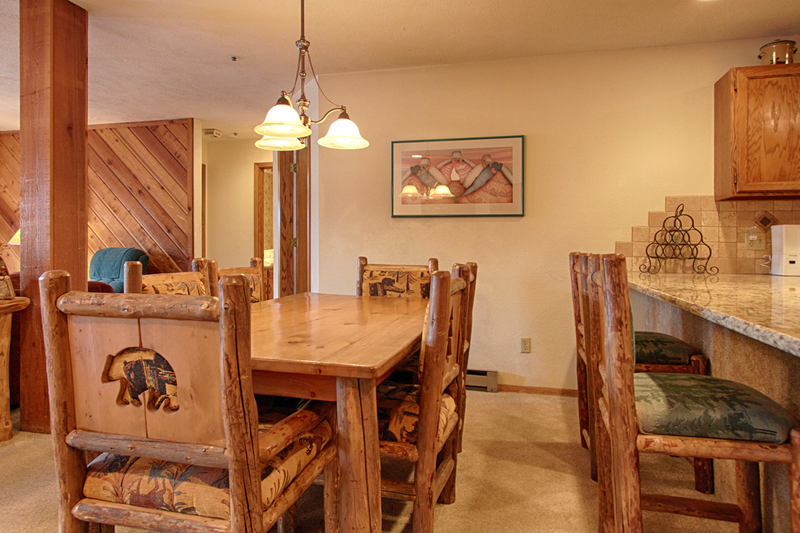 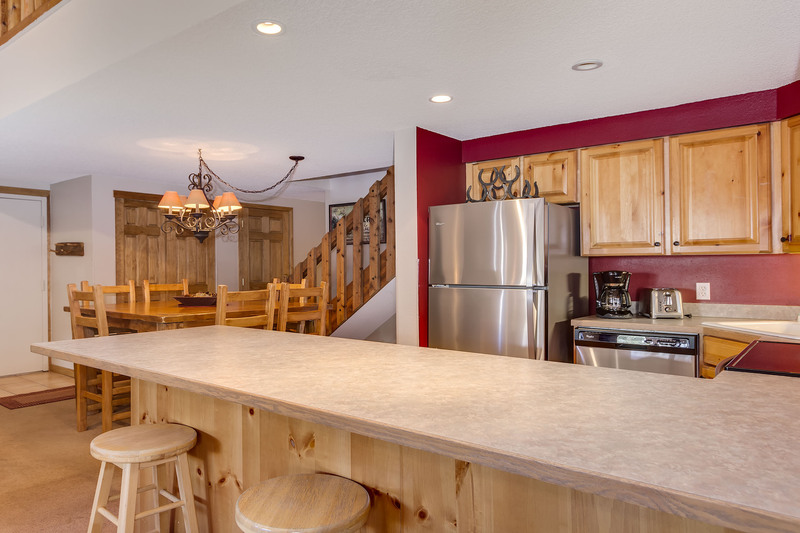 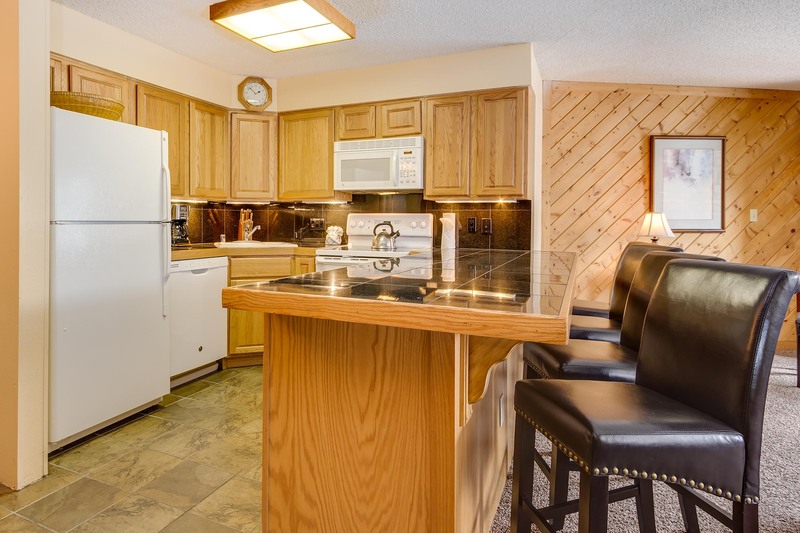 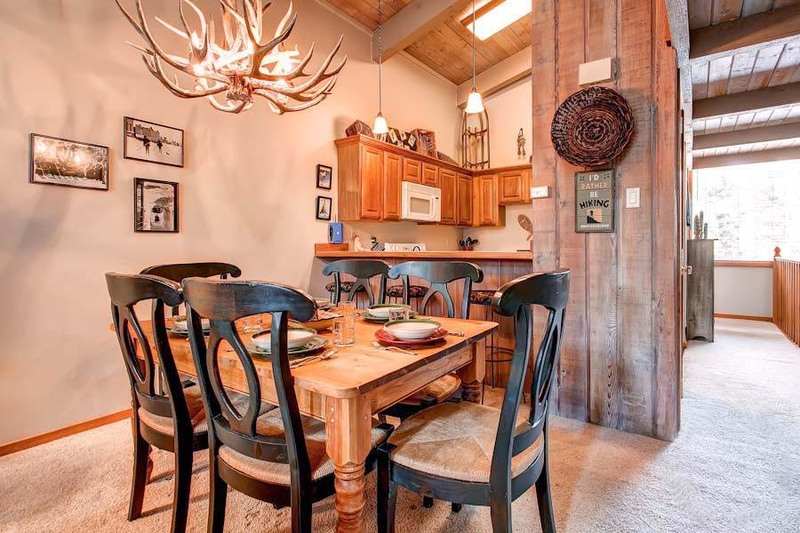 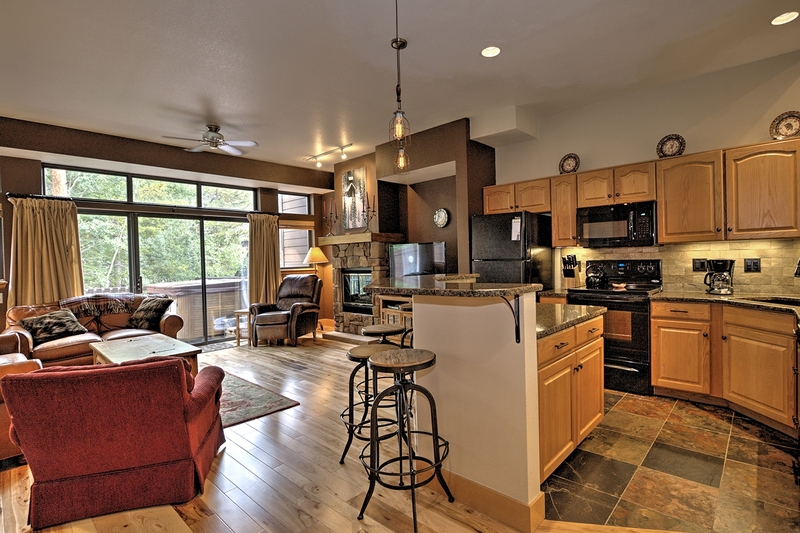 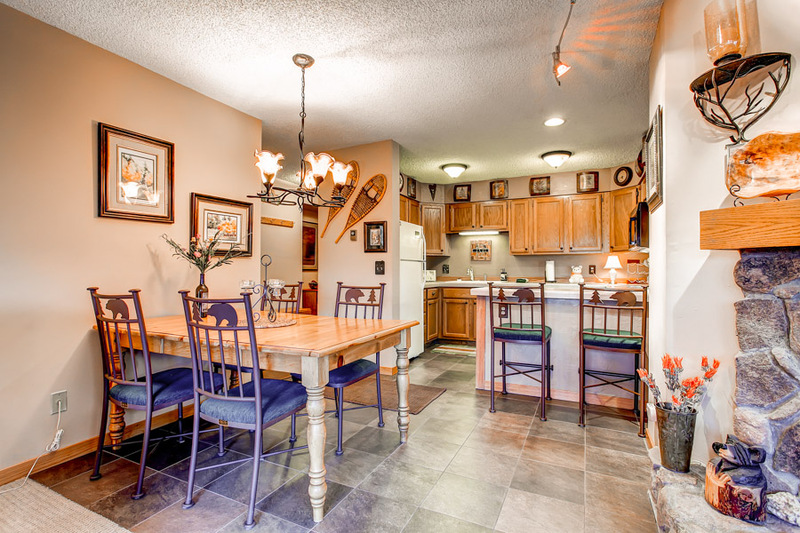 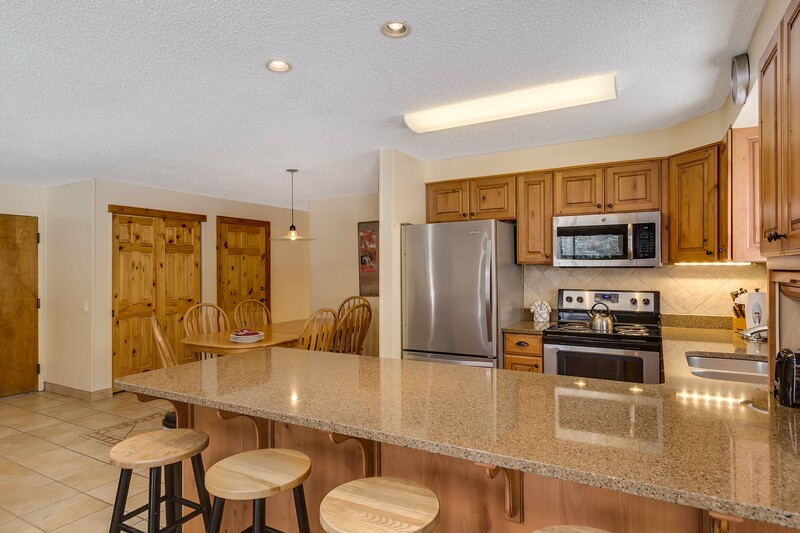 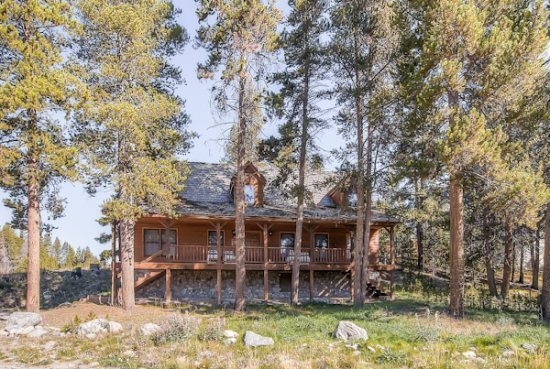 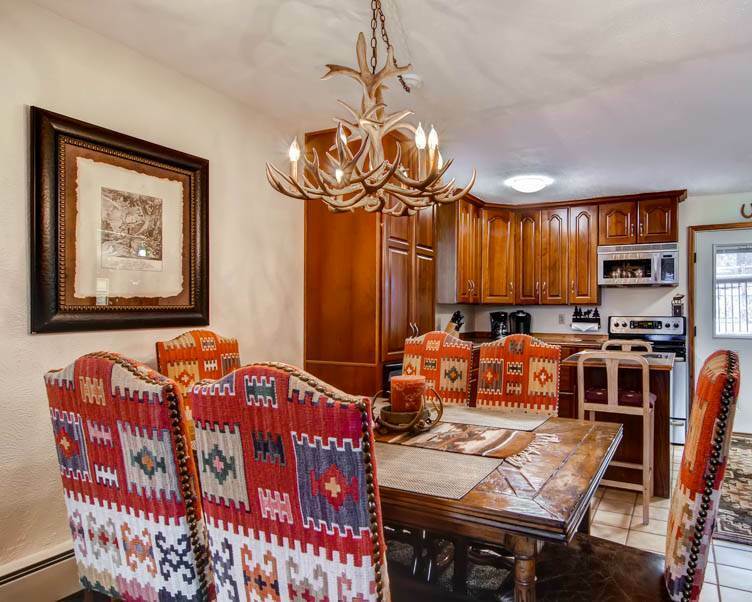 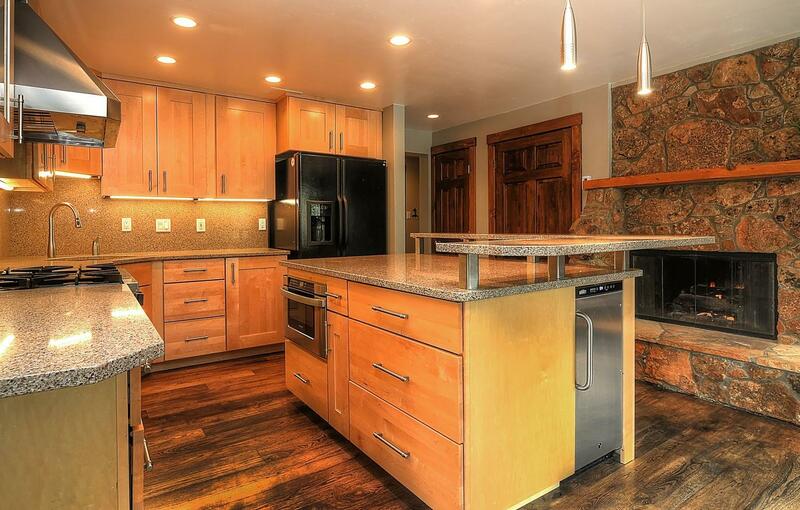 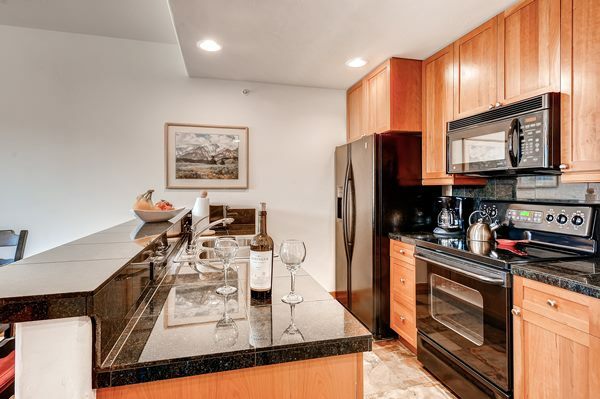 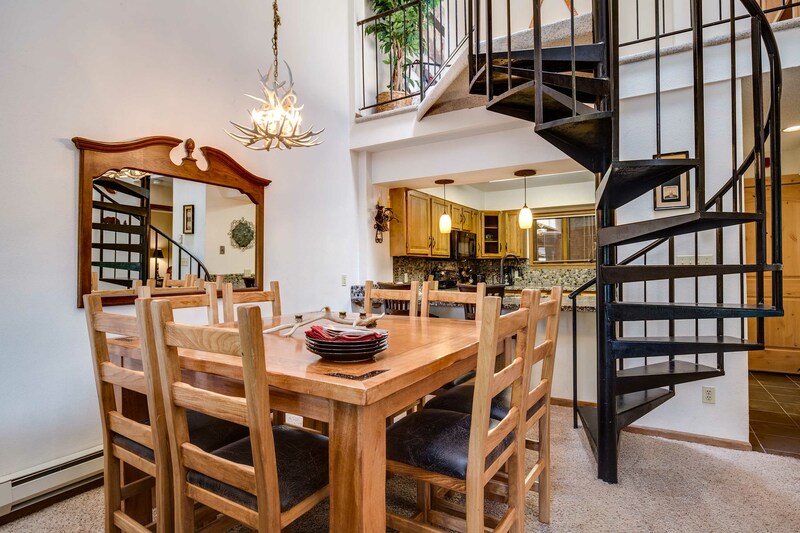 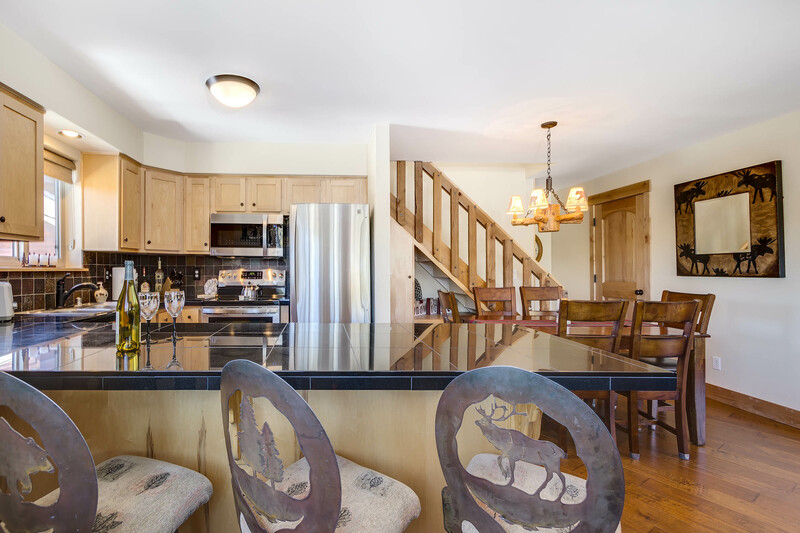 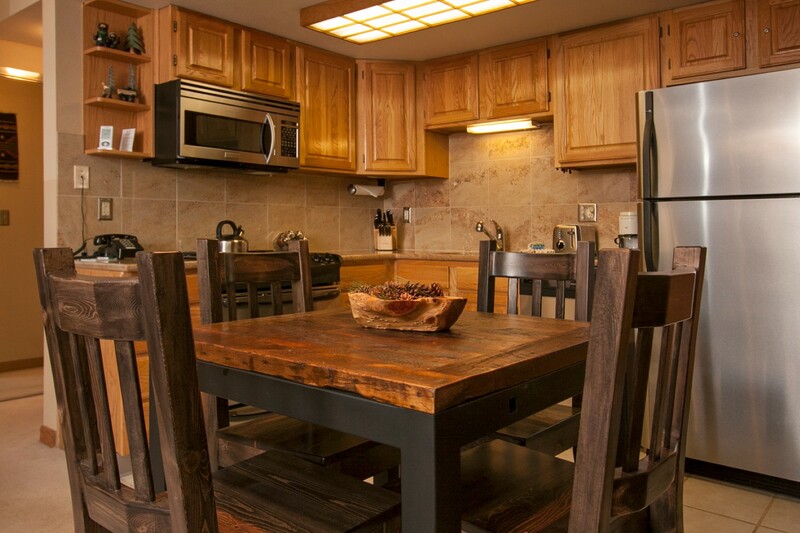 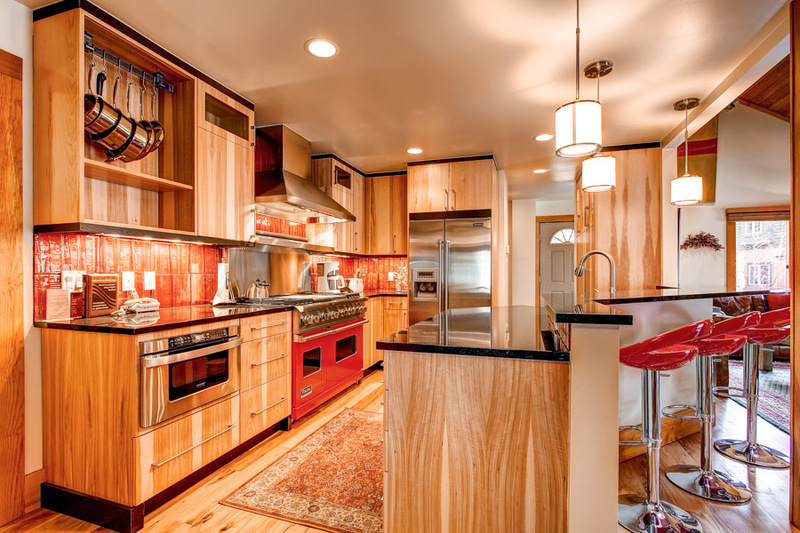 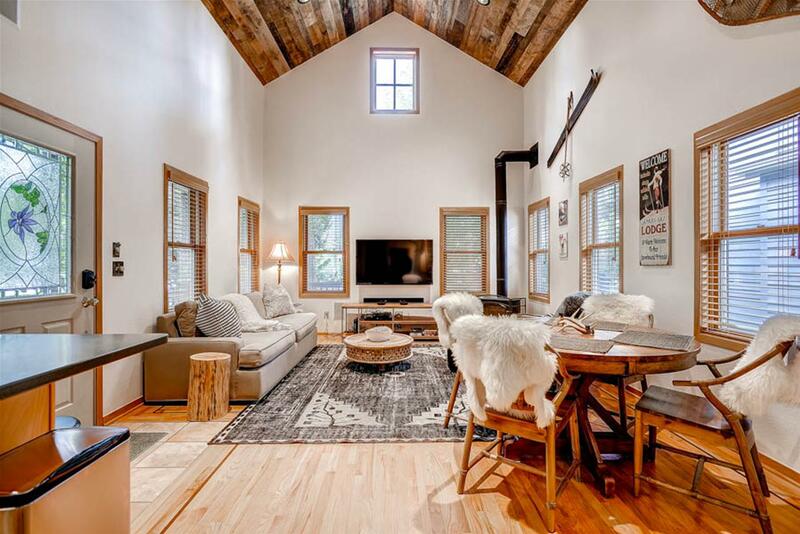 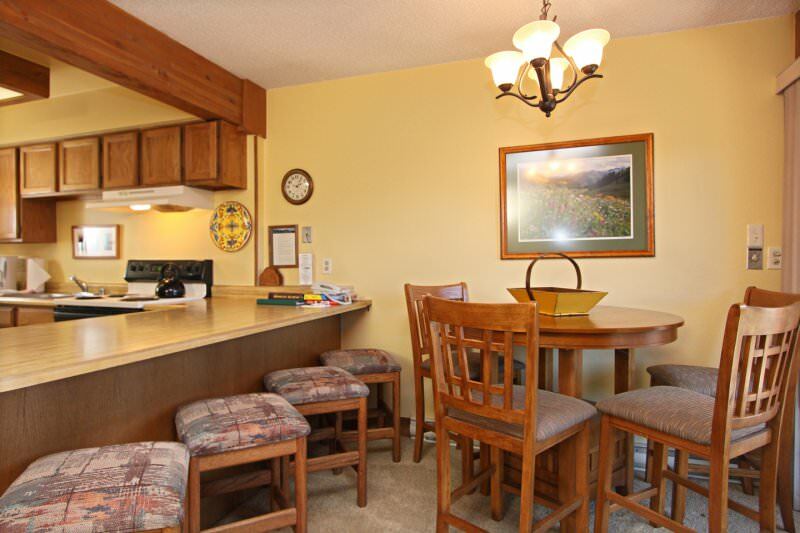 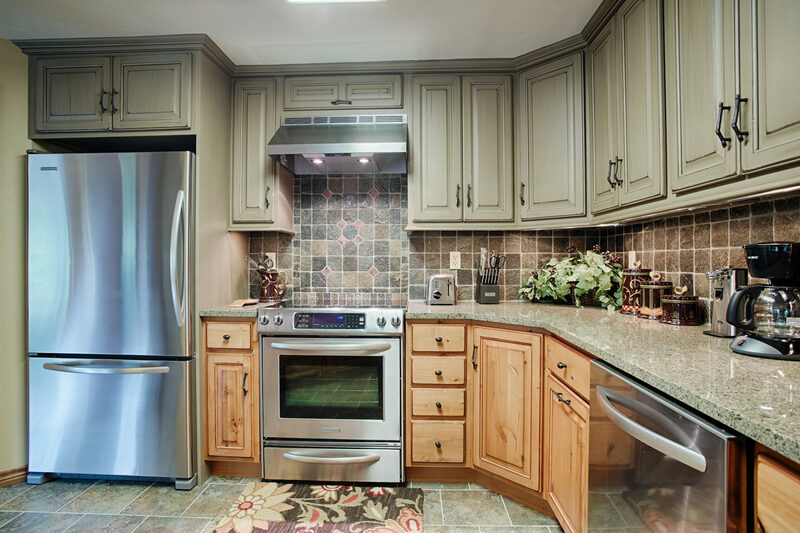 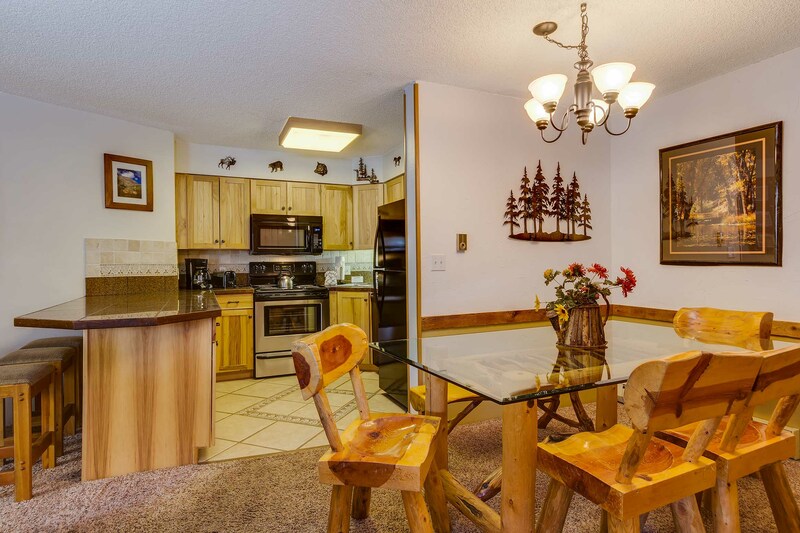 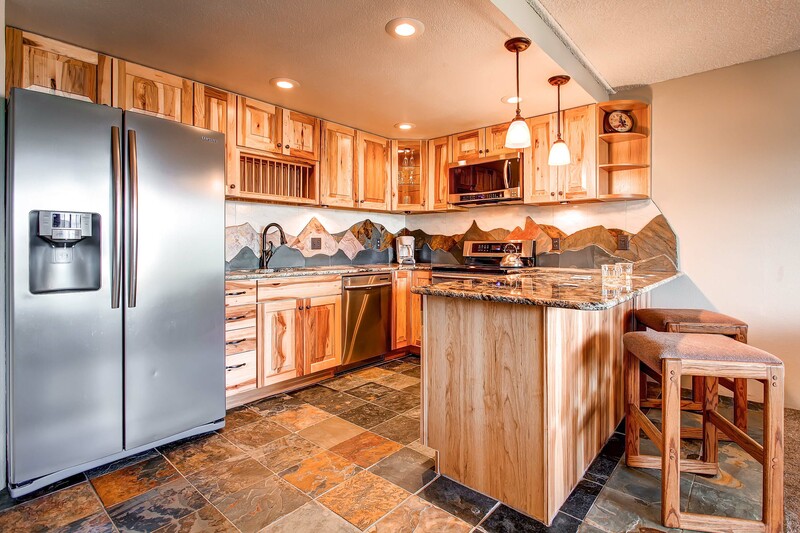 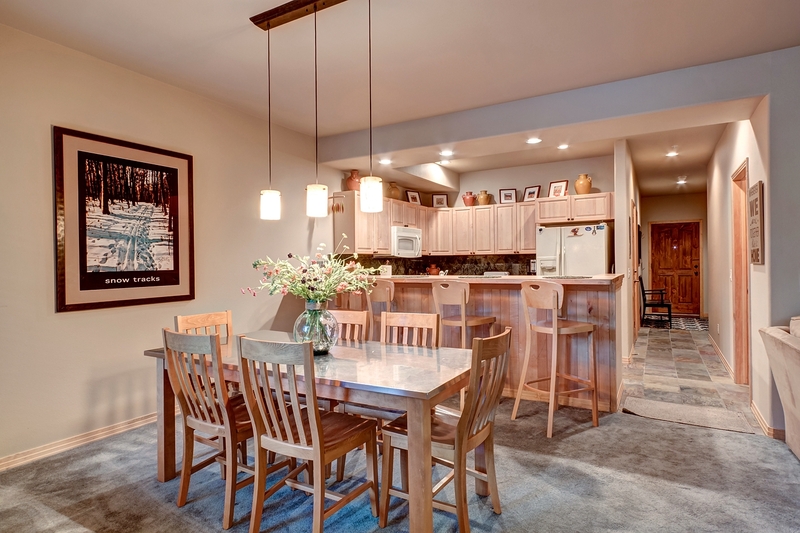 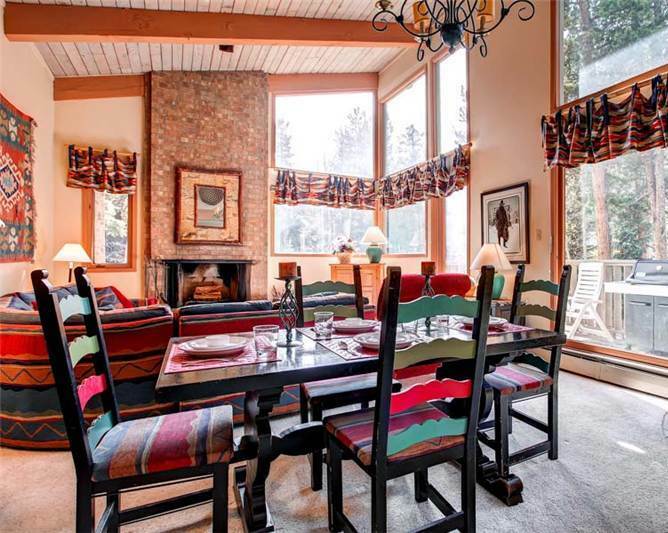 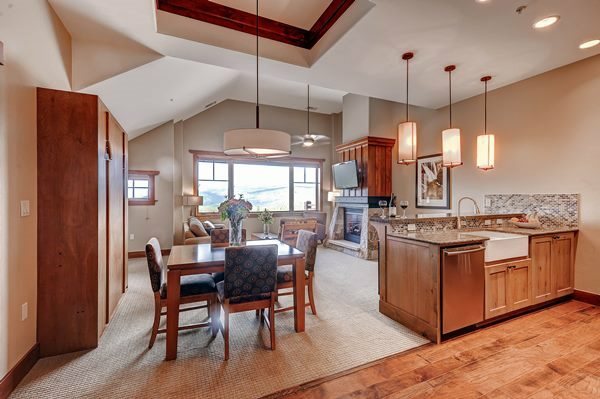 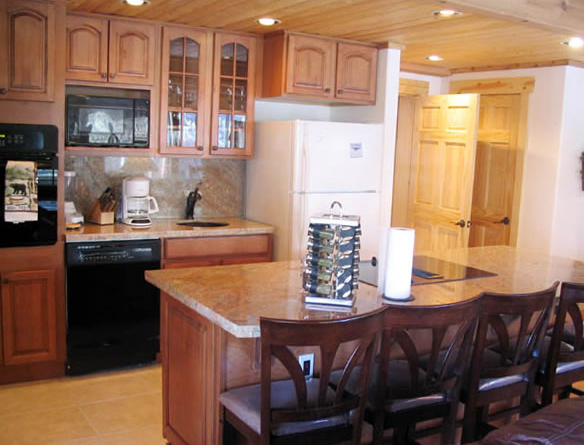 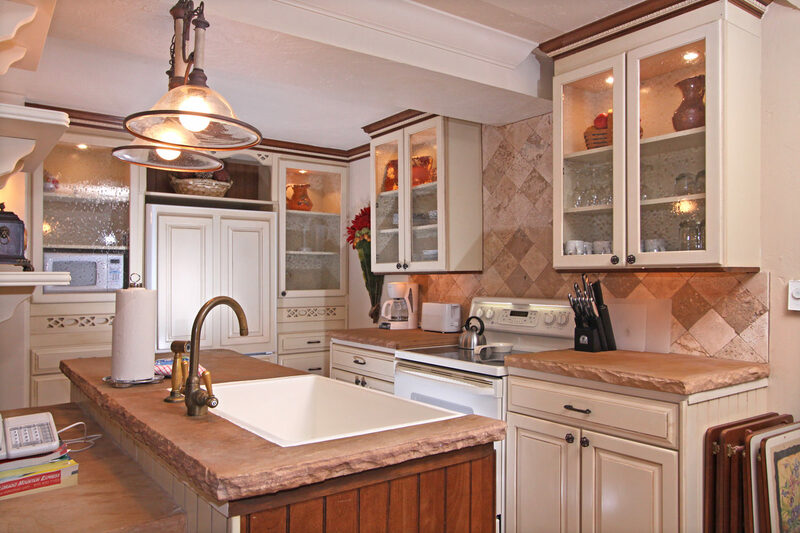 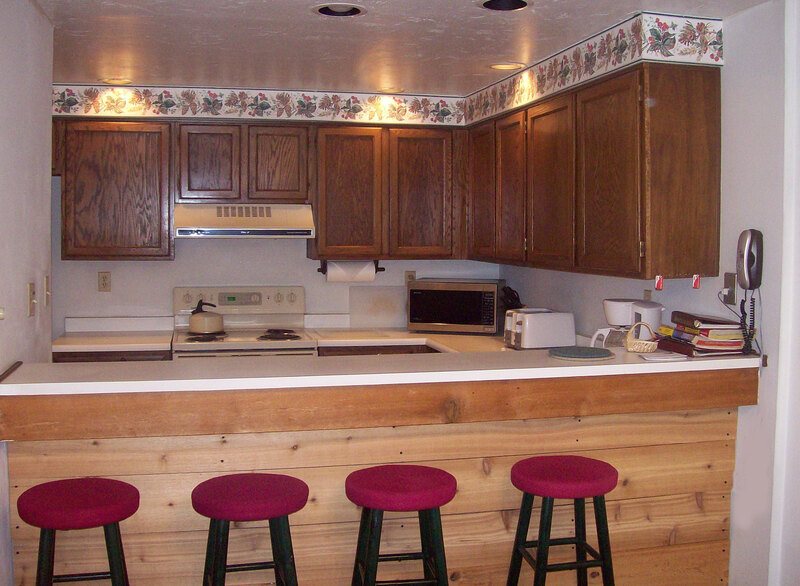 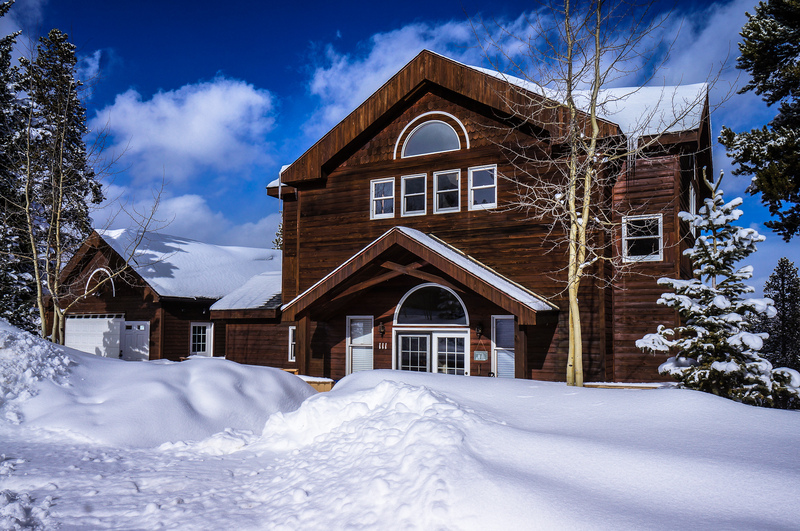 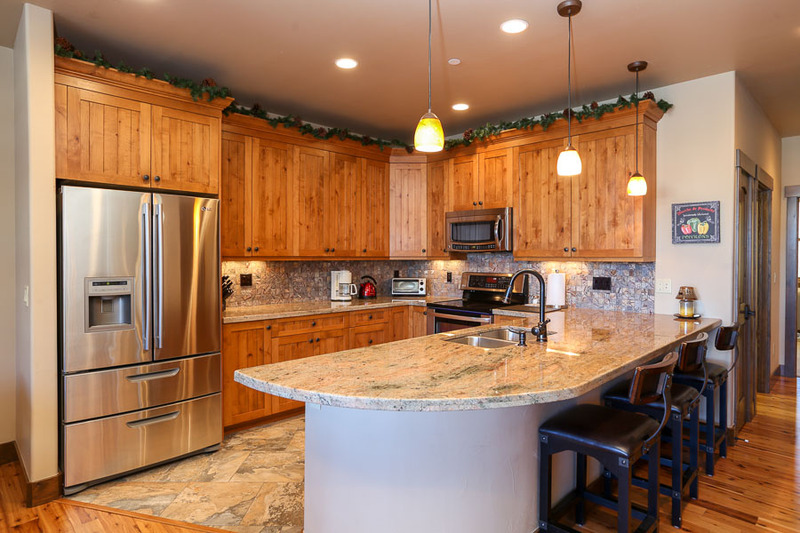 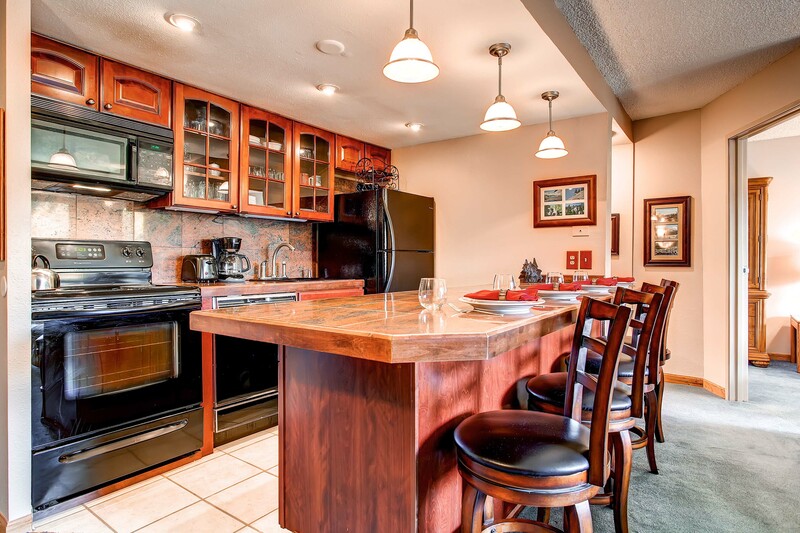 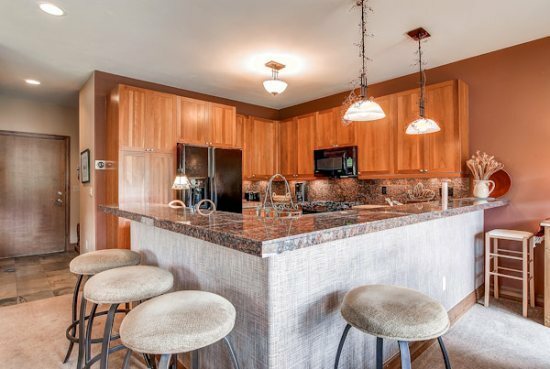 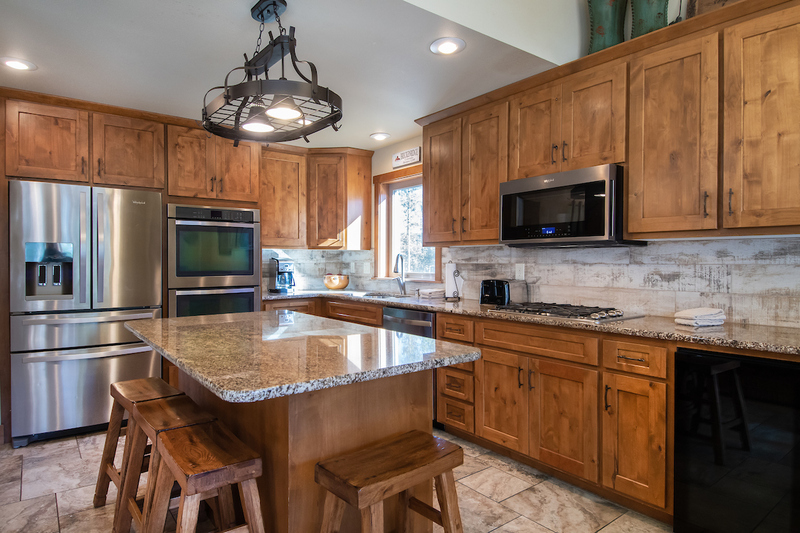 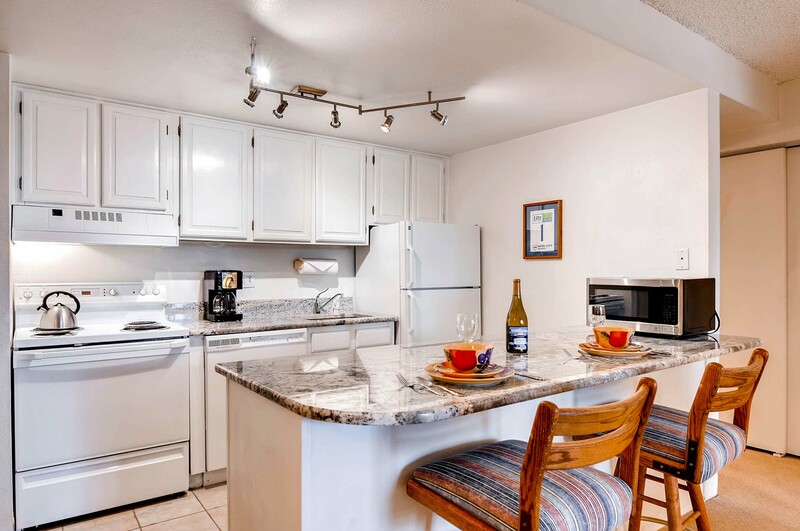 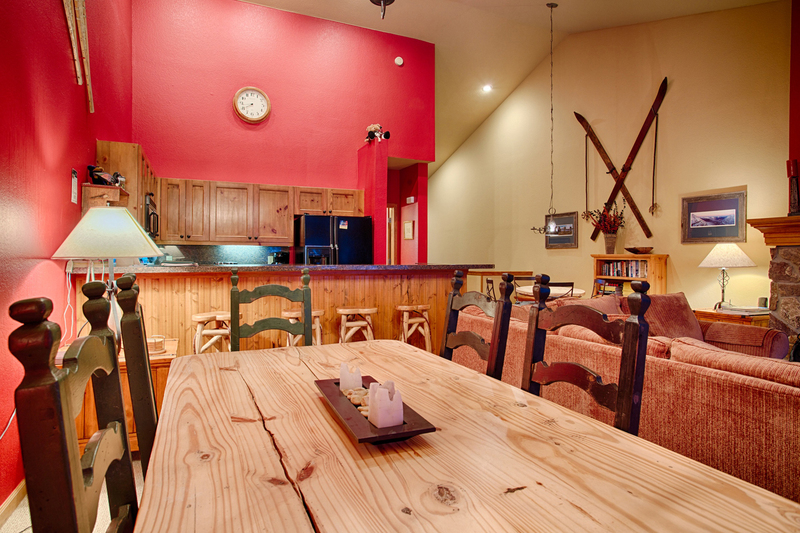 There’s a fully stocked kitchen with stainless steel appliances, perfect for whipping up memorable mountain meals; there’s seating for six at the dining table and more at the counter. 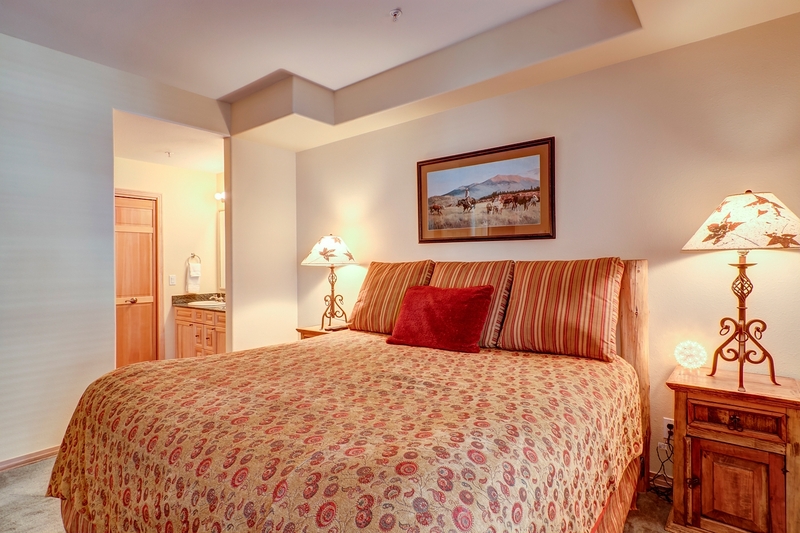 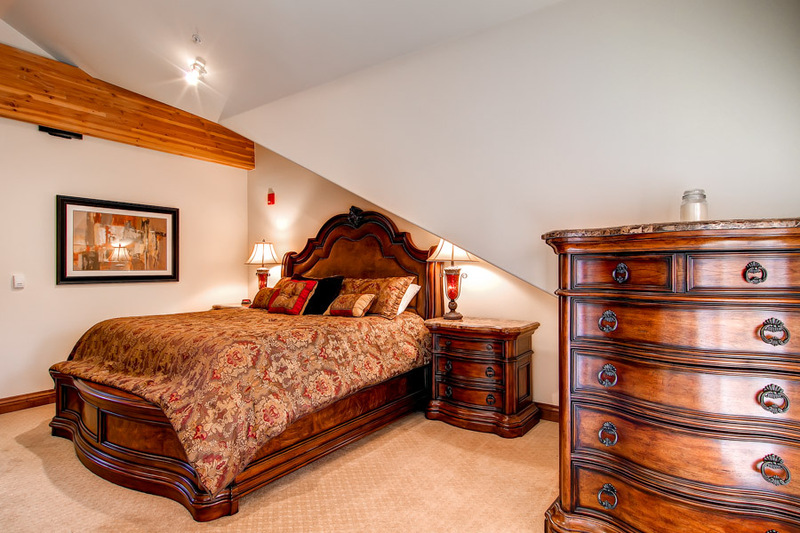 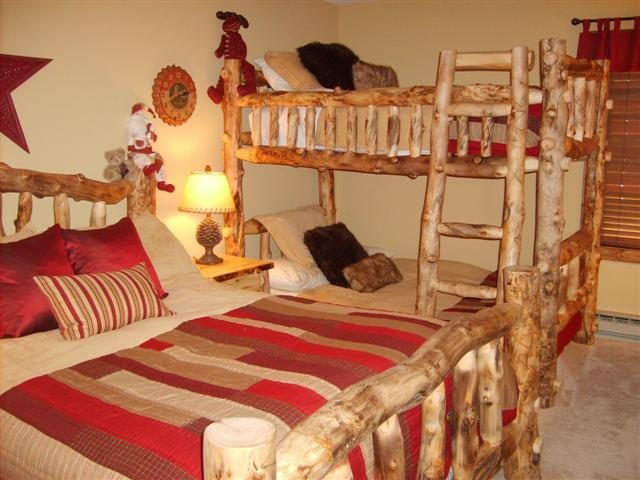 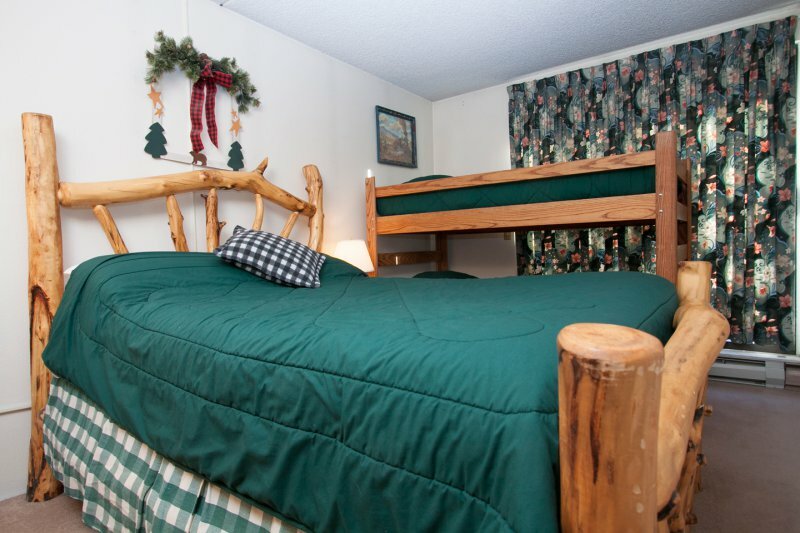 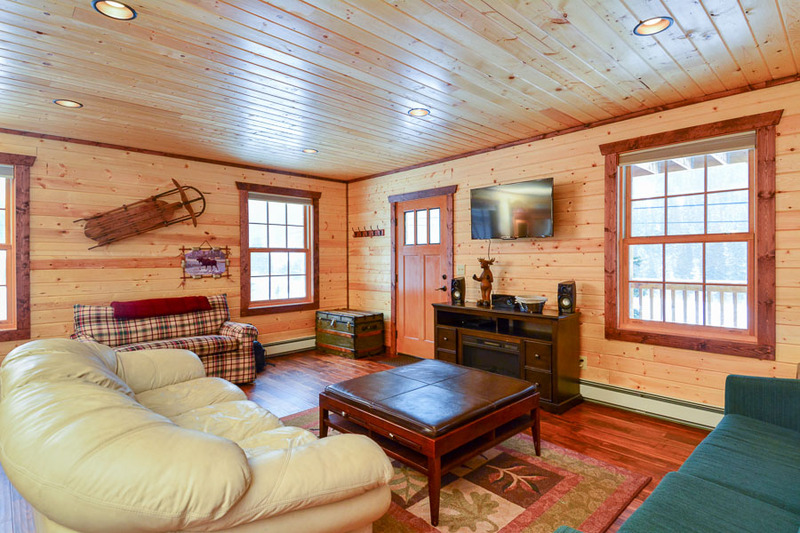 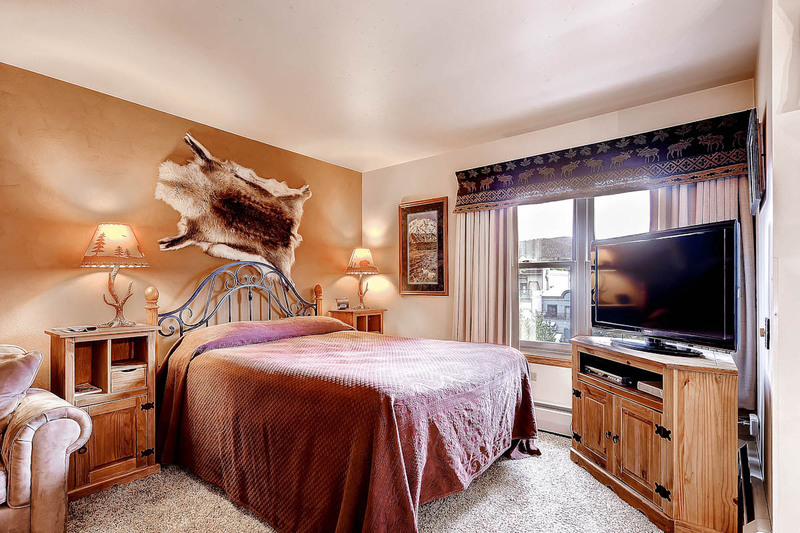 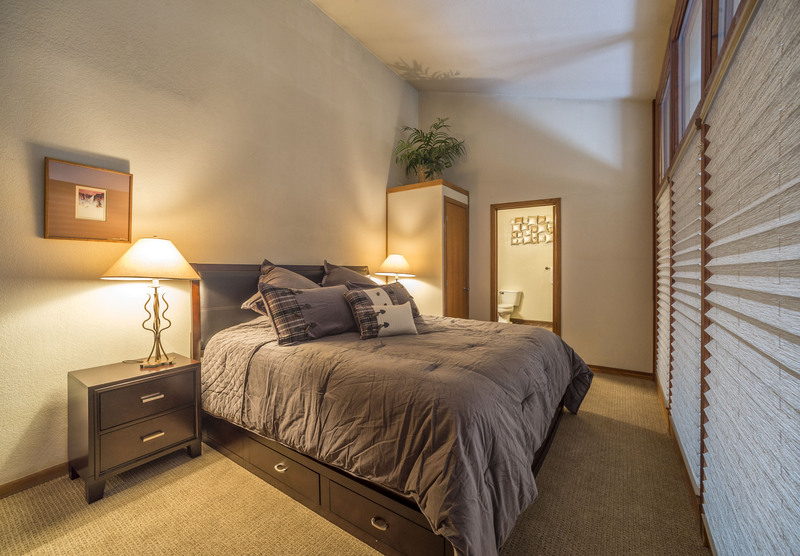 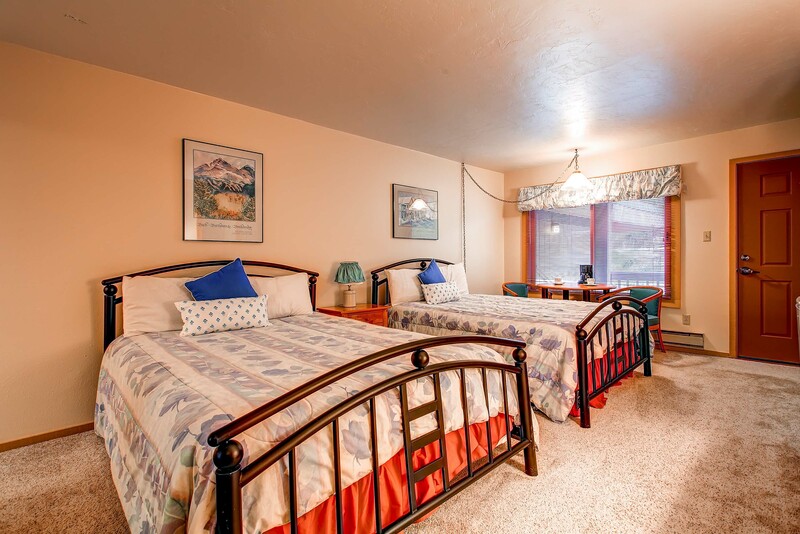 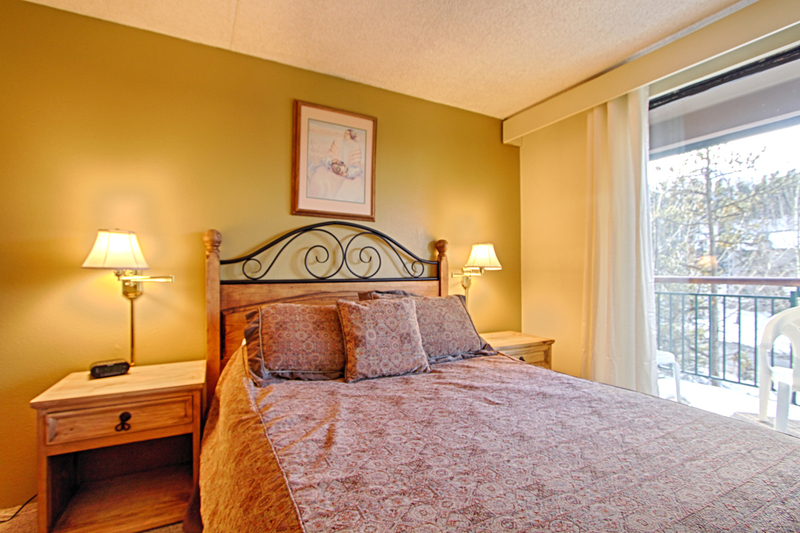 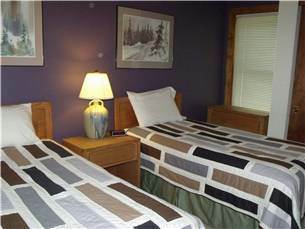 Downstairs, there’s a full master suite with a king bed, private bathroom, LCD-TV and private entrance; upstairs, two more bedrooms (one with a queen bed, the other with two bunk beds) provide space for everyone. 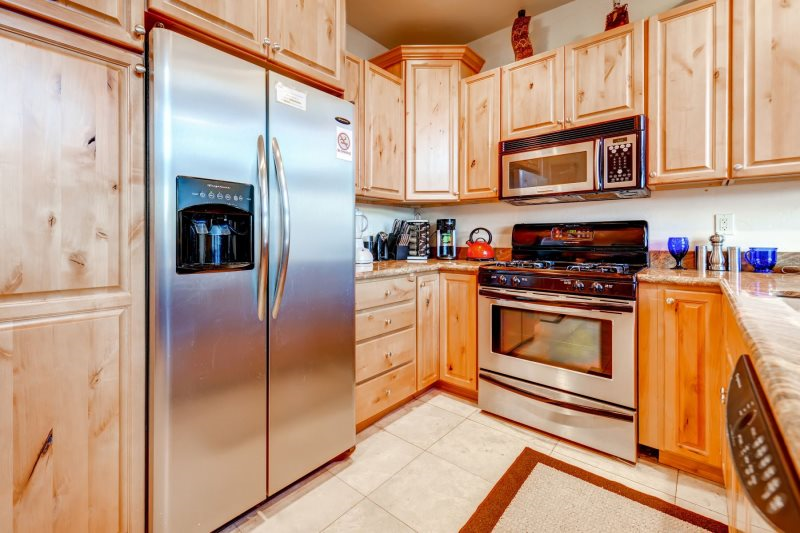 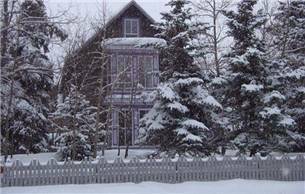 Other amenities include a washer and dryer, a one-car garage with parking for one more in the driveway, and complementary Wi-Fi throughout the home. 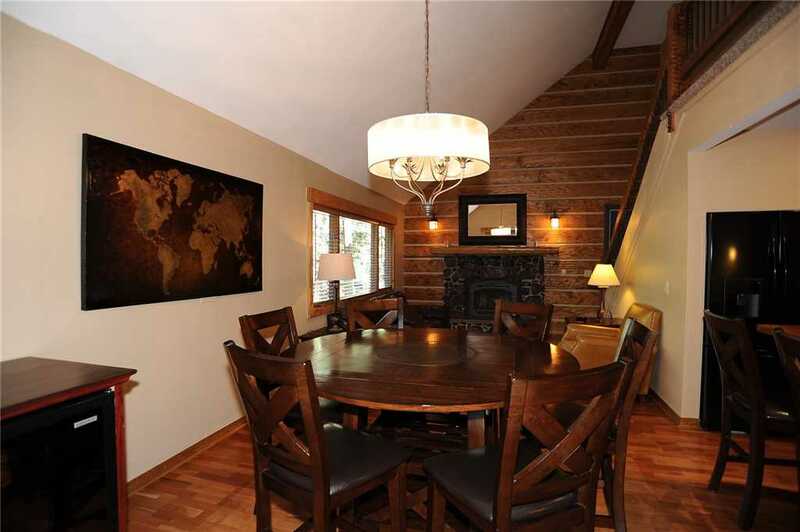 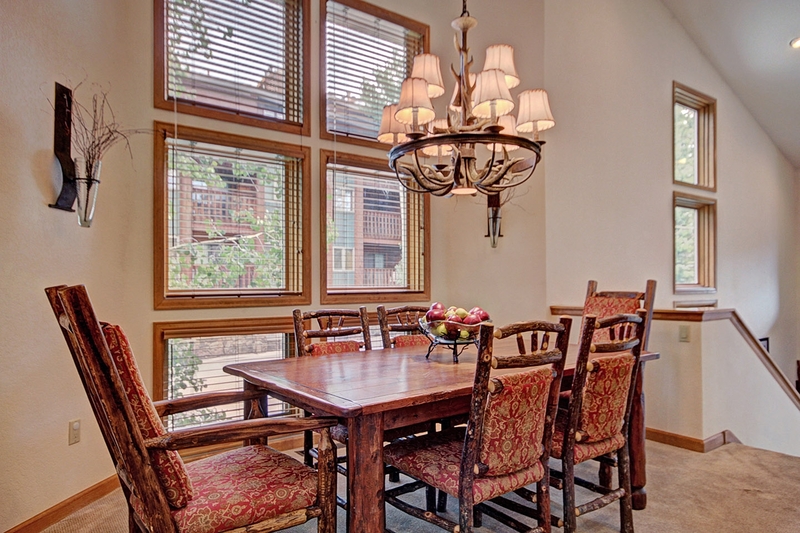 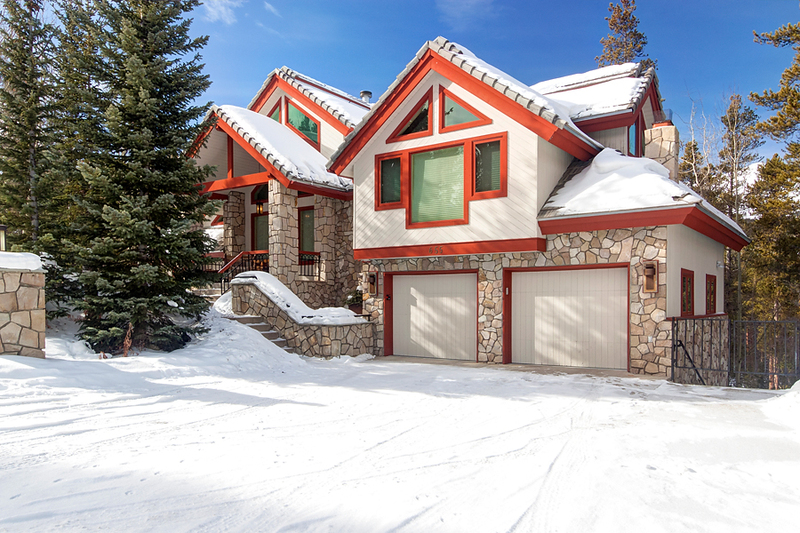 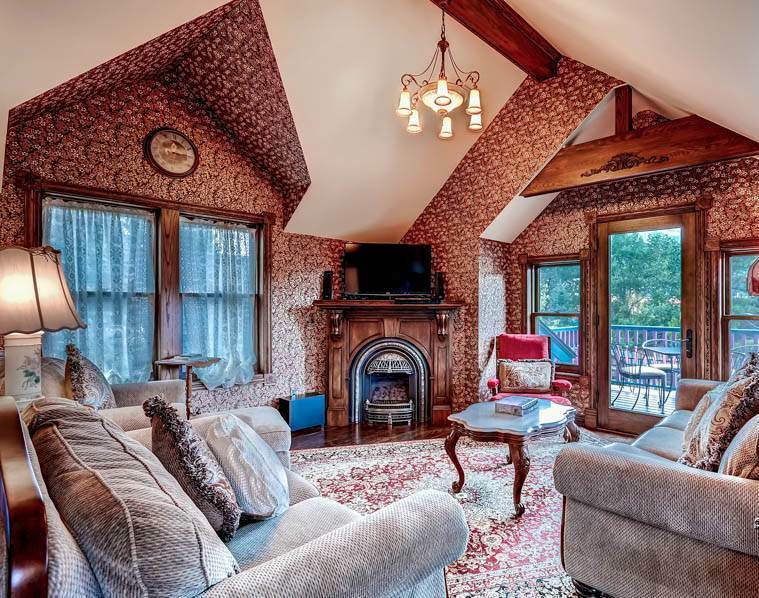 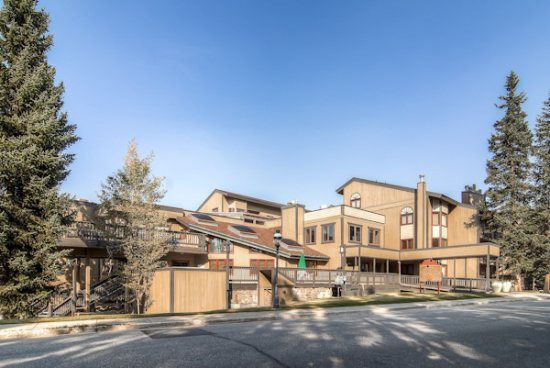 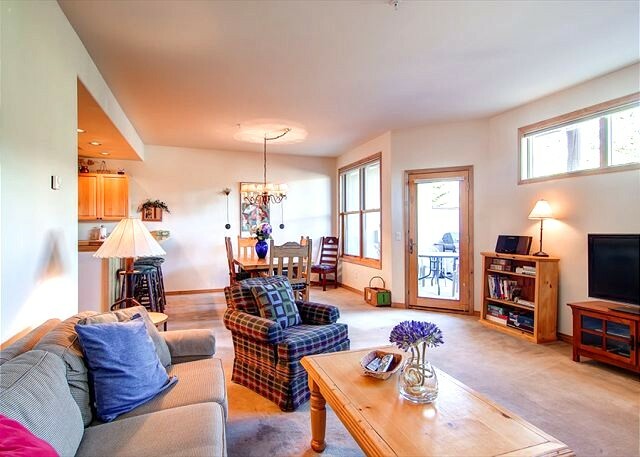 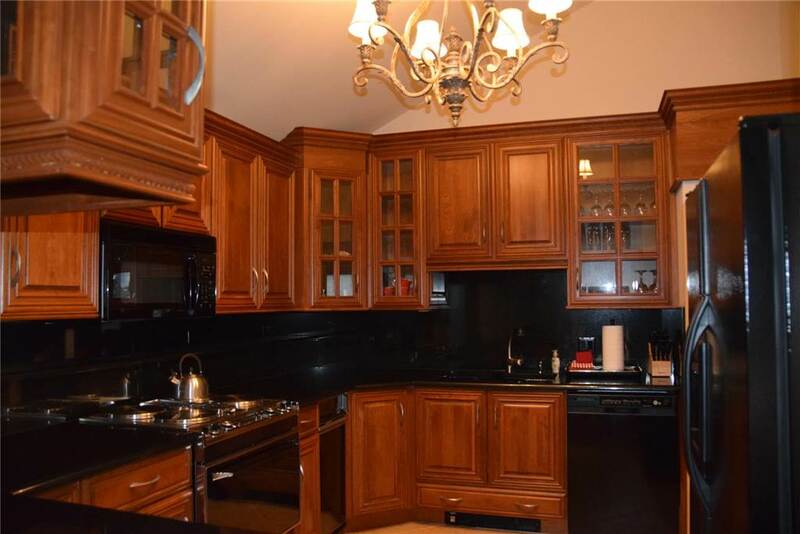 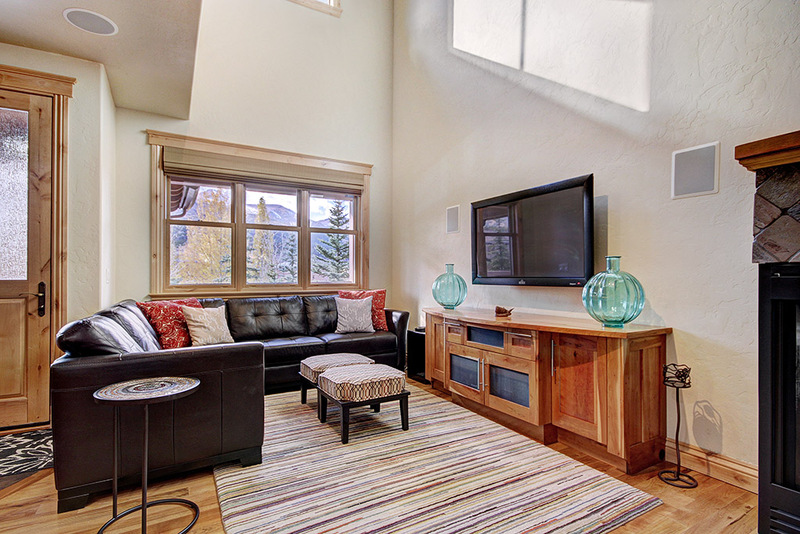 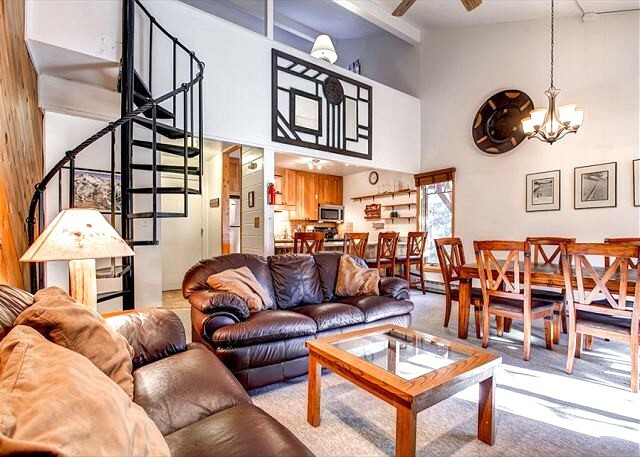 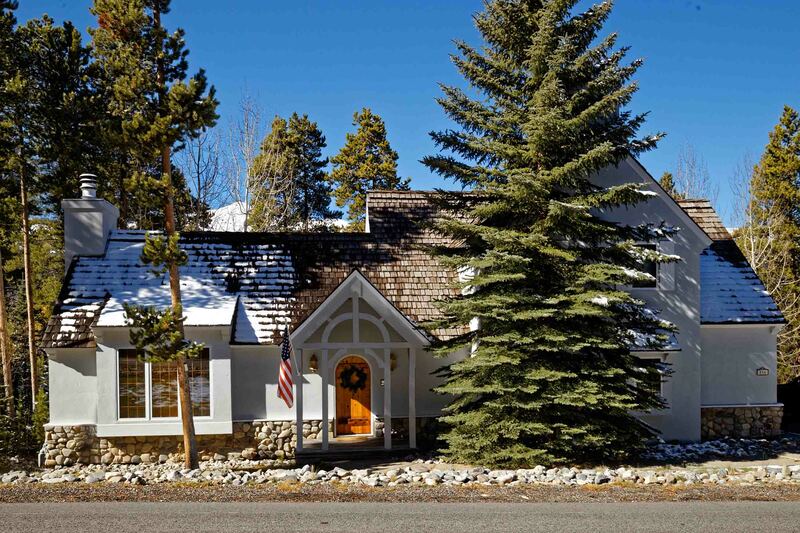 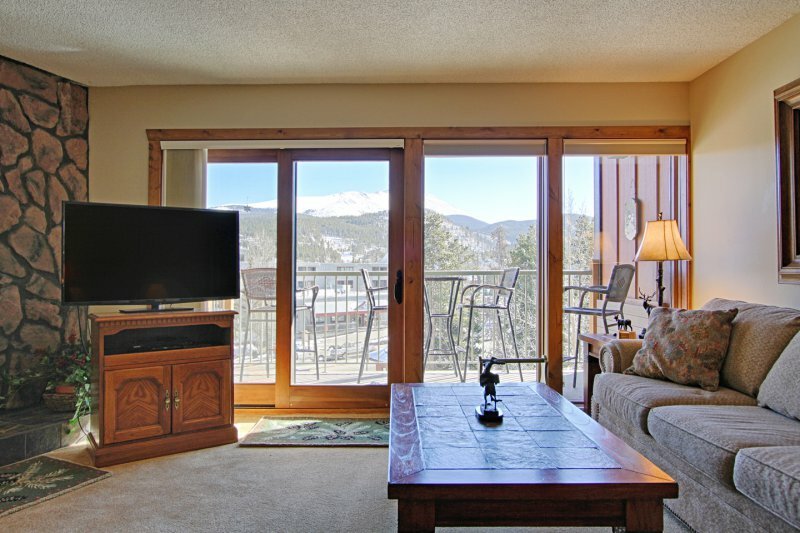 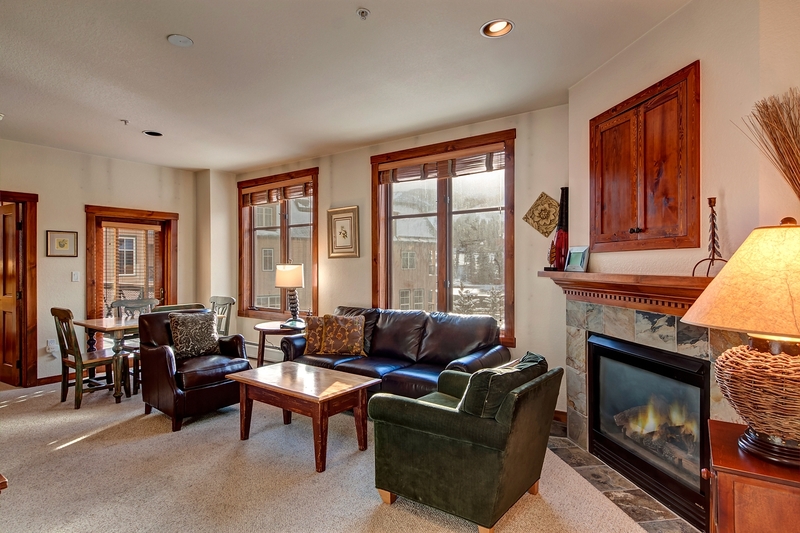 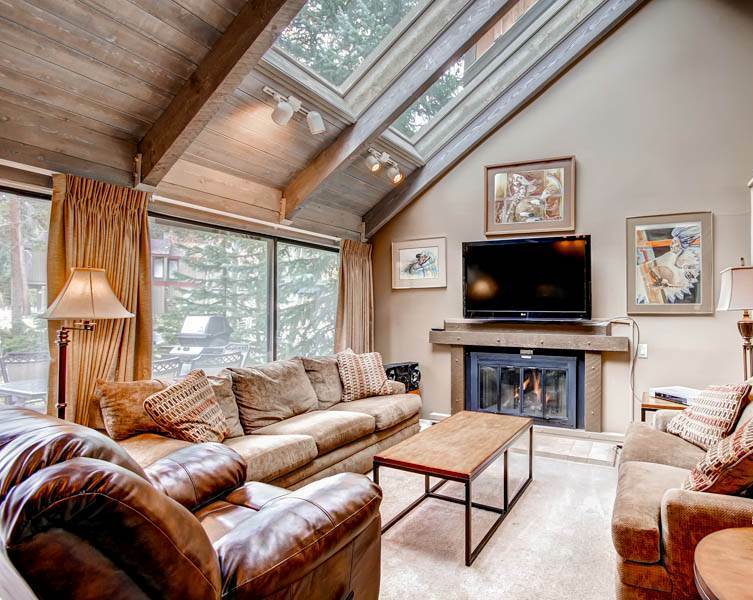 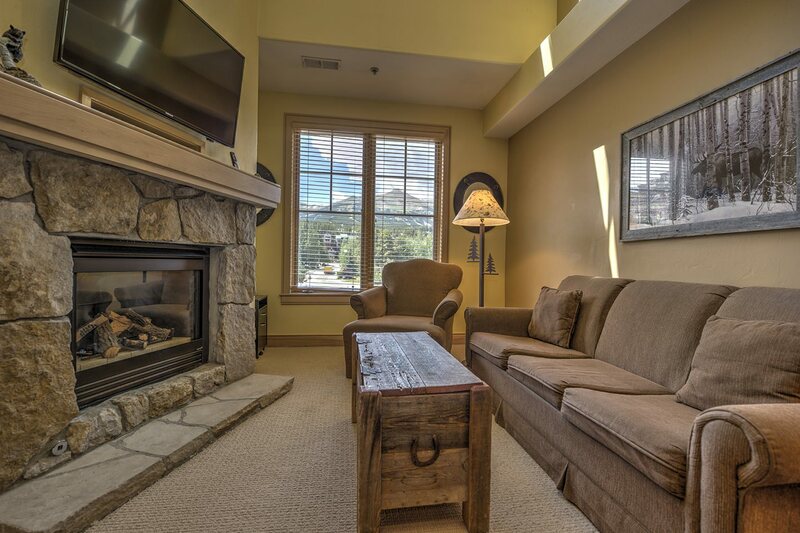 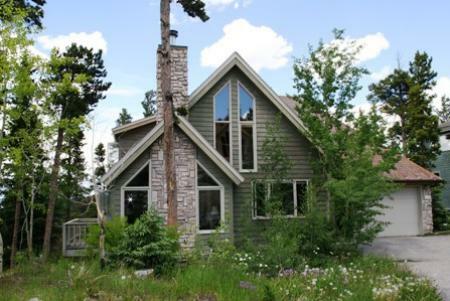 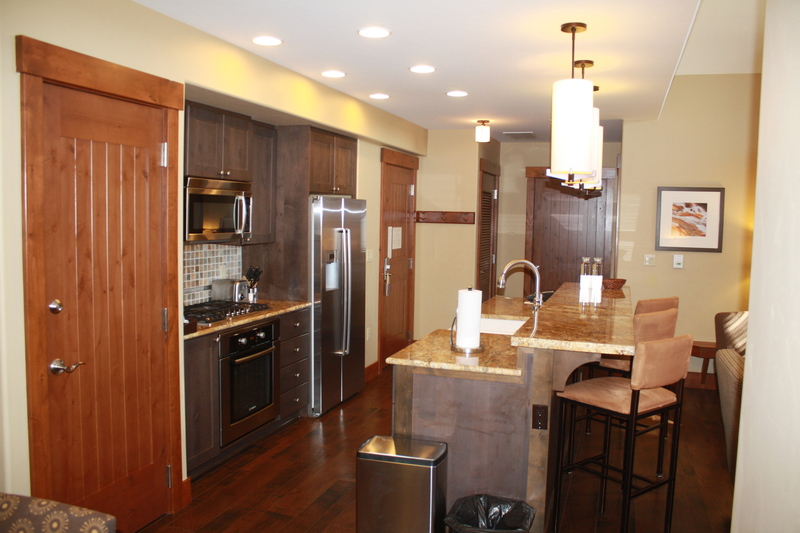 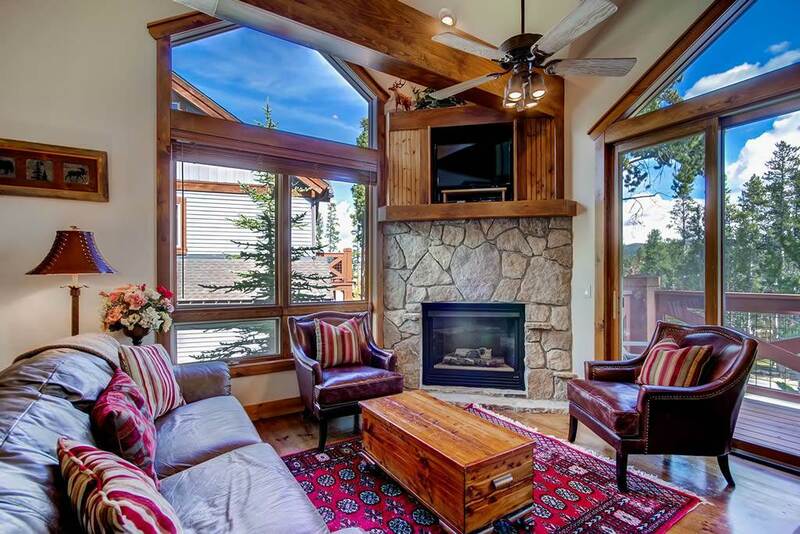 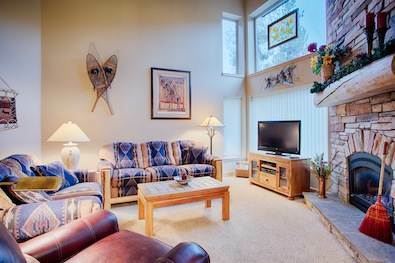 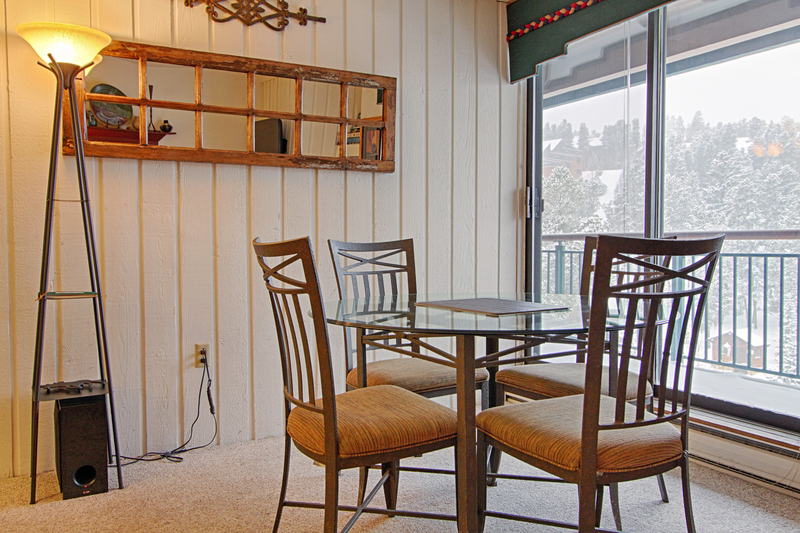 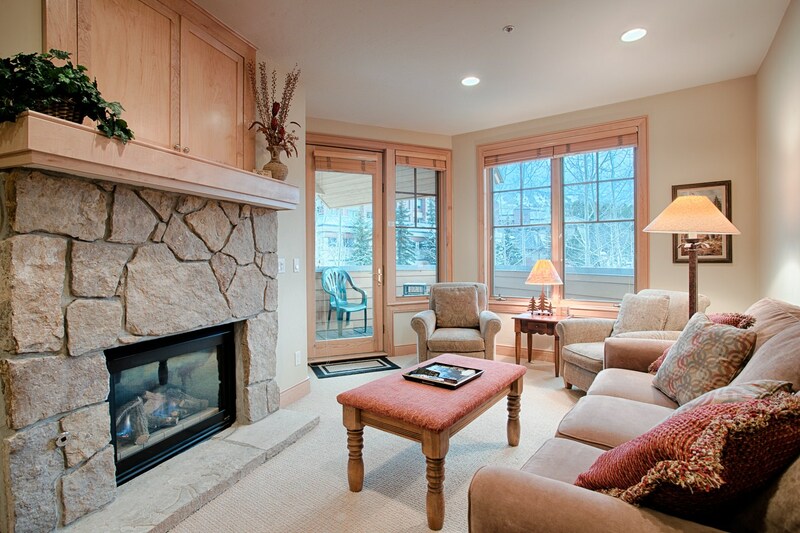 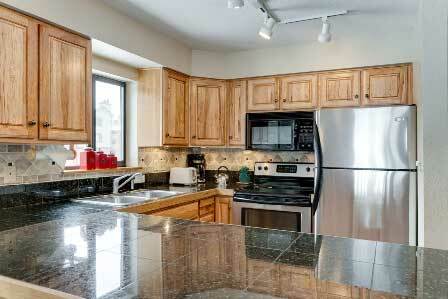 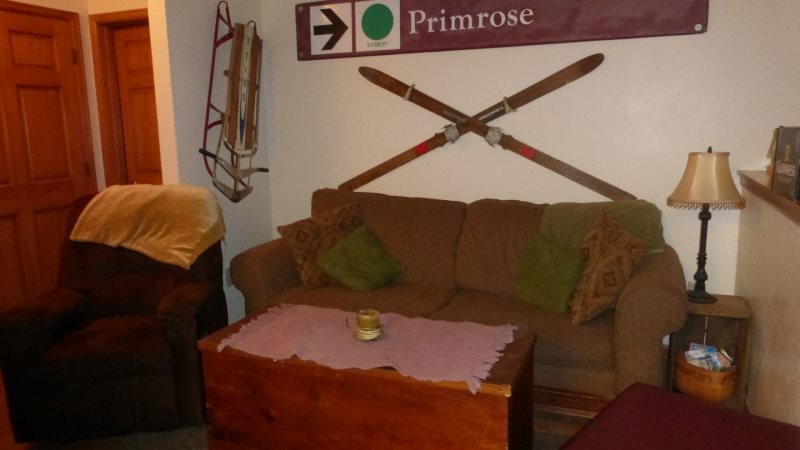 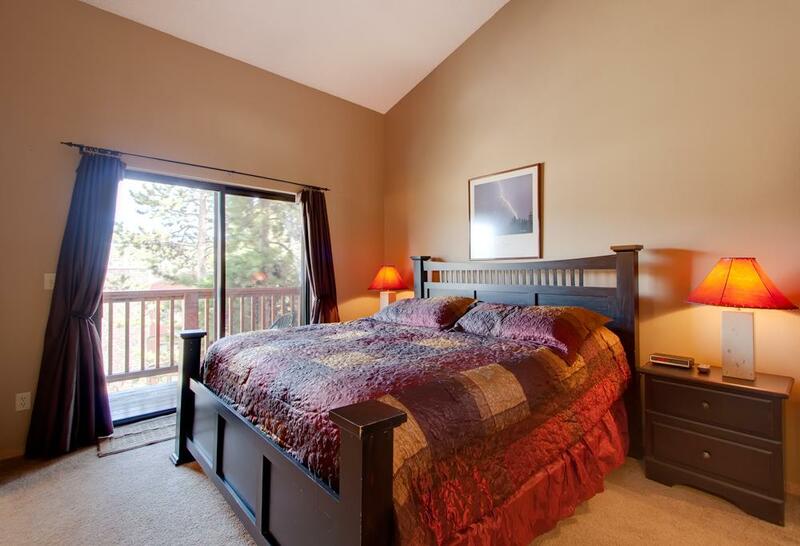 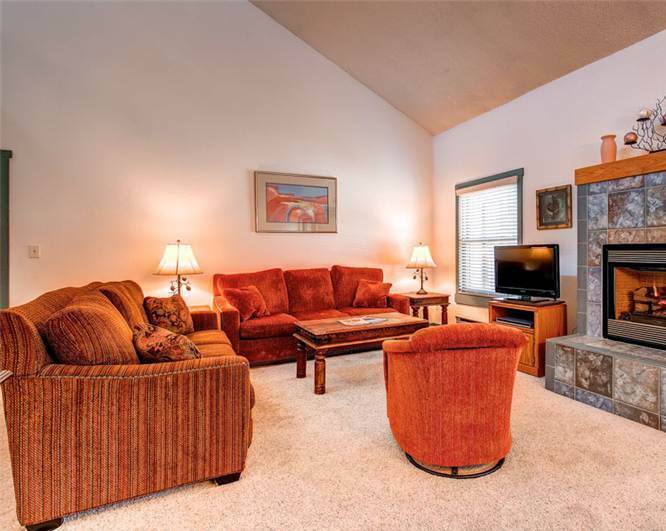 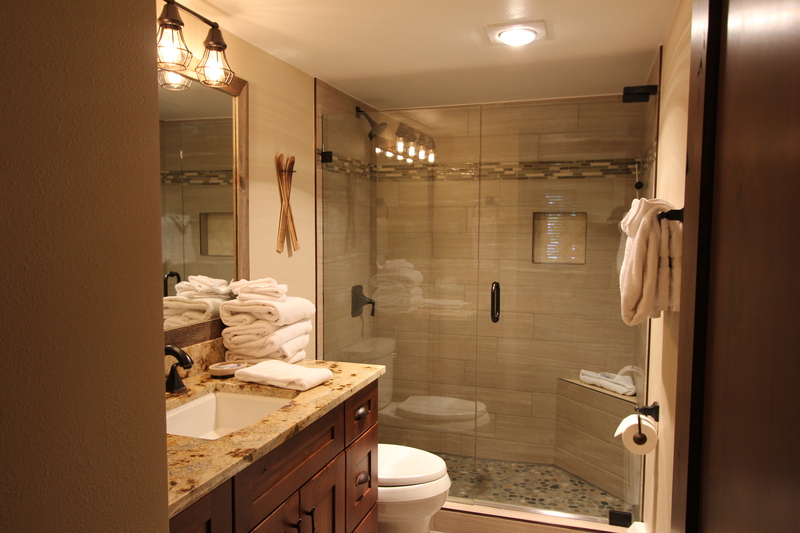 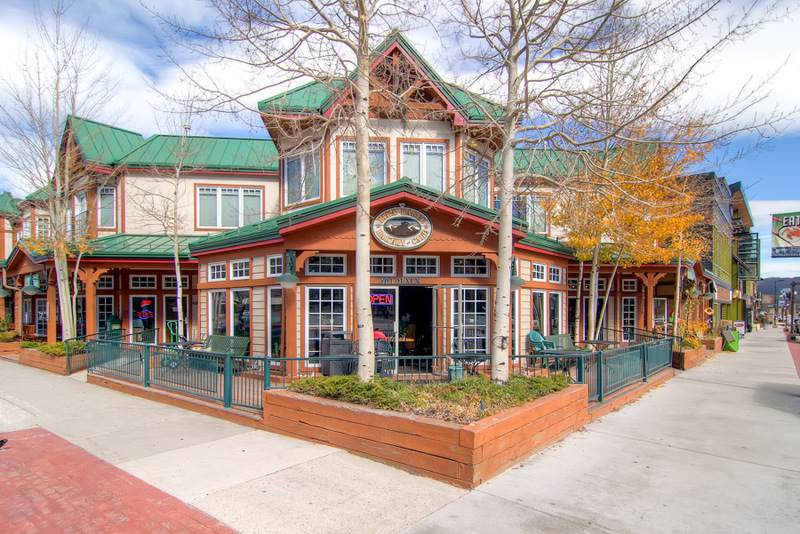 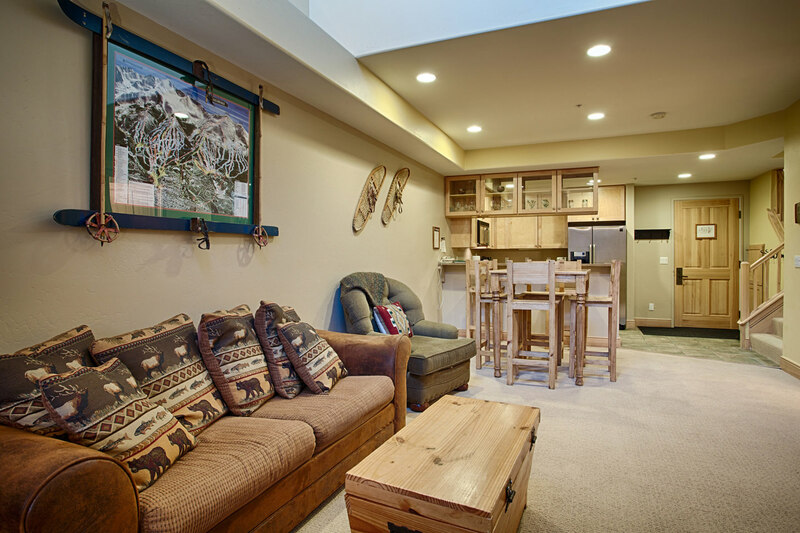 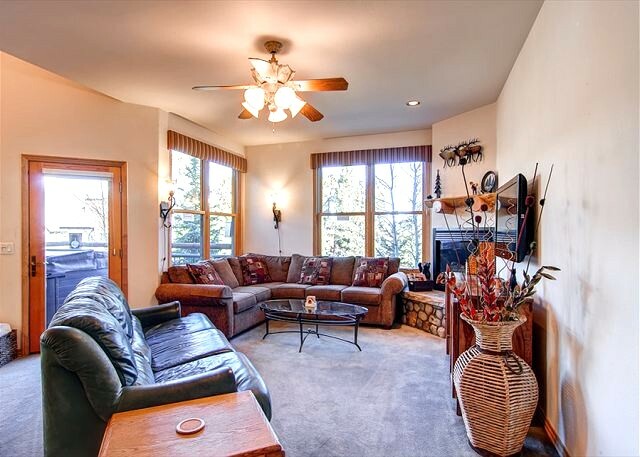 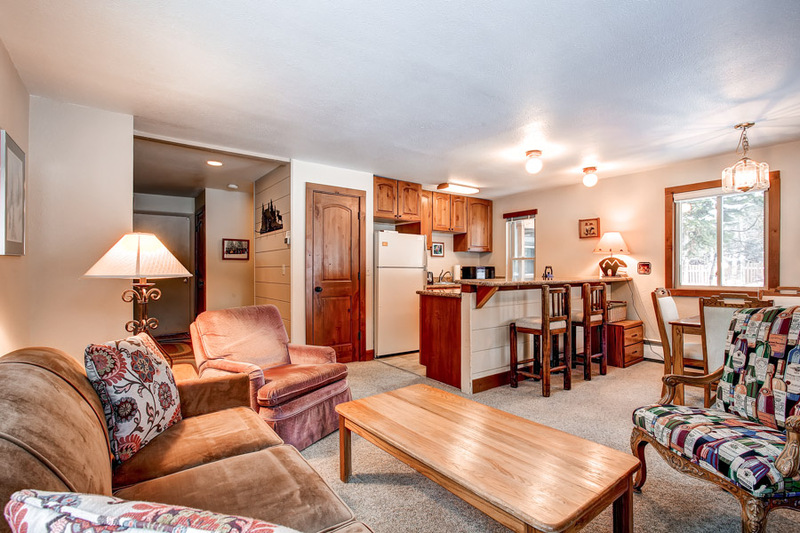 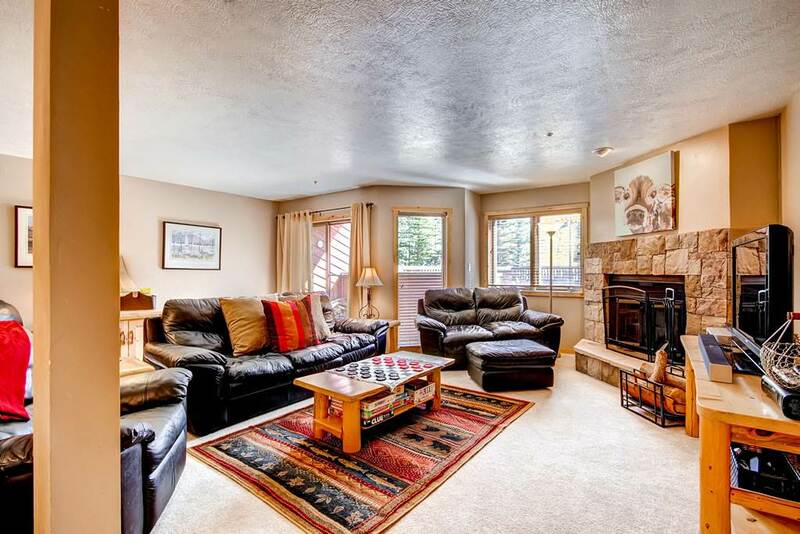 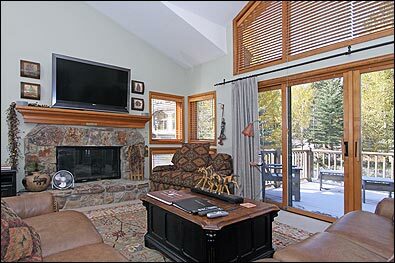 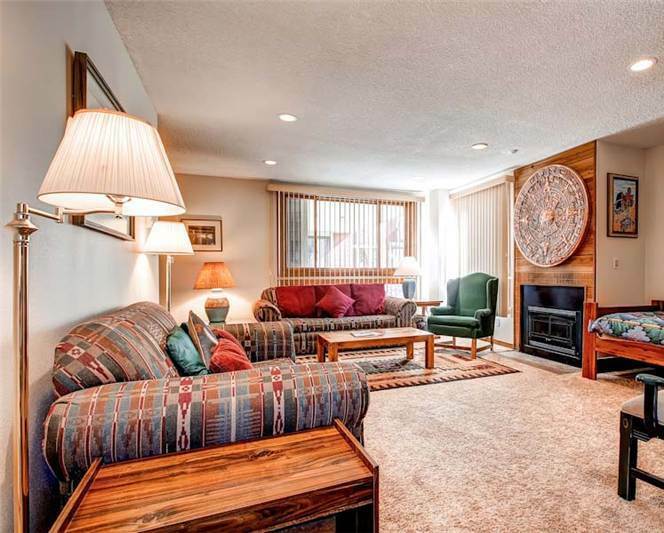 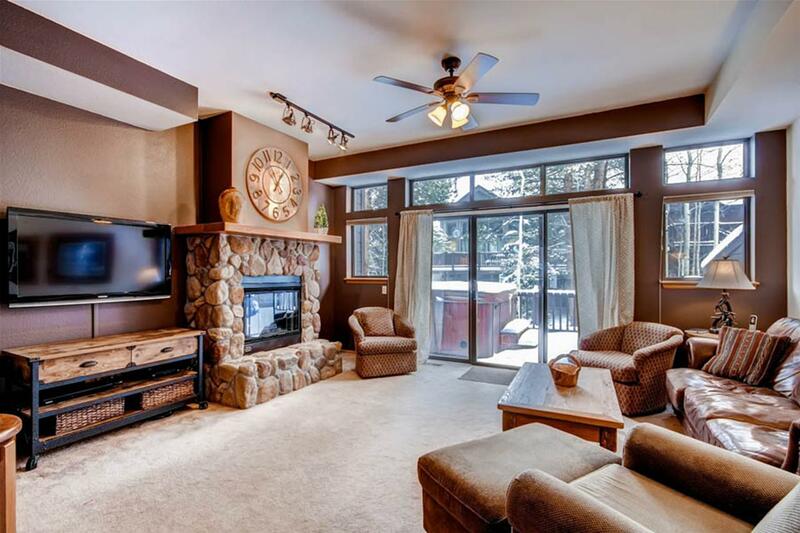 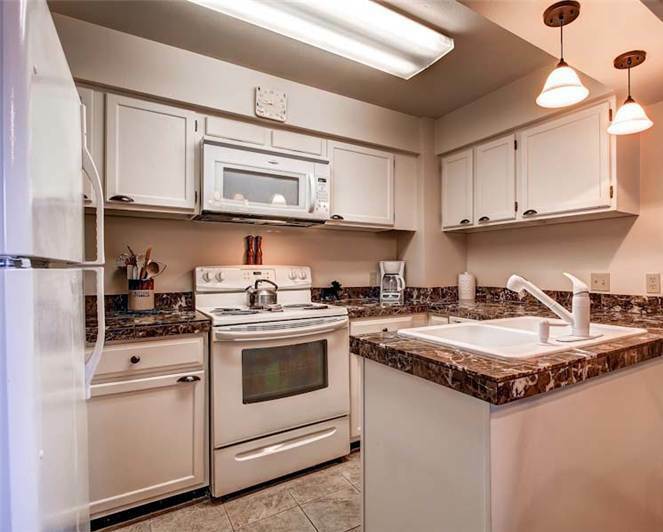 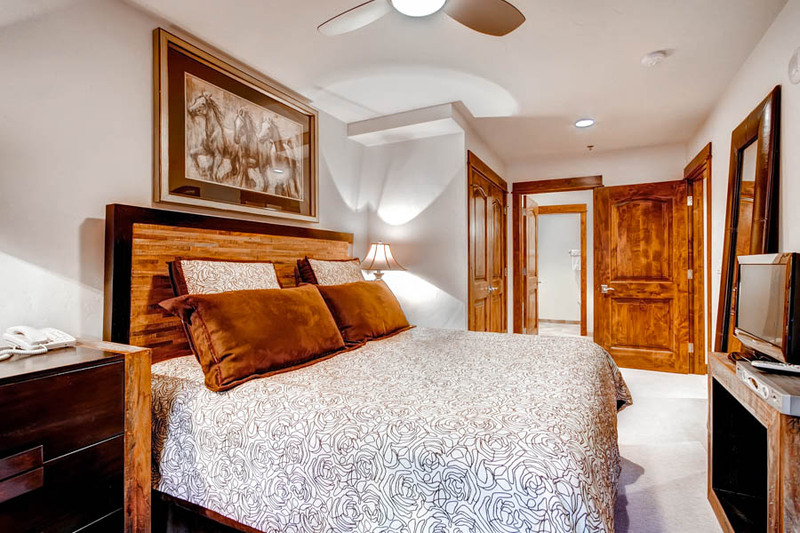 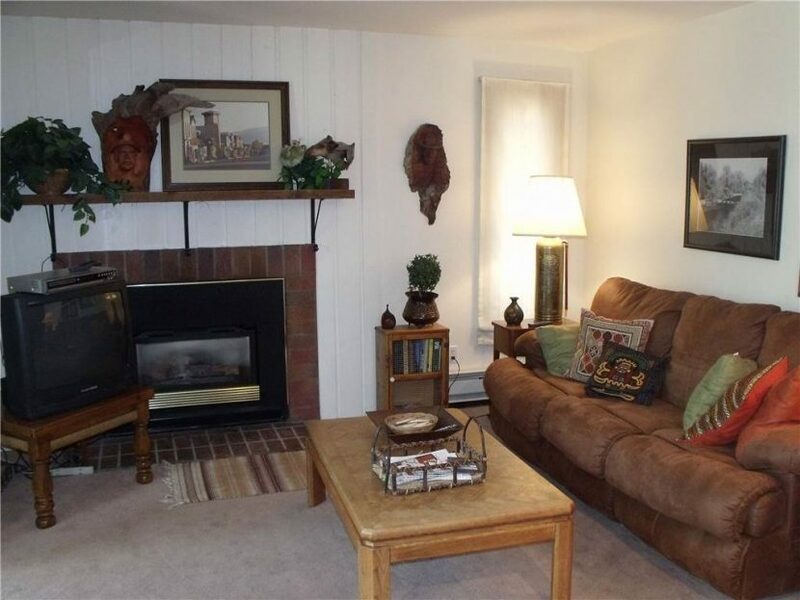 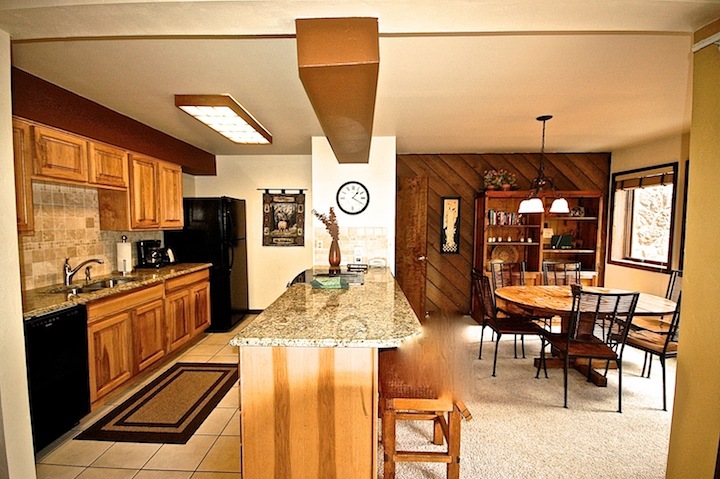 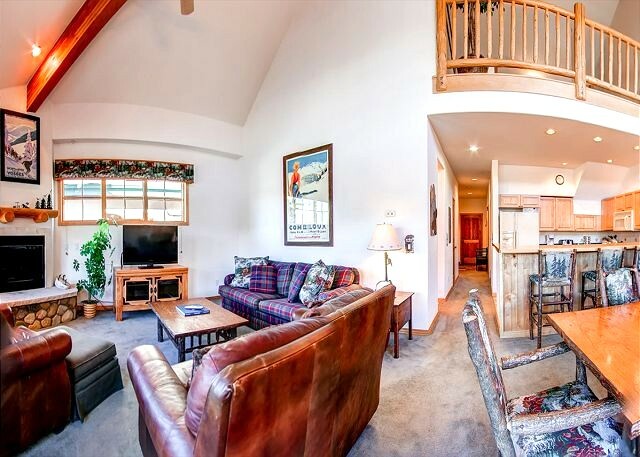 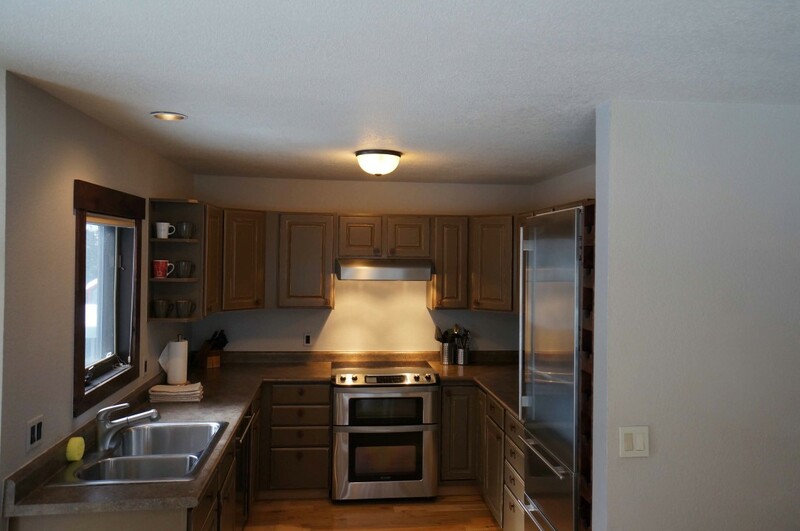 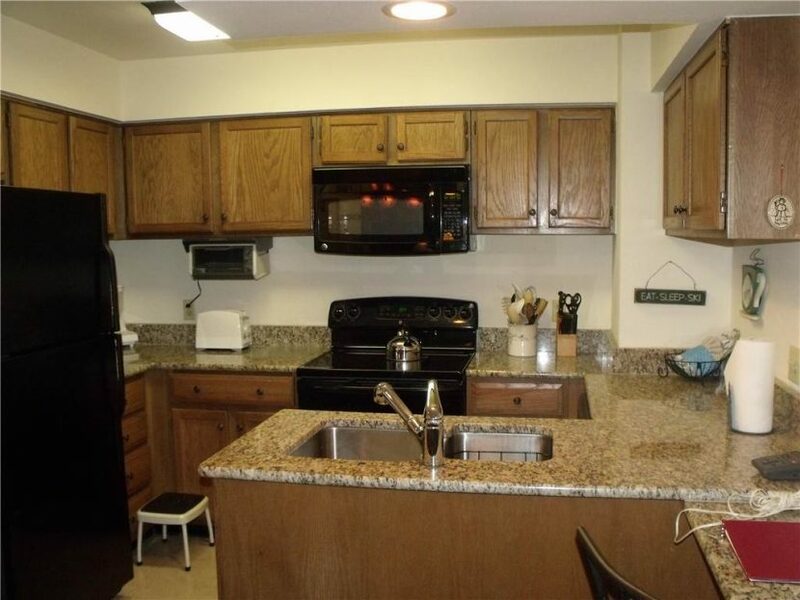 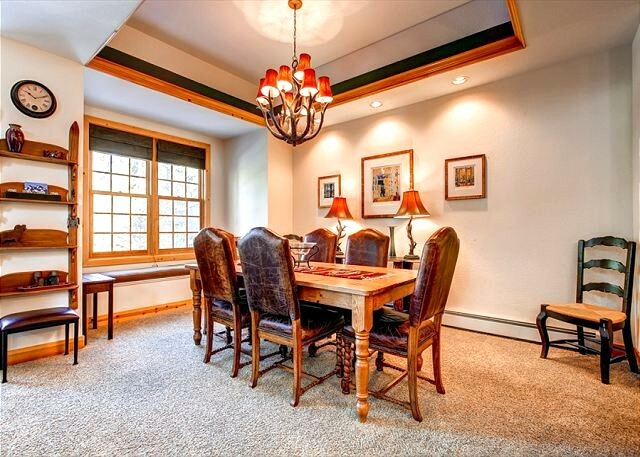 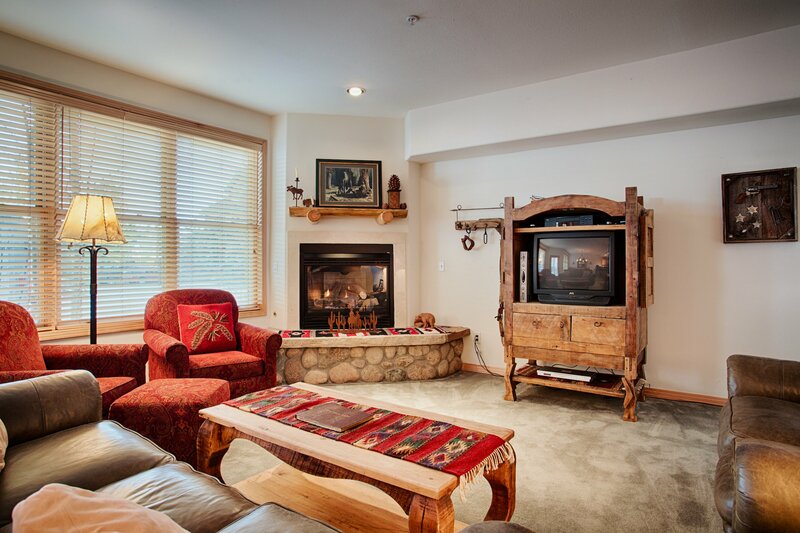 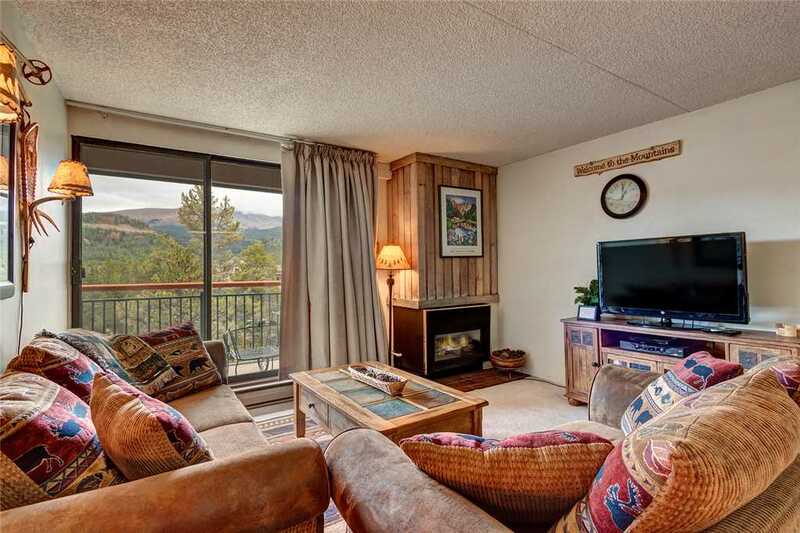 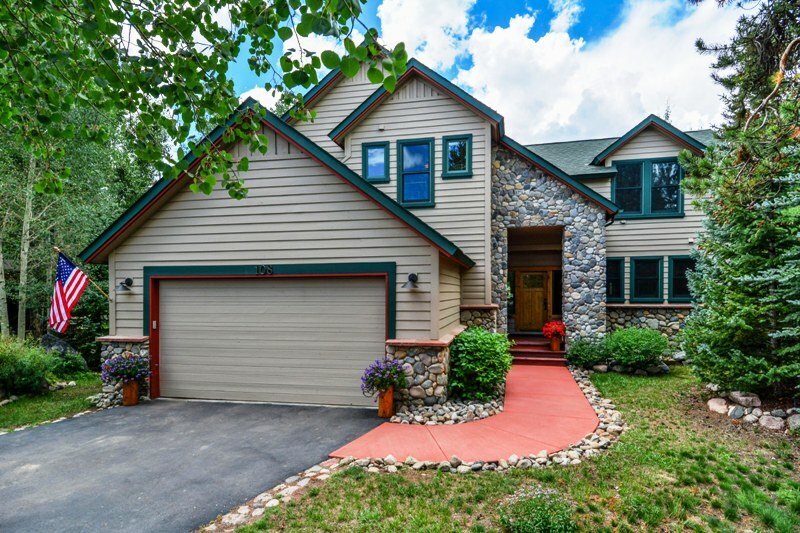 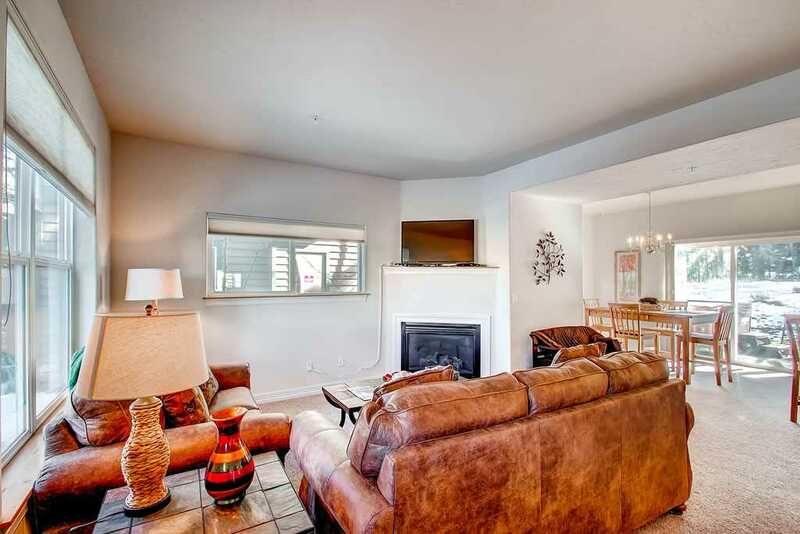 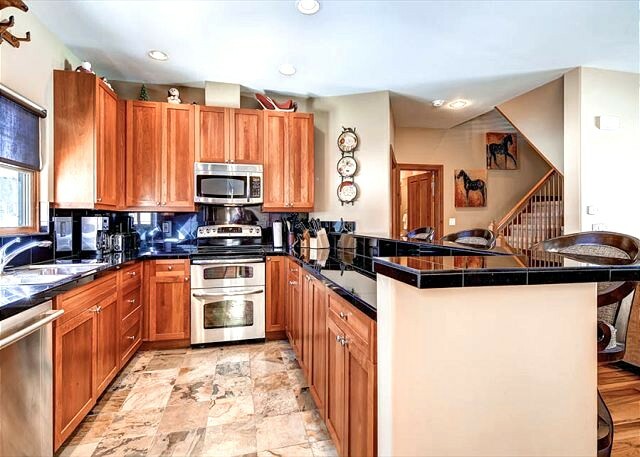 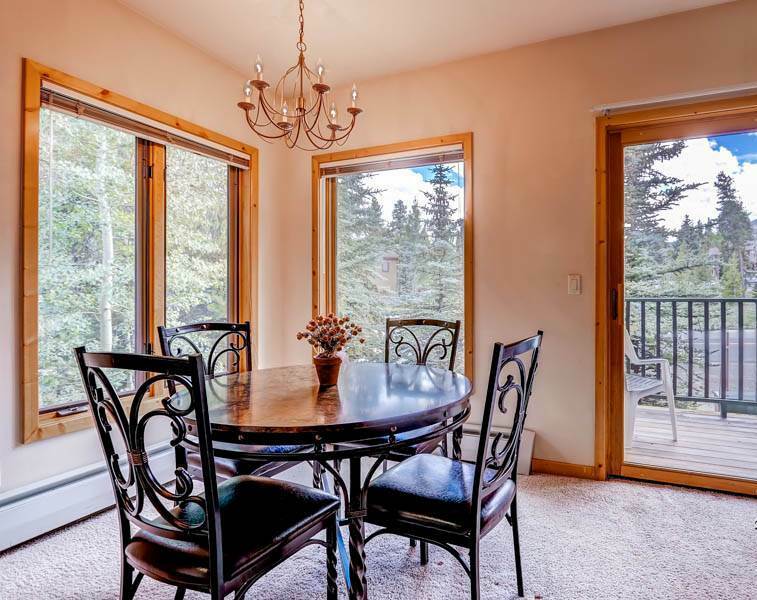 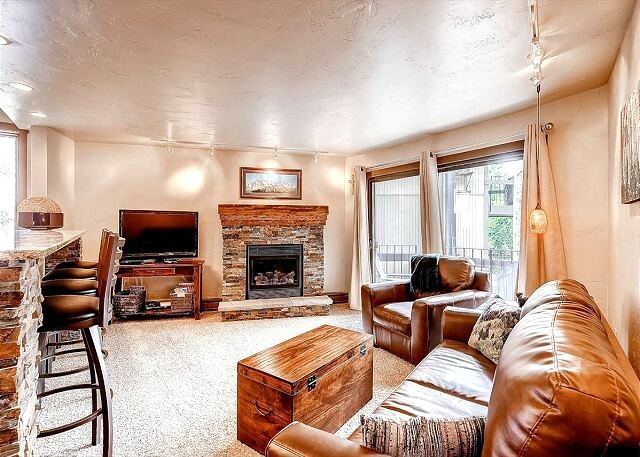 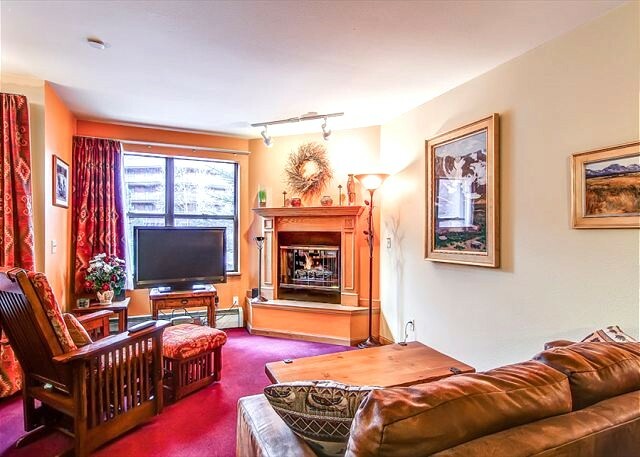 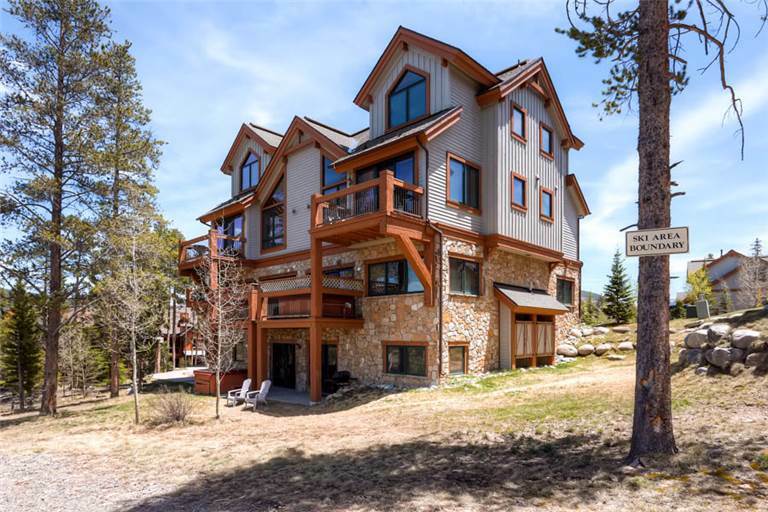 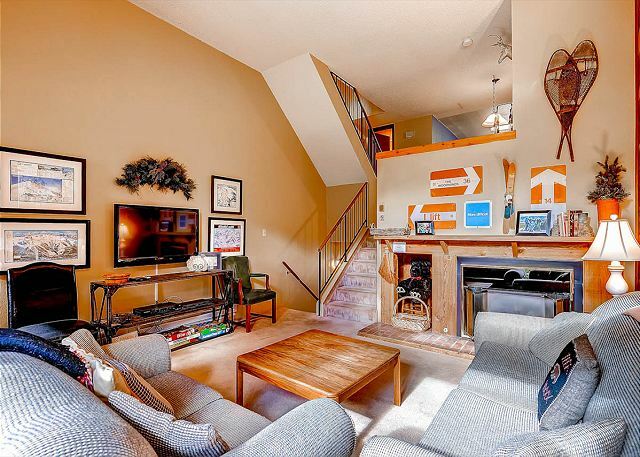 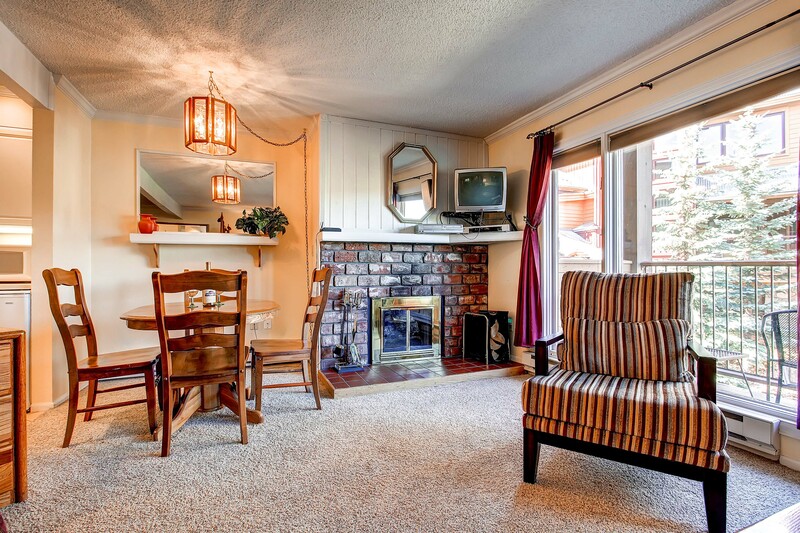 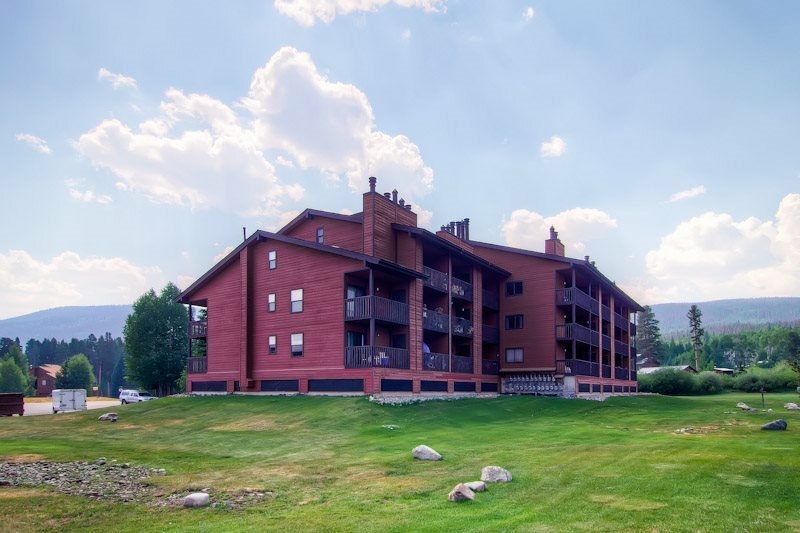 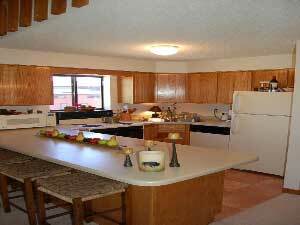 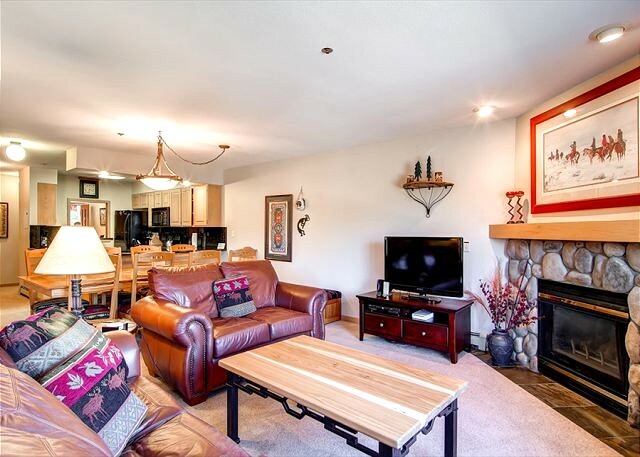 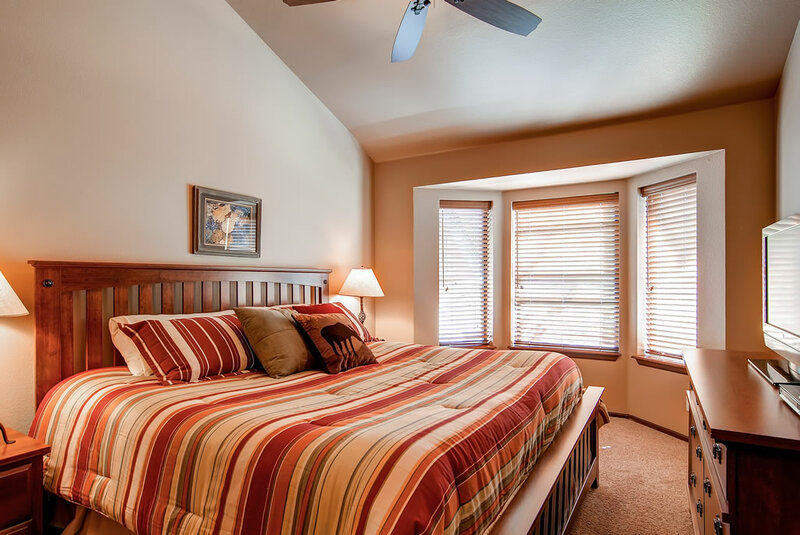 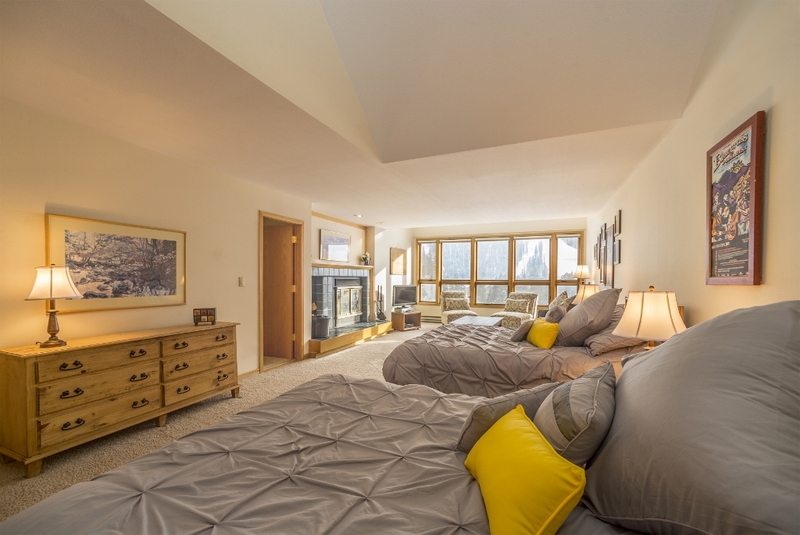 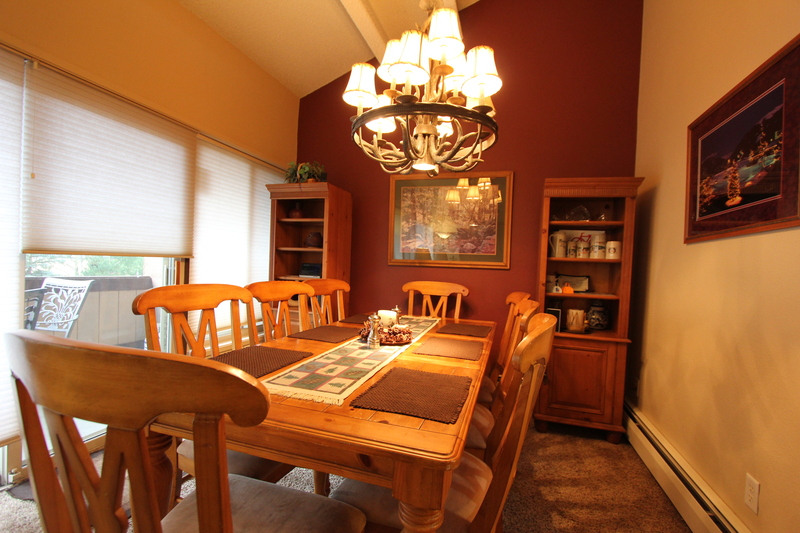 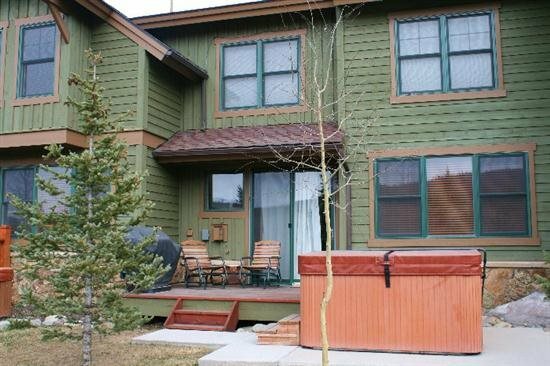 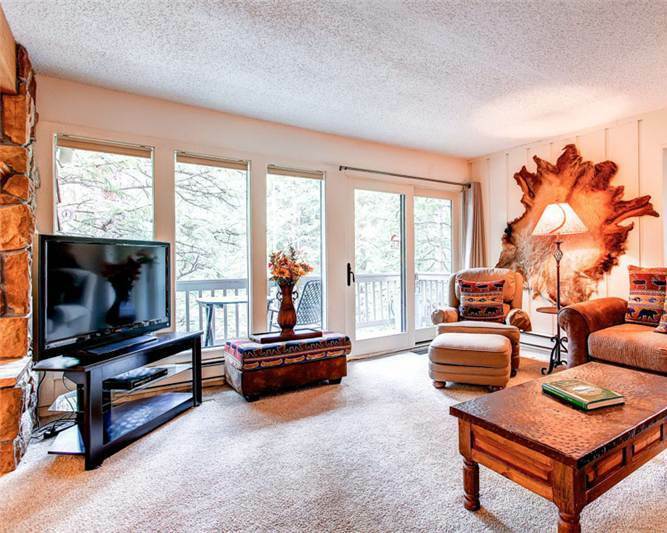 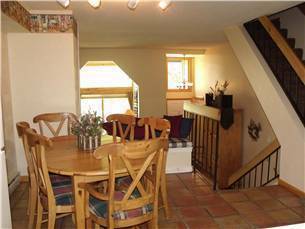 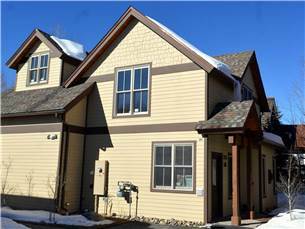 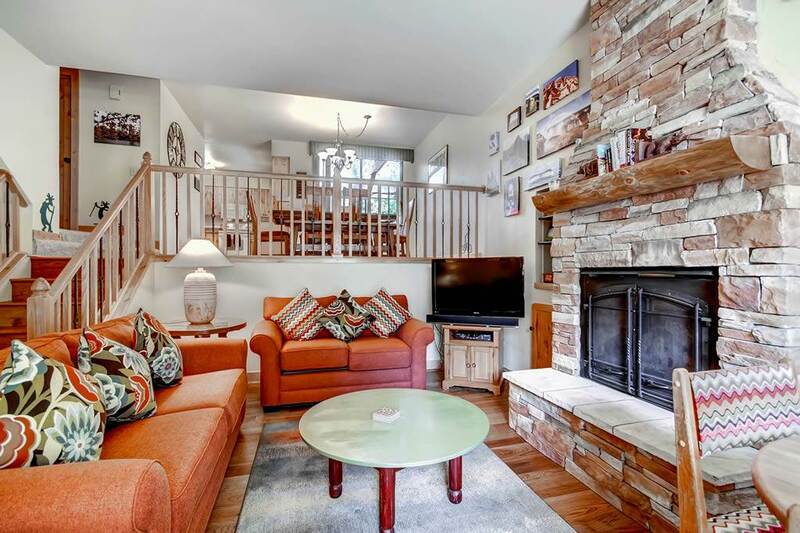 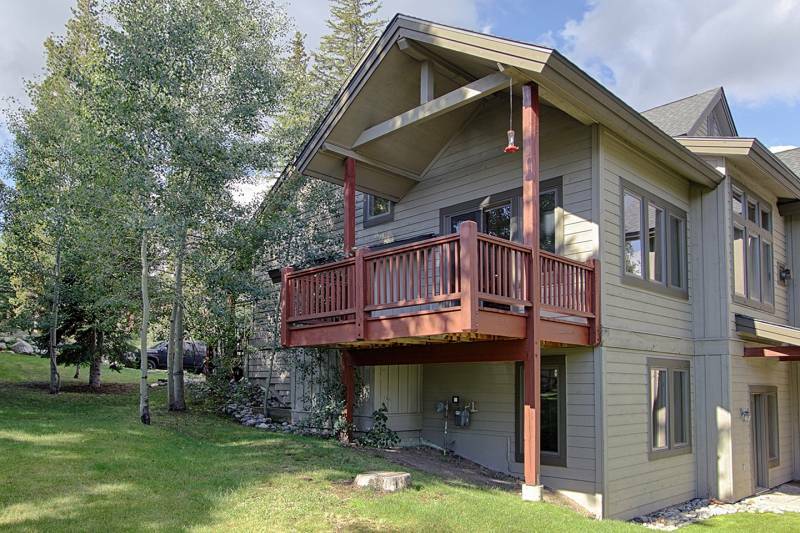 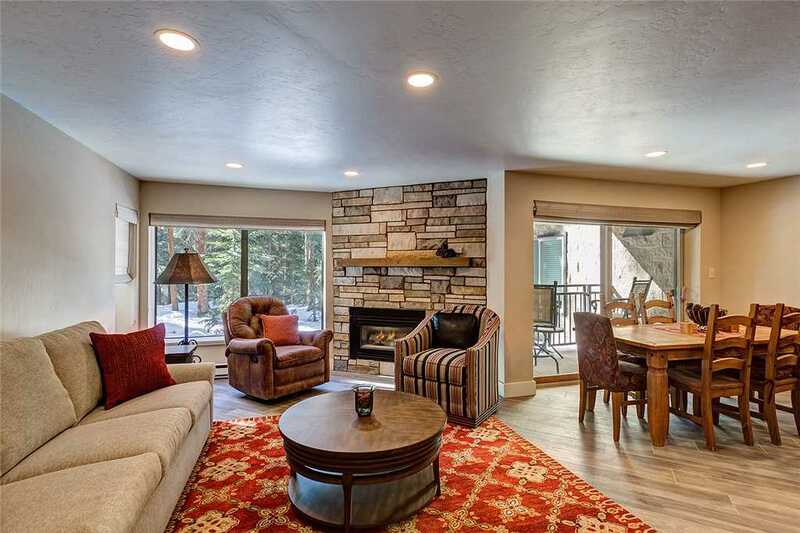 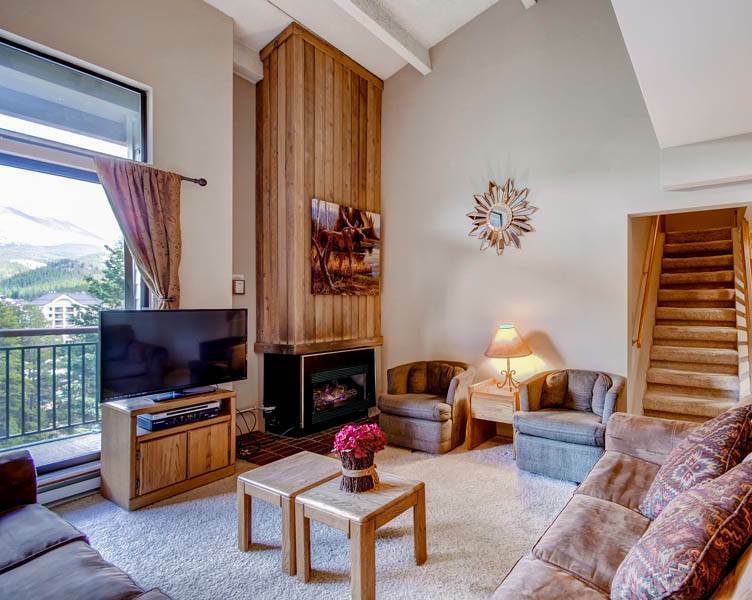 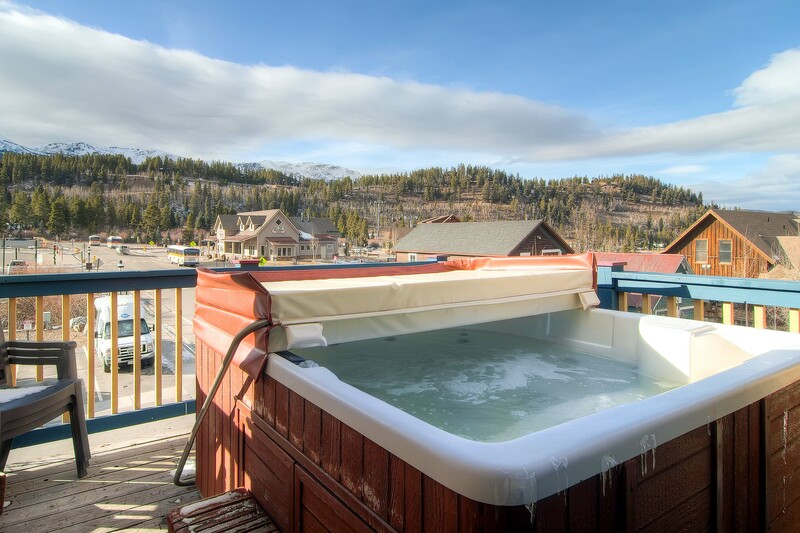 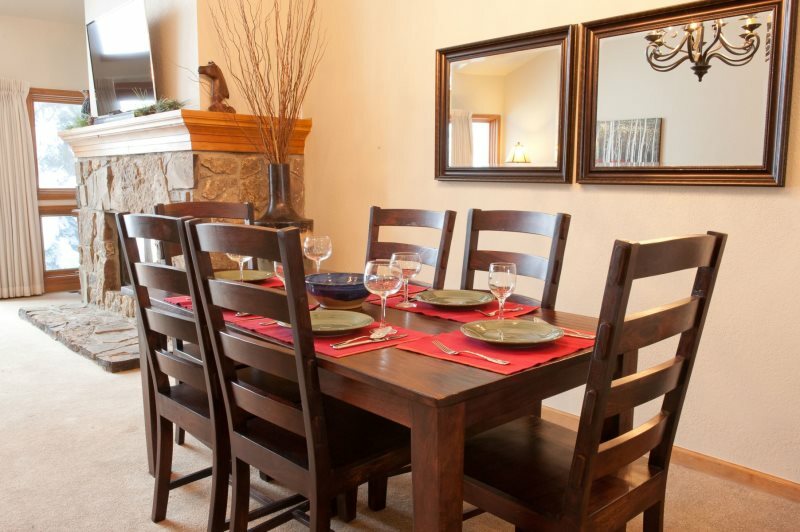 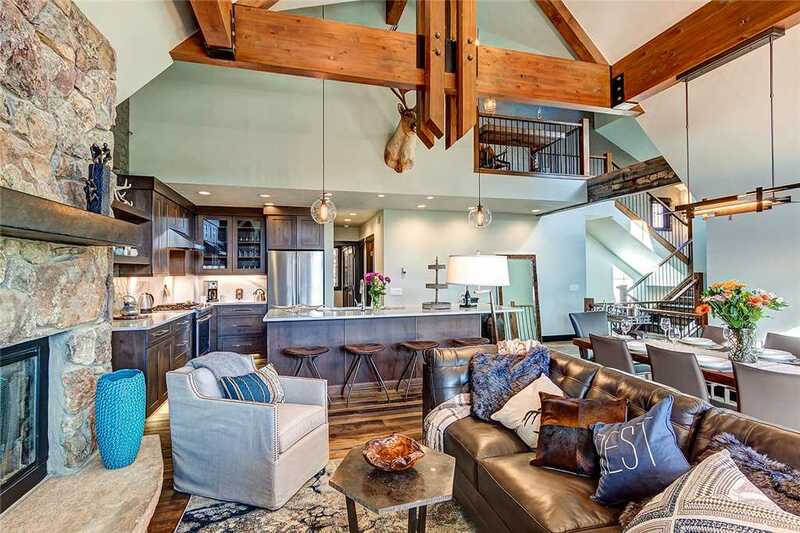 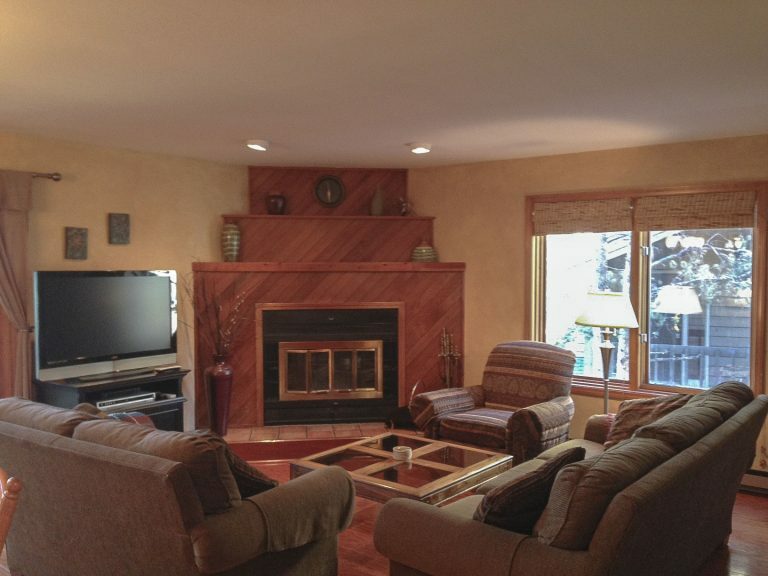 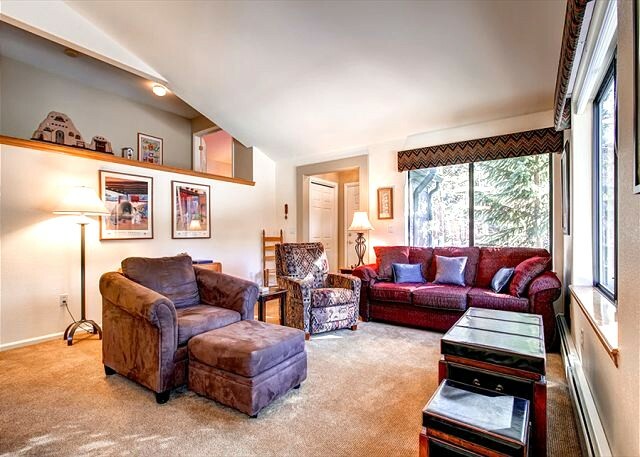 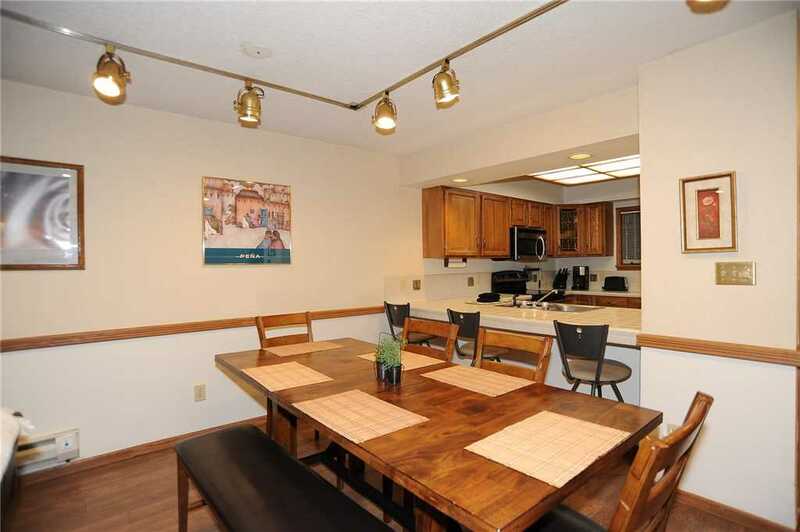 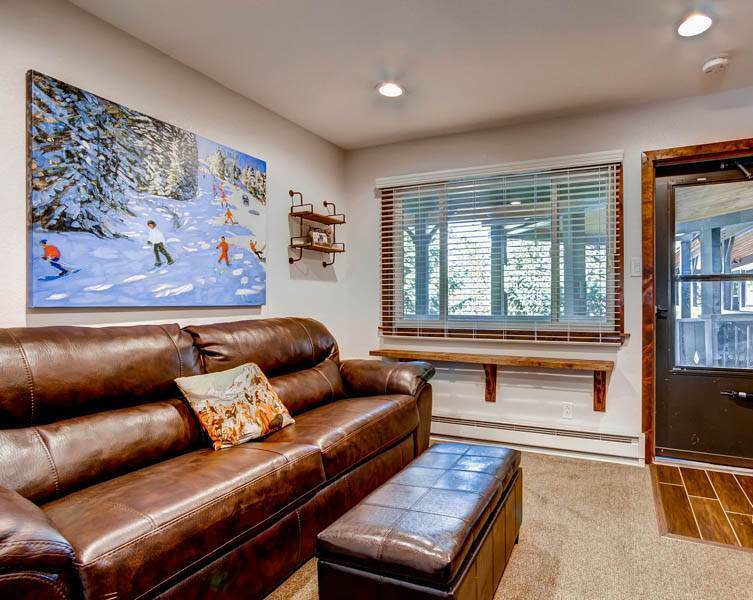 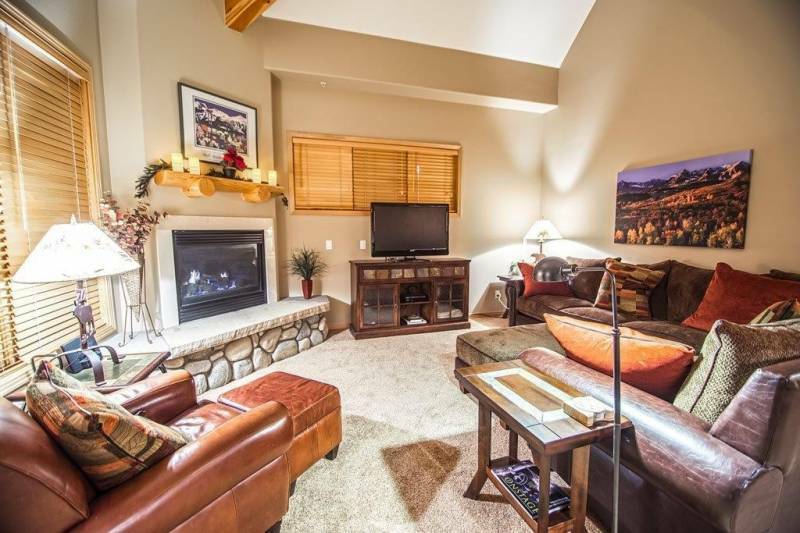 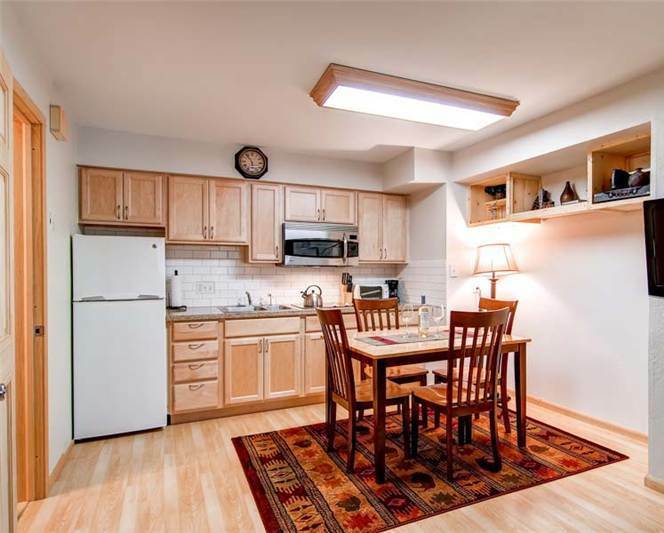 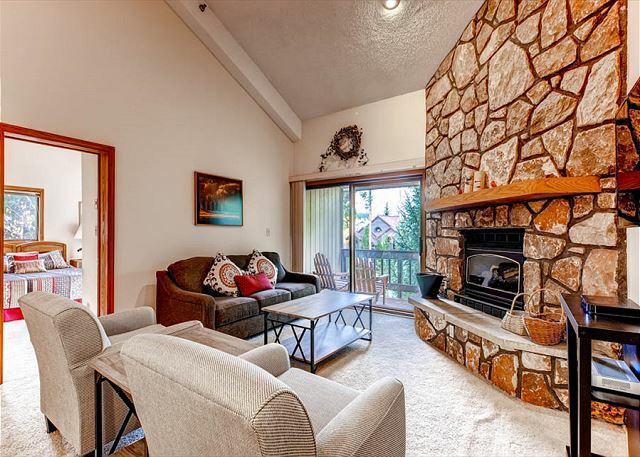 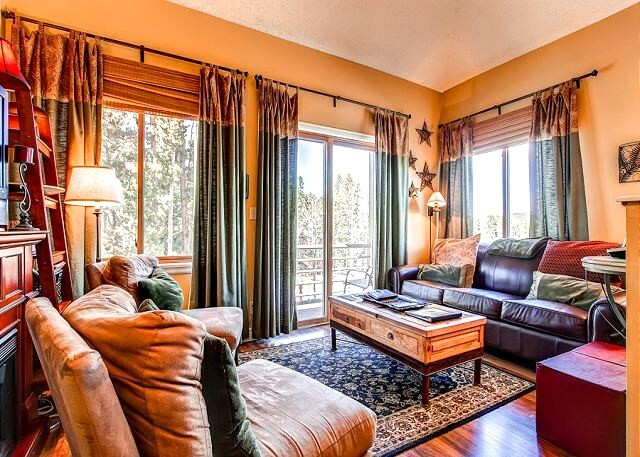 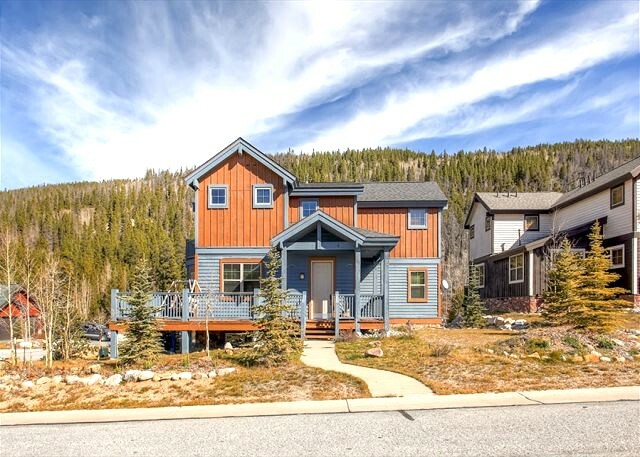 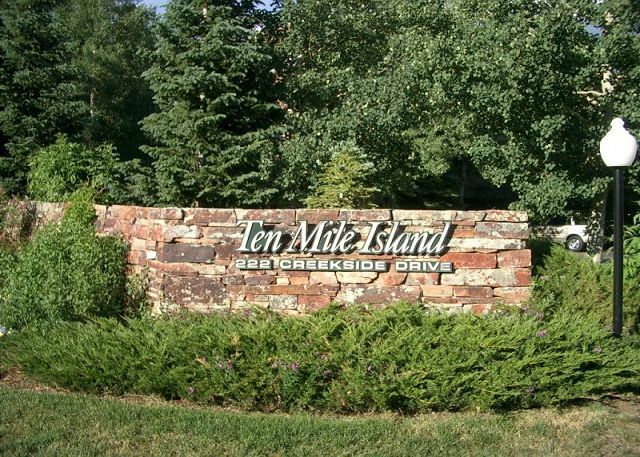 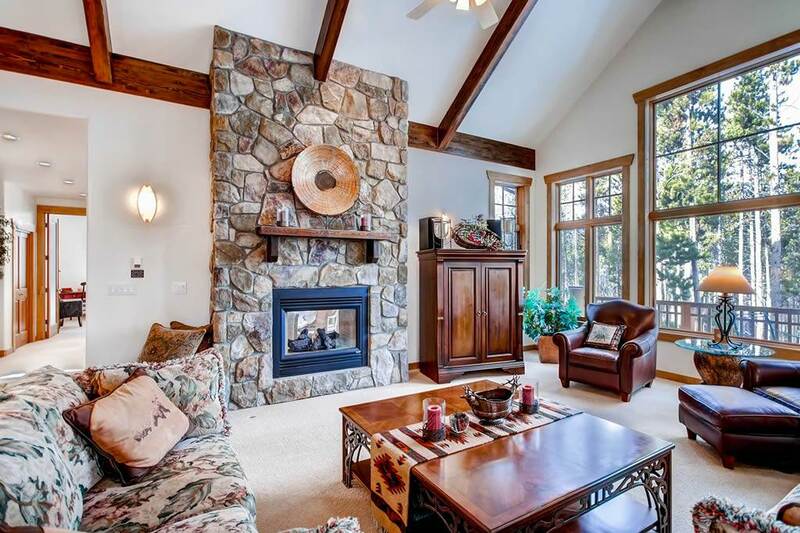 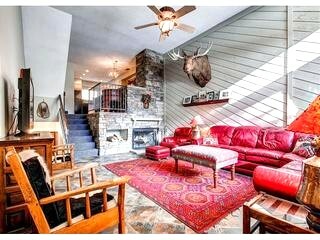 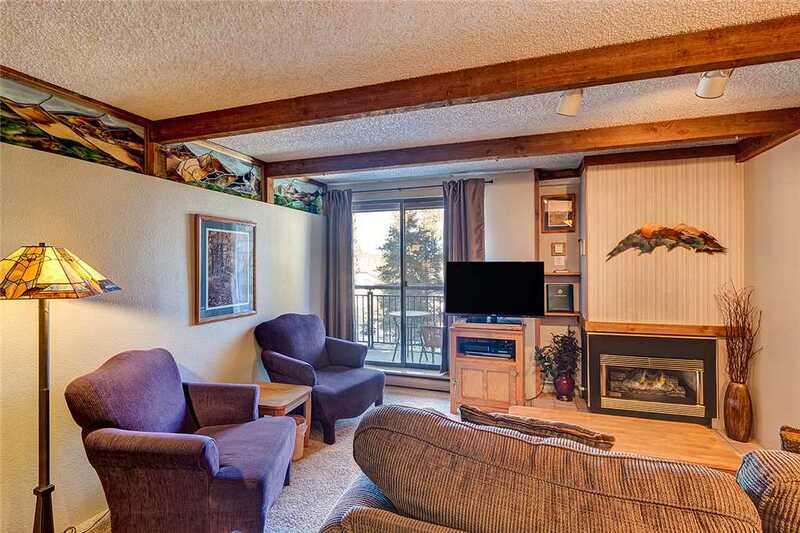 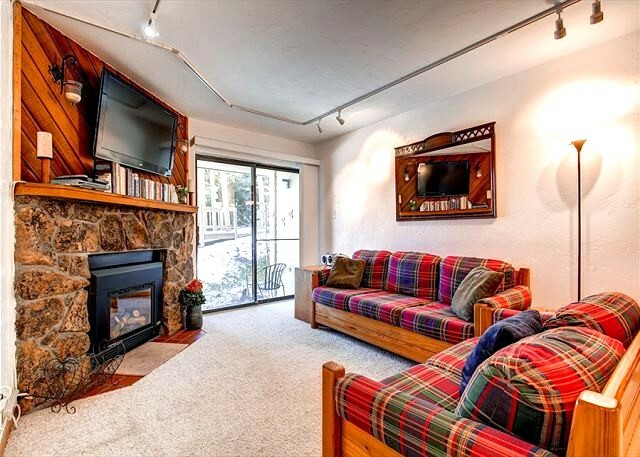 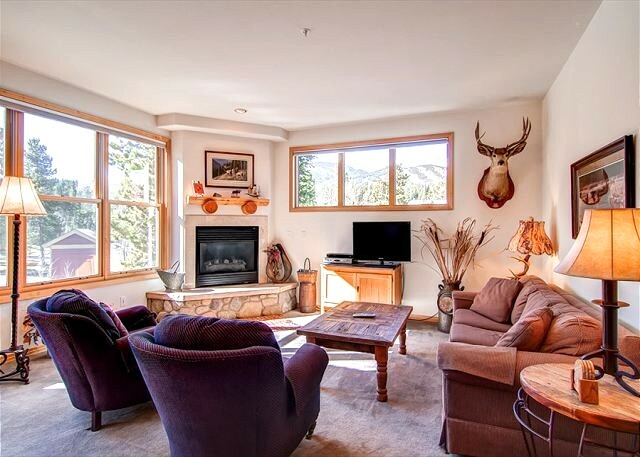 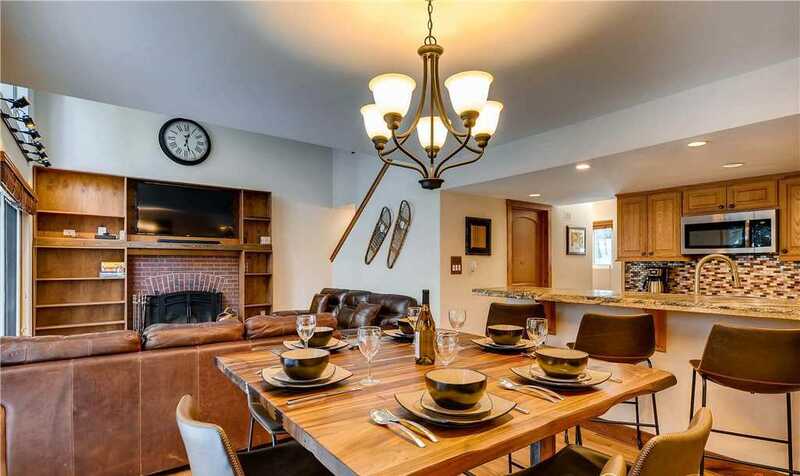 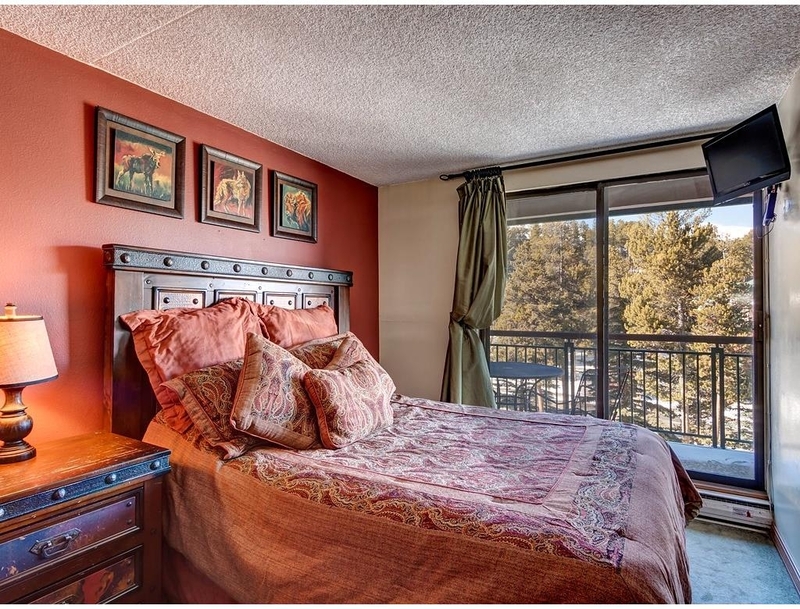 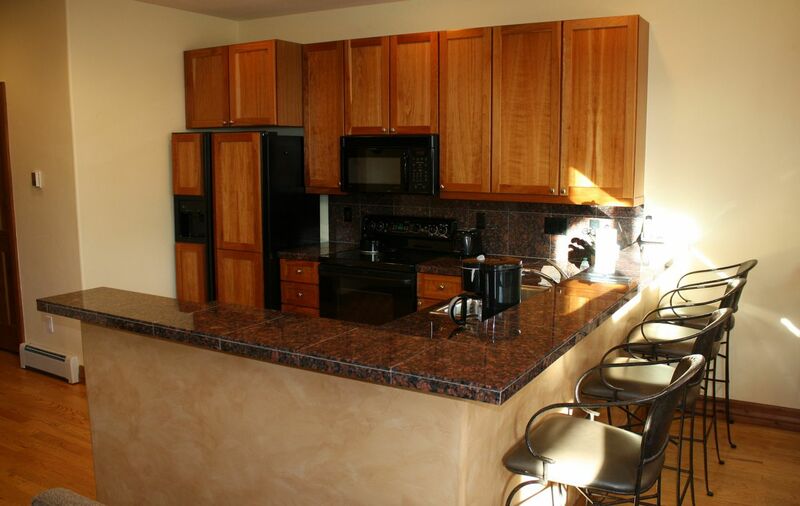 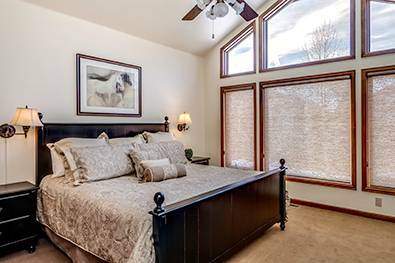 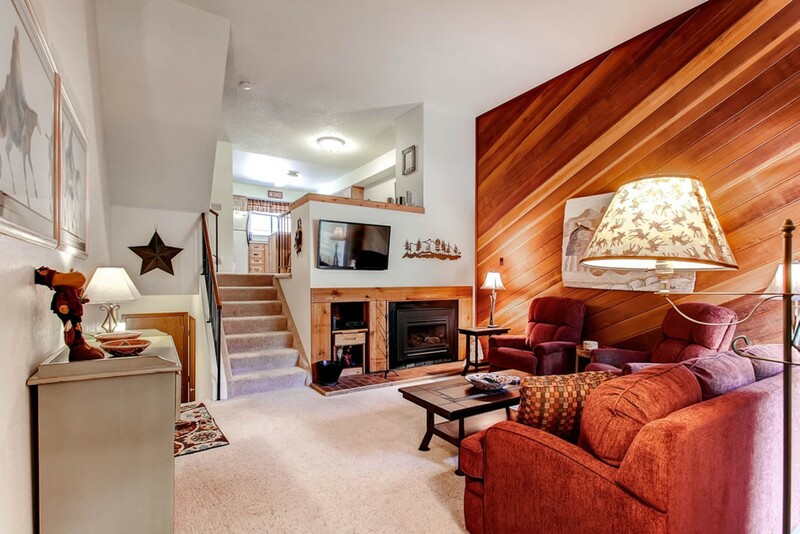 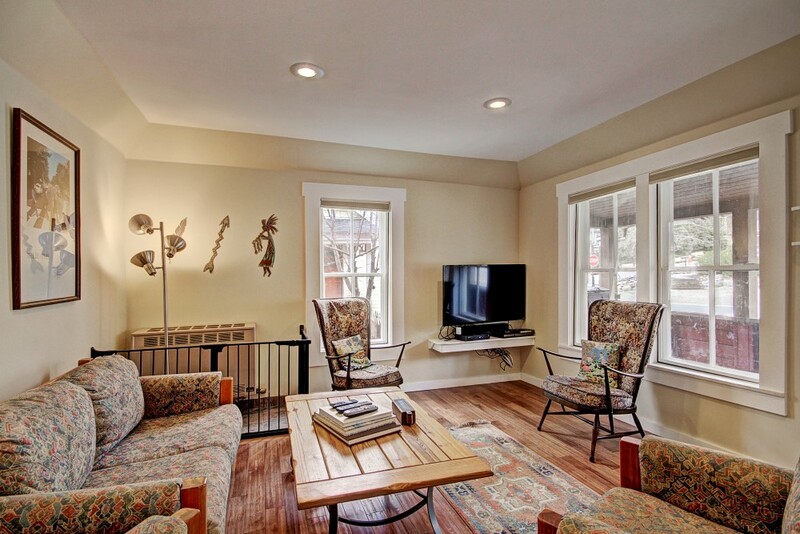 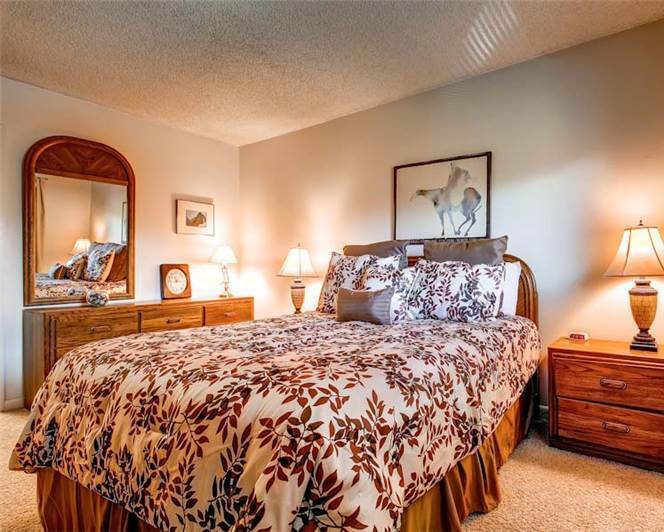 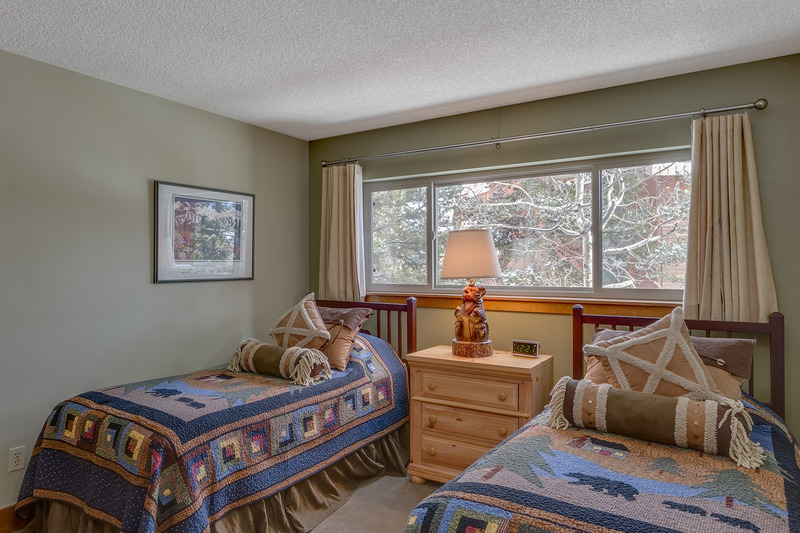 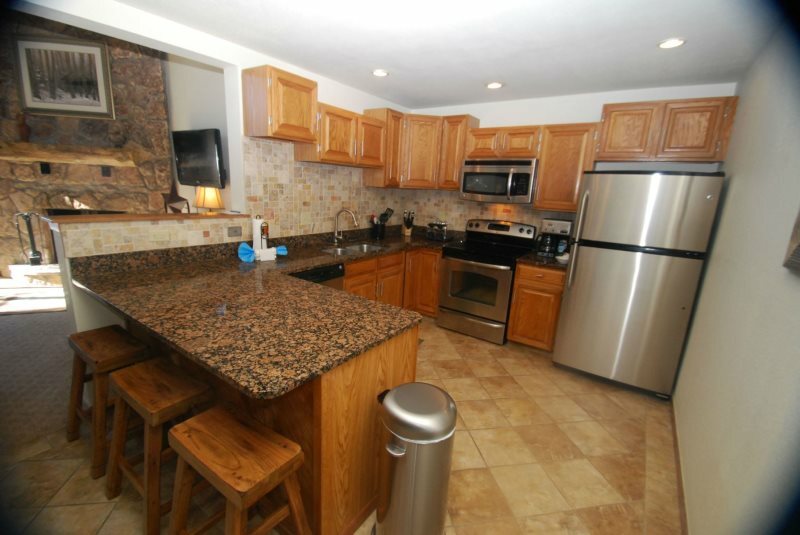 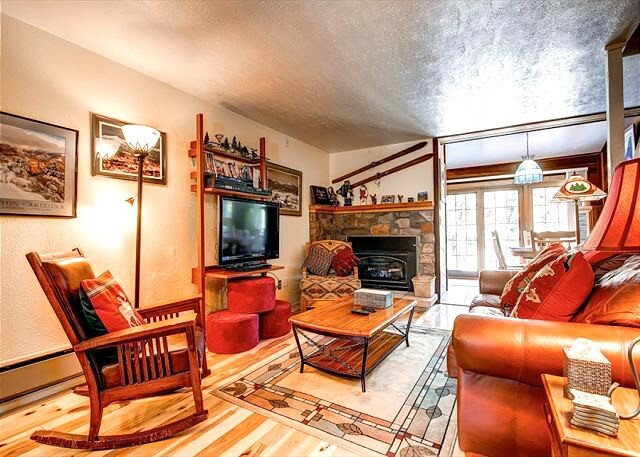 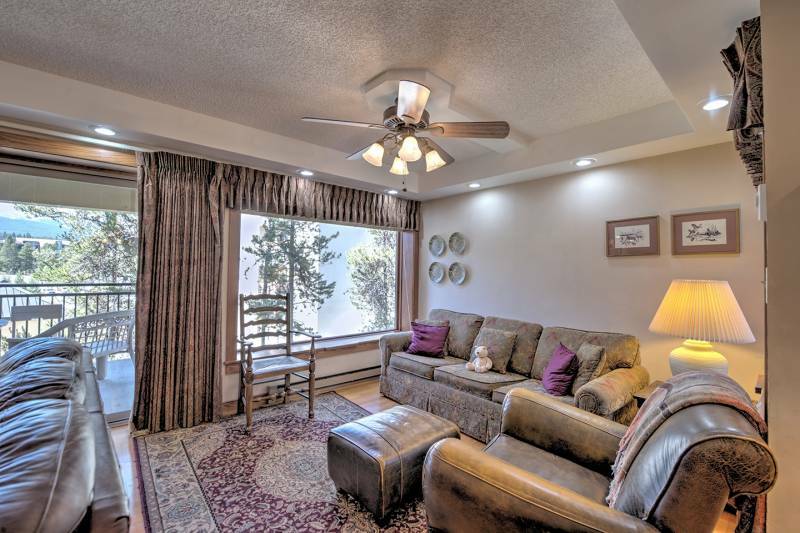 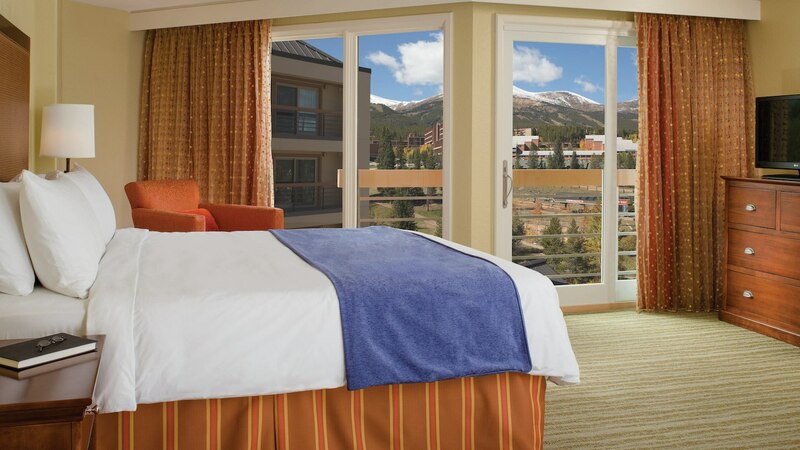 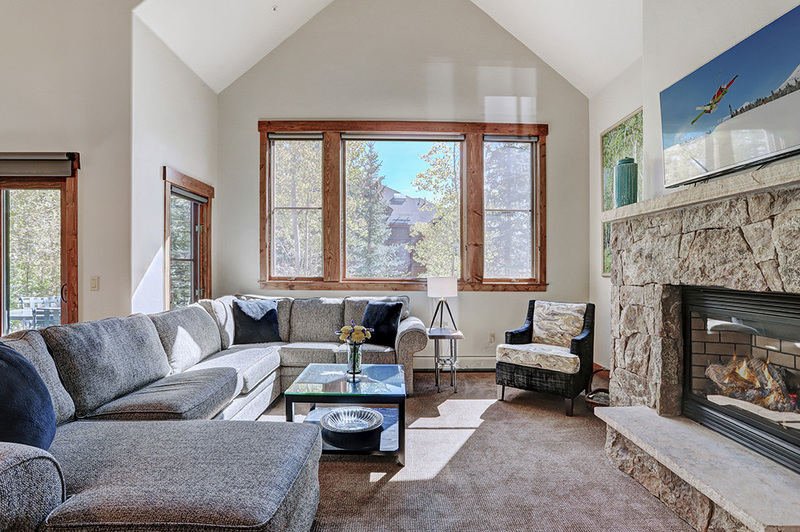 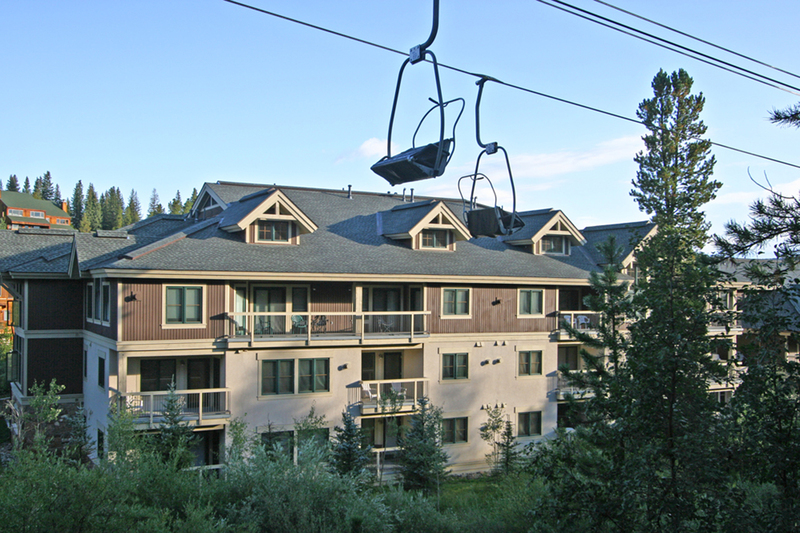 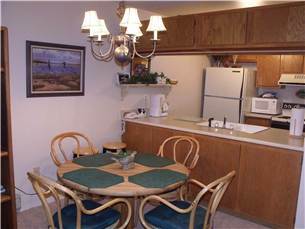 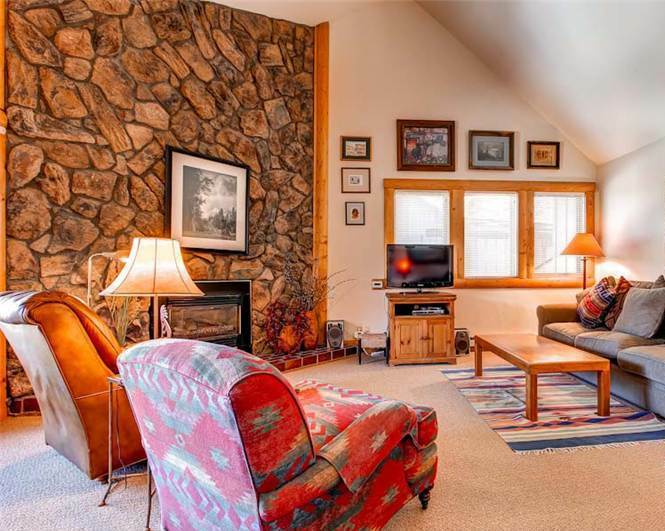 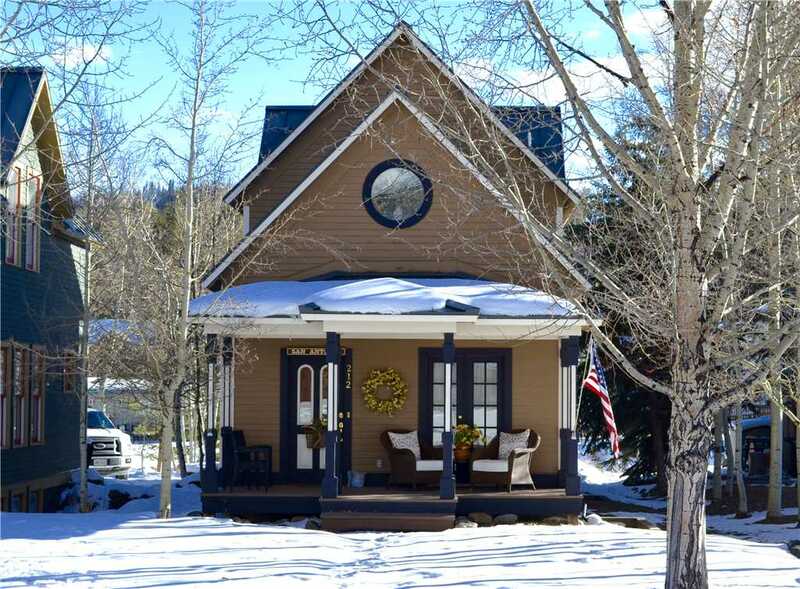 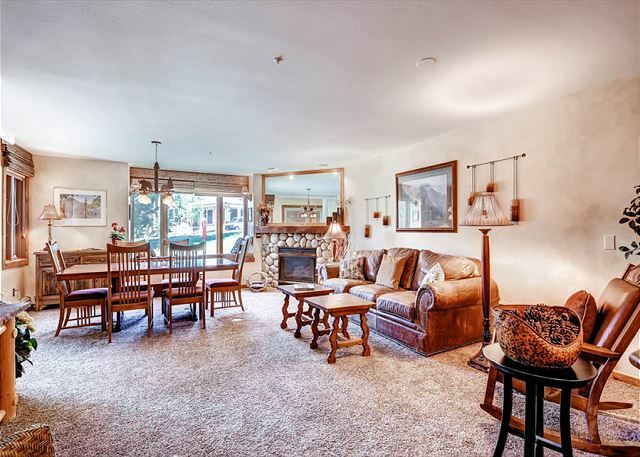 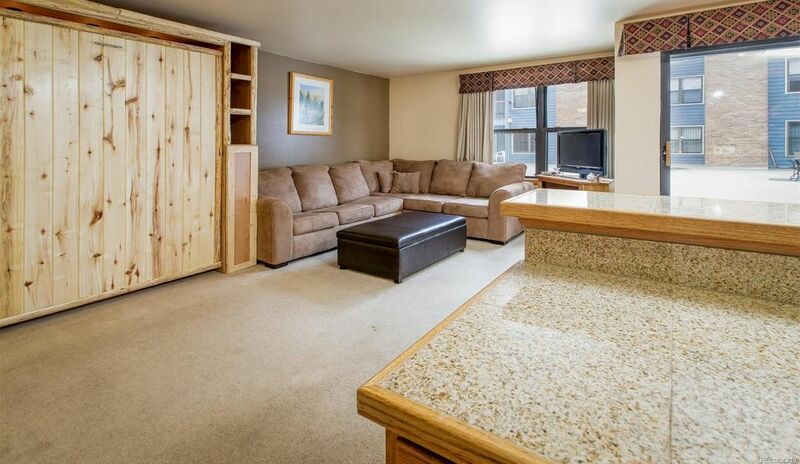 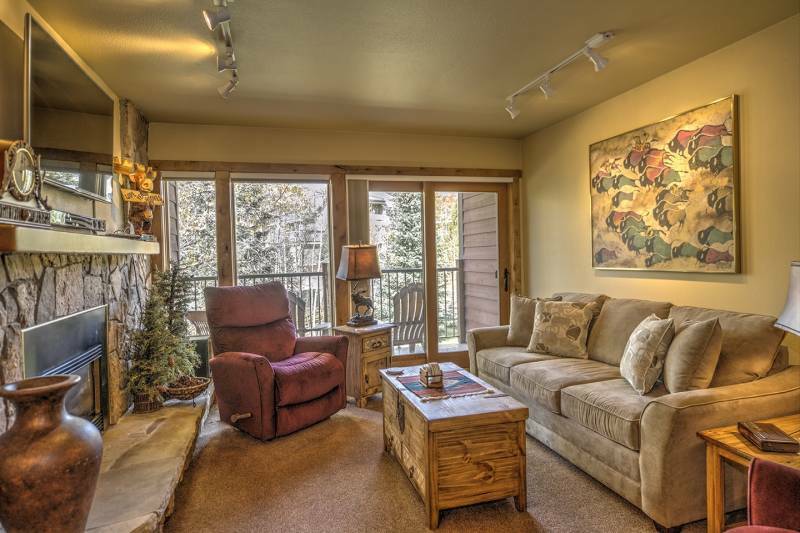 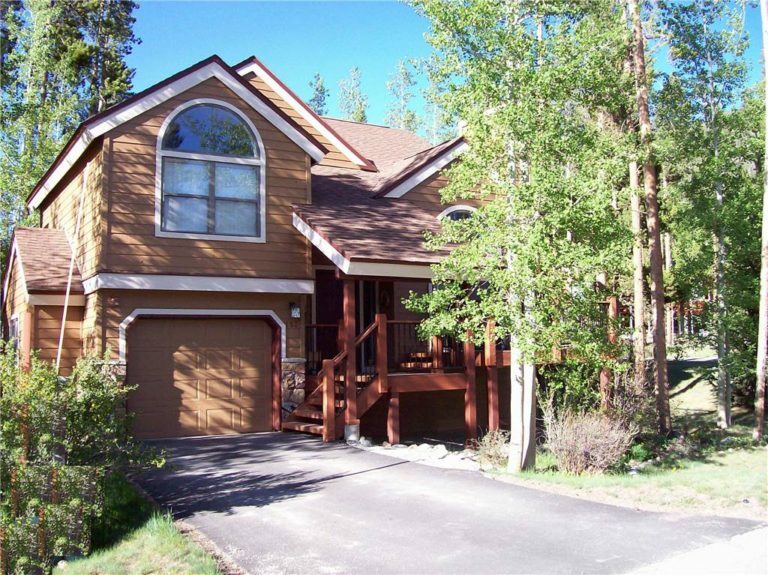 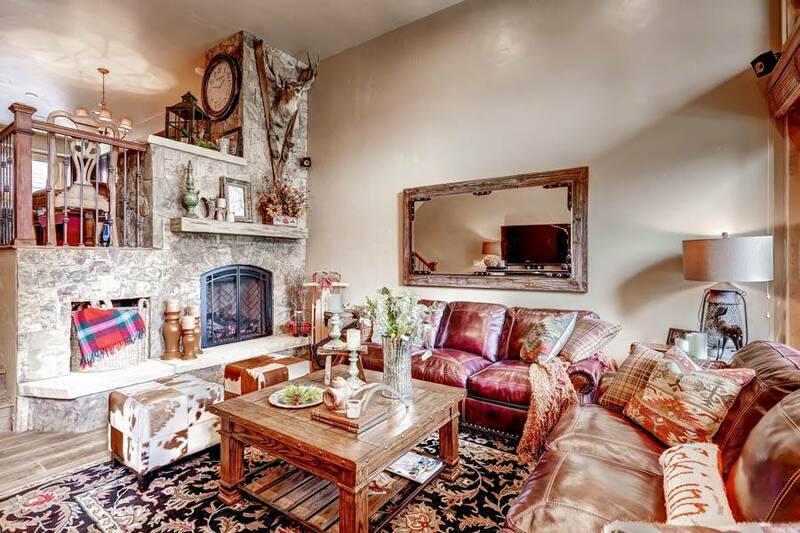 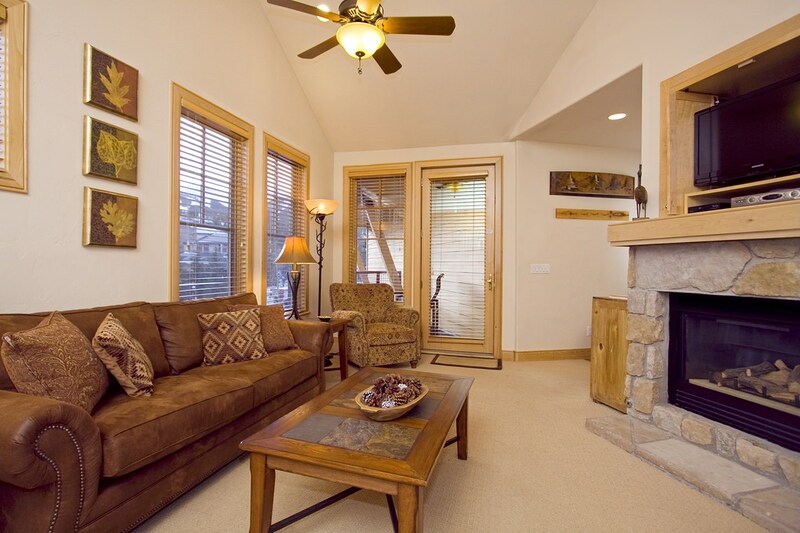 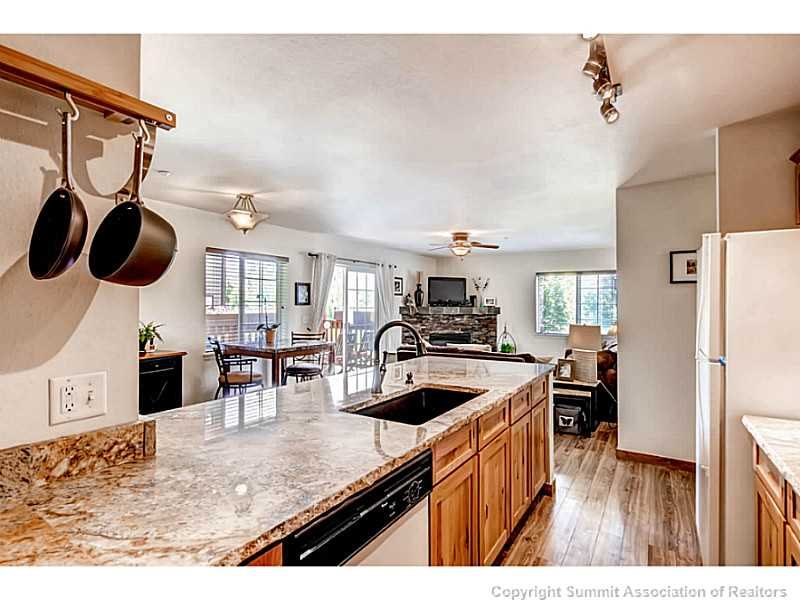 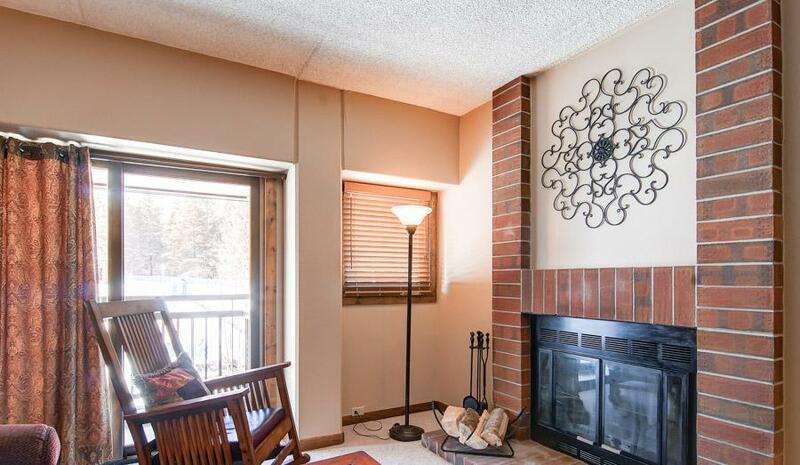 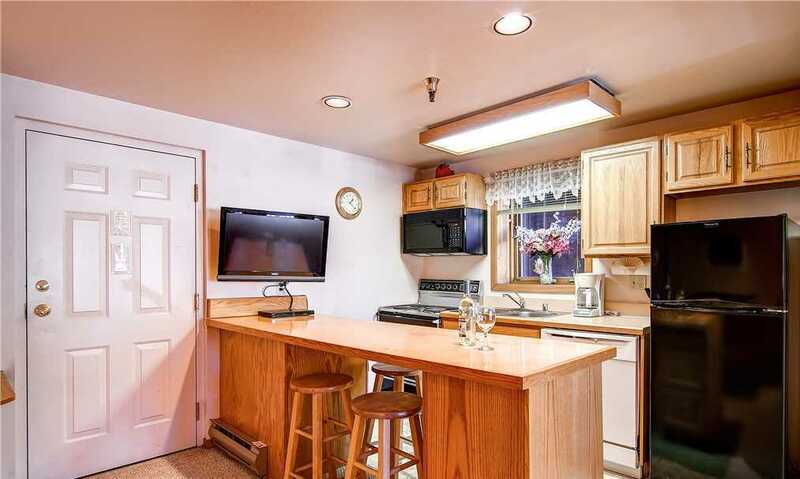 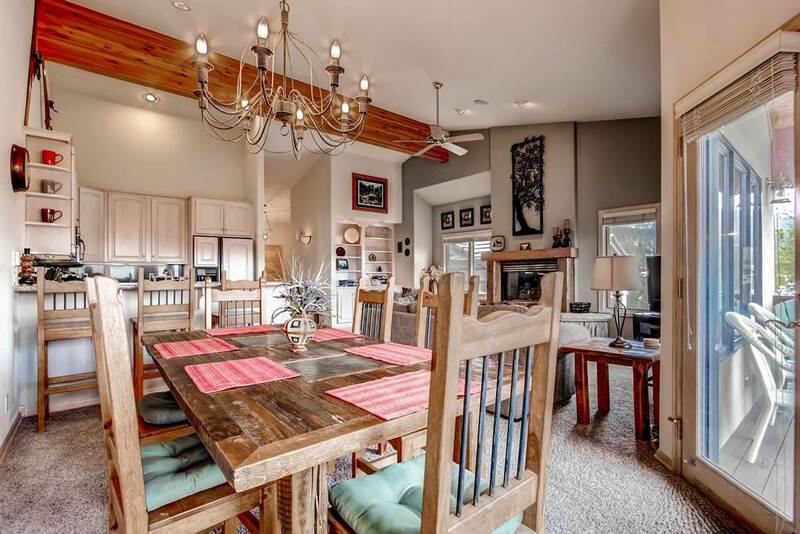 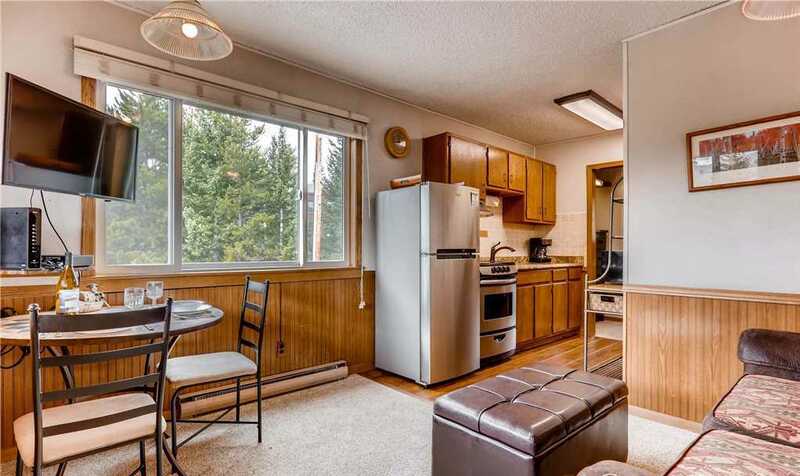 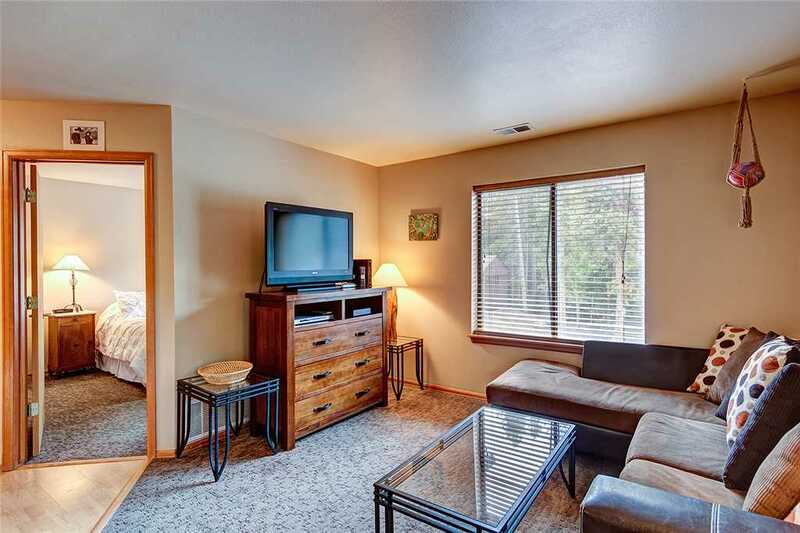 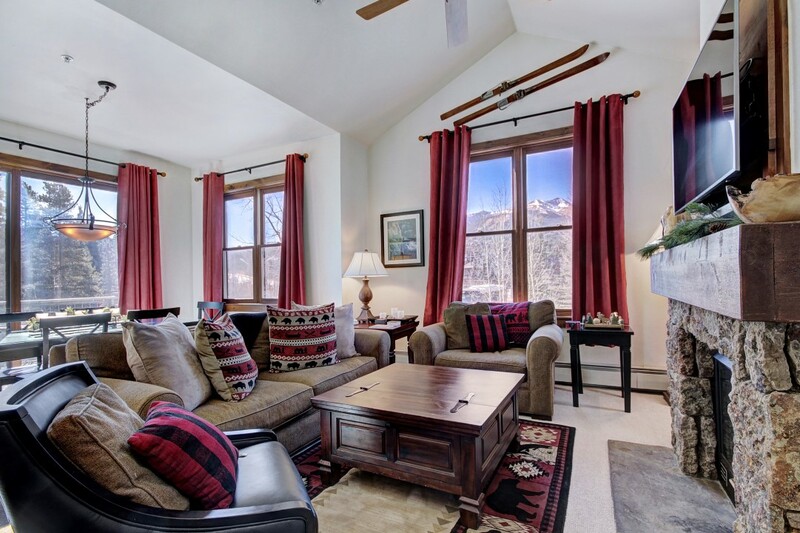 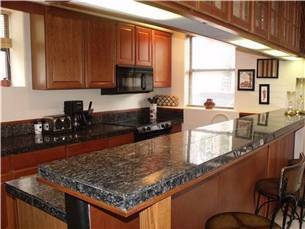 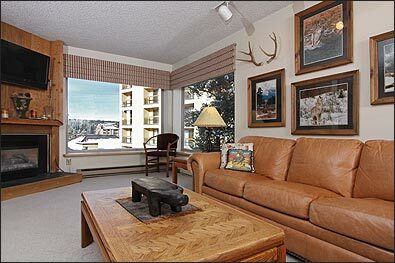 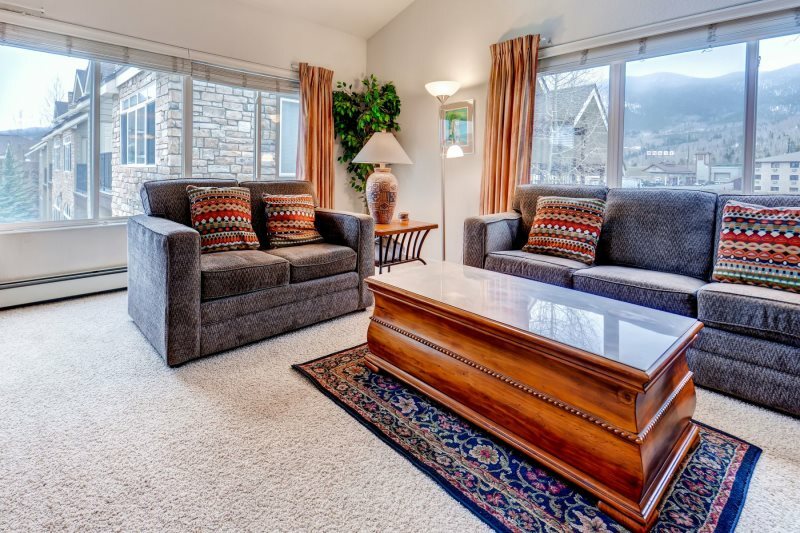 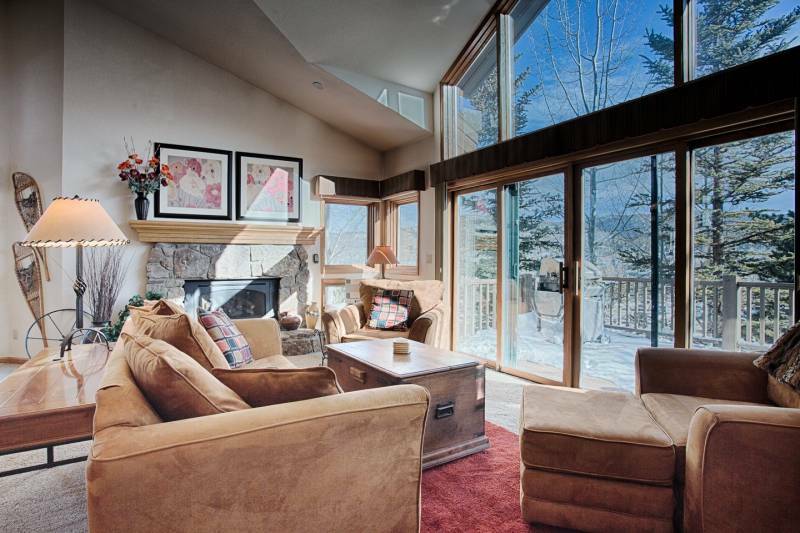 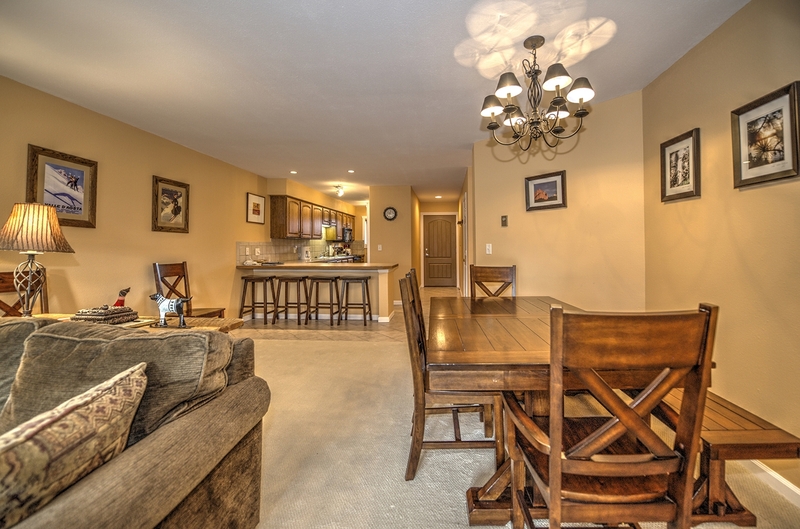 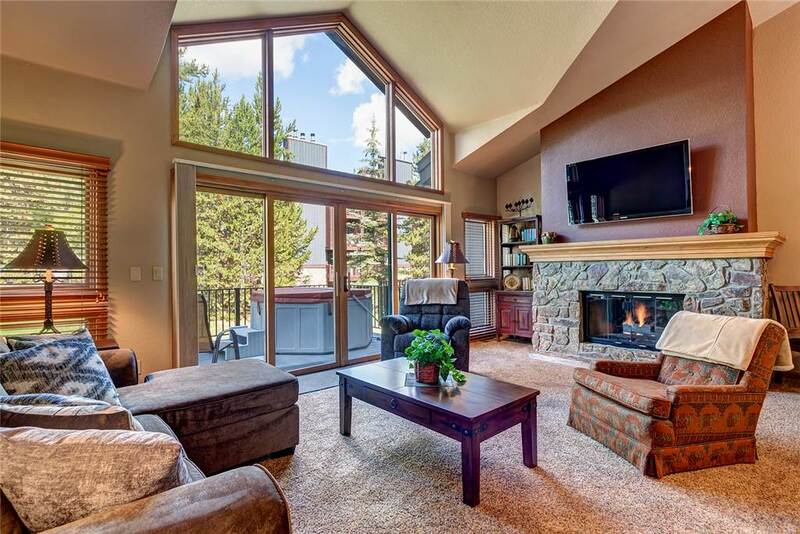 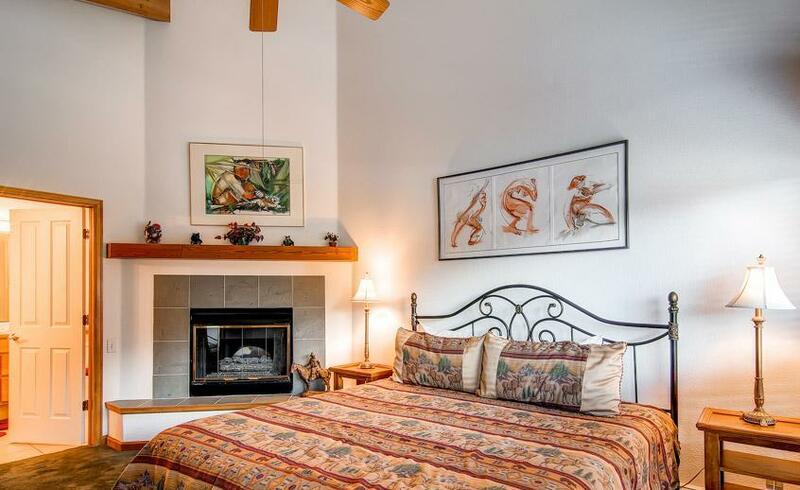 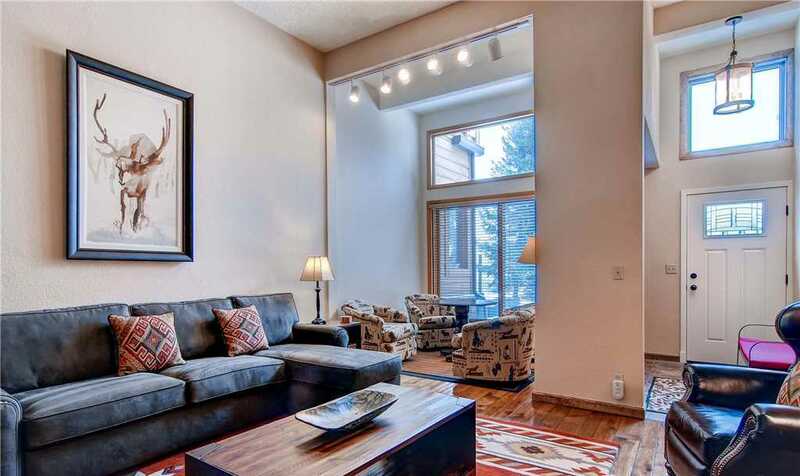 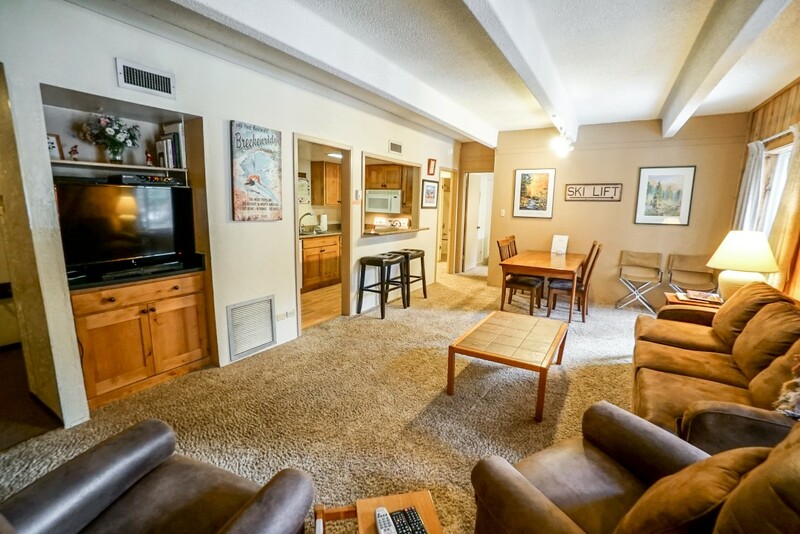 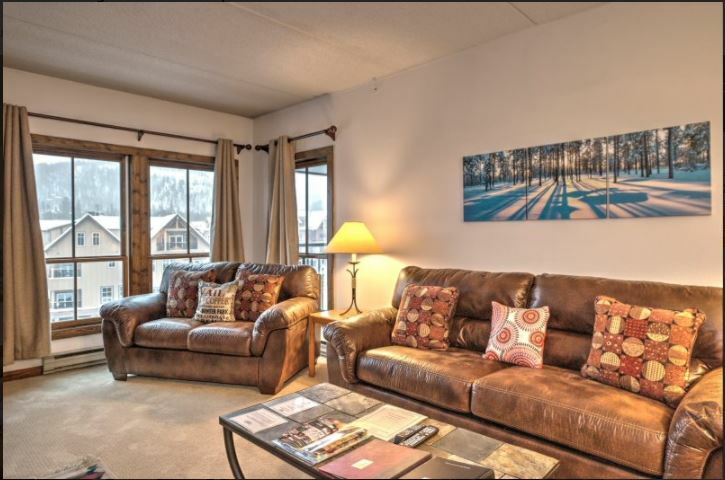 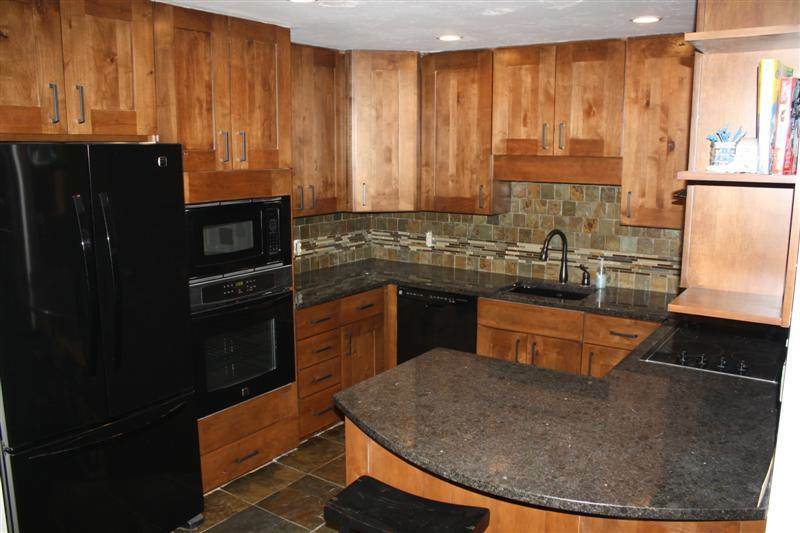 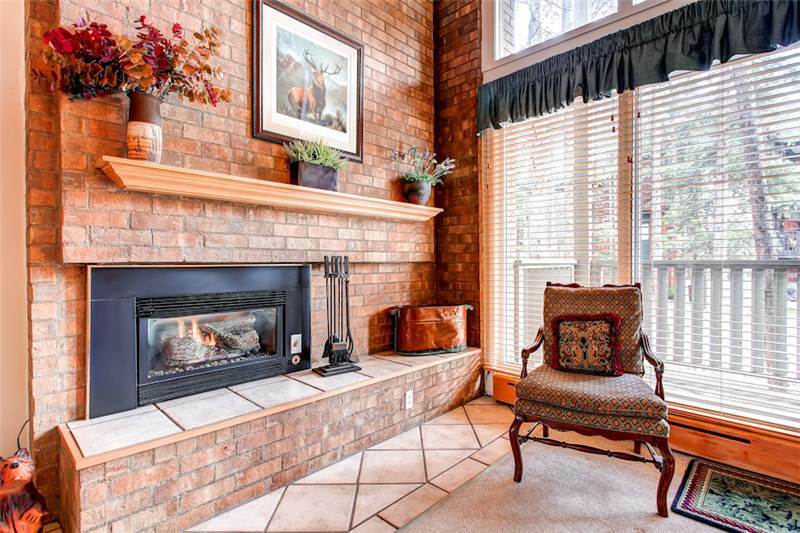 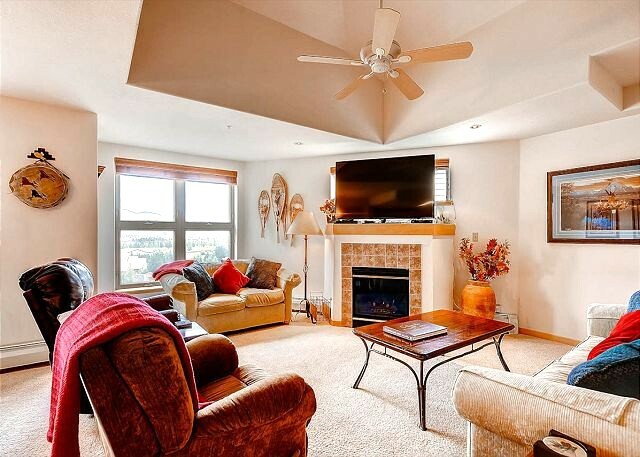 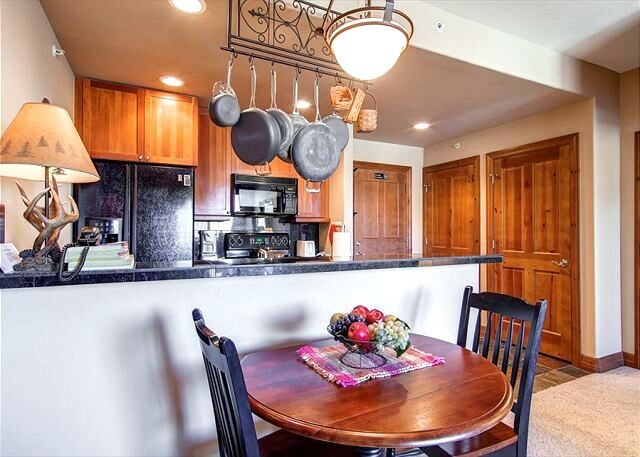 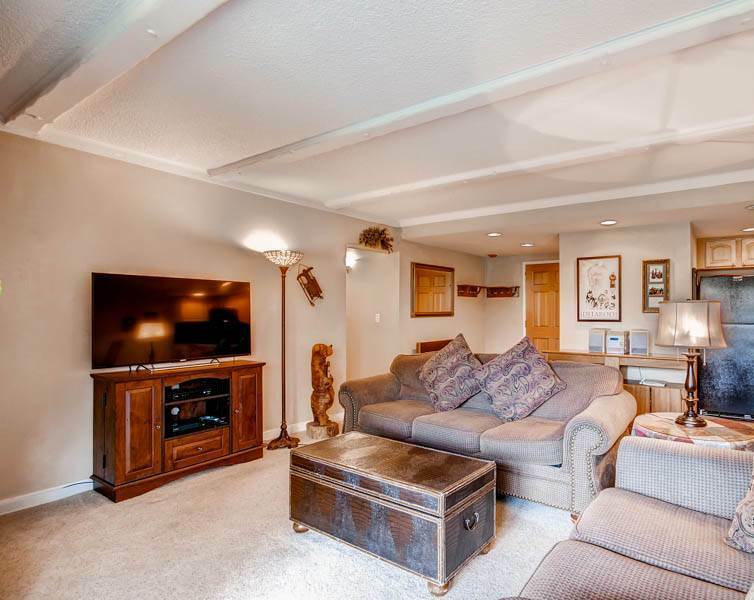 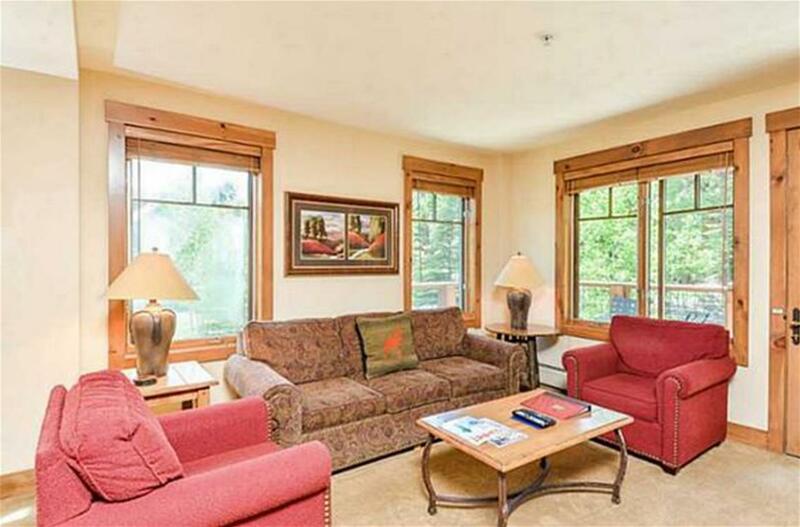 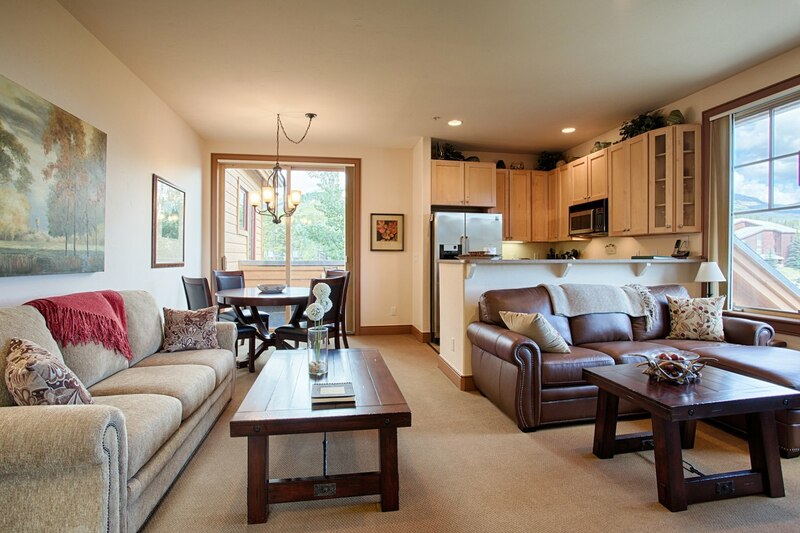 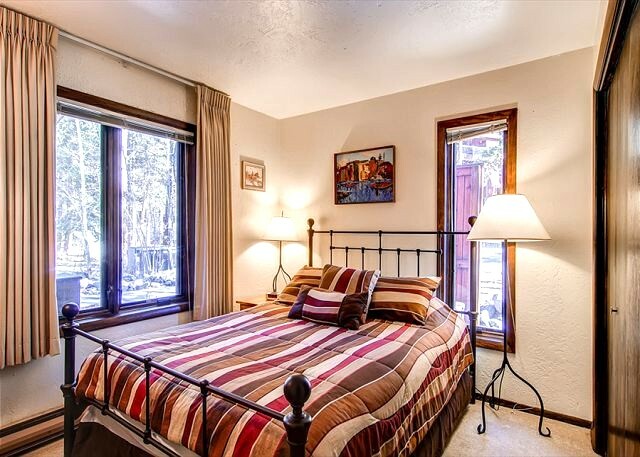 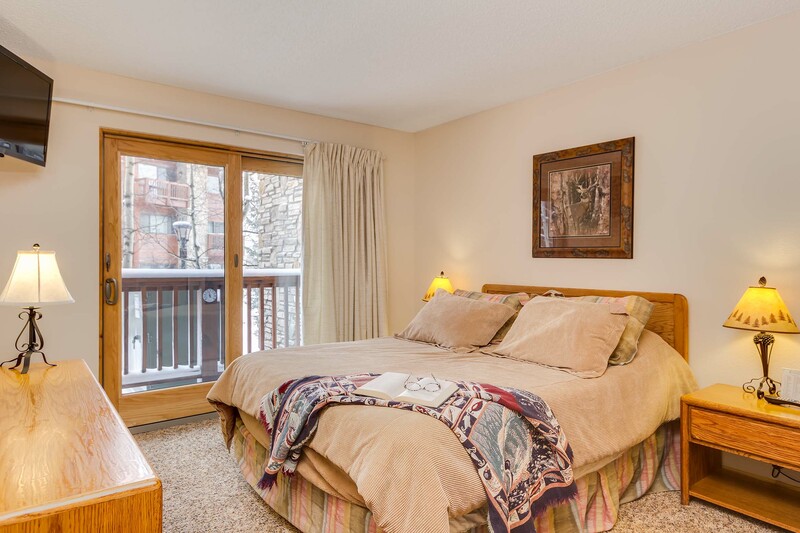 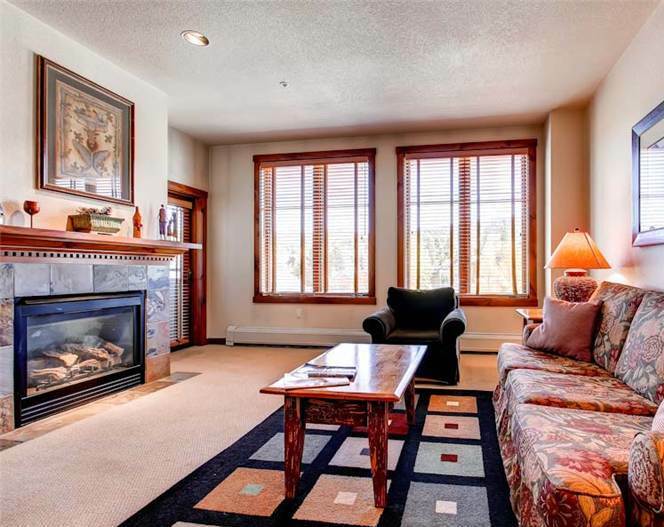 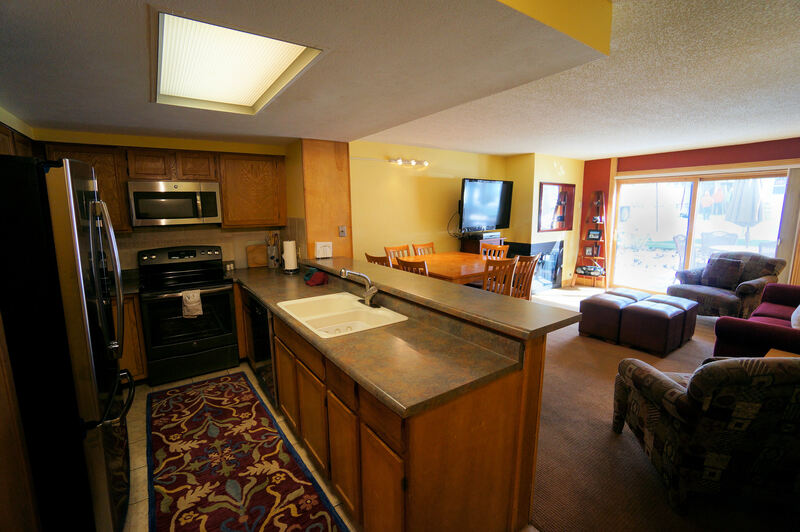 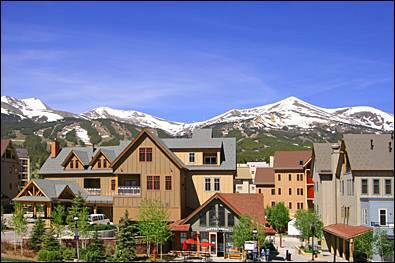 You’ll love this condo’s “homey” feel and unique indoor hot tub, convenient location (drive or bus to all of Summit County’s great ski areas) and the charm of downtown Frisco.